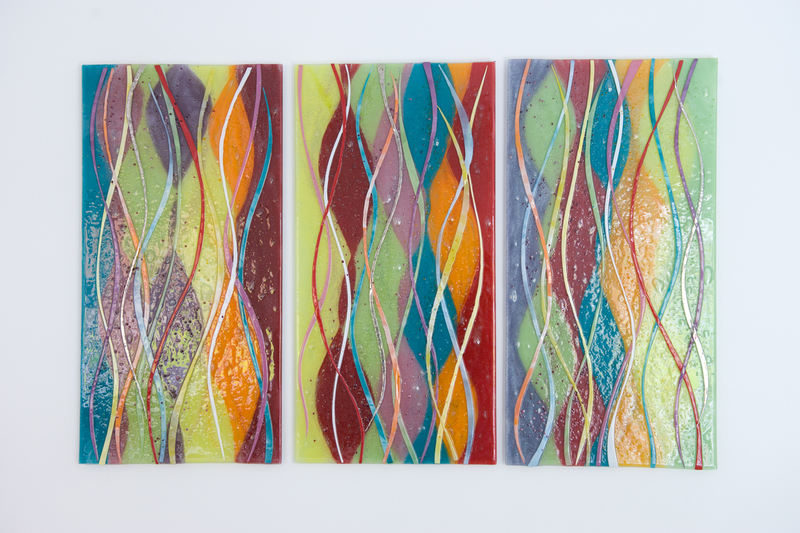 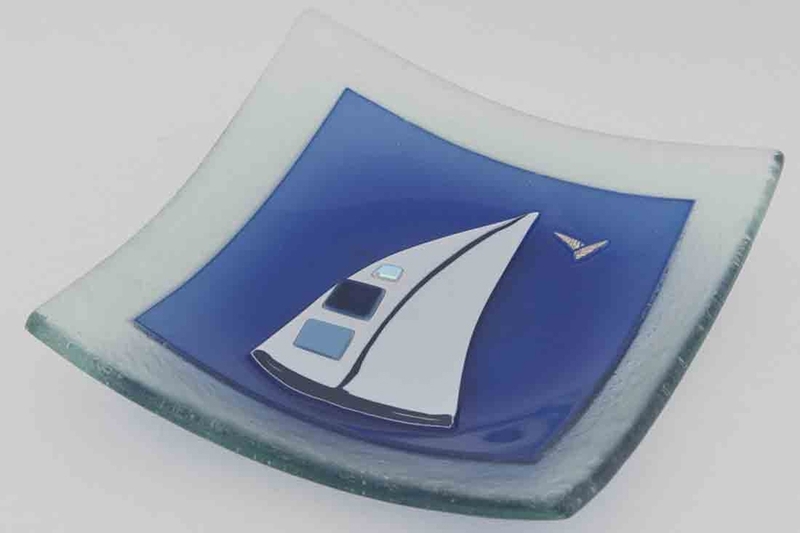 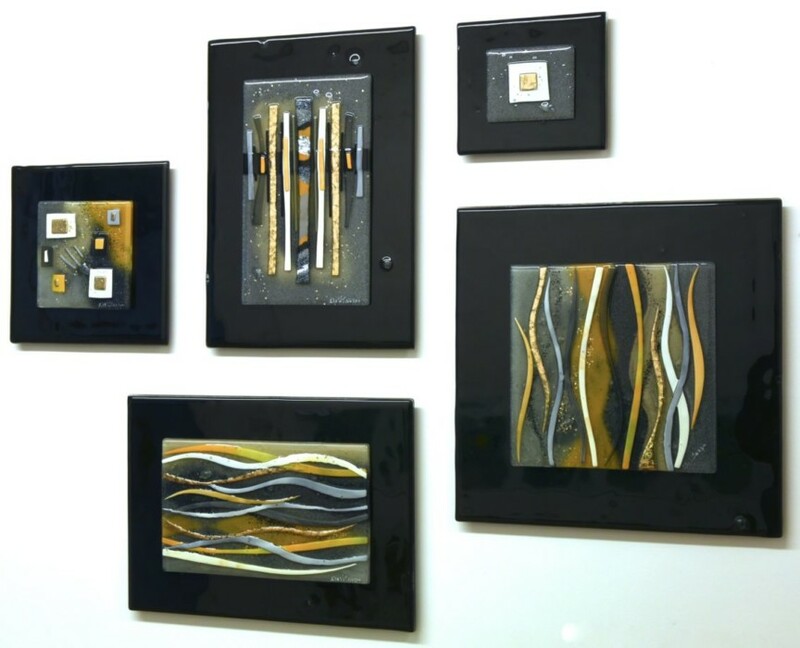 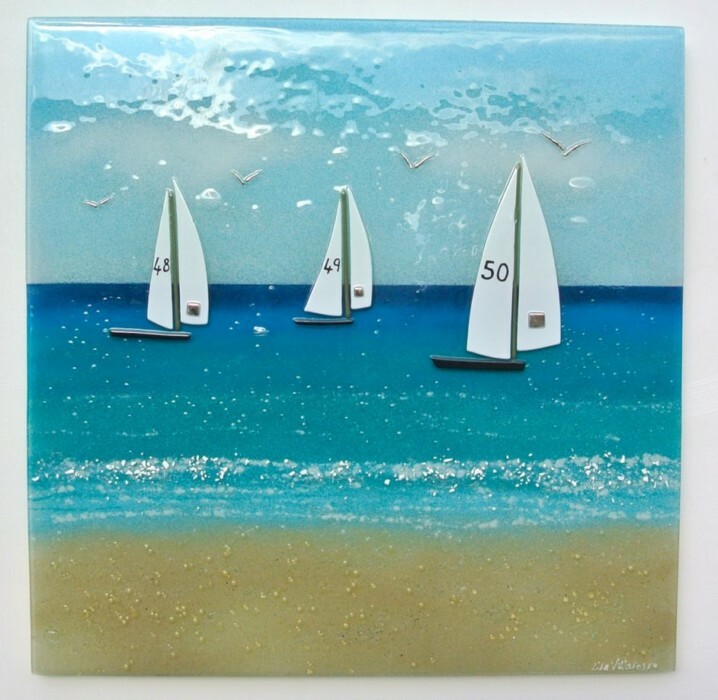 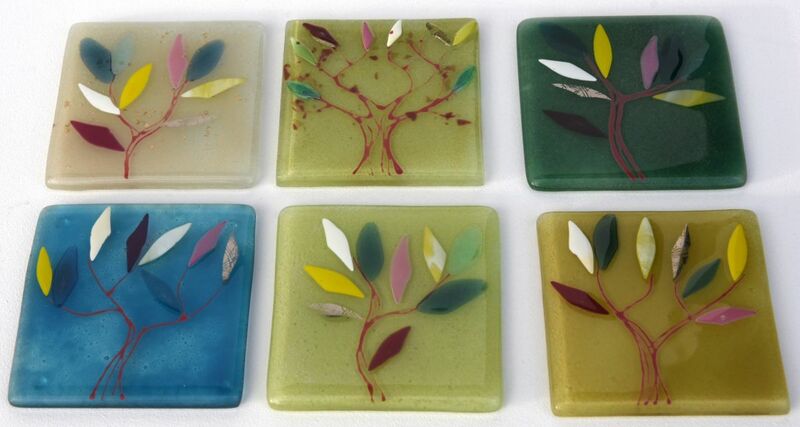 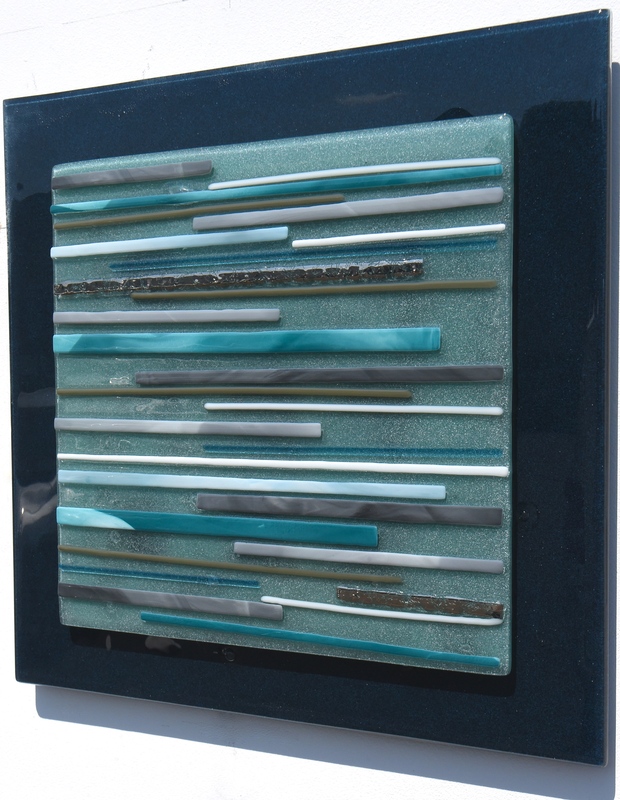 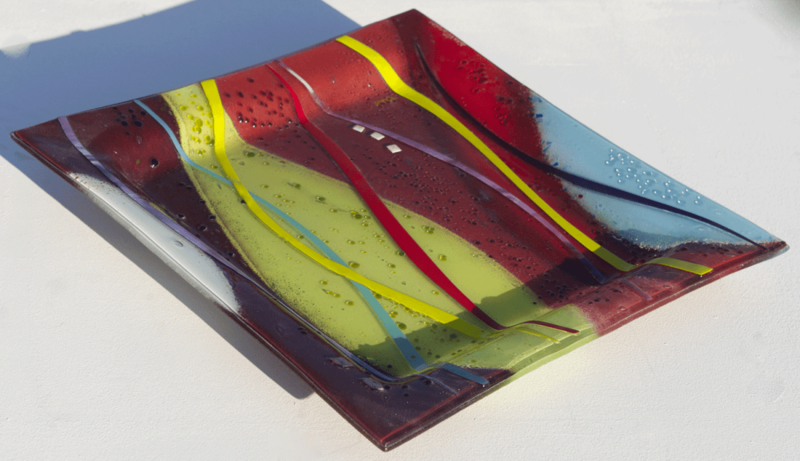 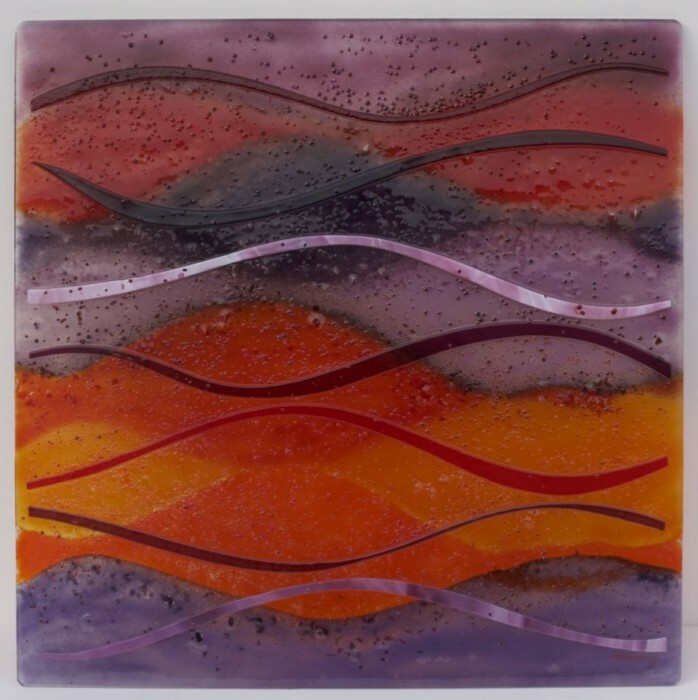 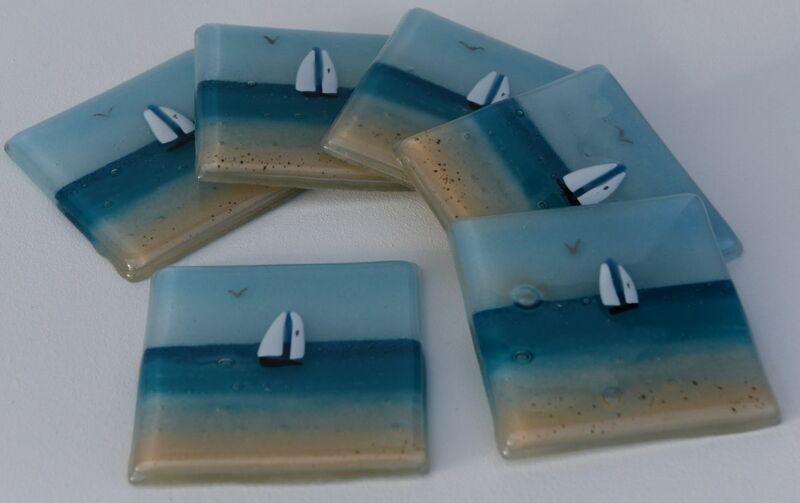 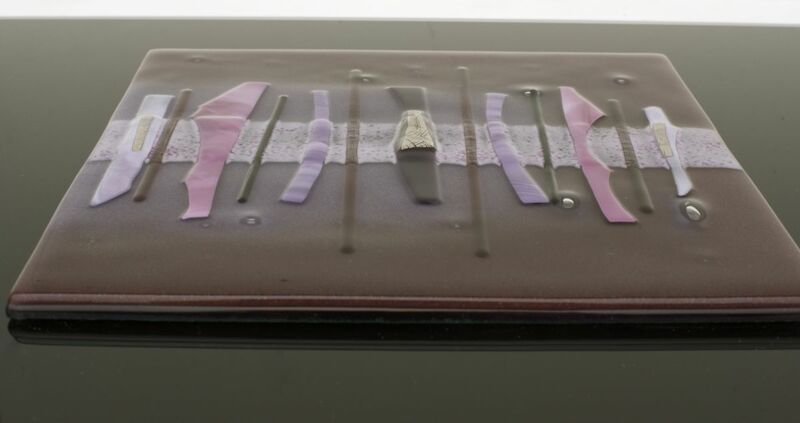 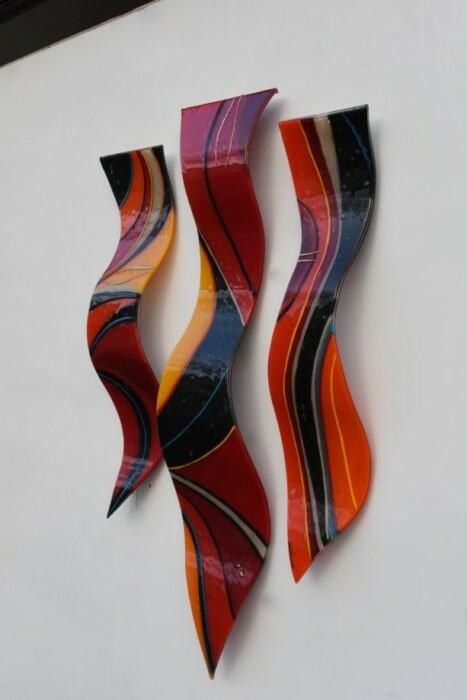 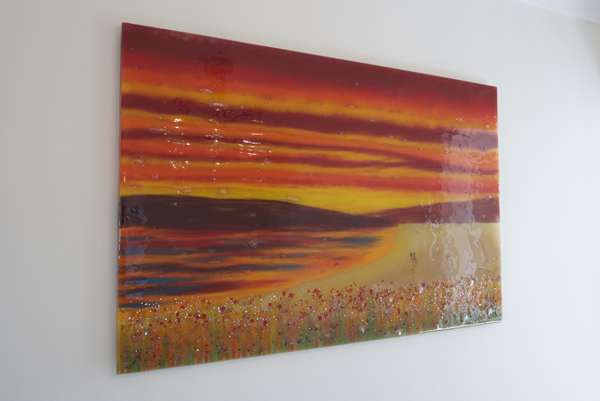 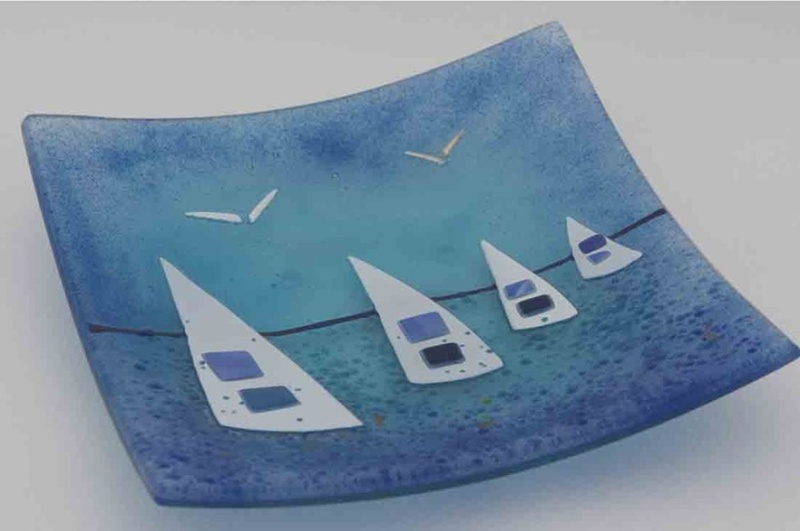 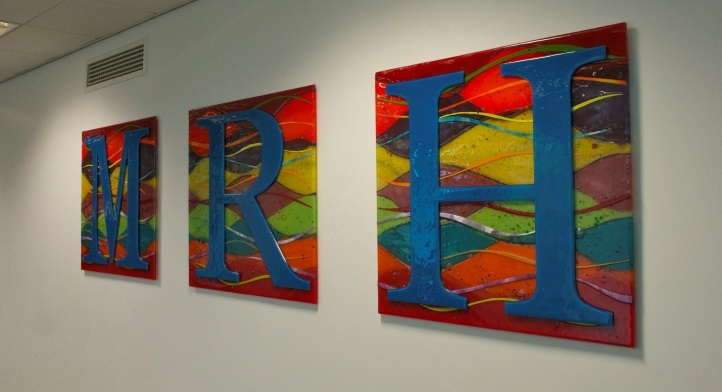 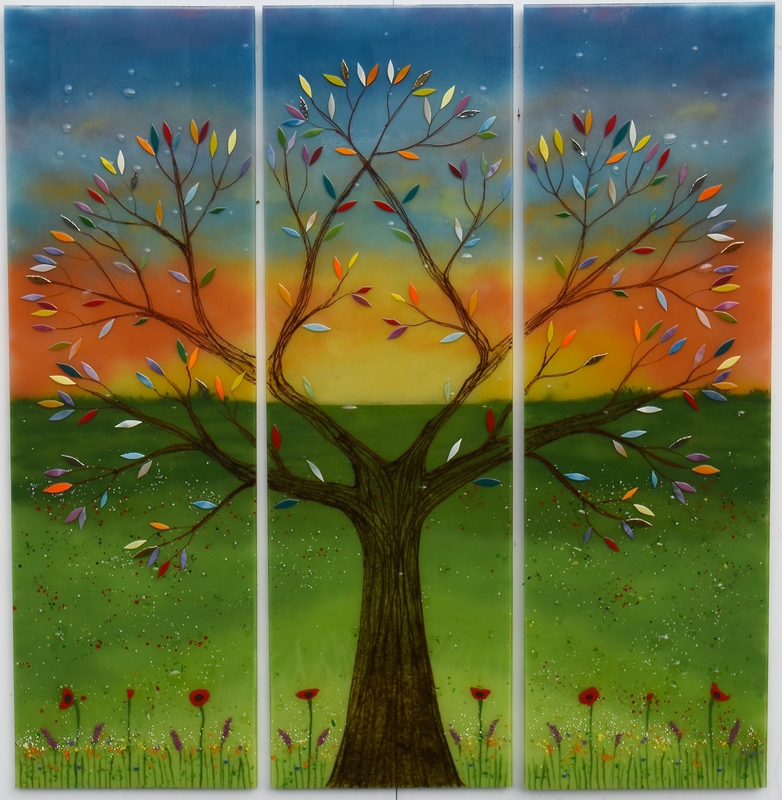 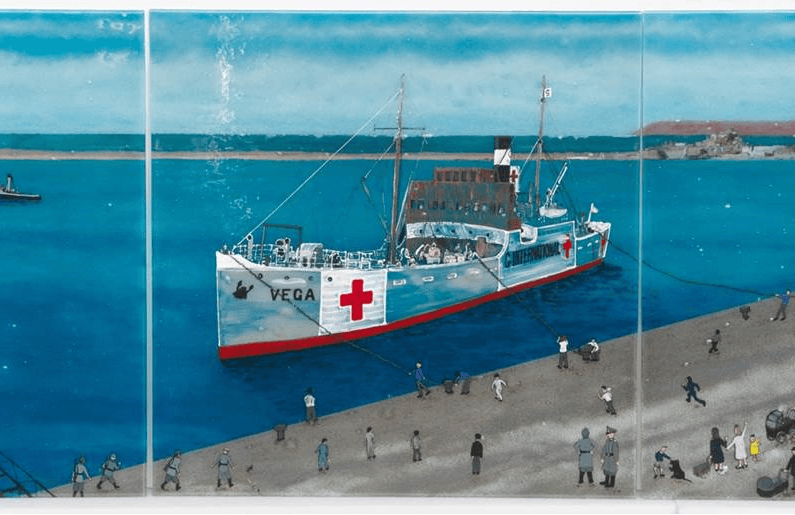 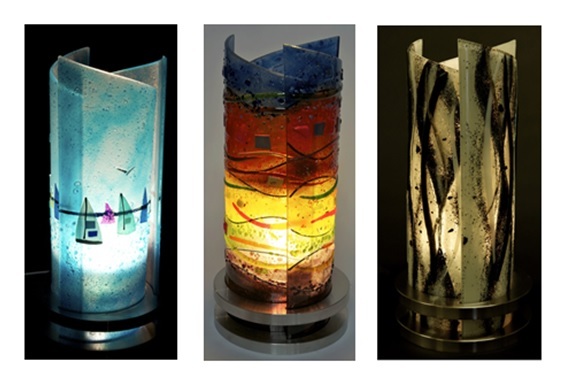 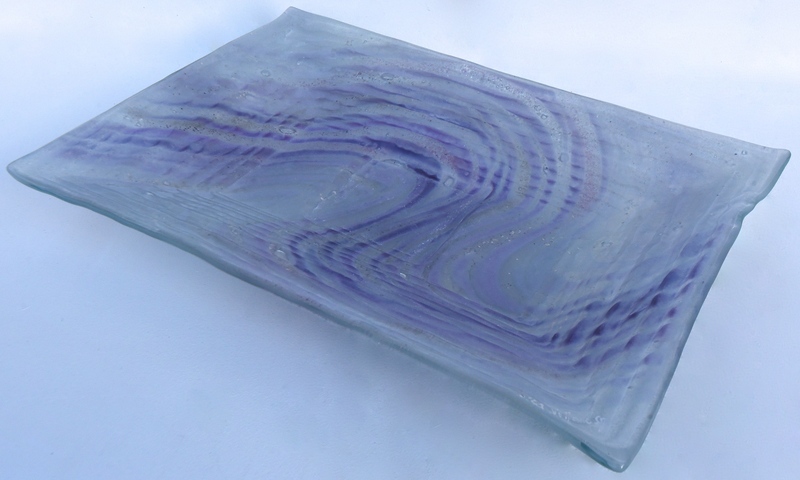 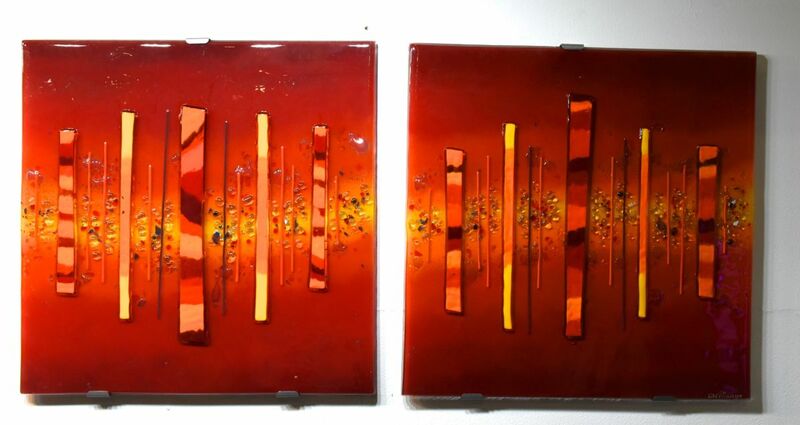 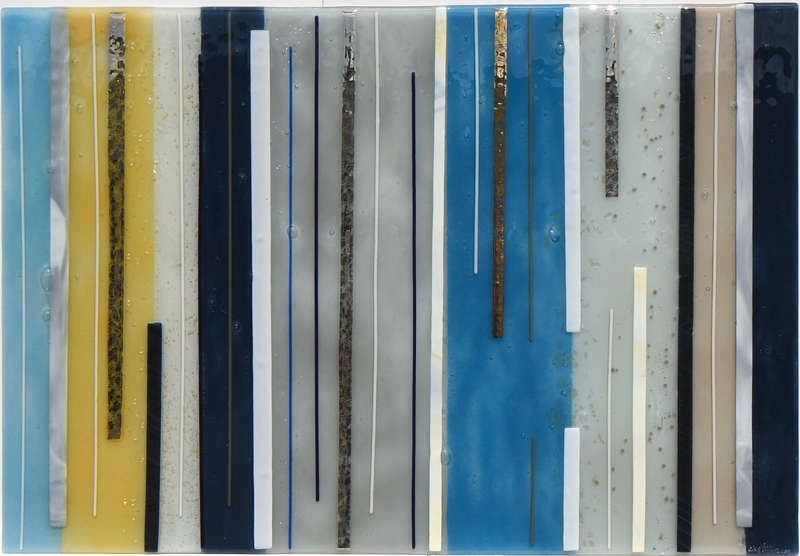 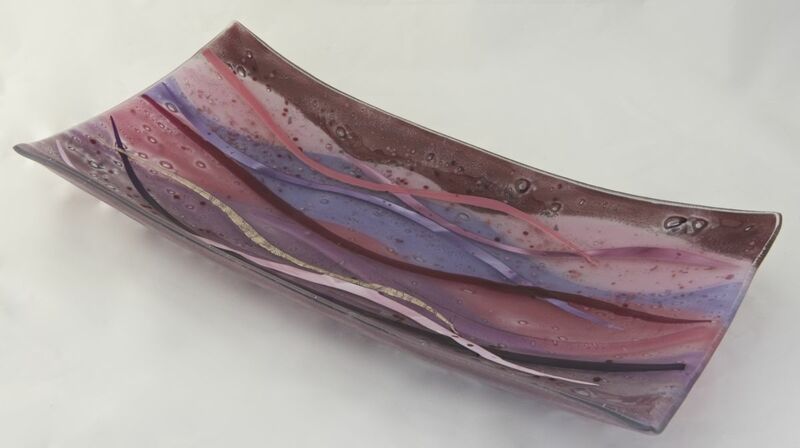 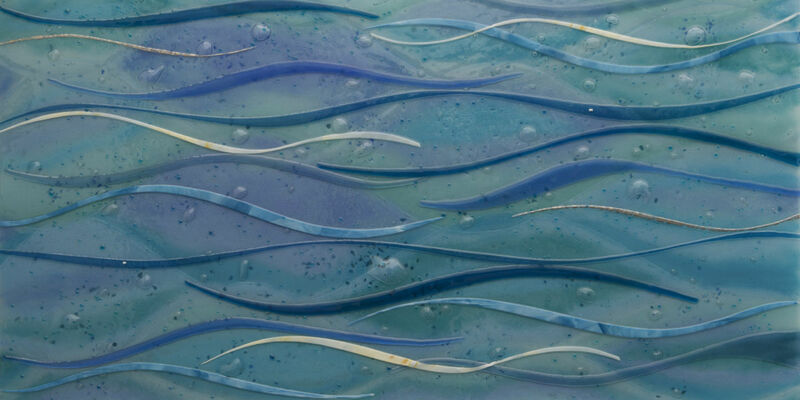 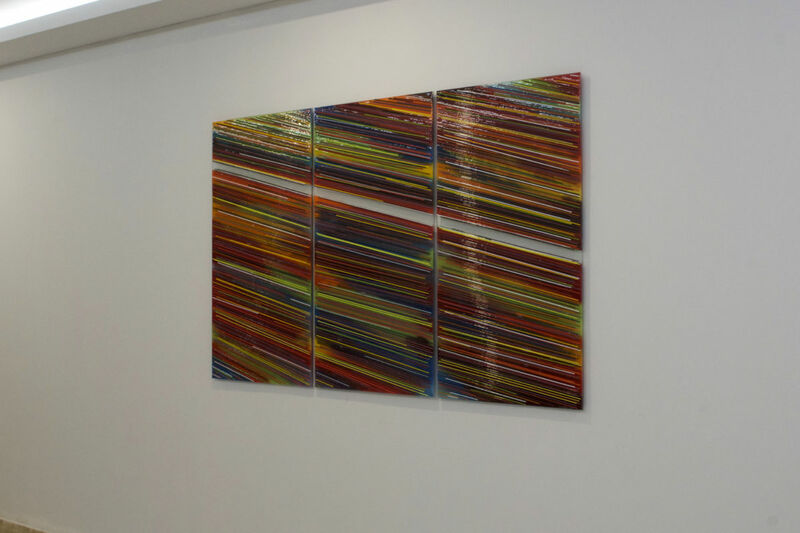 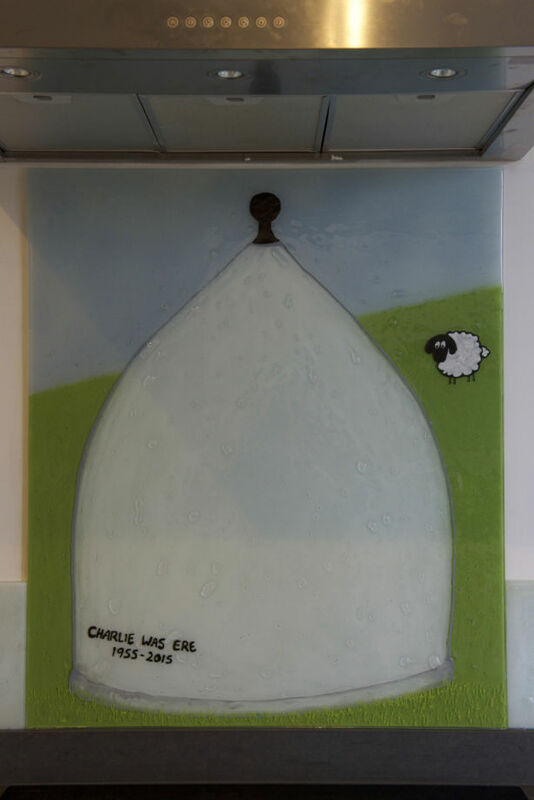 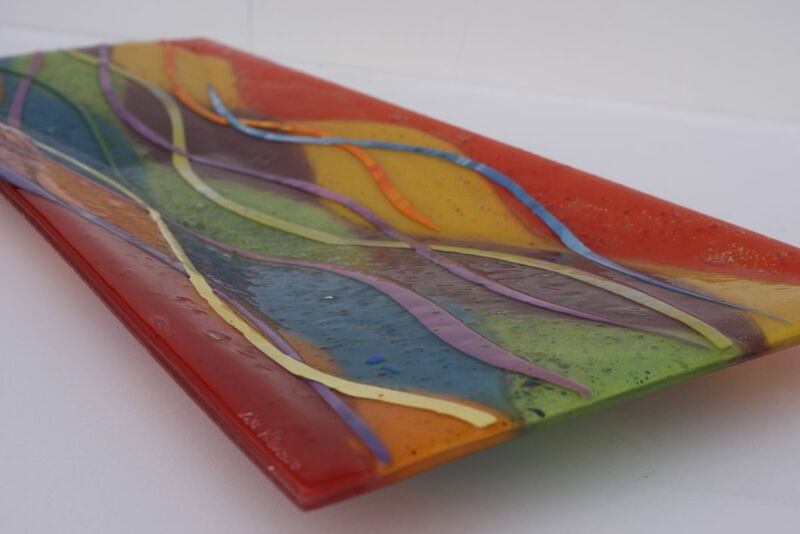 This Thursday, we’re jumping back into the past to have a bit of a throwback for the blog, so here’s some classic fused glass art from the vaults! 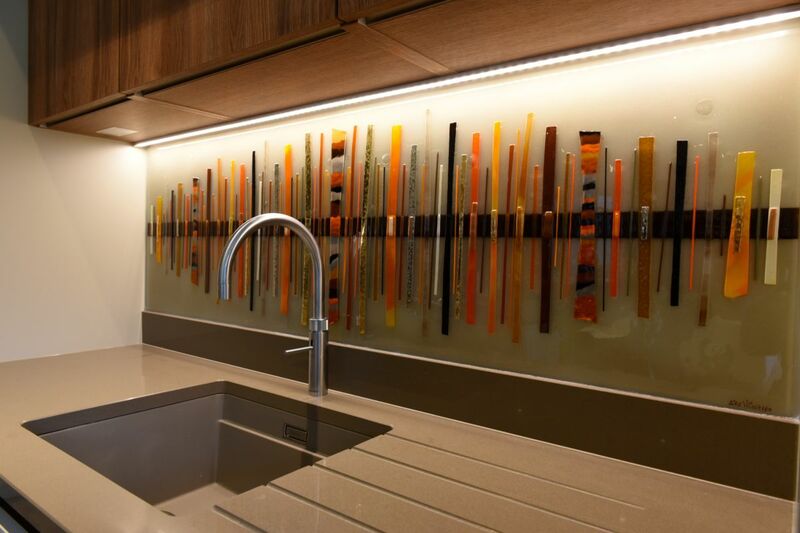 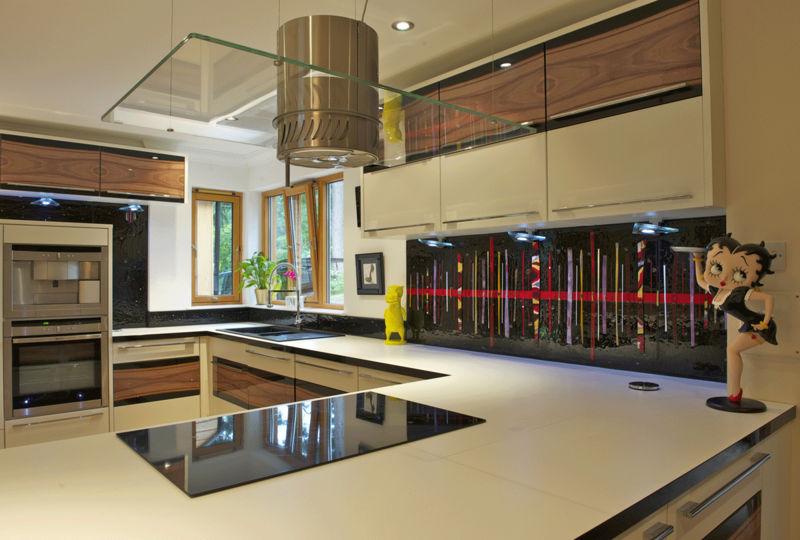 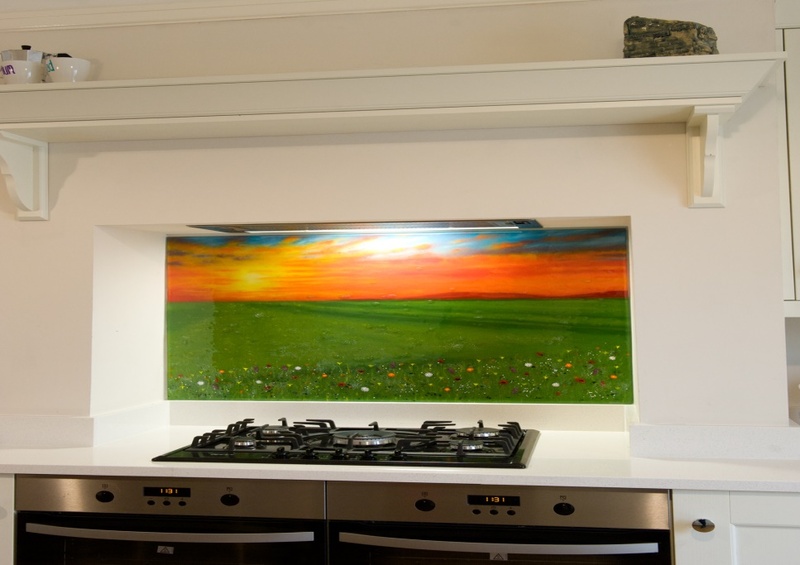 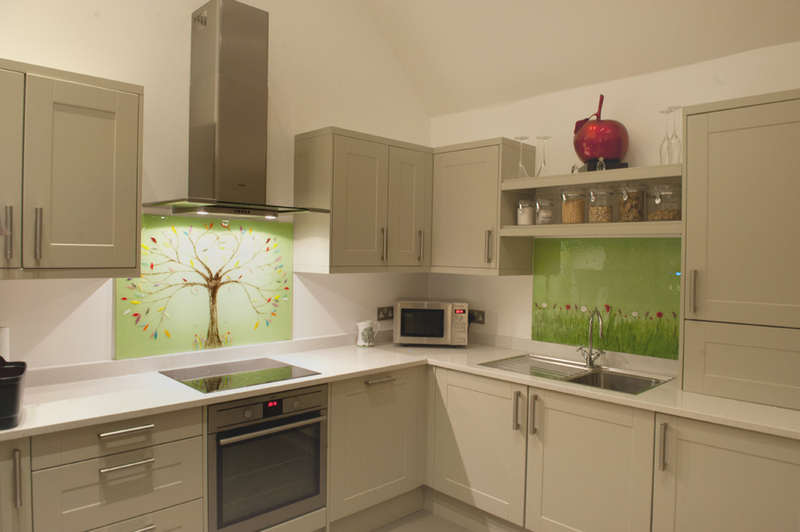 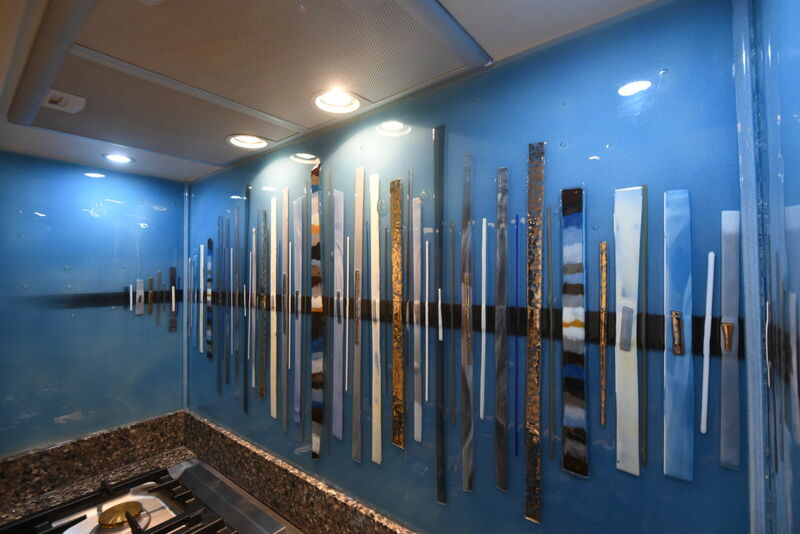 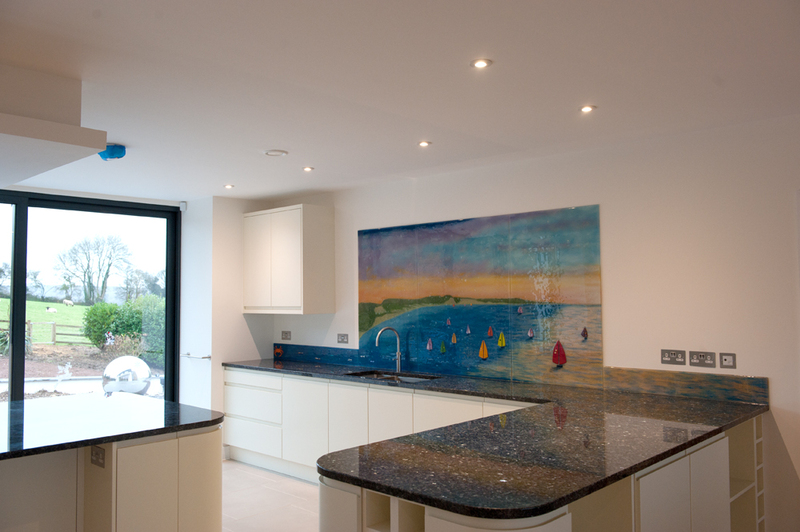 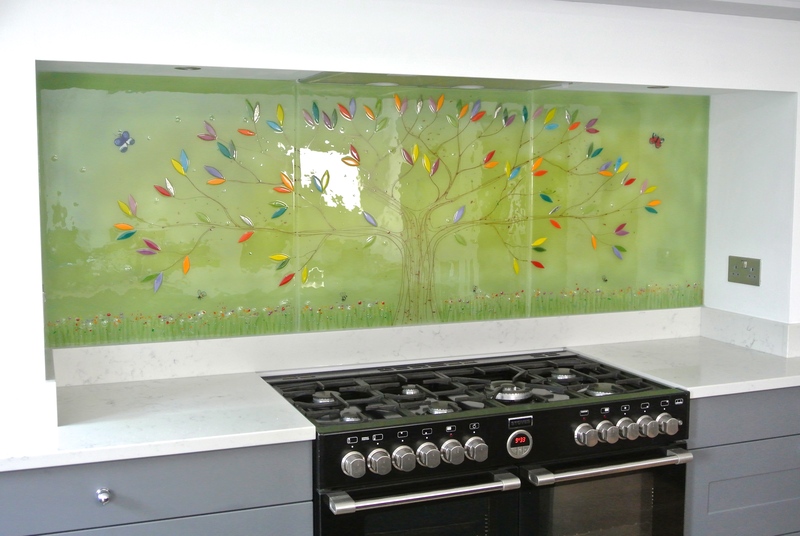 The kitchen that we’re featuring today is a beautiful one that we delivered glass to a little while ago. 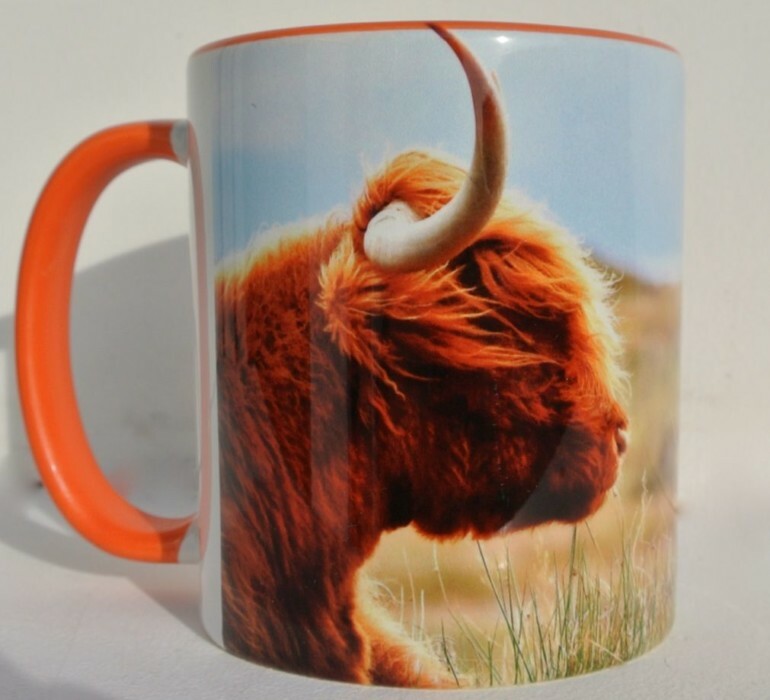 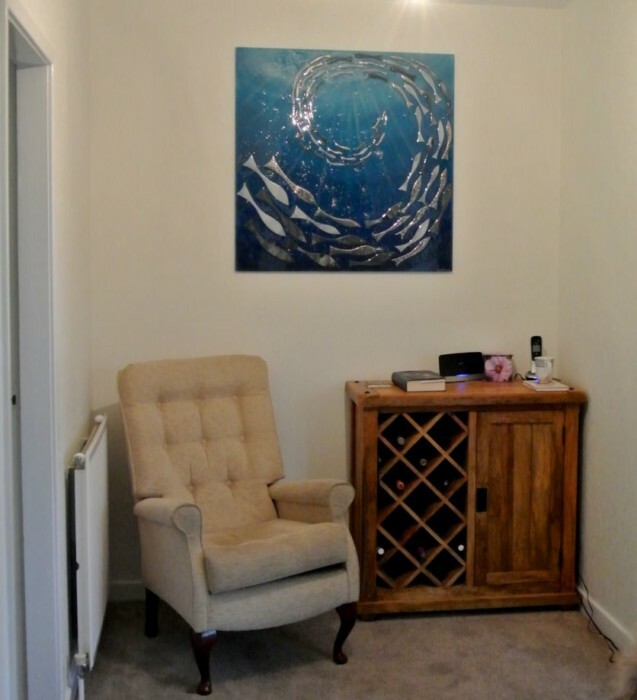 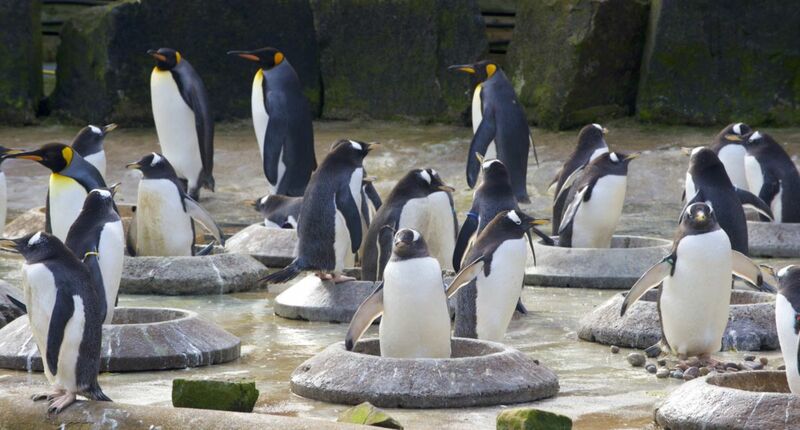 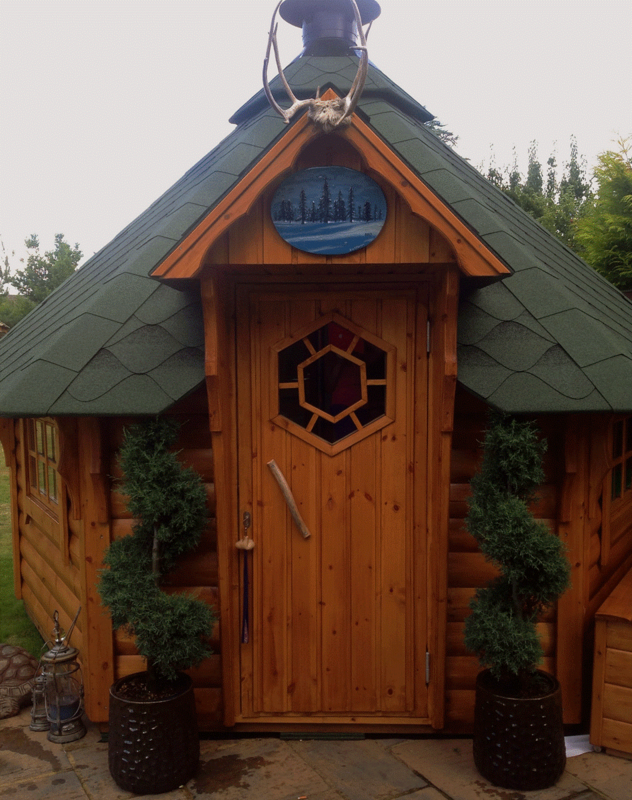 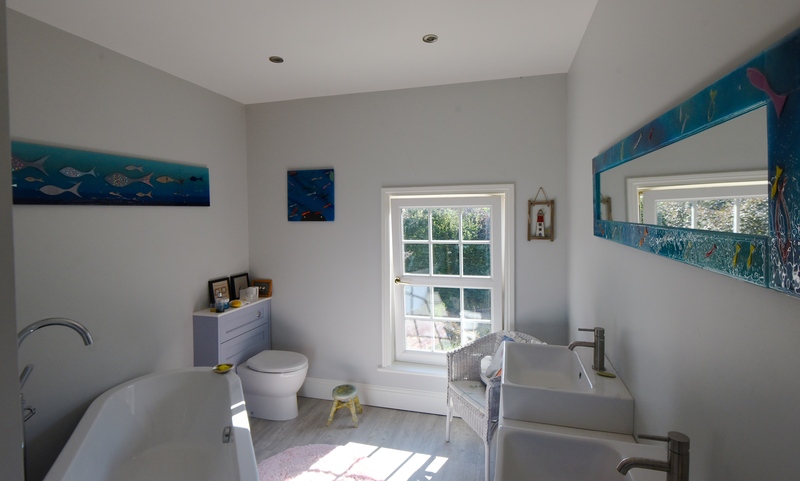 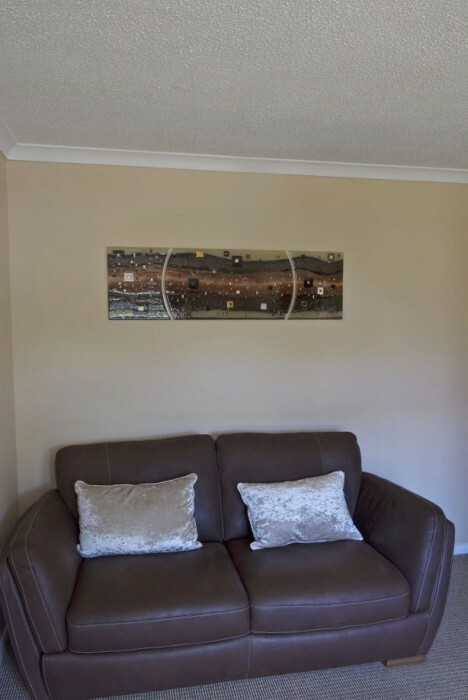 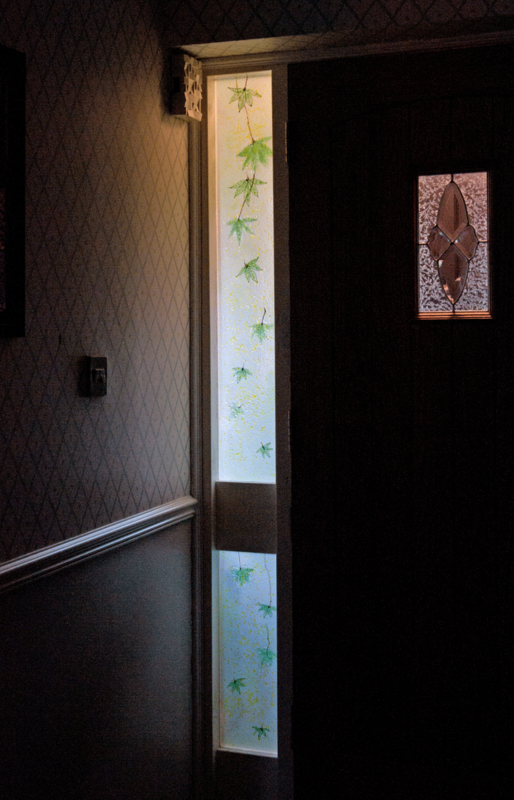 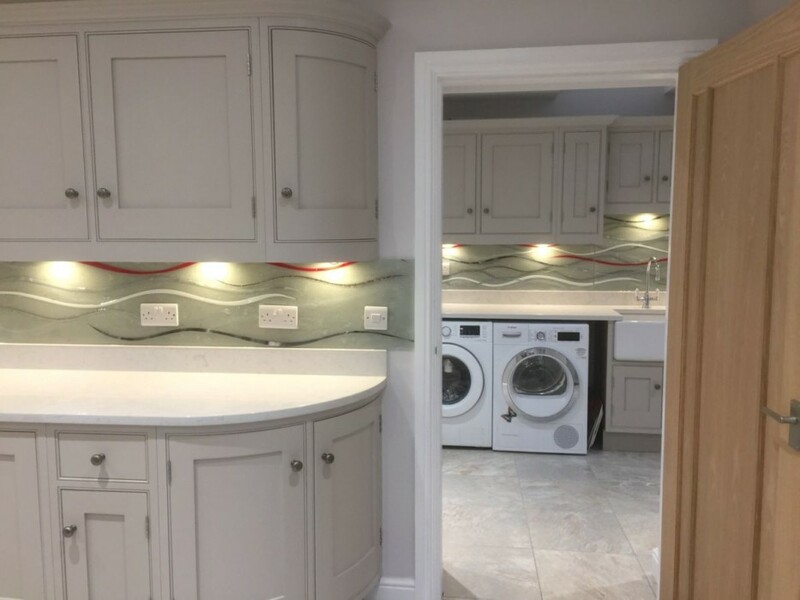 It can be found inside of a home in Fordingbridge, Hampshire. 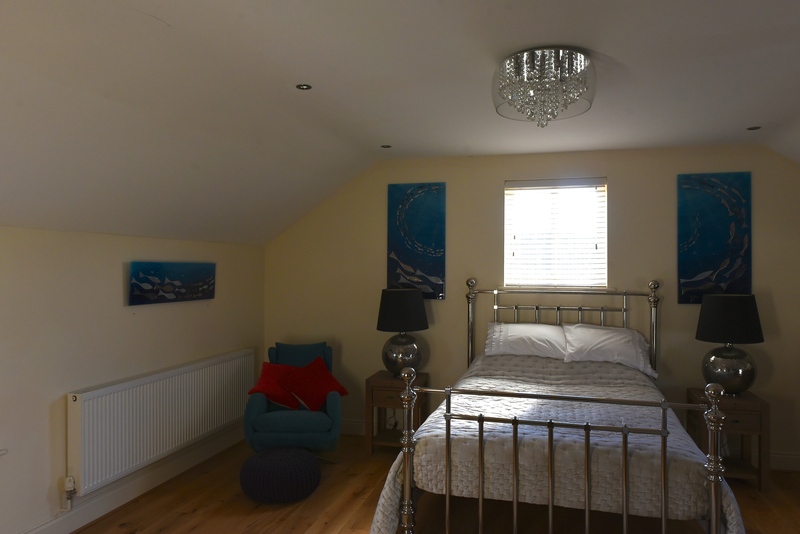 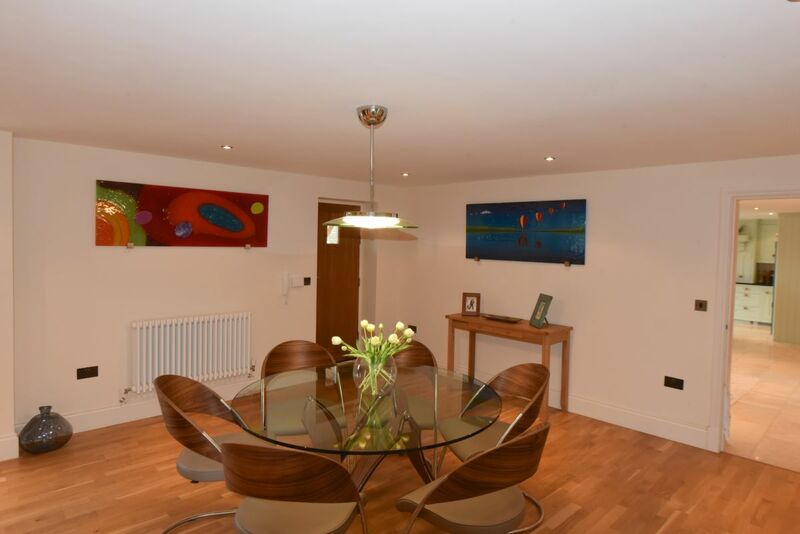 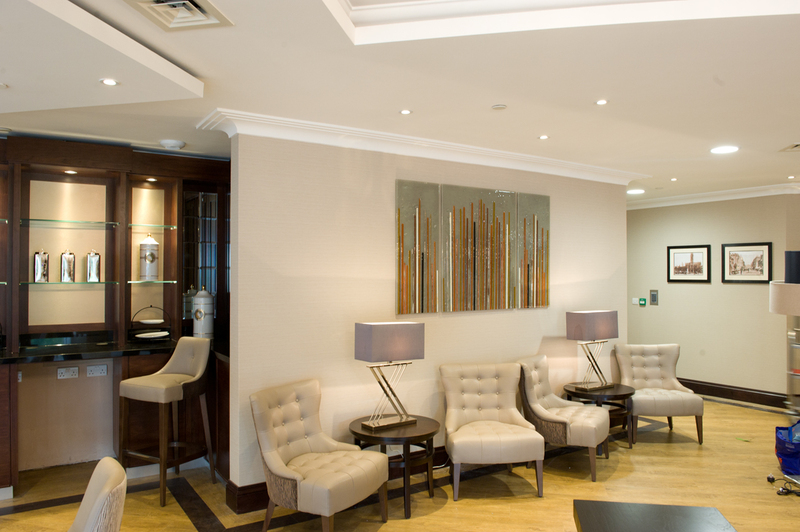 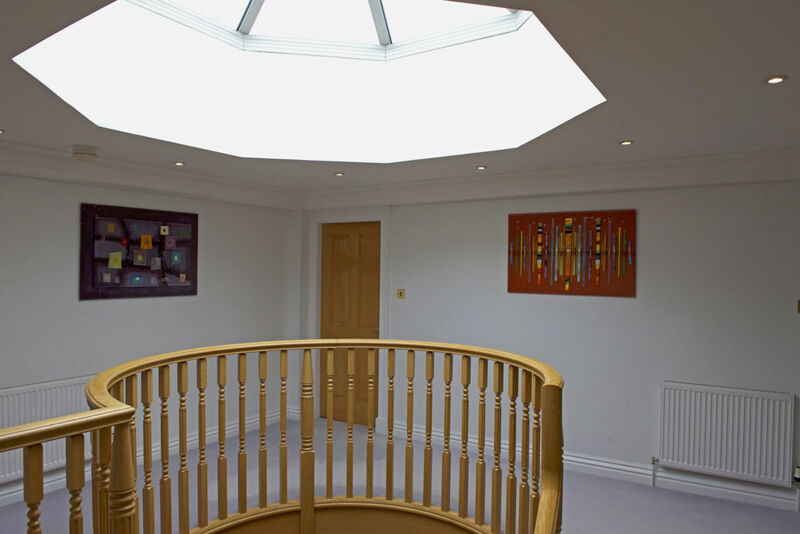 As you may be able to tell from the picture above, the décor of the room was very sleek and modern, with pronounced lines giving the whole atmosphere a very clean and sharp look. 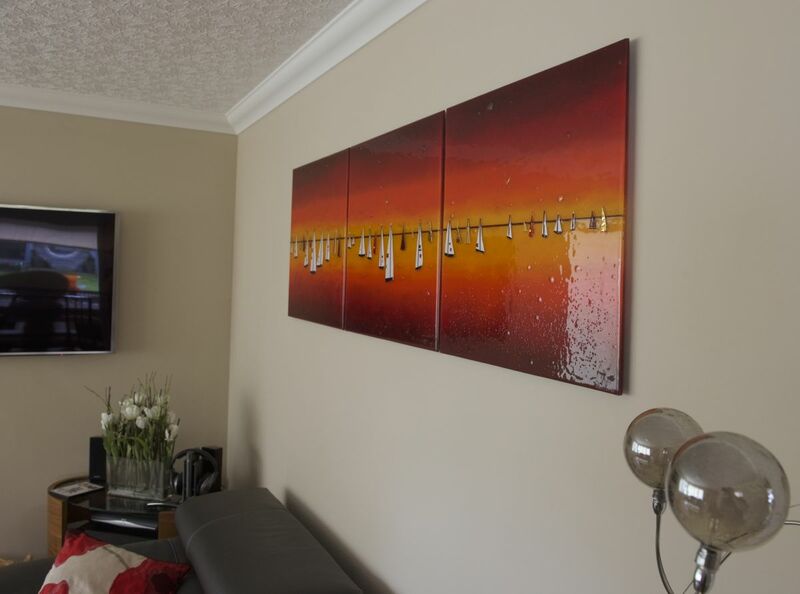 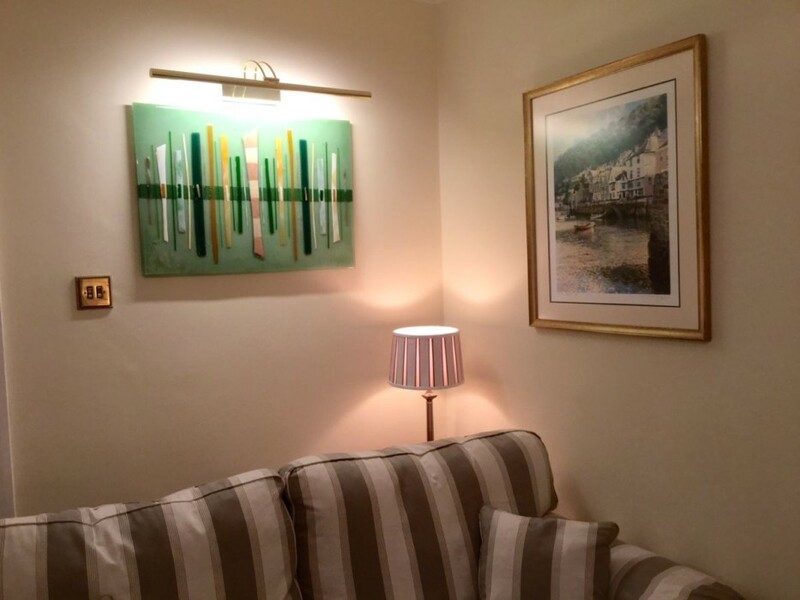 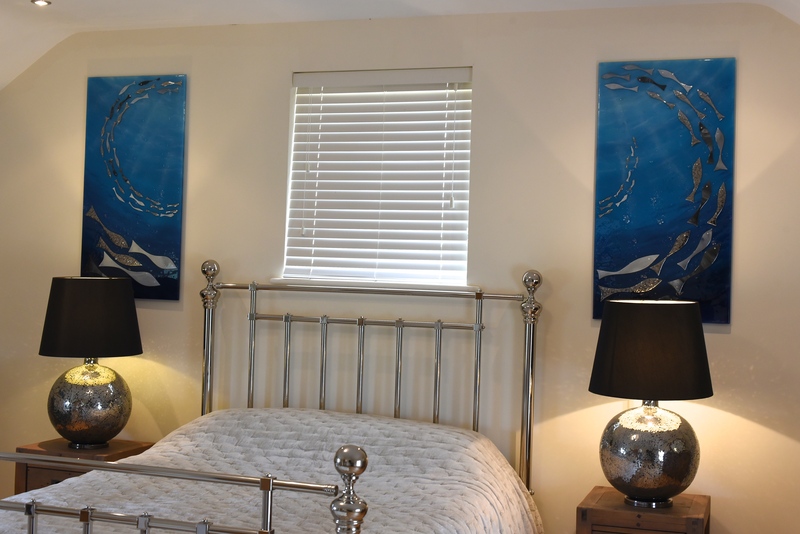 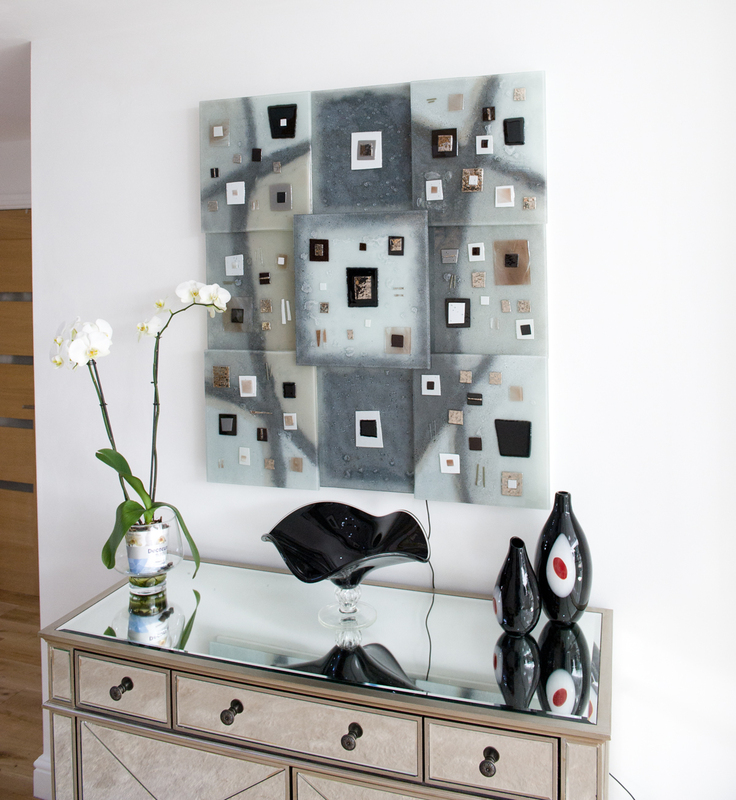 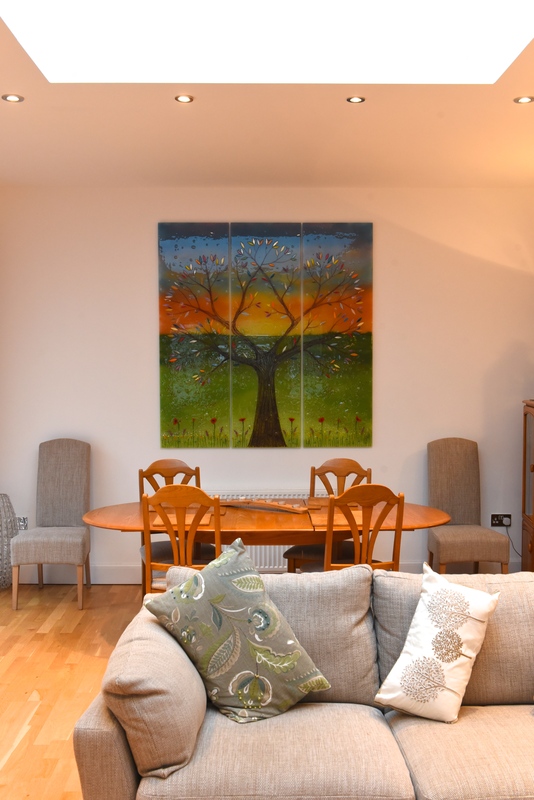 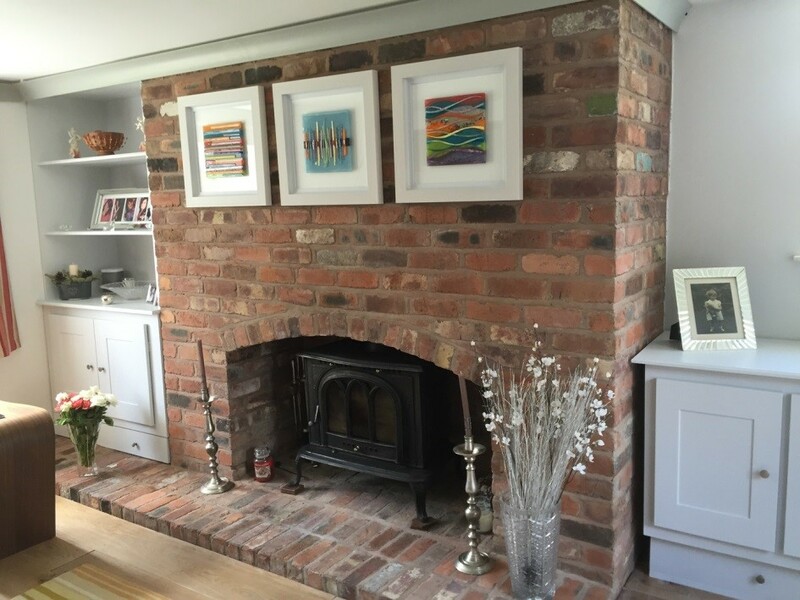 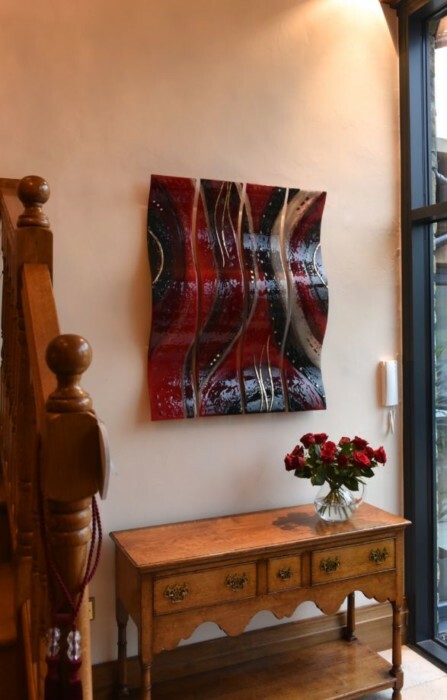 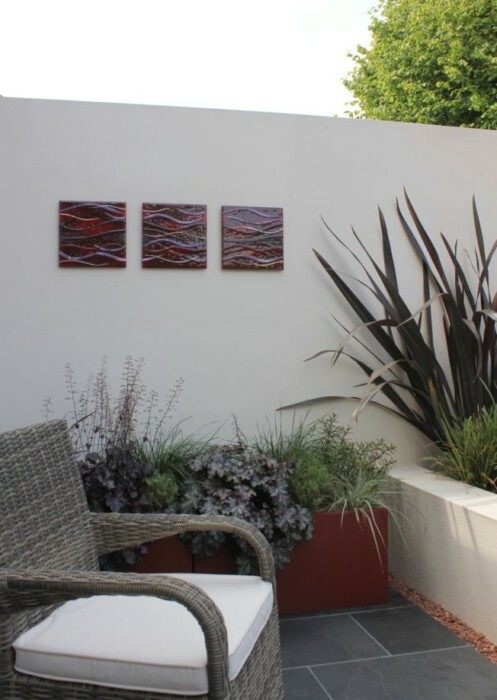 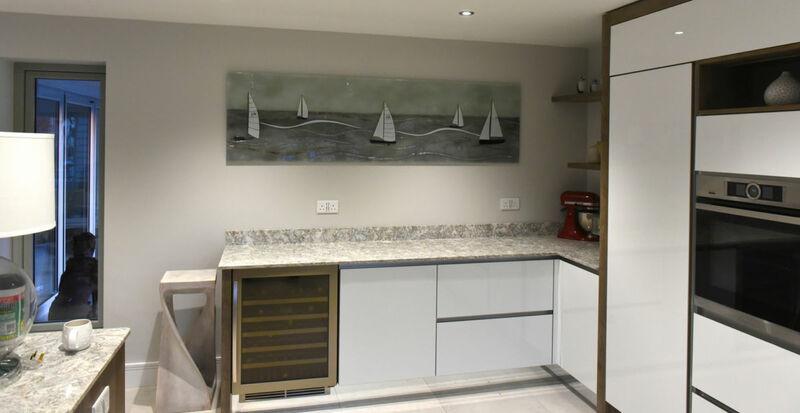 The customer was looking for something provide ample contrast next to the neutral tones and desaturated shades already on offer, and so Lisa soon set about creating a piece that would absolutely burst with colour. 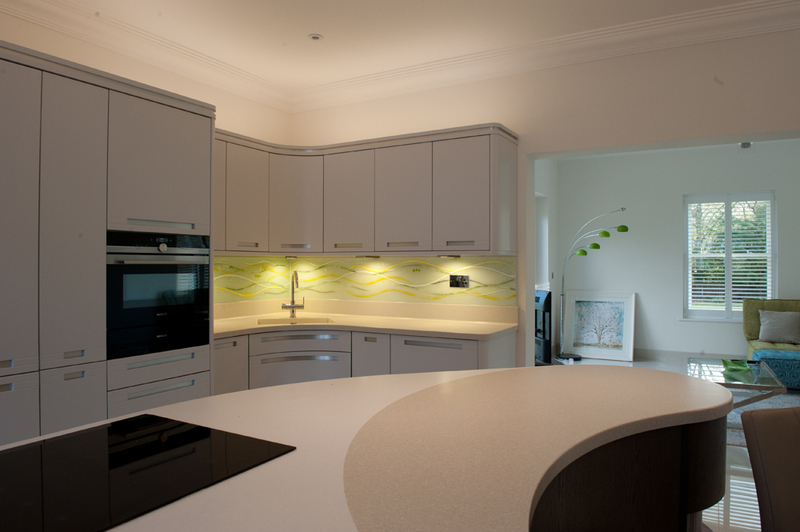 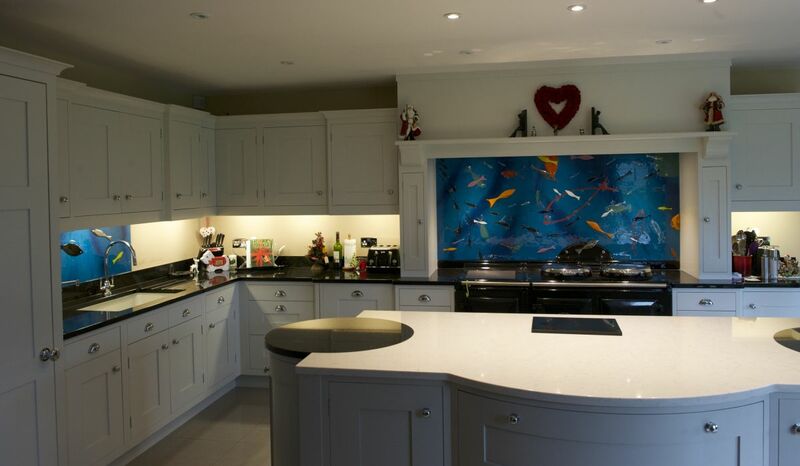 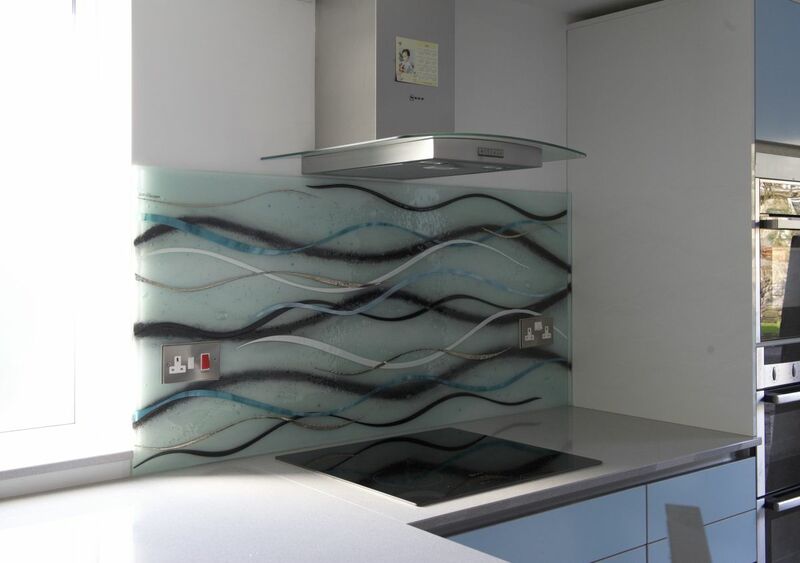 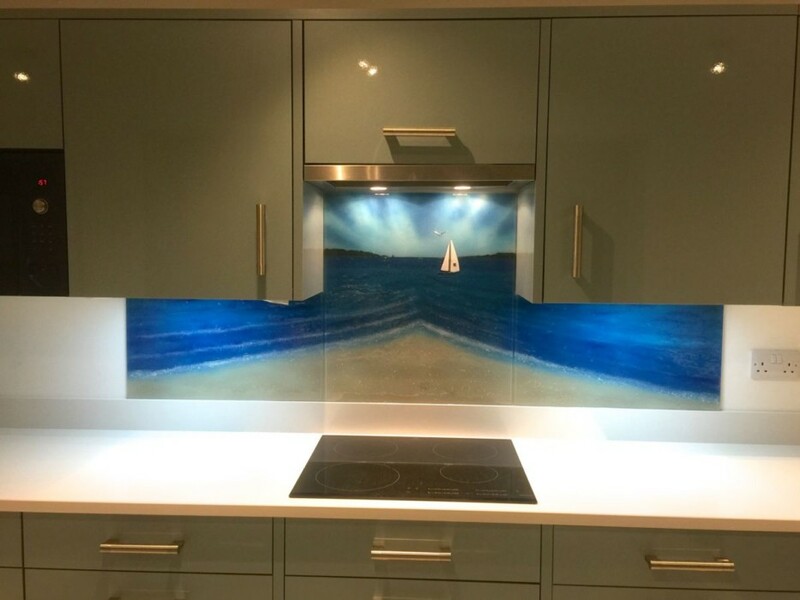 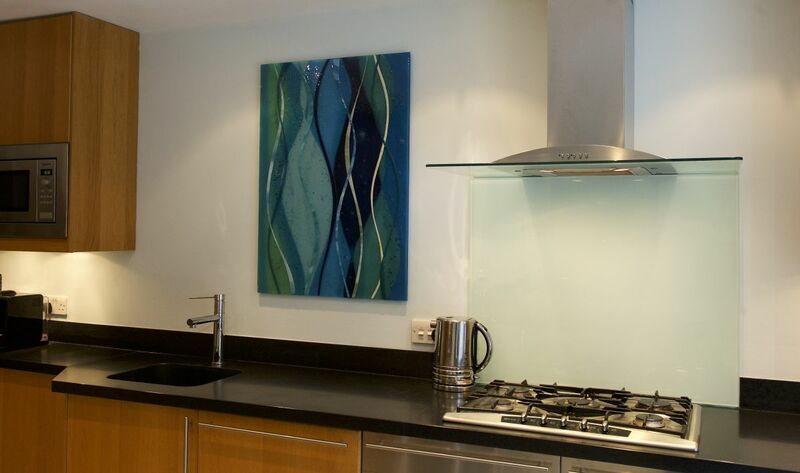 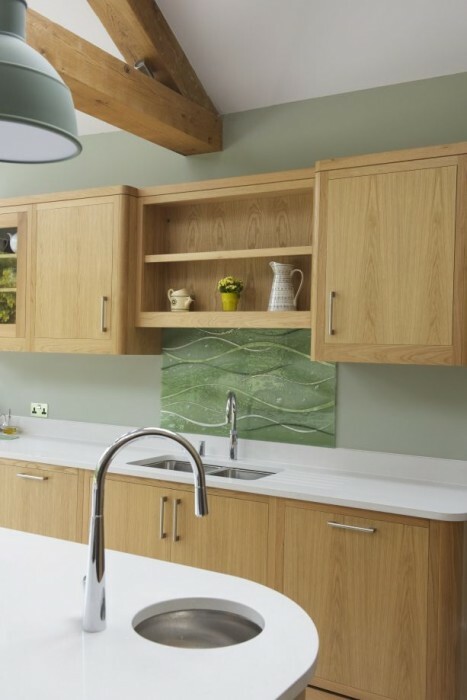 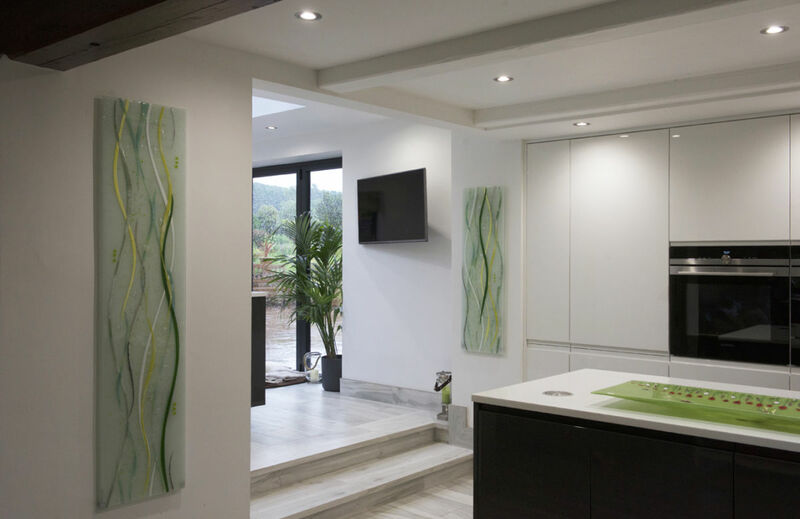 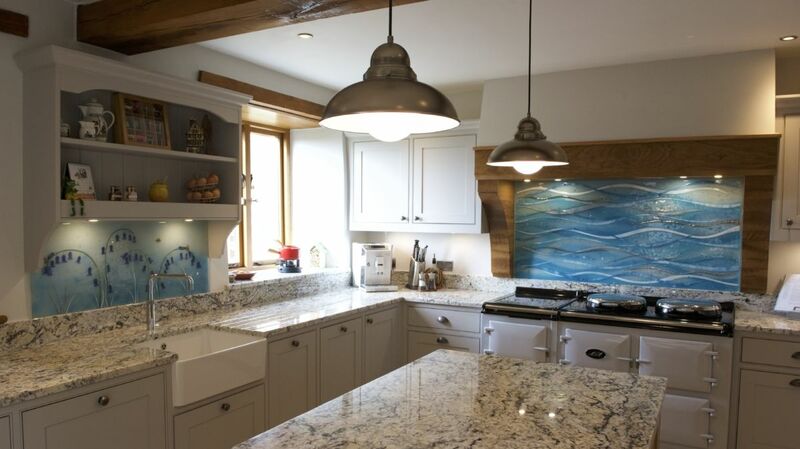 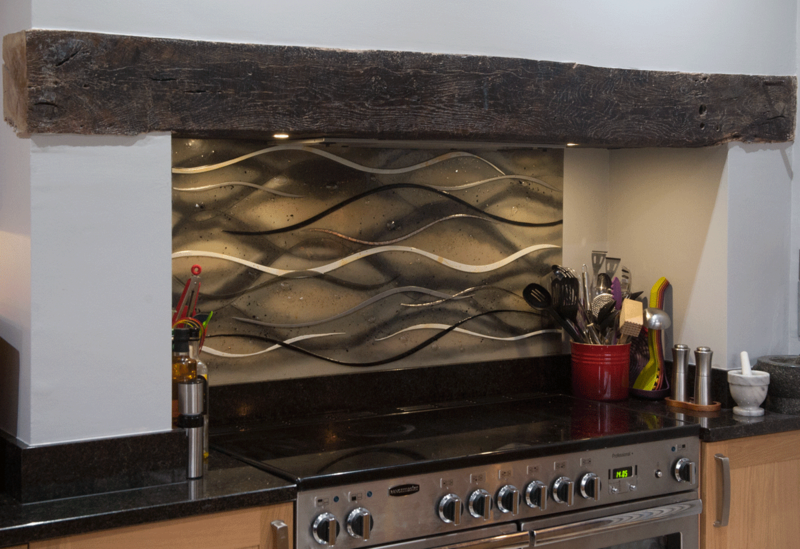 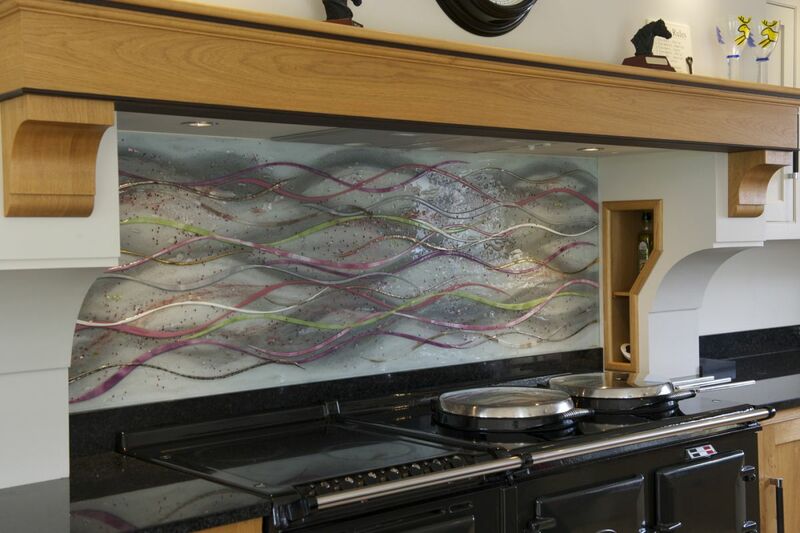 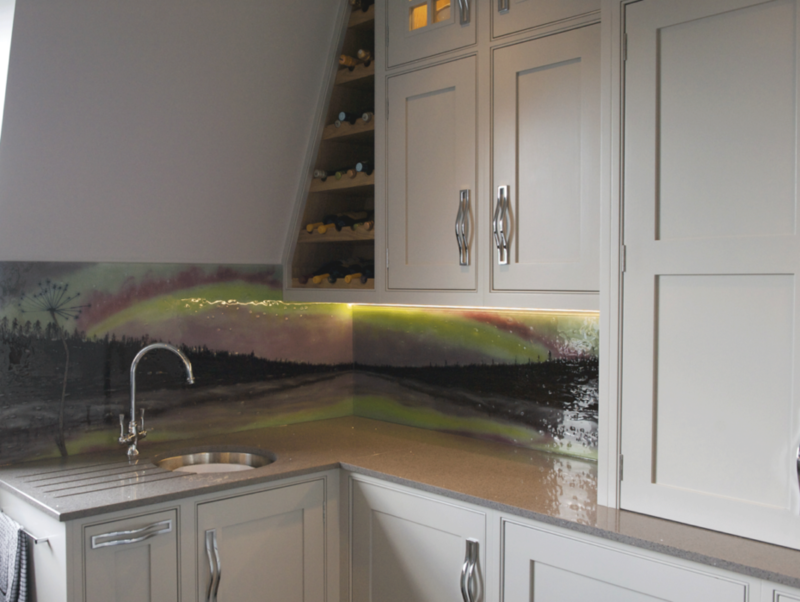 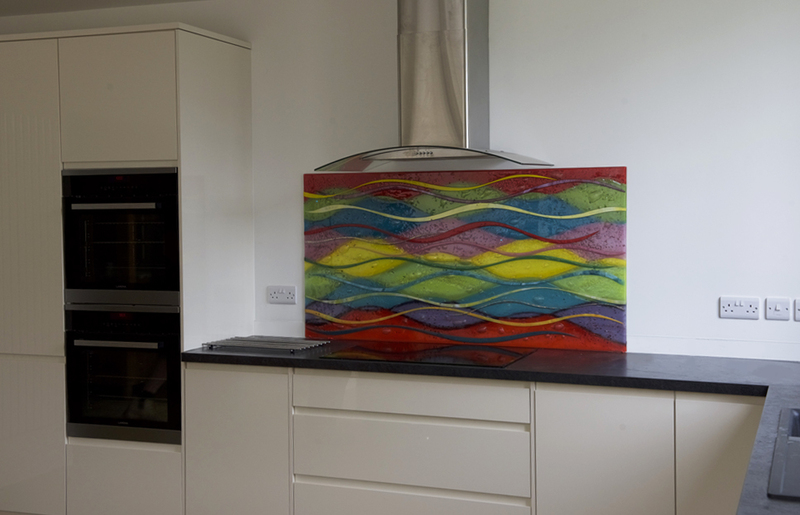 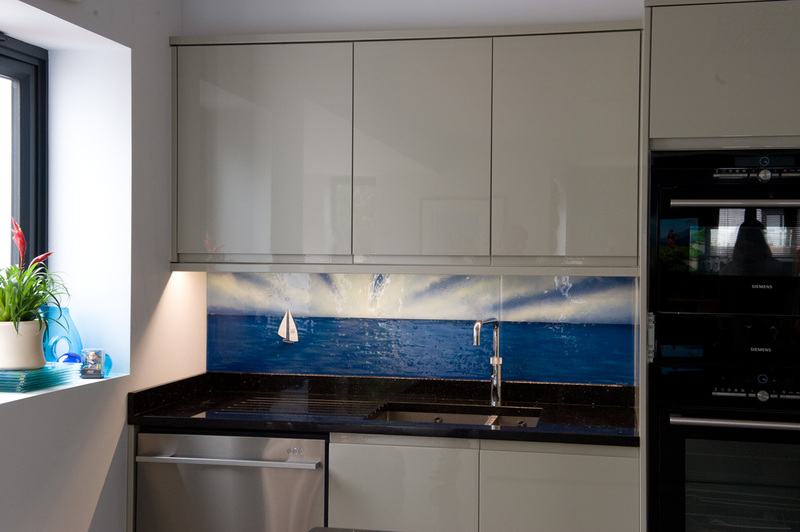 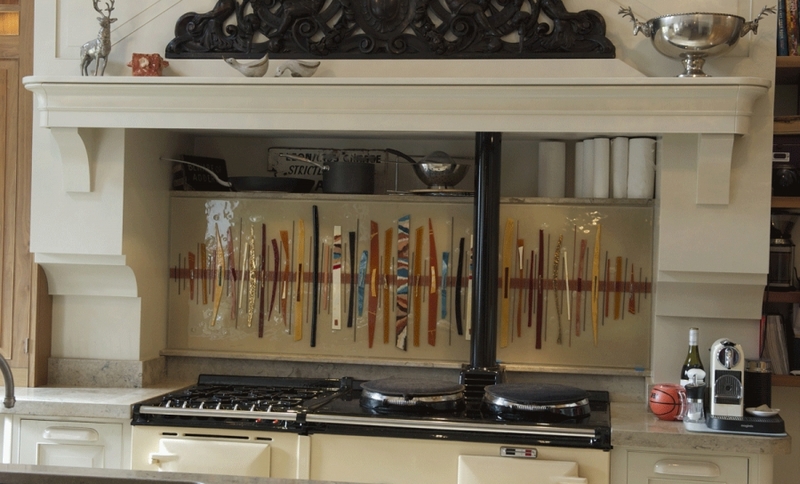 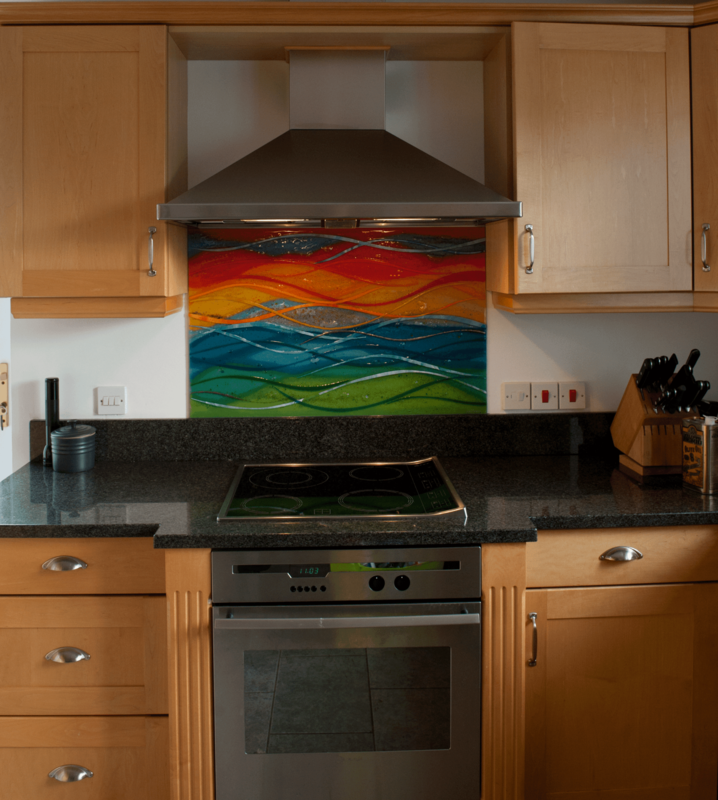 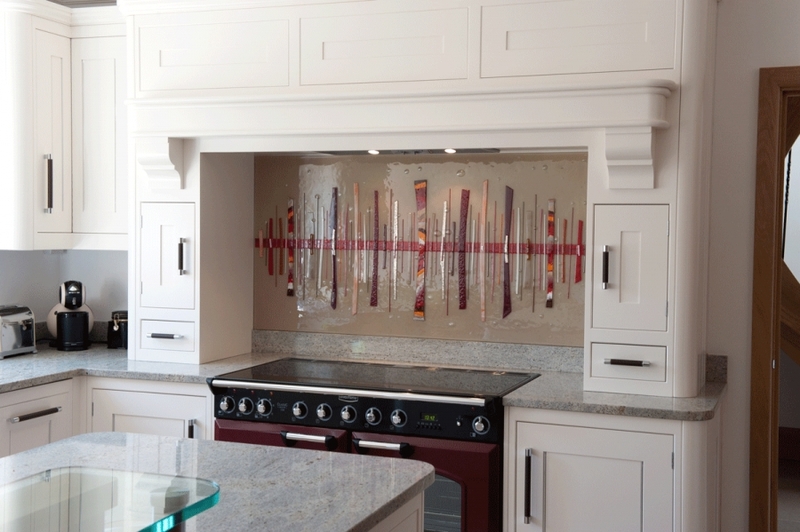 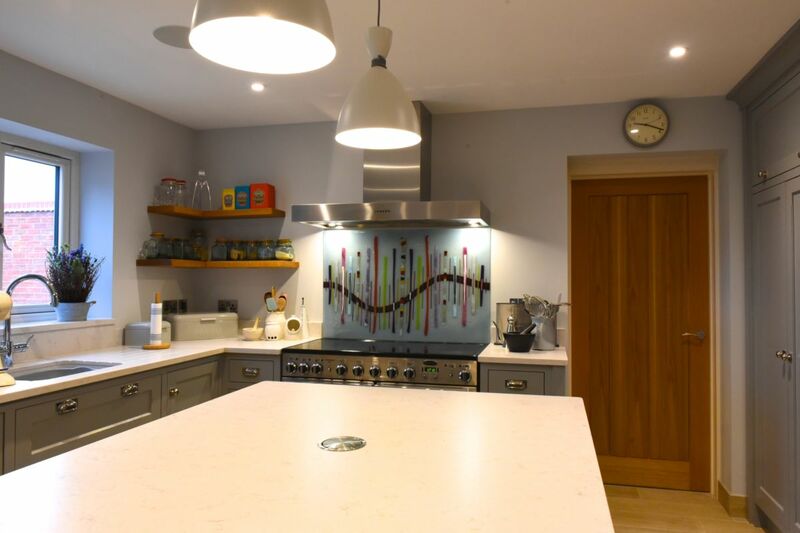 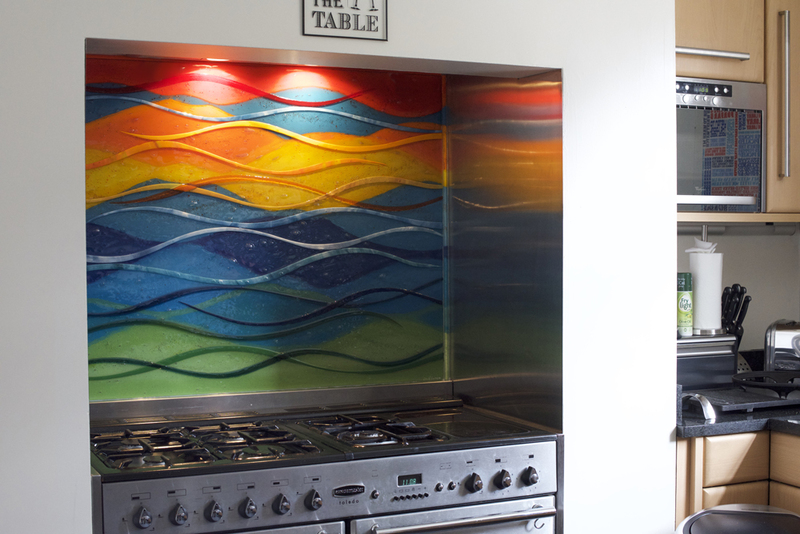 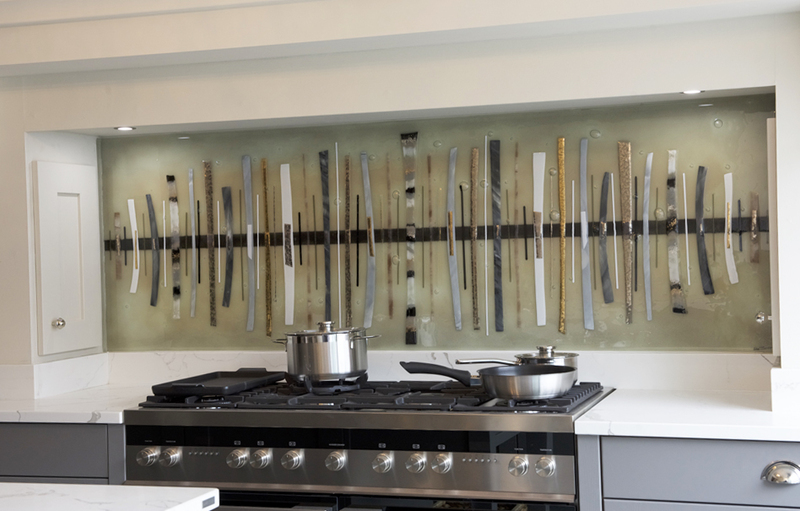 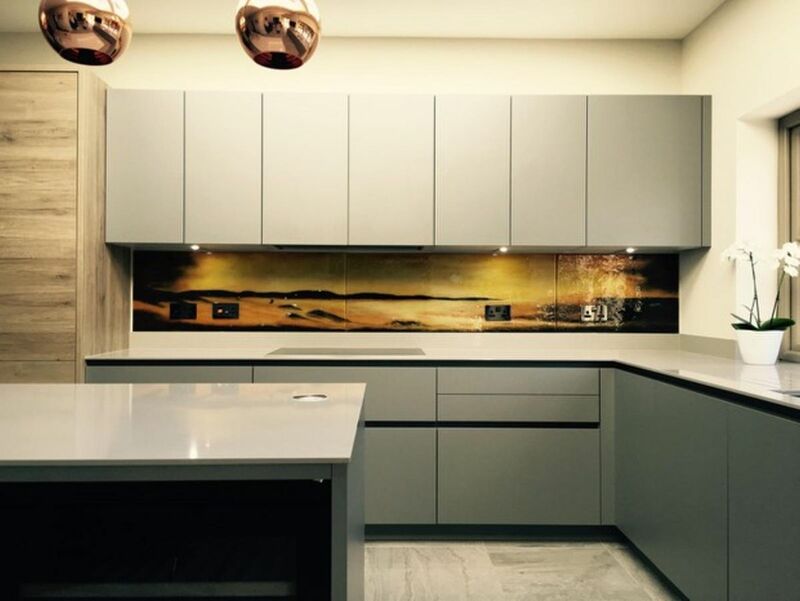 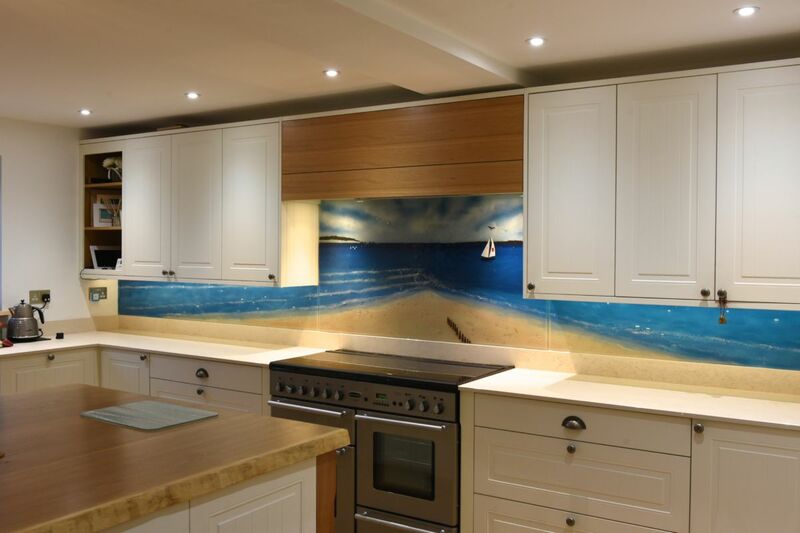 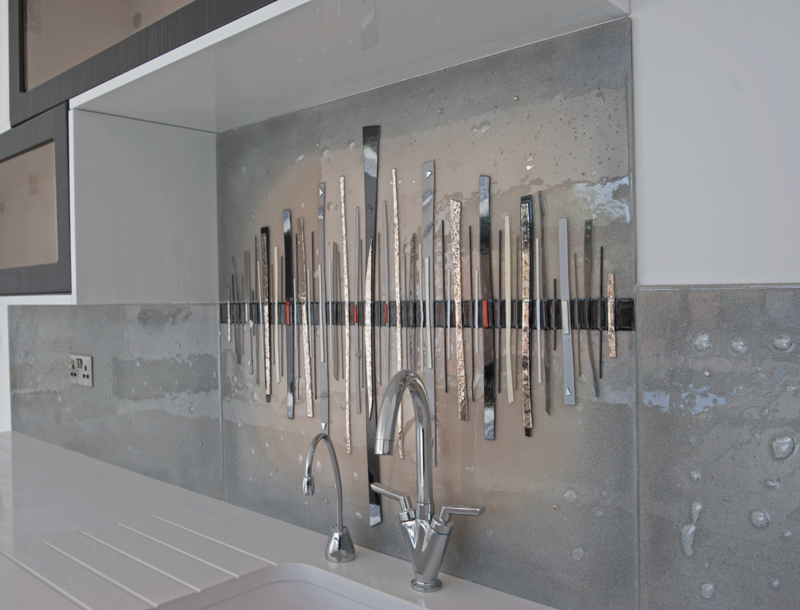 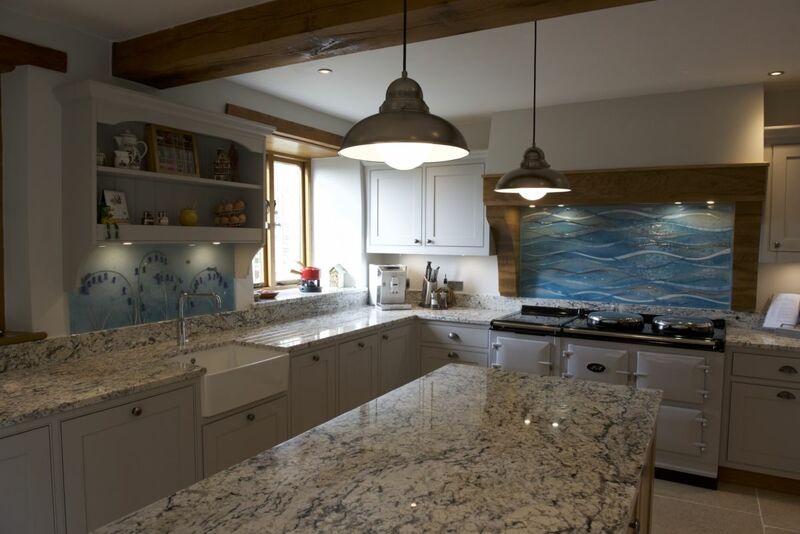 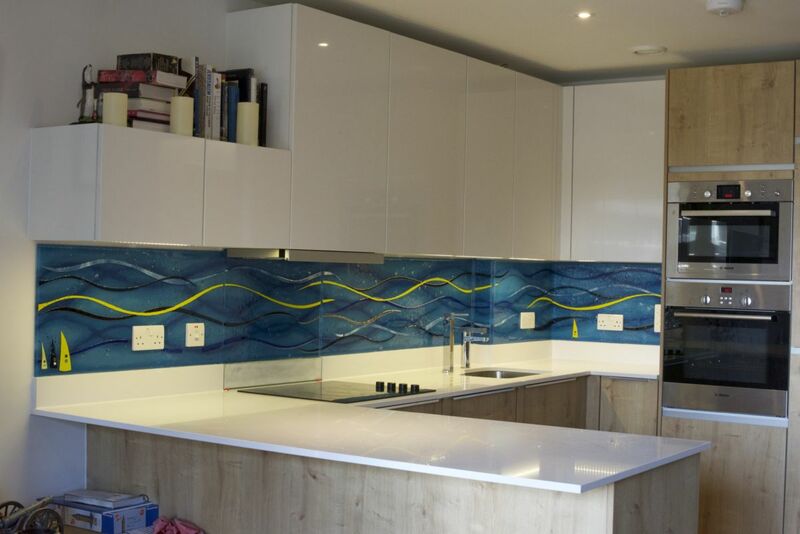 The piece took the form of a kitchen splashback, needless to say, with our classic Wave design flowing beautifully through from edge to edge. 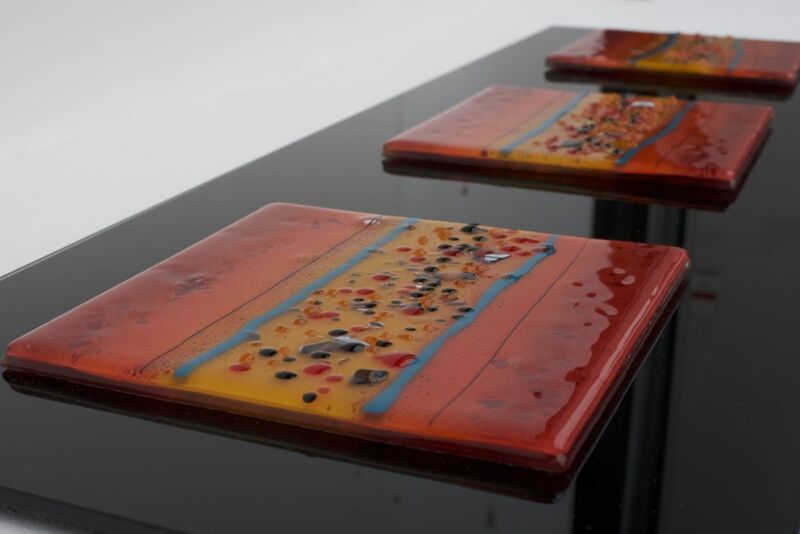 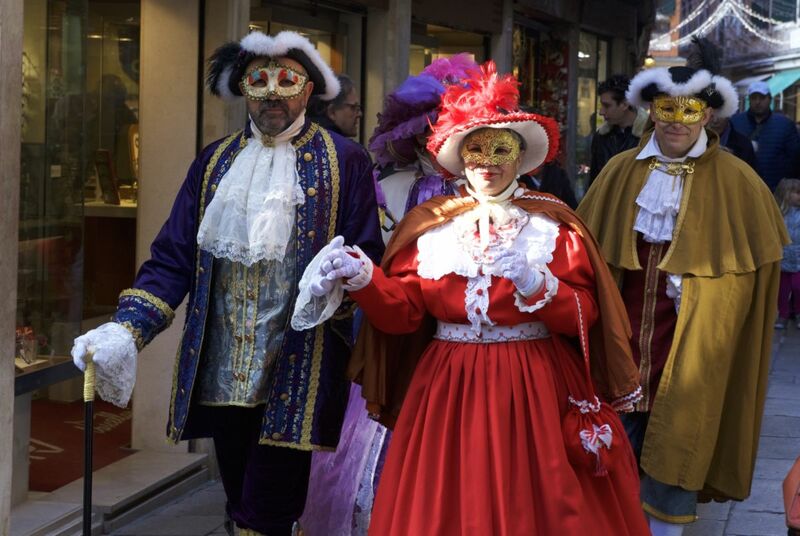 Colour wise, the glass was filled with warm, burning oranges and spicy red shades, all topped off with regal gold accents. 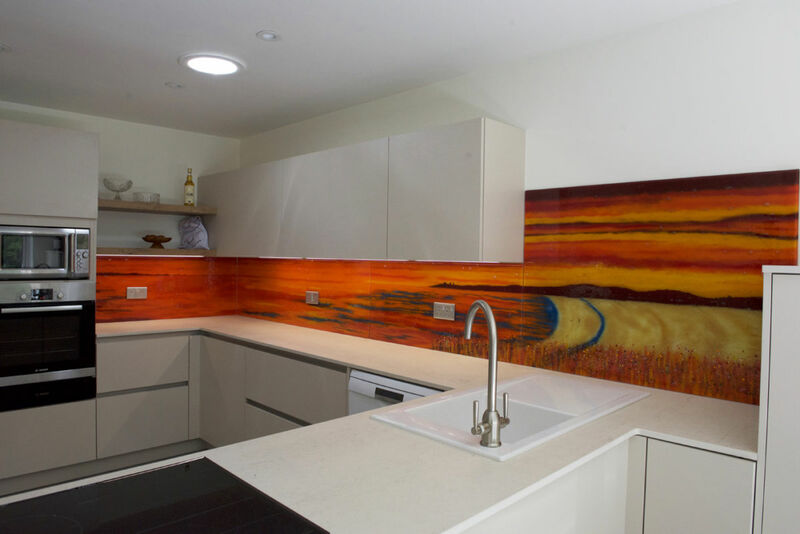 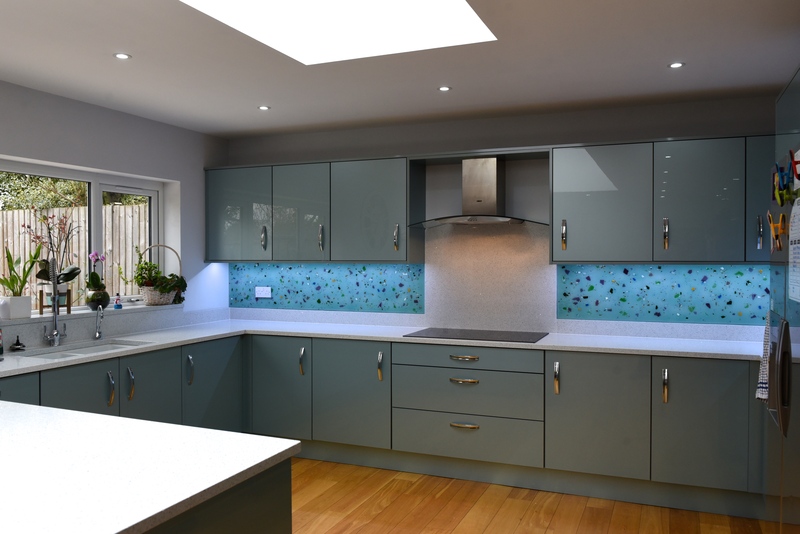 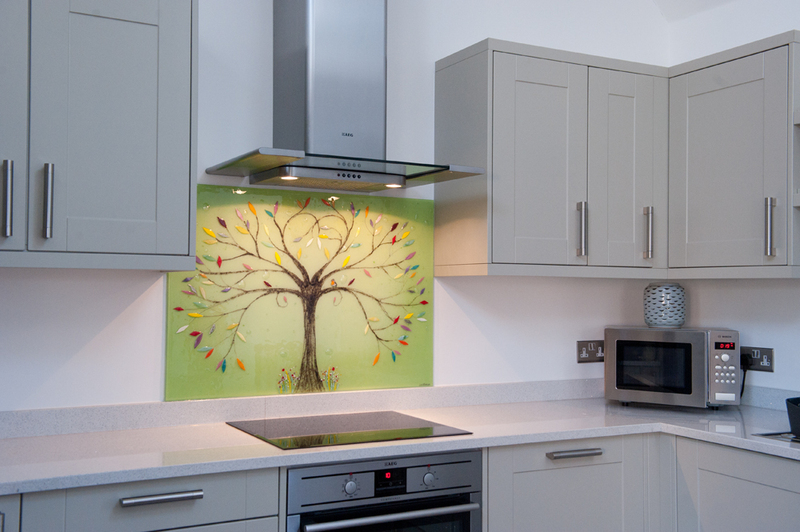 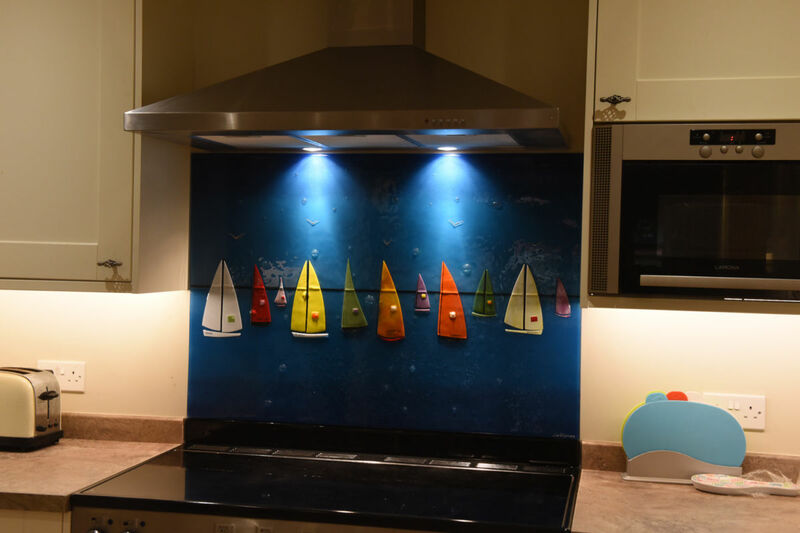 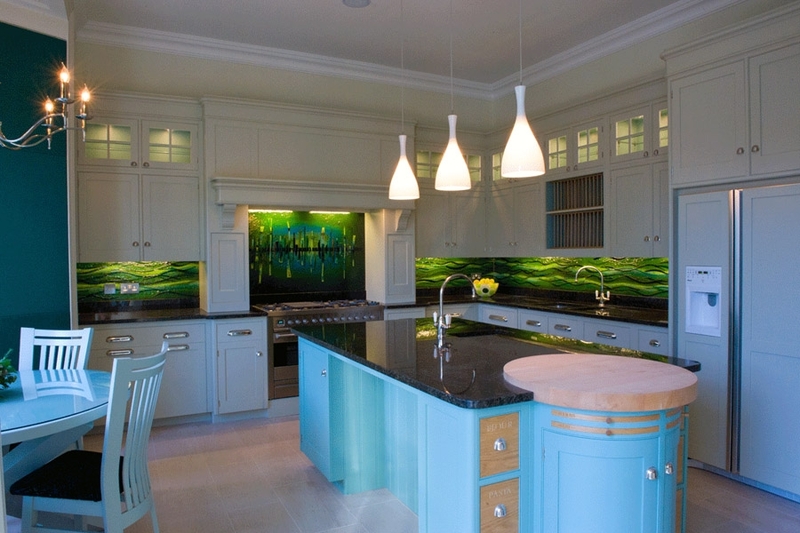 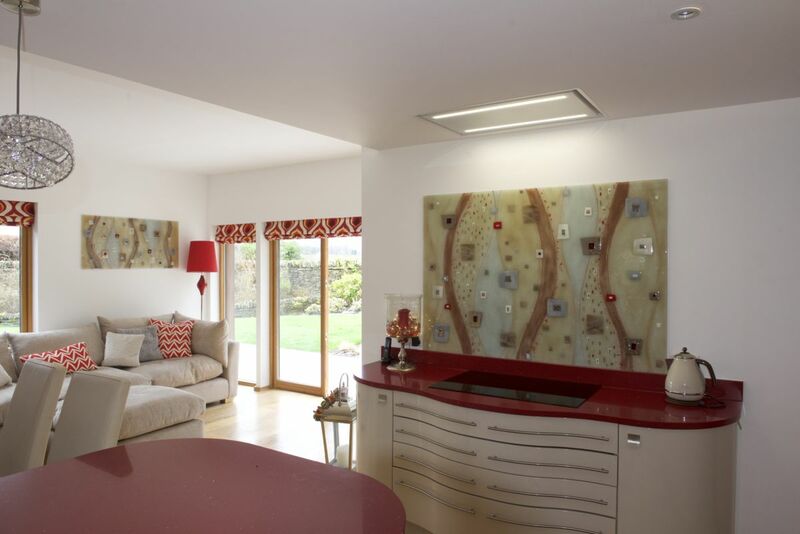 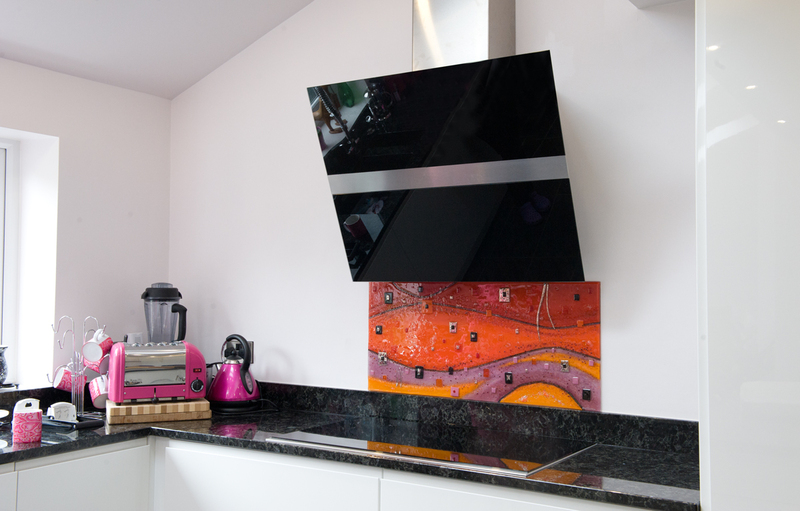 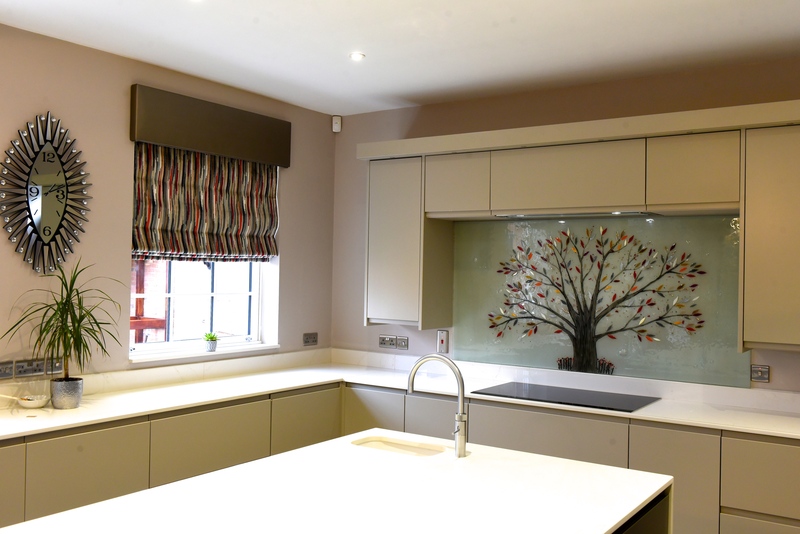 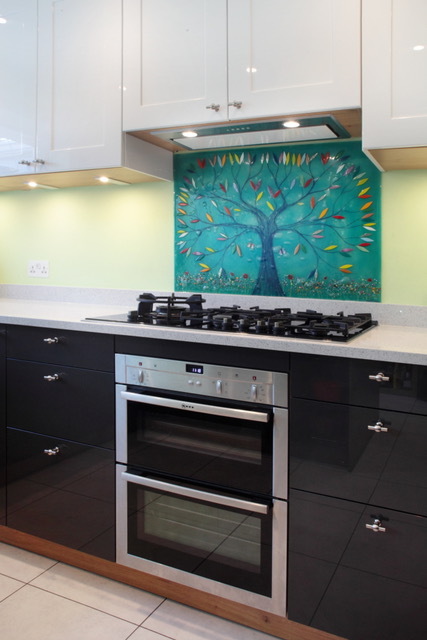 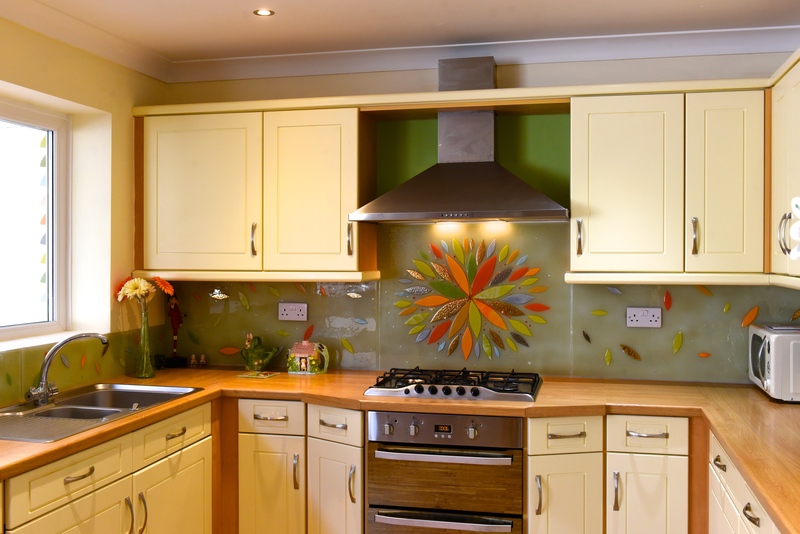 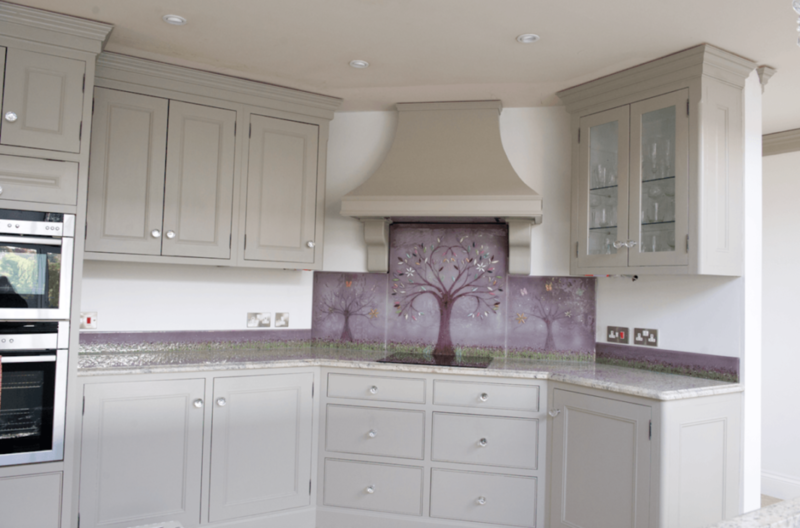 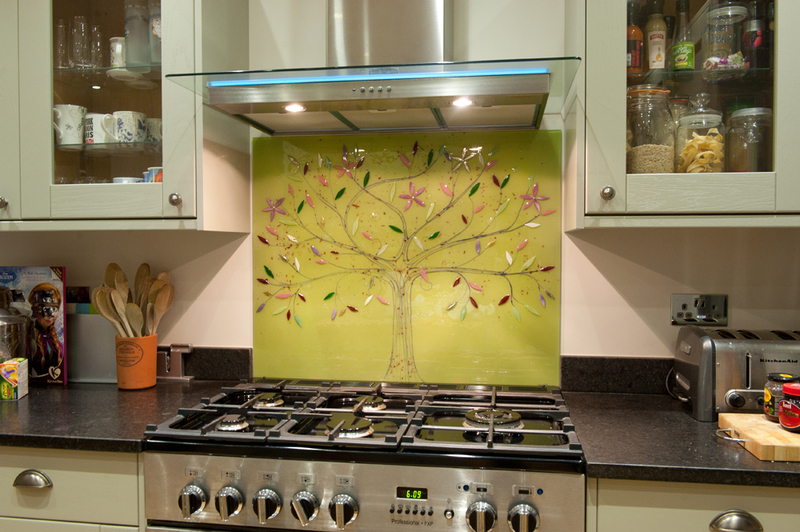 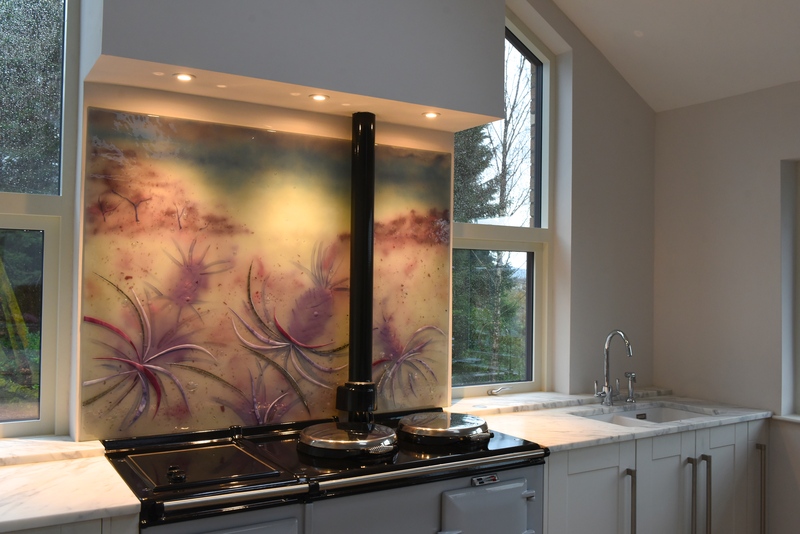 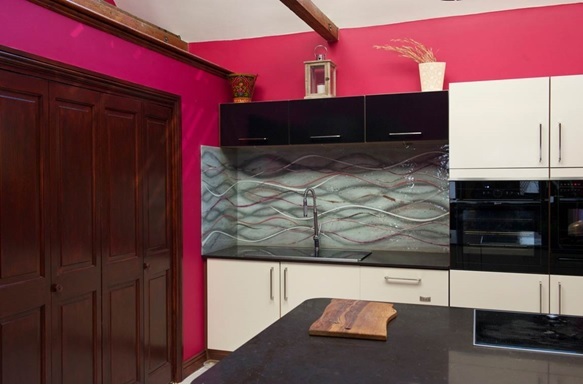 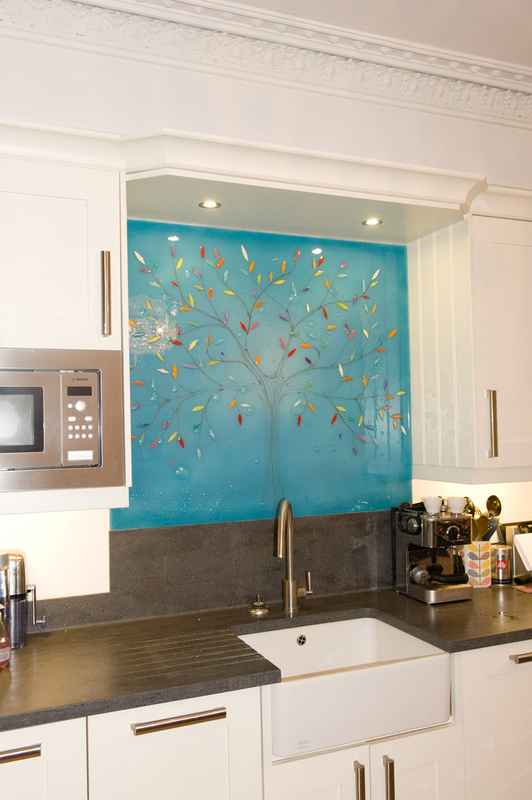 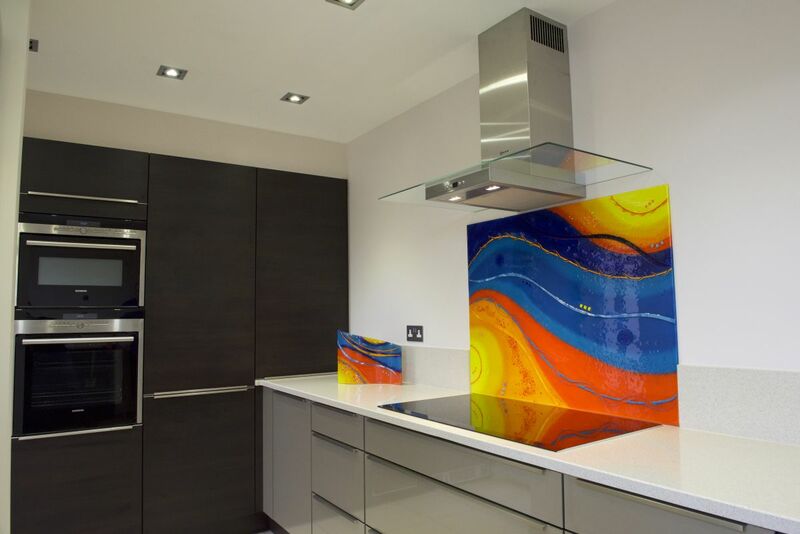 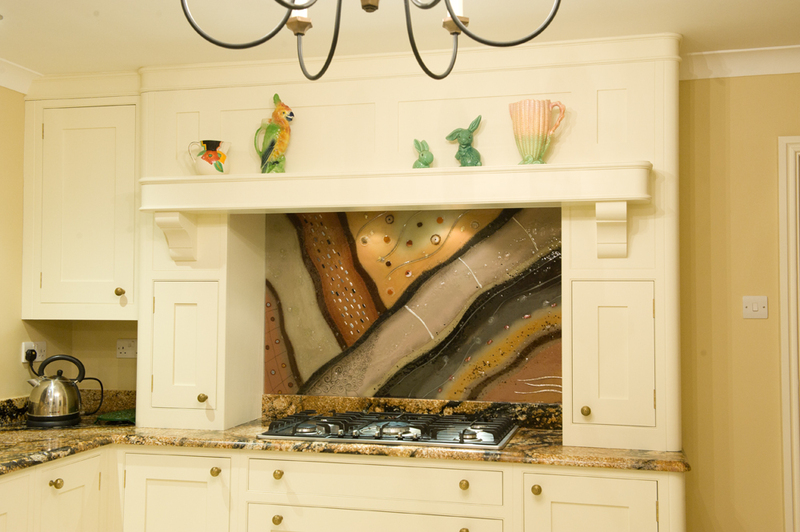 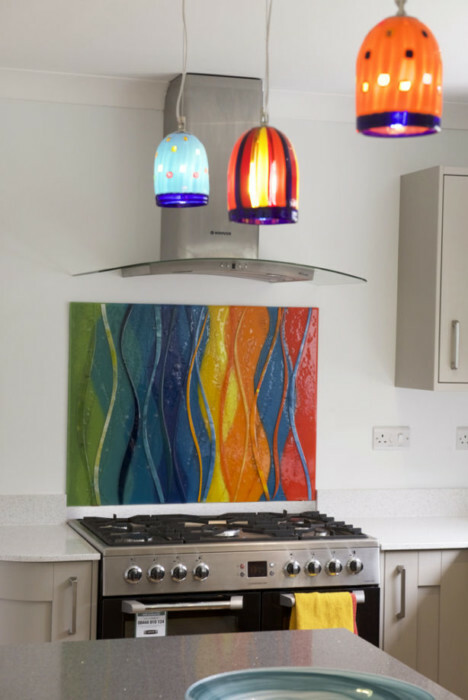 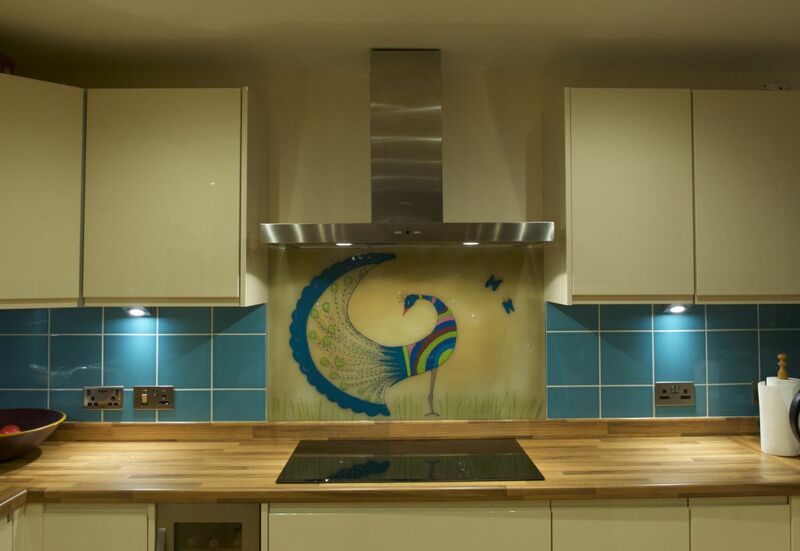 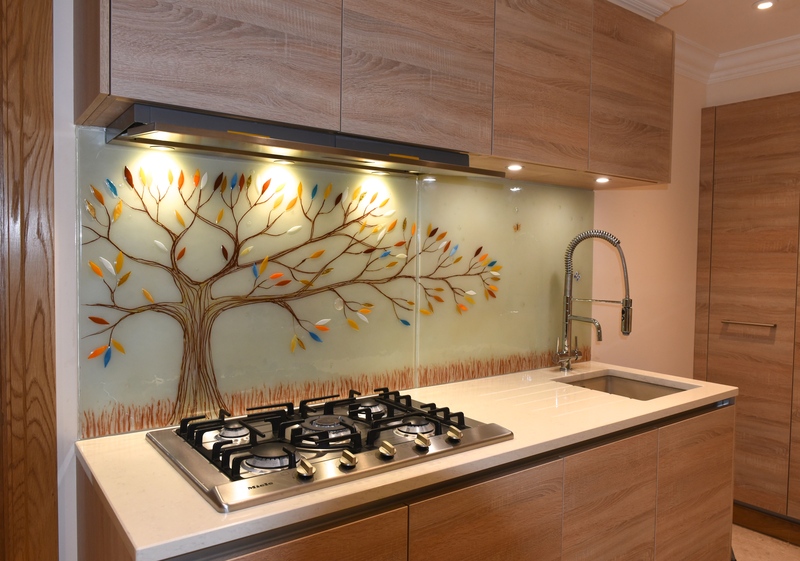 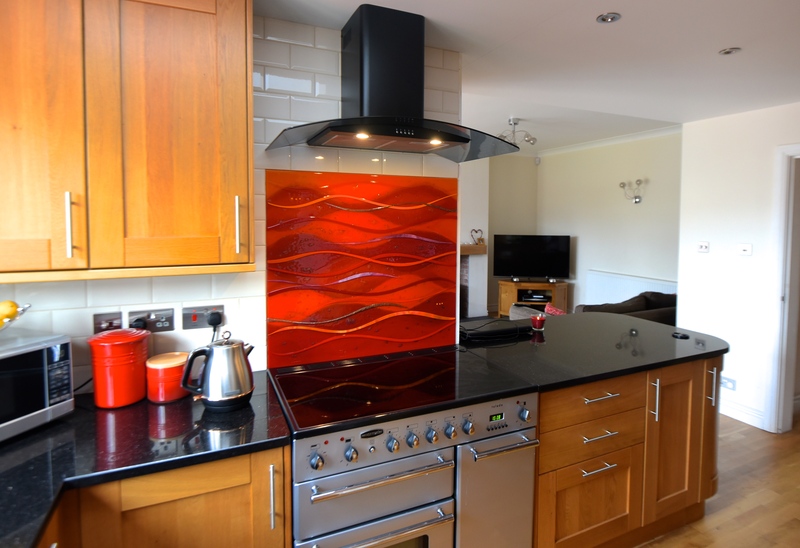 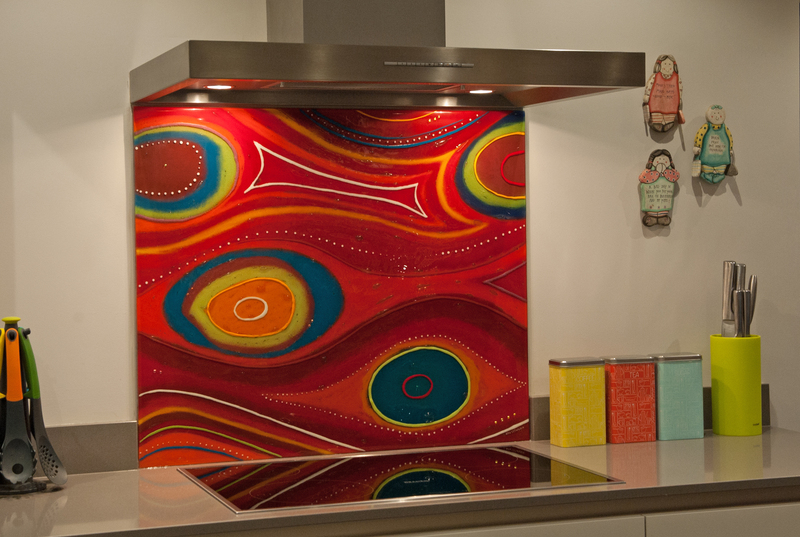 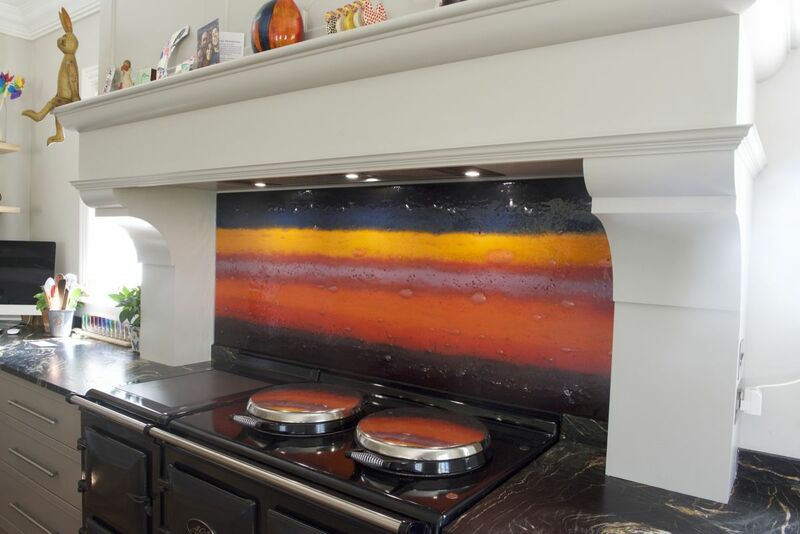 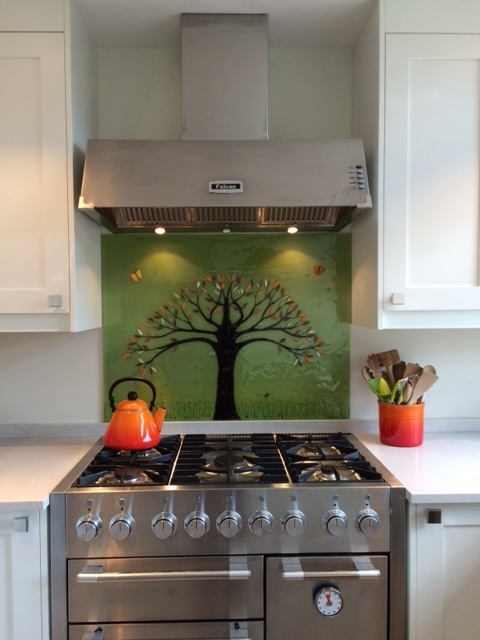 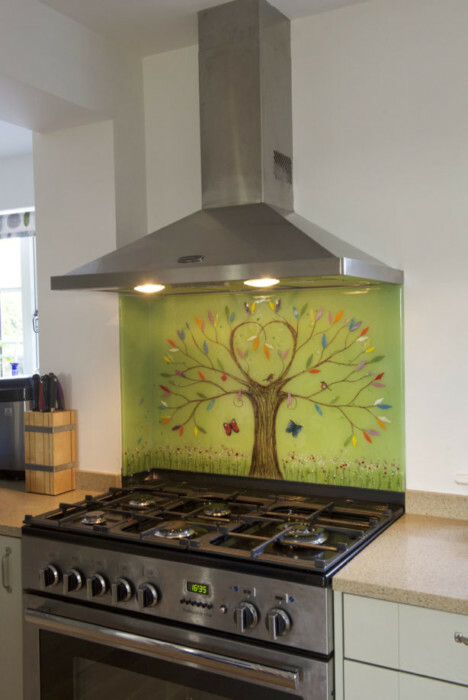 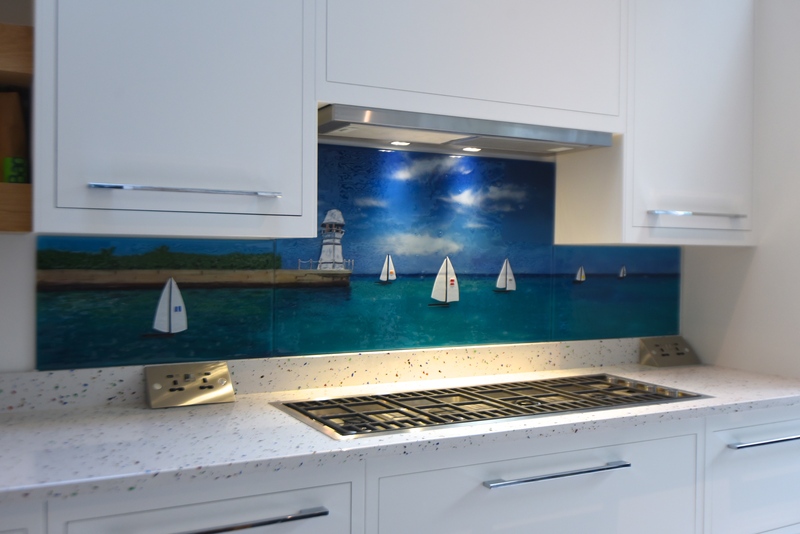 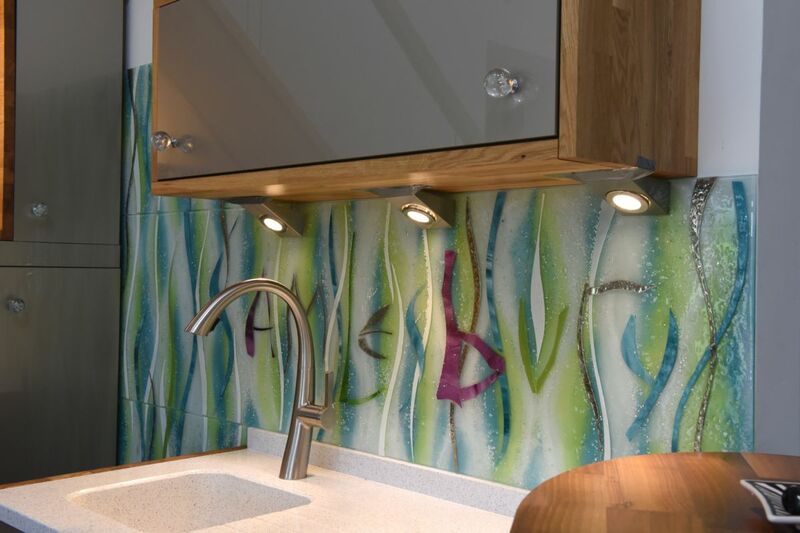 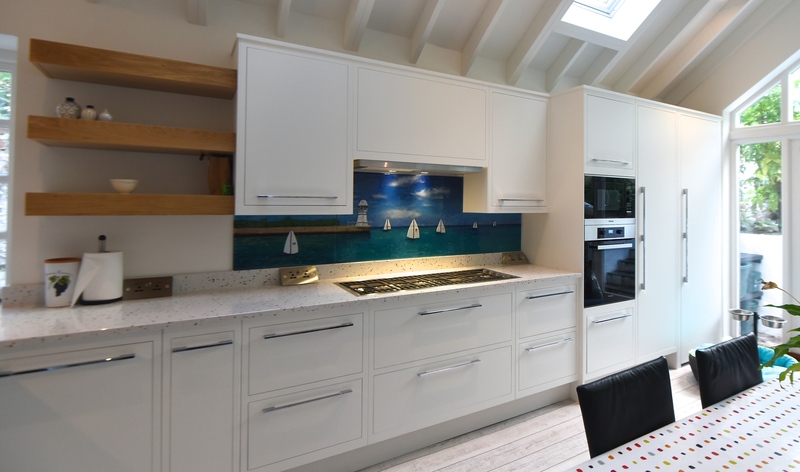 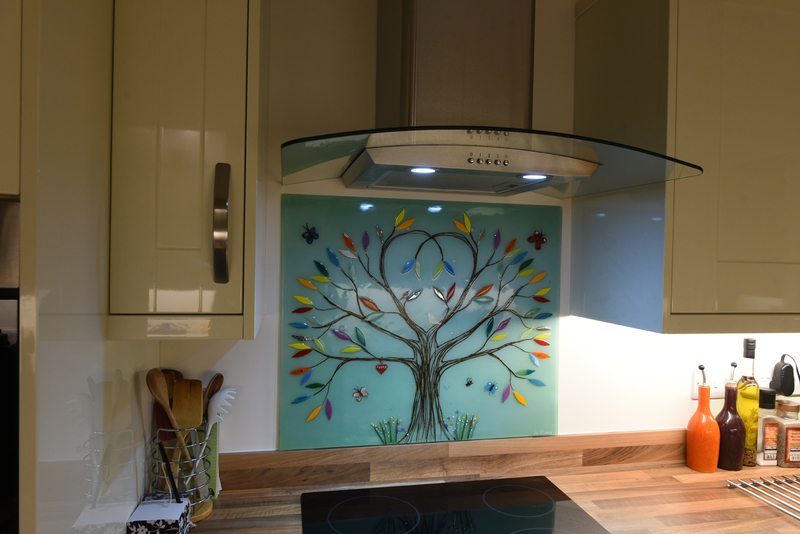 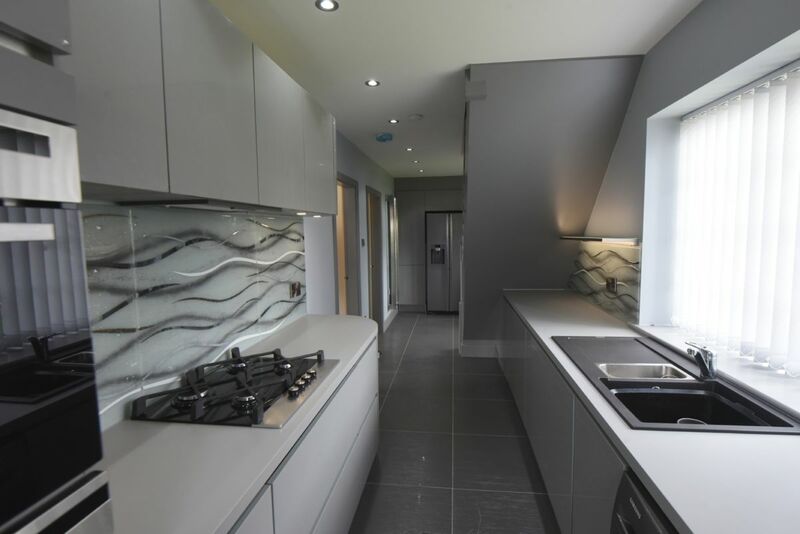 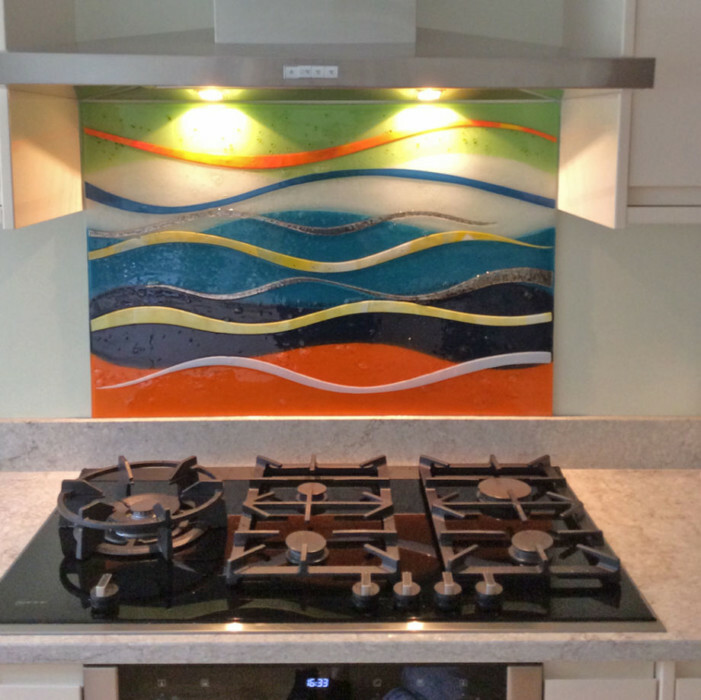 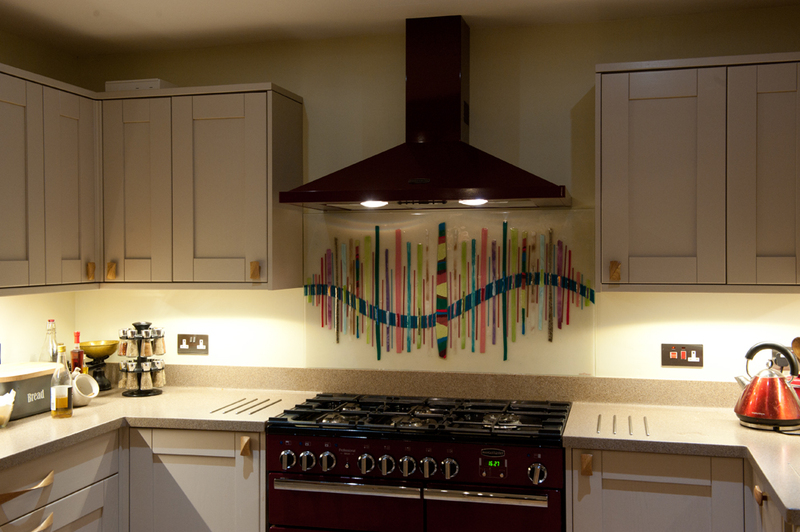 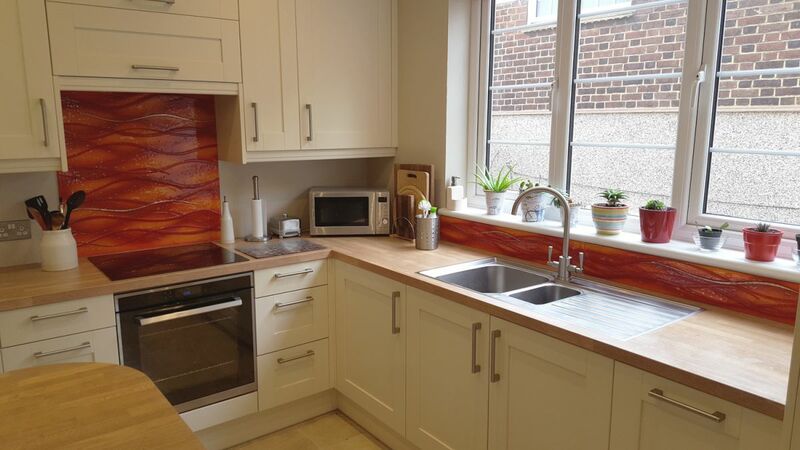 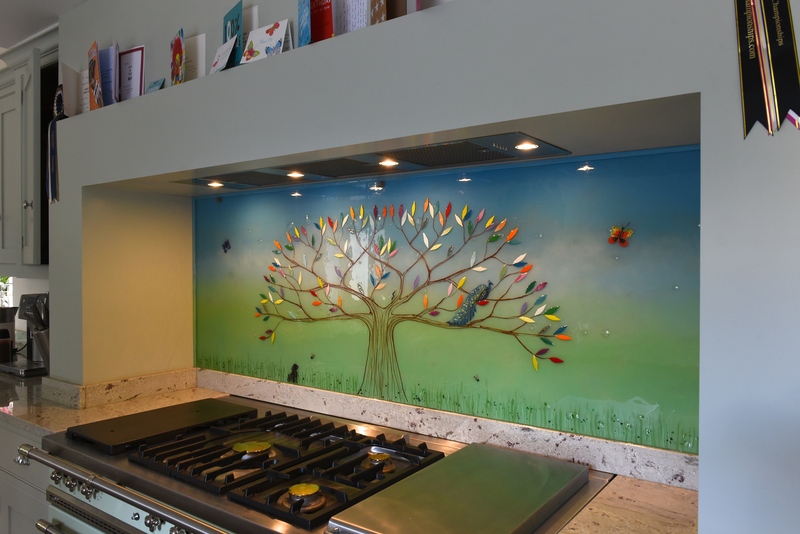 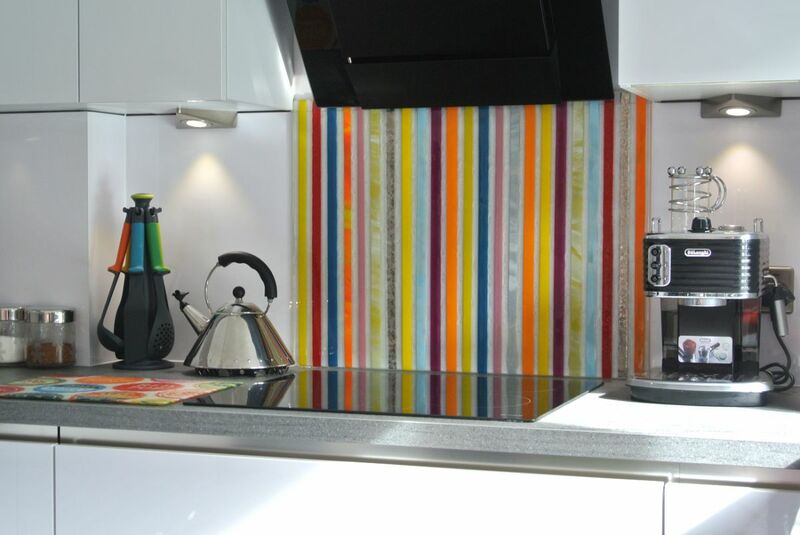 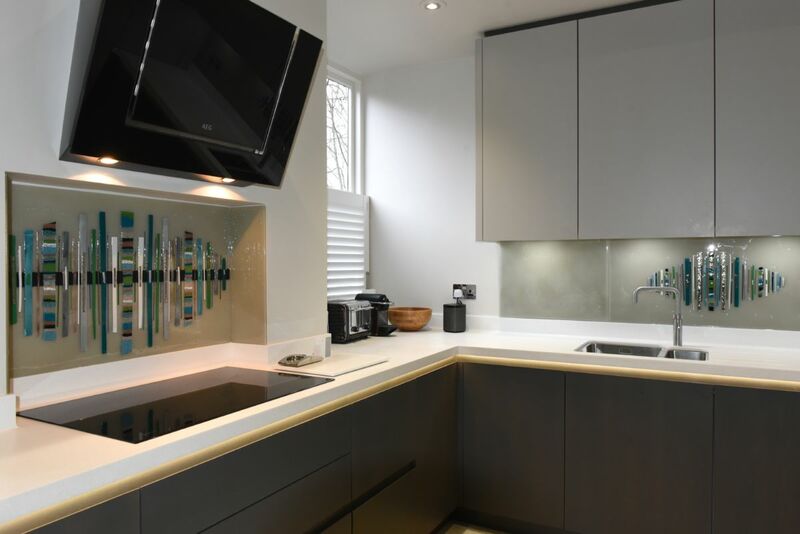 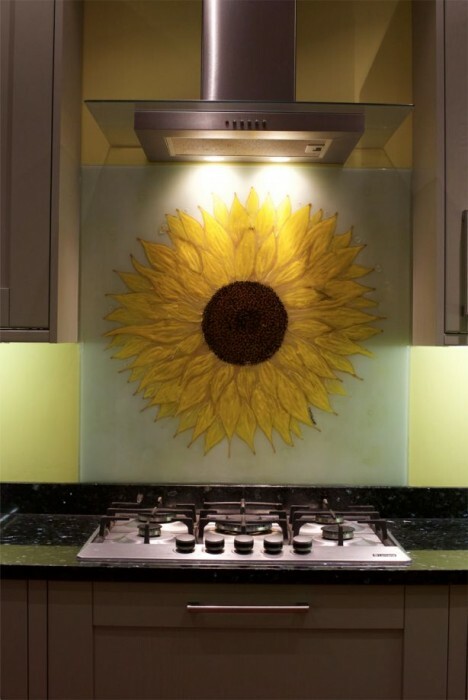 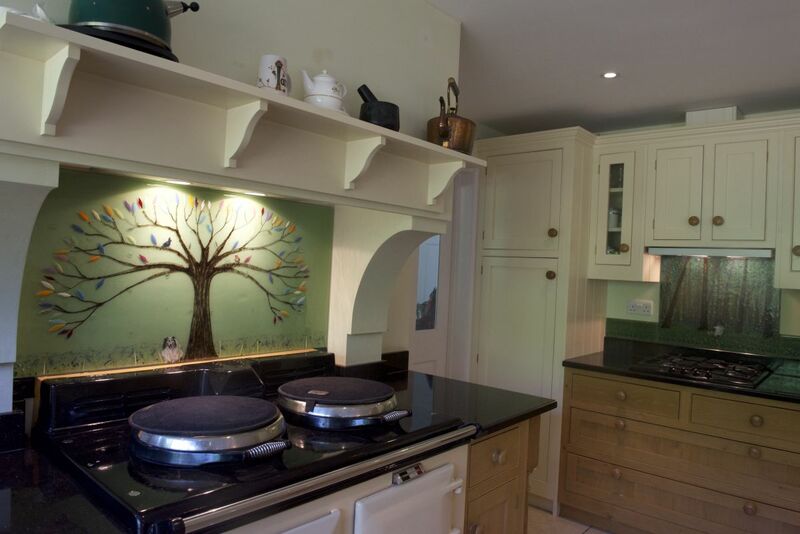 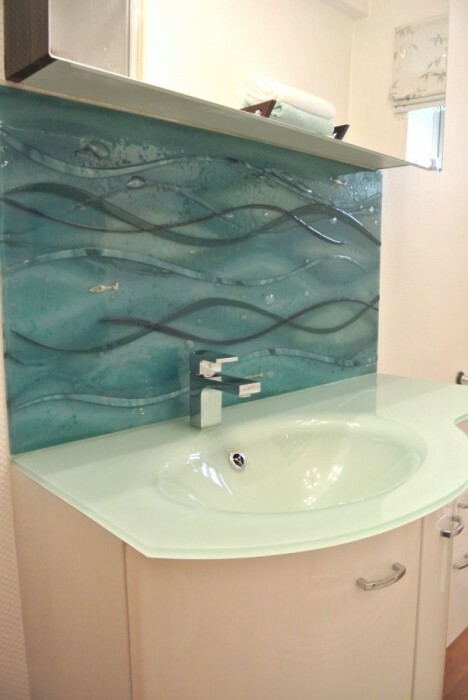 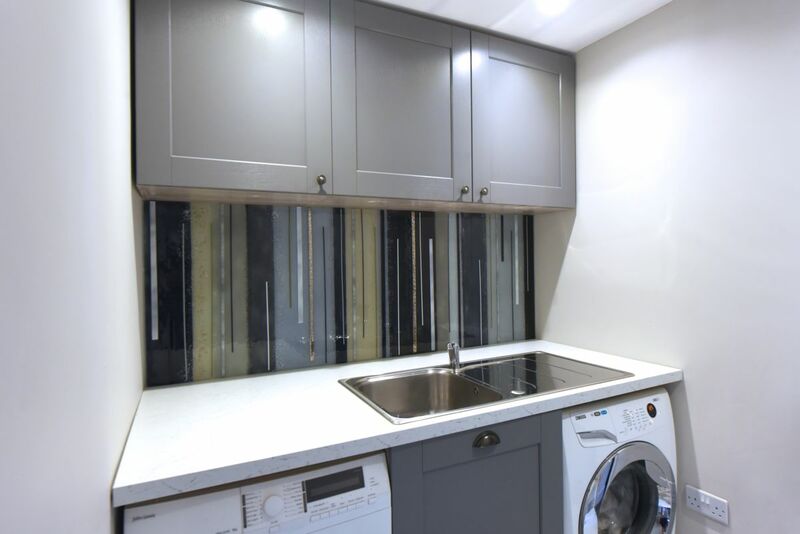 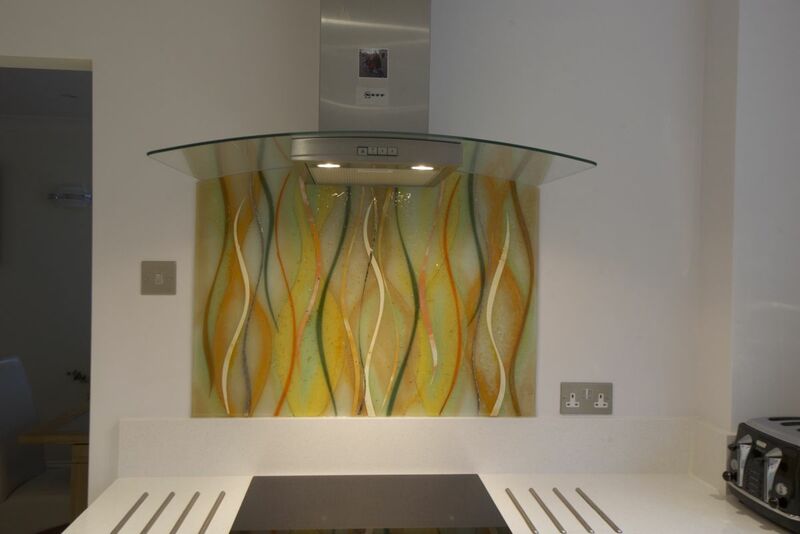 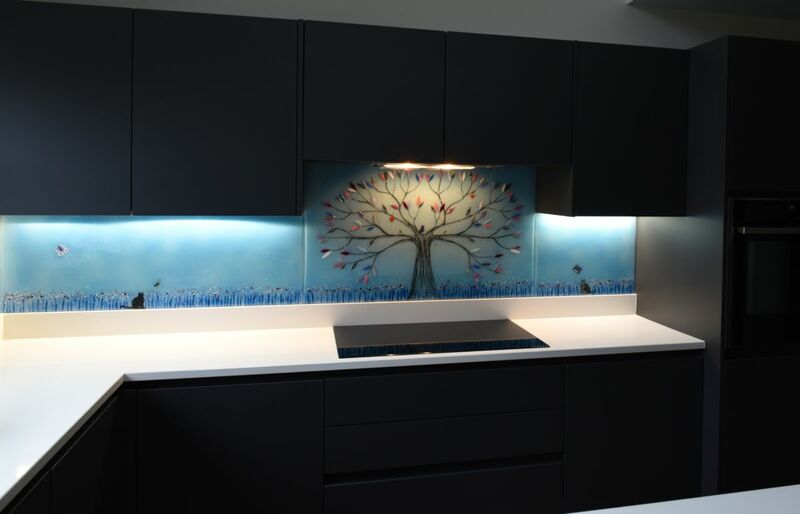 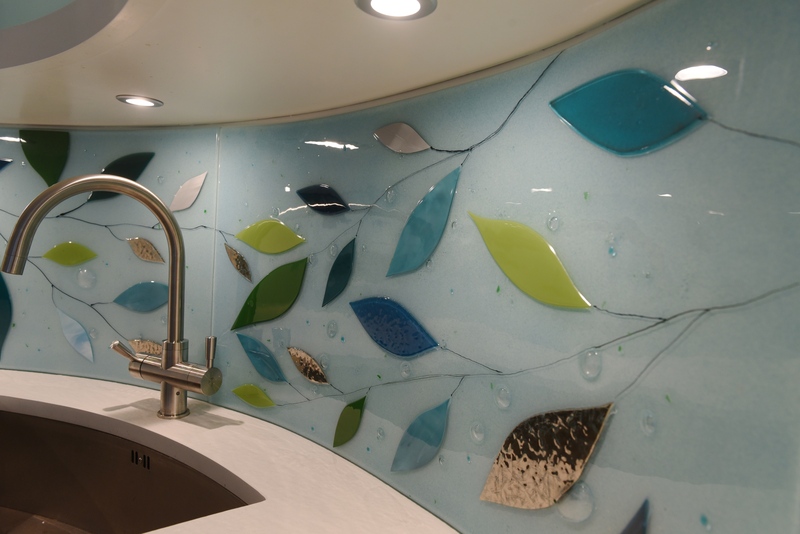 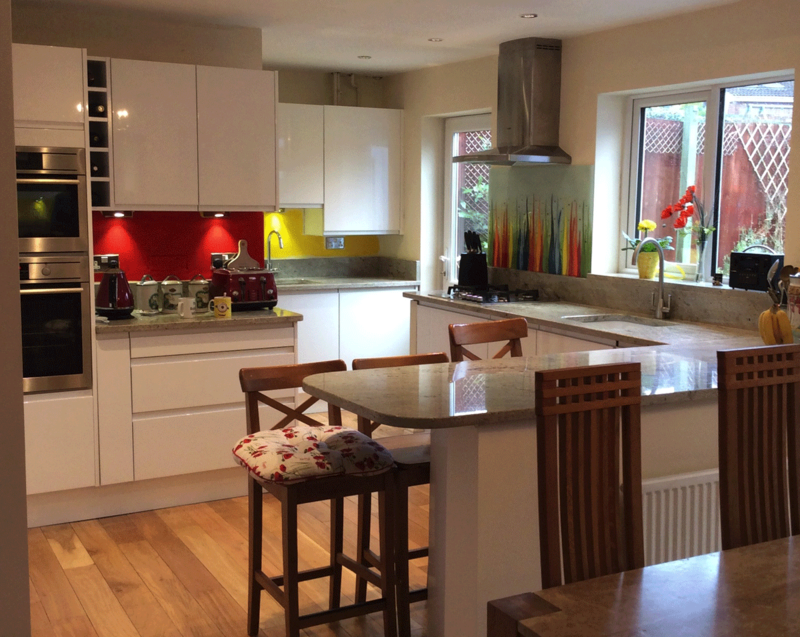 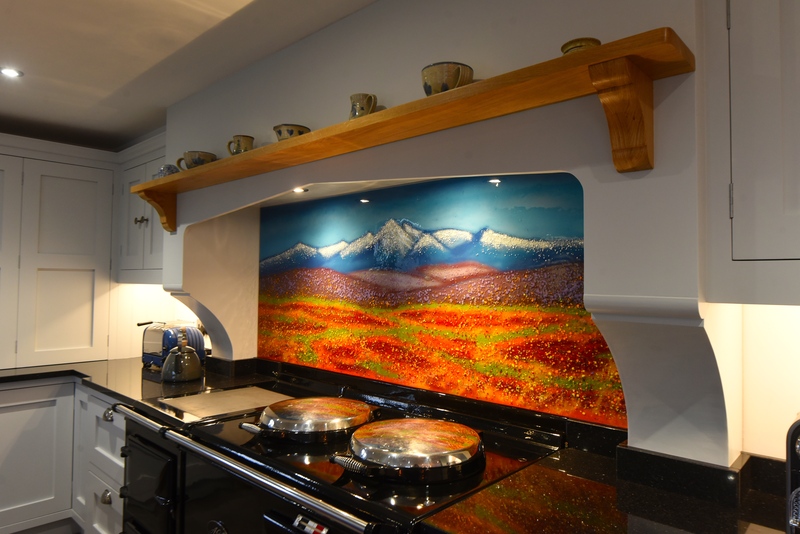 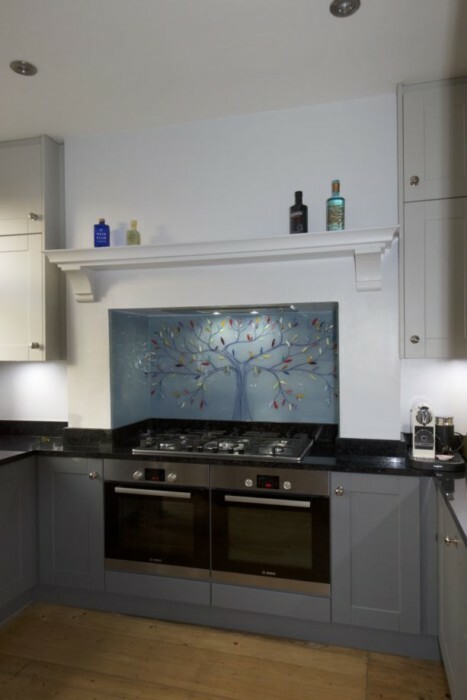 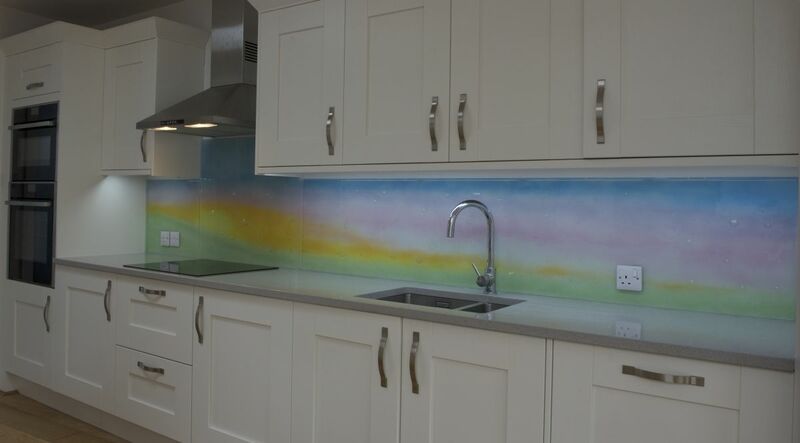 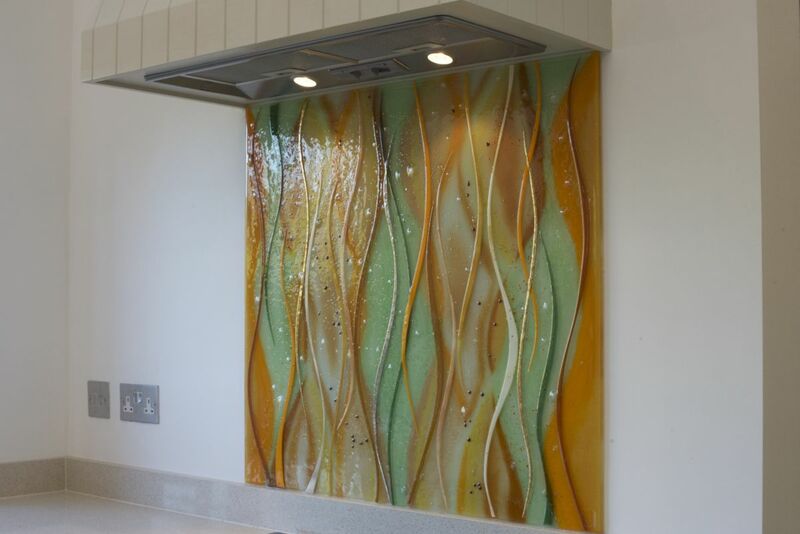 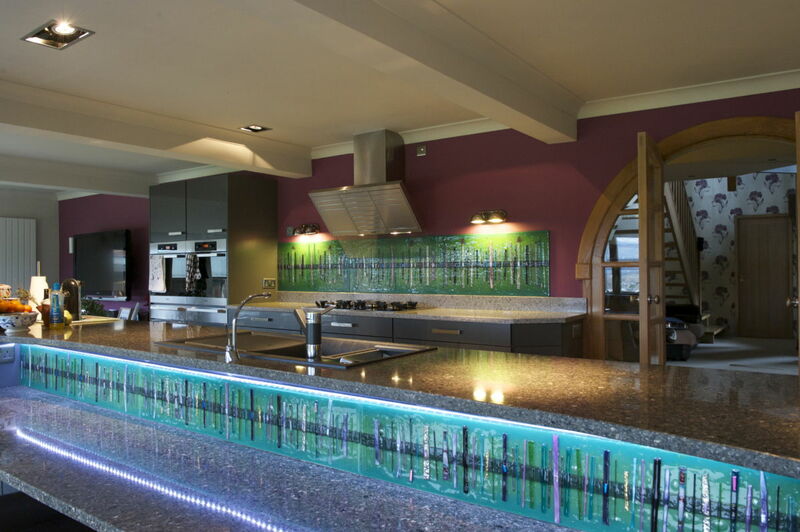 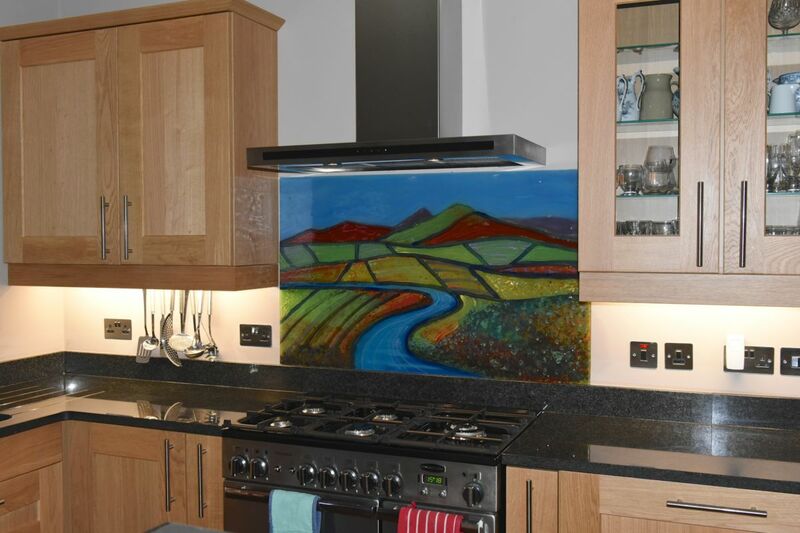 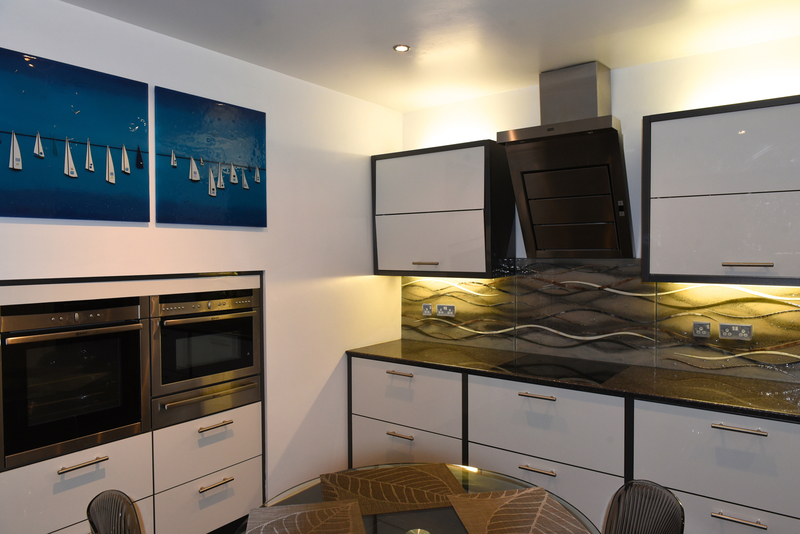 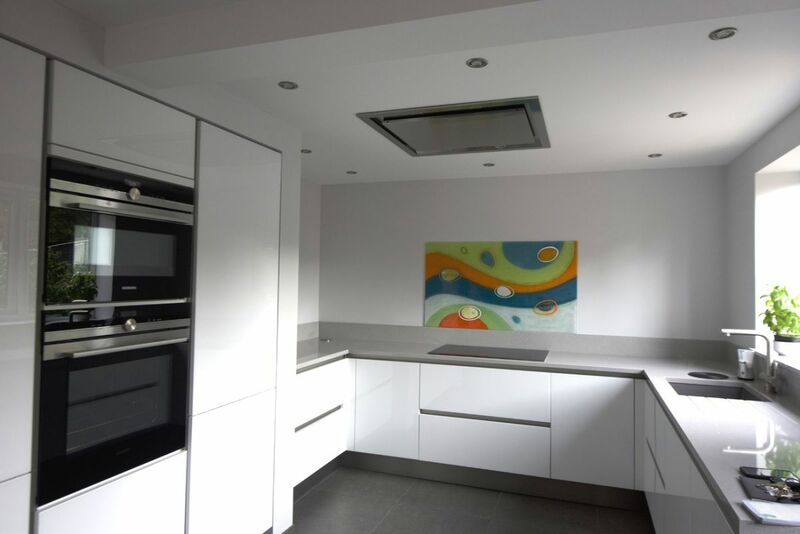 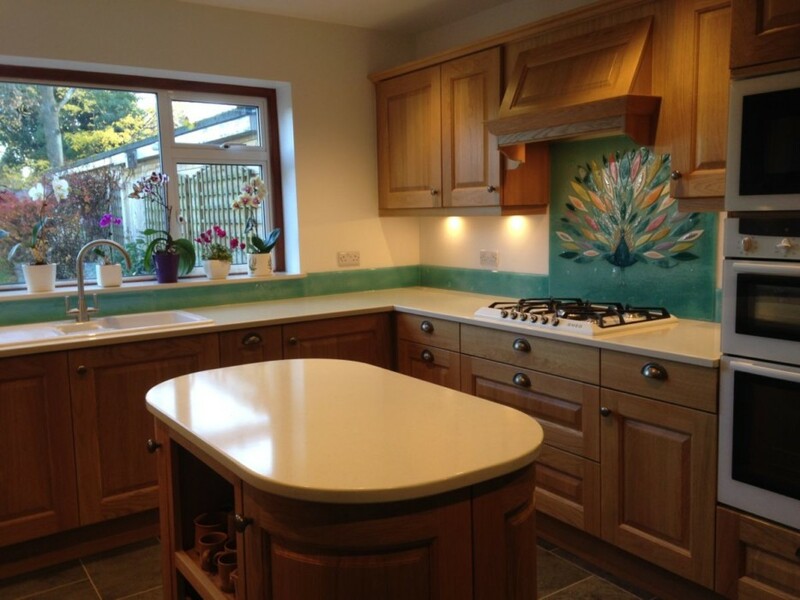 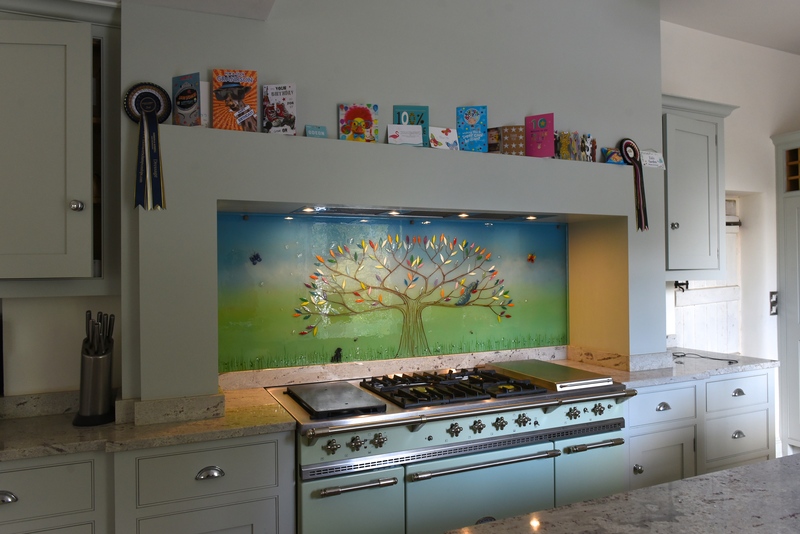 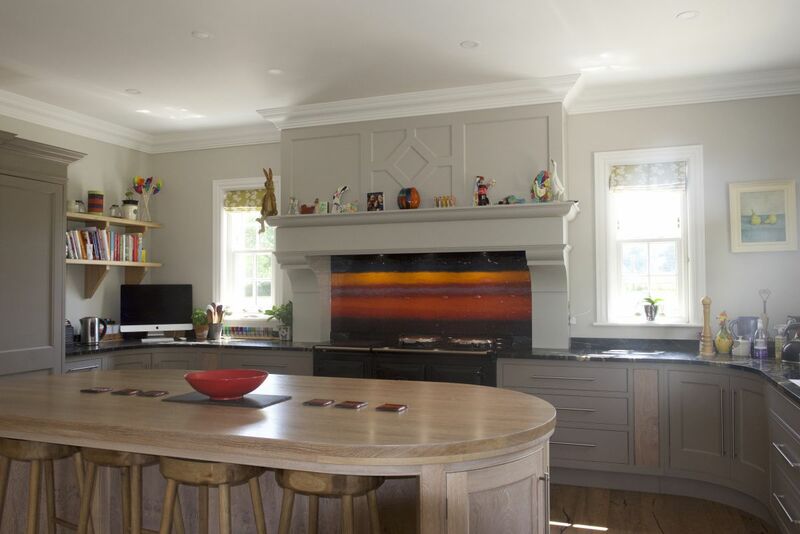 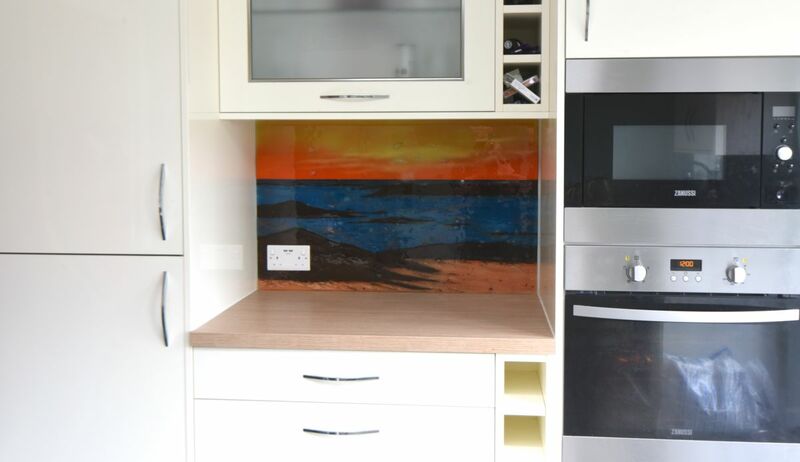 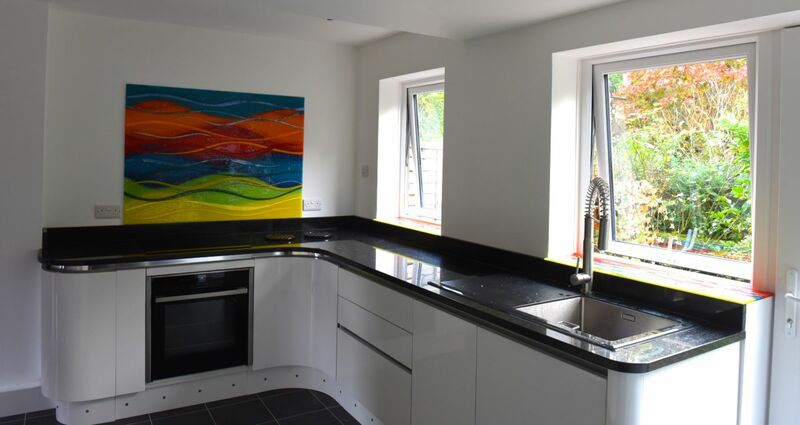 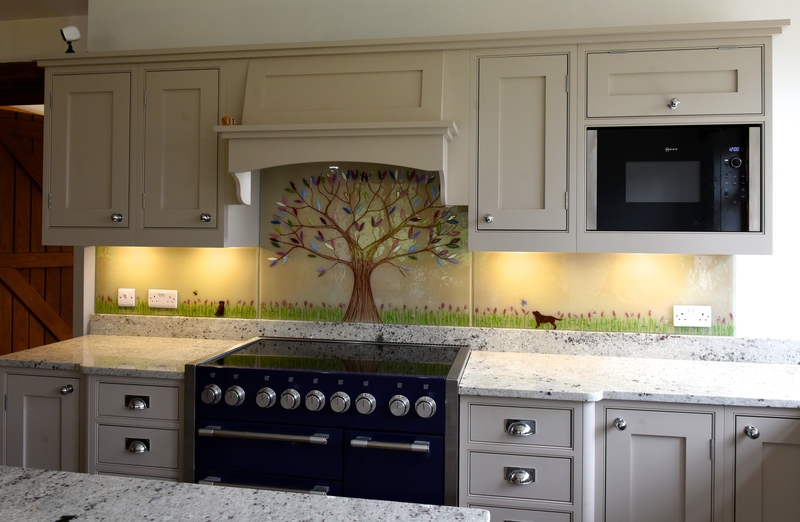 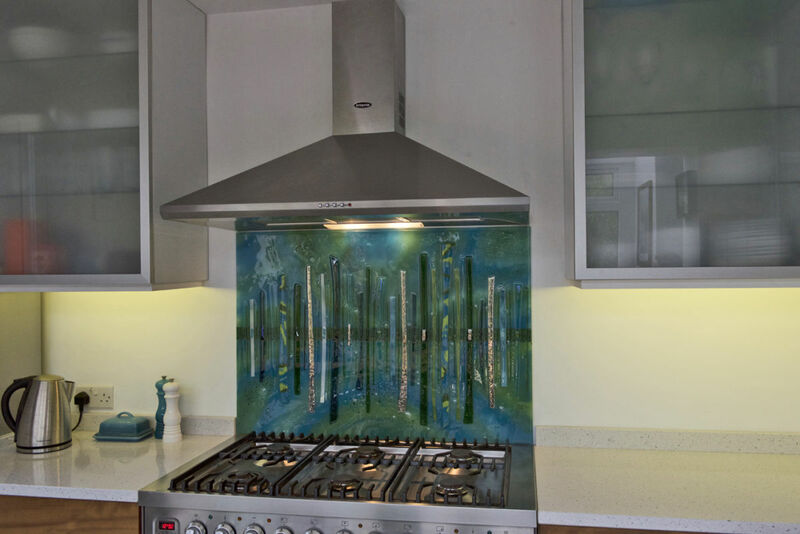 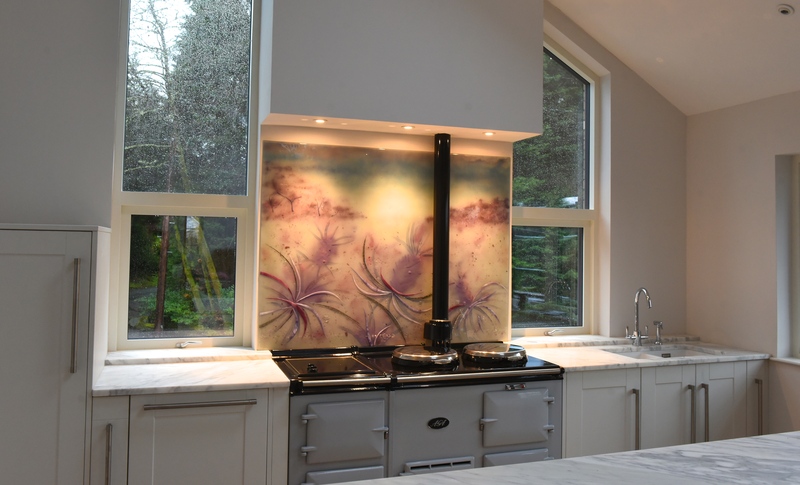 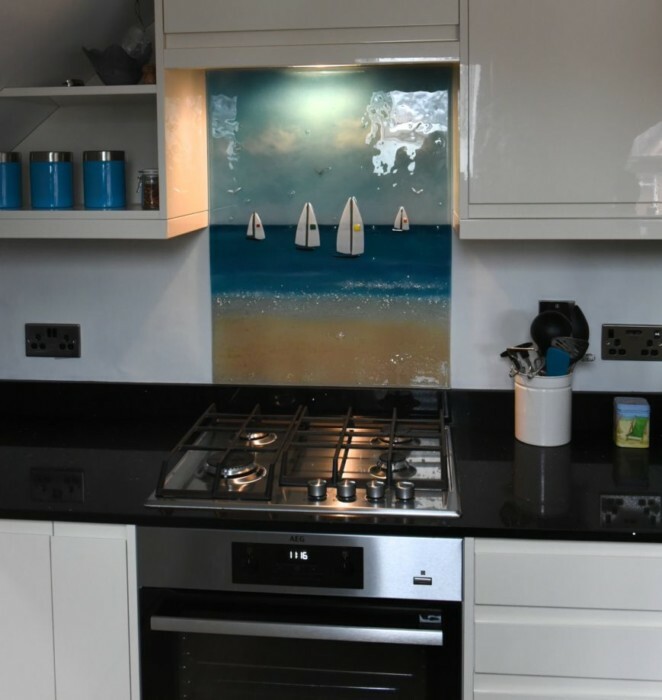 These hot colours really helped the splashback take centre stage, and it creates a centrepiece that your attention is immediately drawn to upon entering. 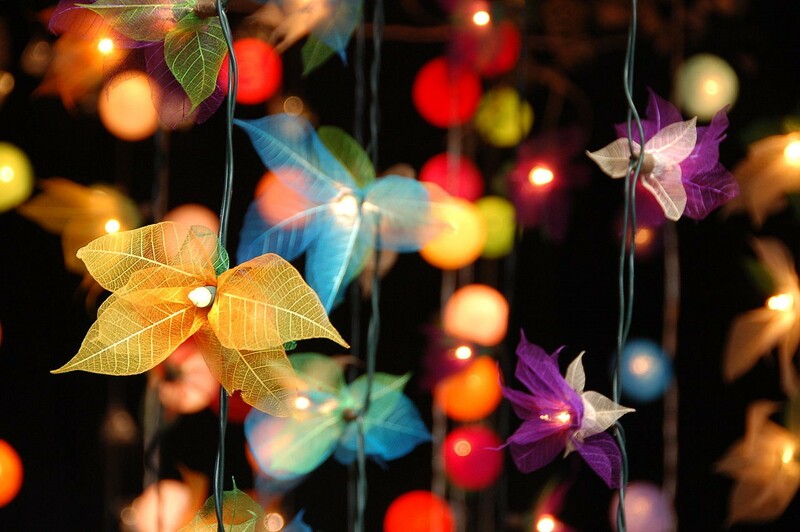 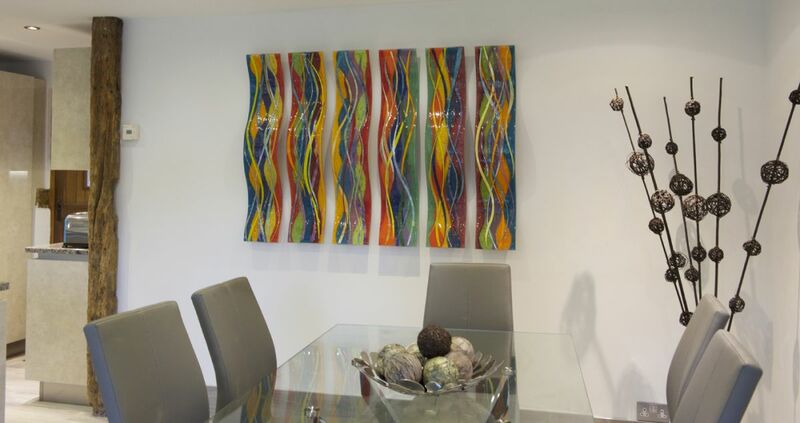 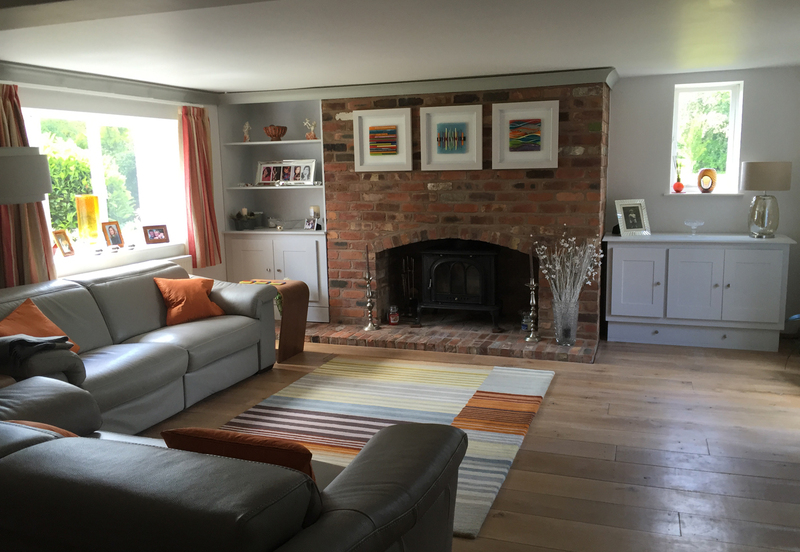 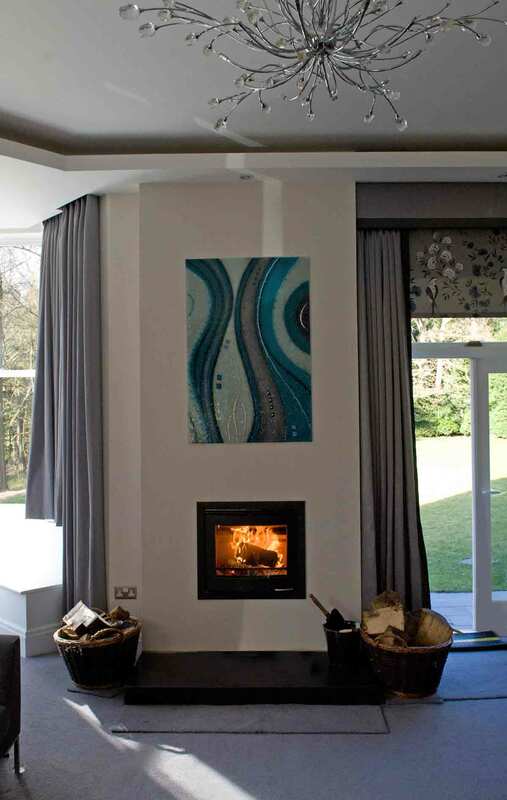 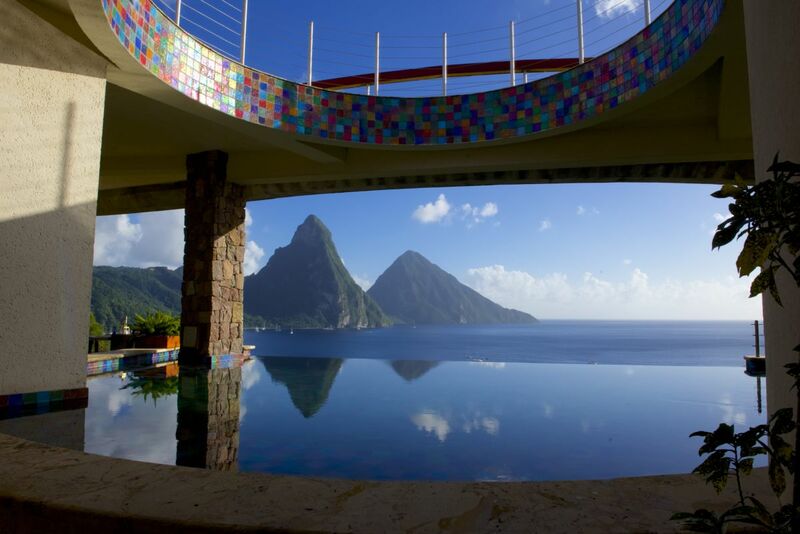 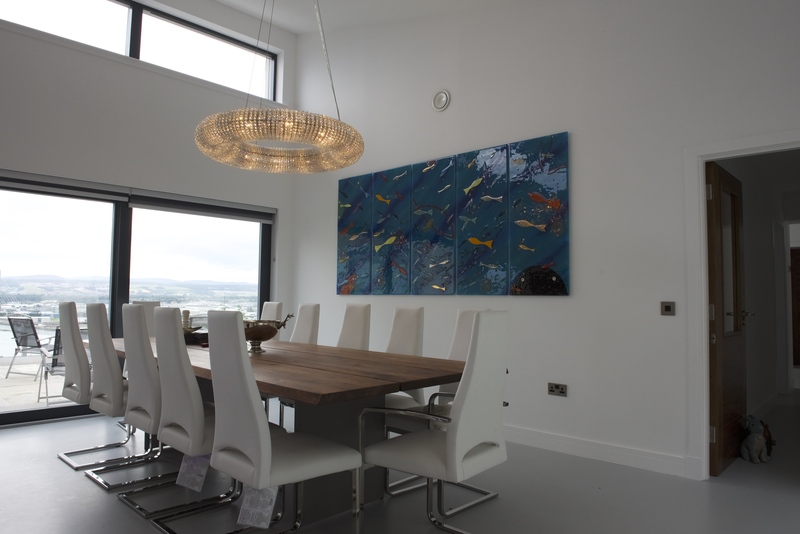 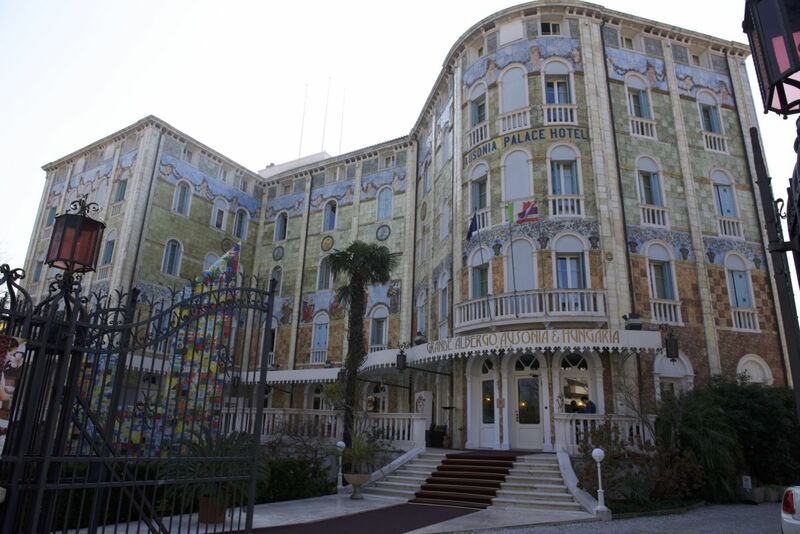 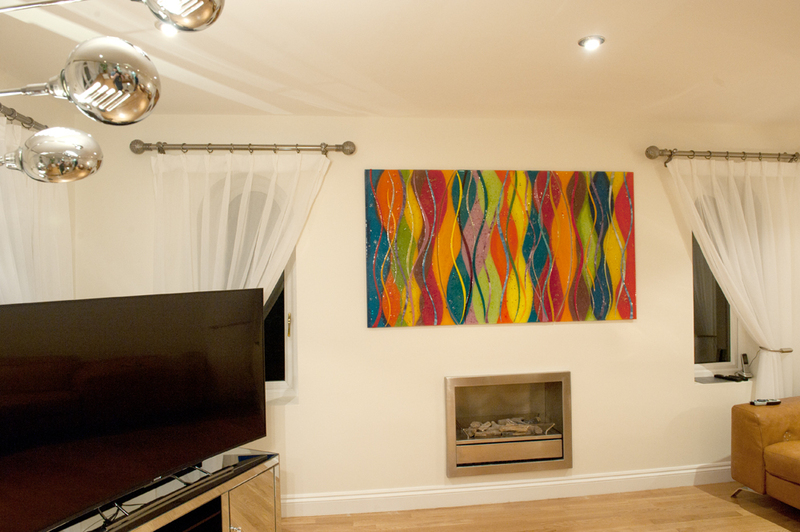 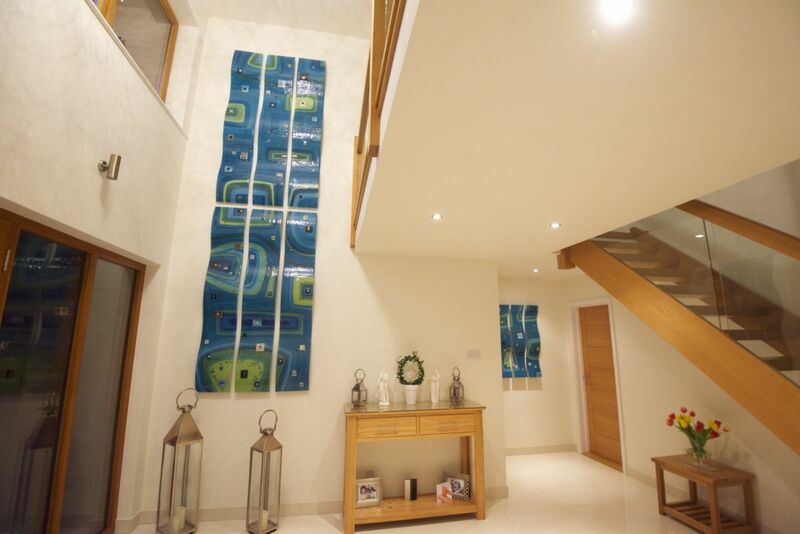 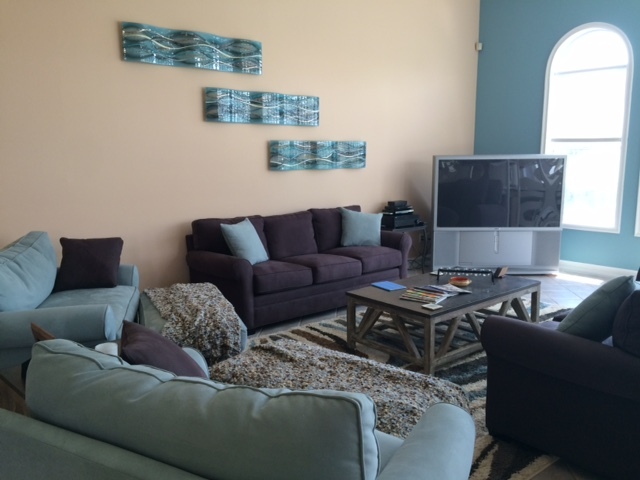 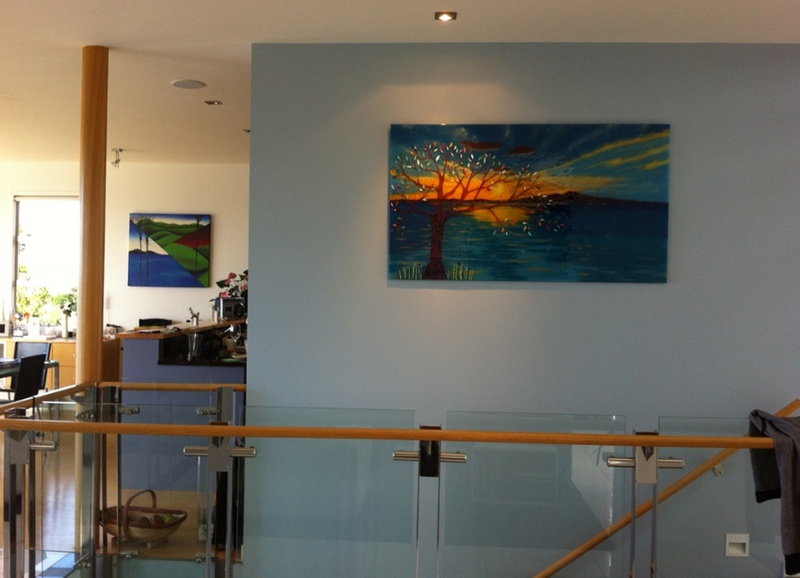 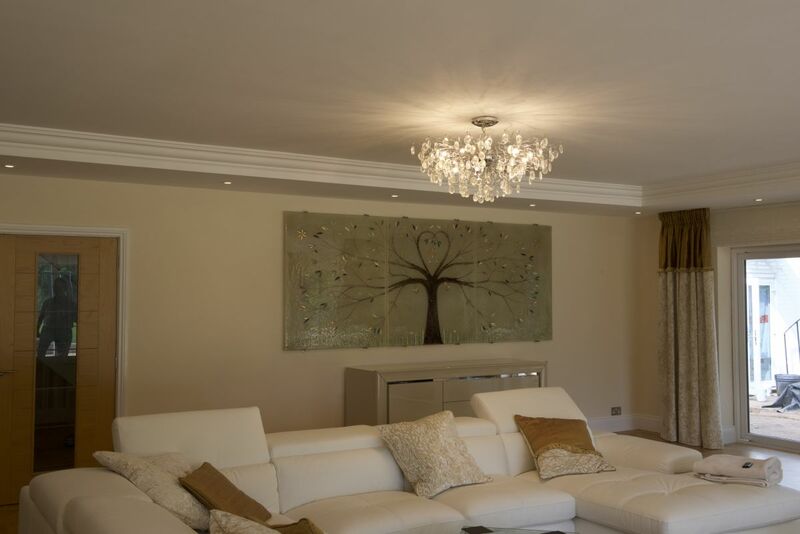 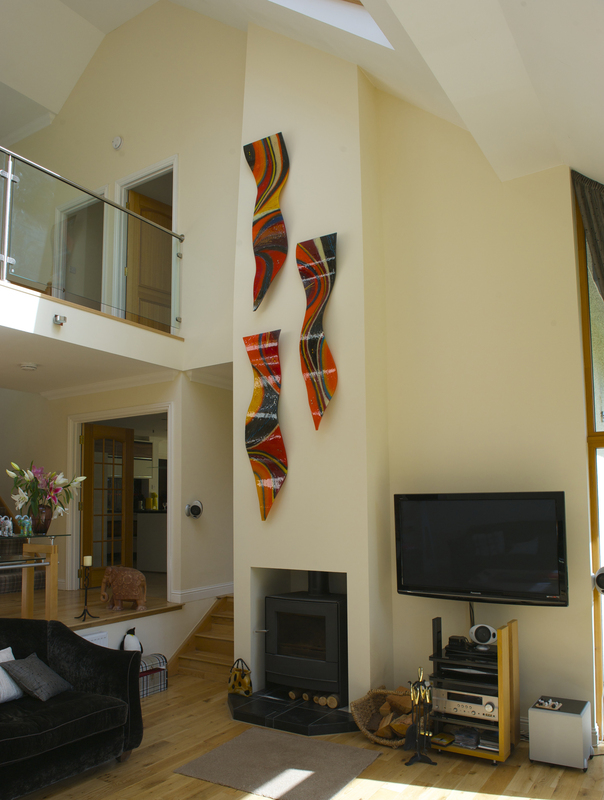 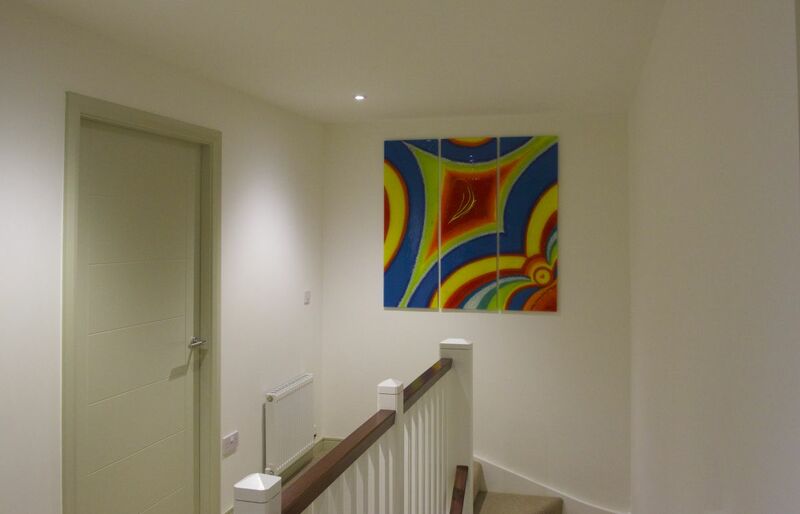 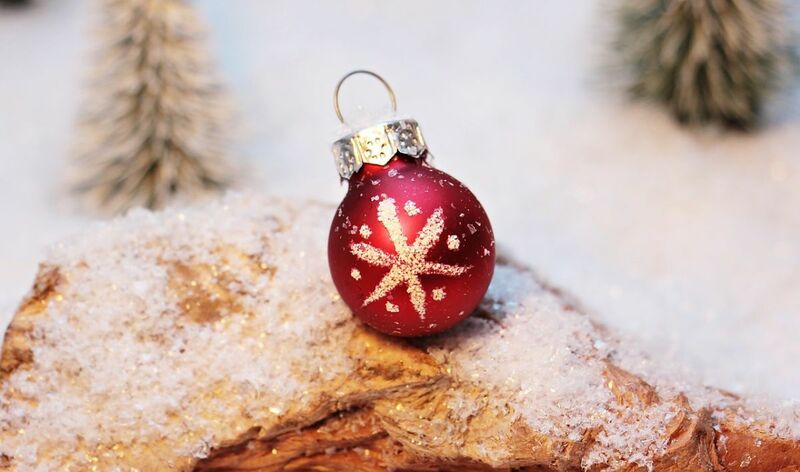 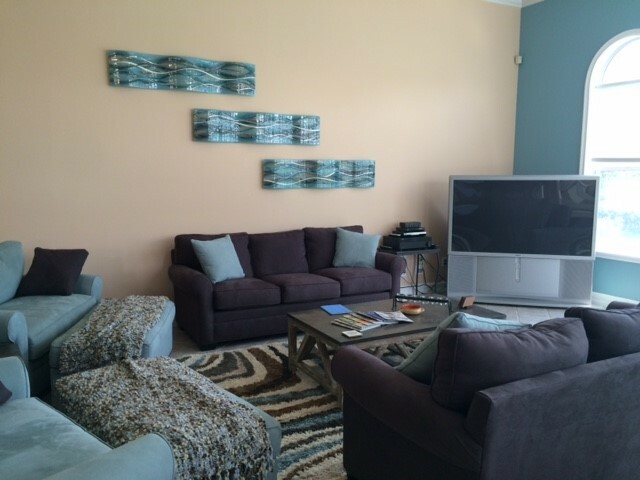 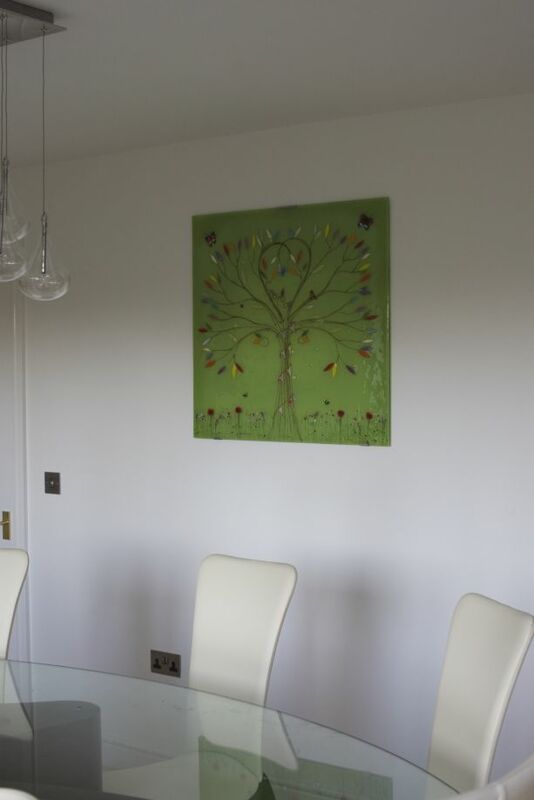 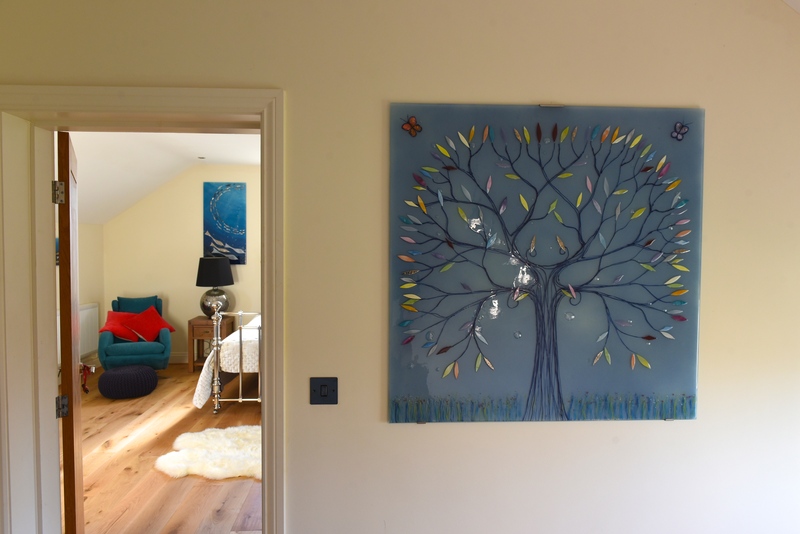 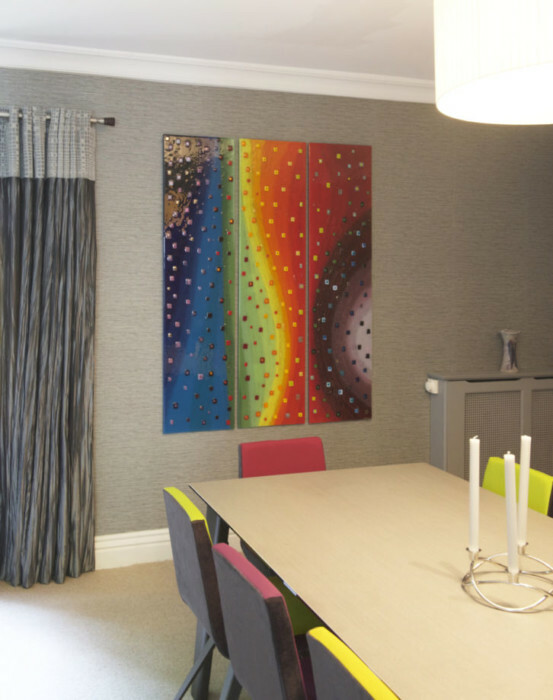 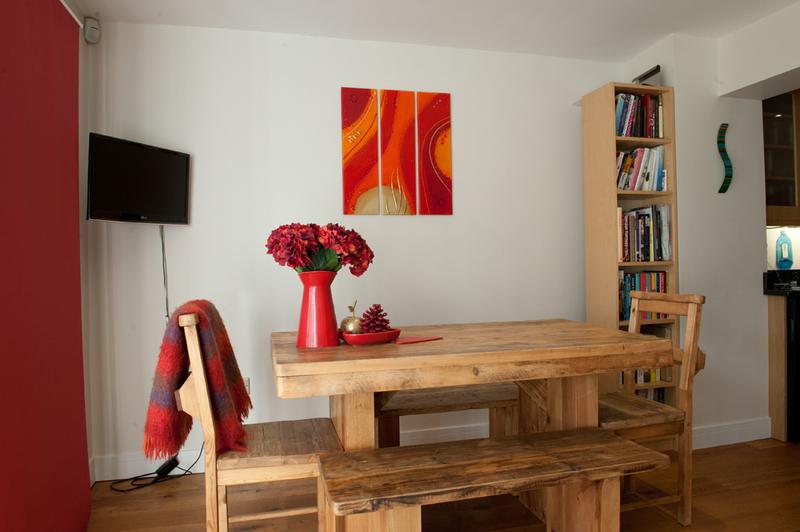 It just bursts with colour and excitement, welcoming family, friends and guests alike into the room. 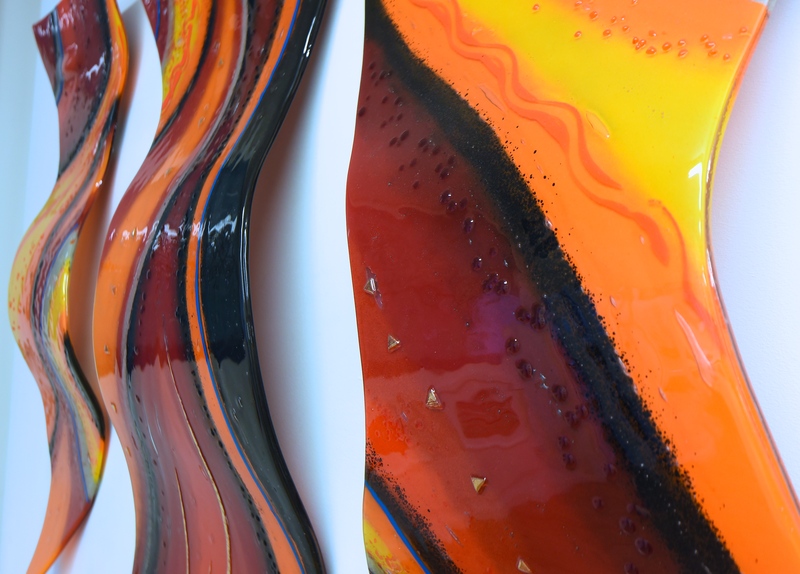 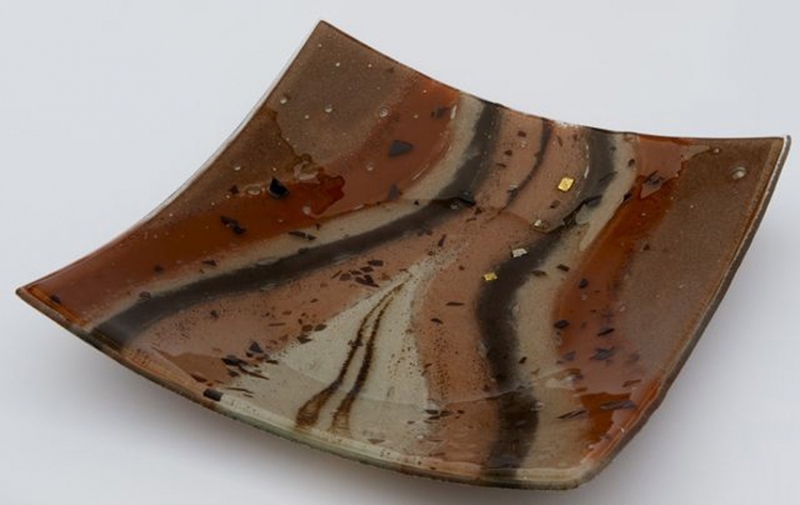 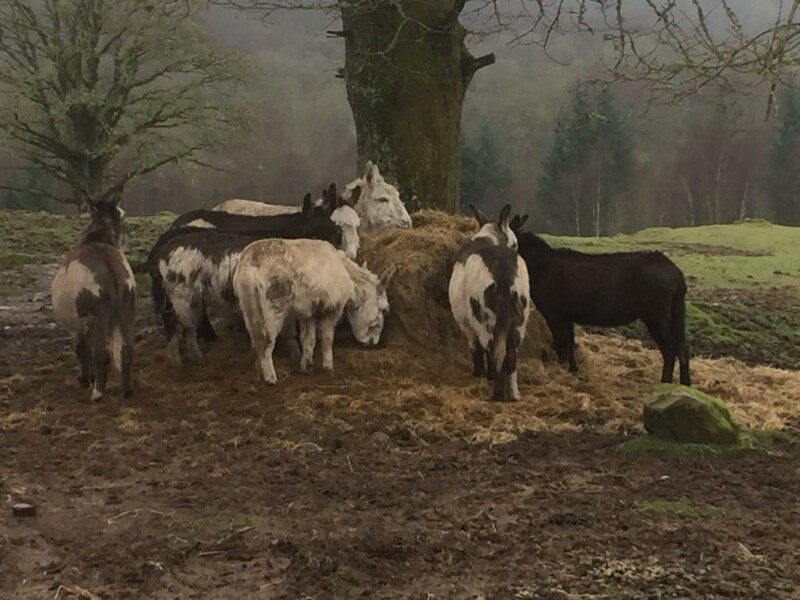 We have to say for us it evokes images of a tasty Moroccan lamb tagine complete with apricots, though we imagine the colours of the piece will inspire some very creative dishes in the future. 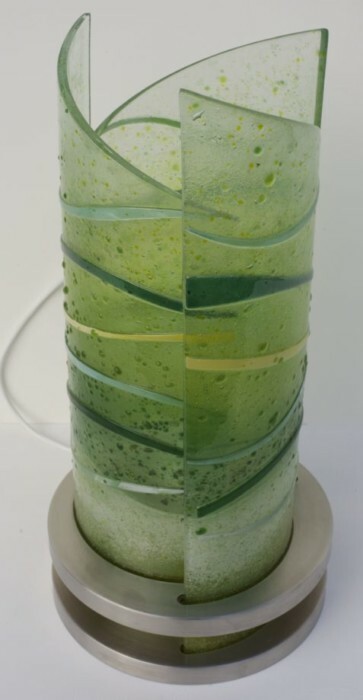 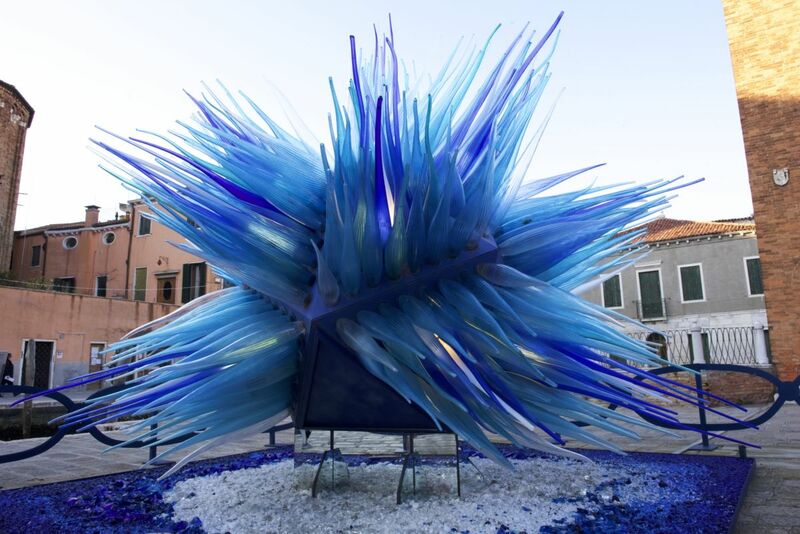 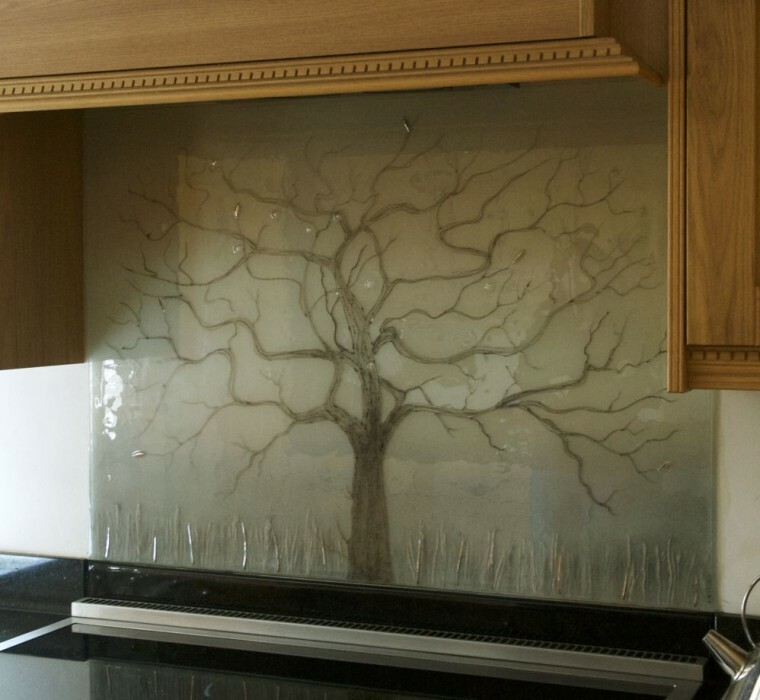 We’re not sure if there’s another piece of glass that makes us as hungry as this one does! 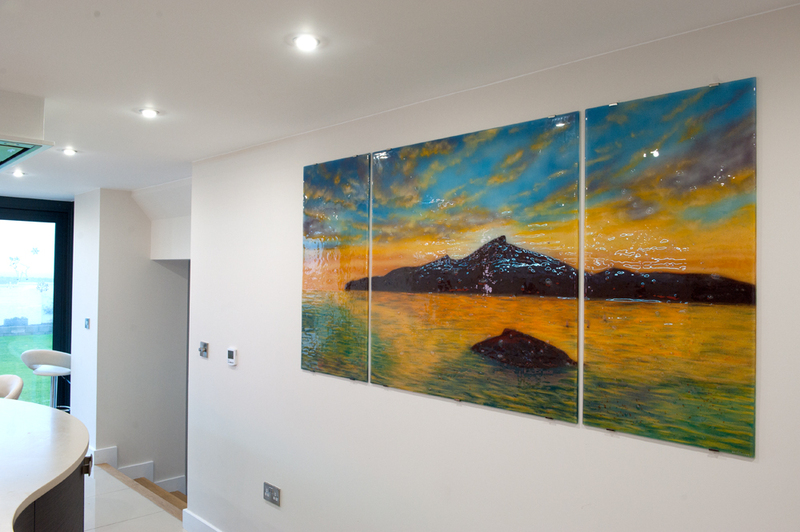 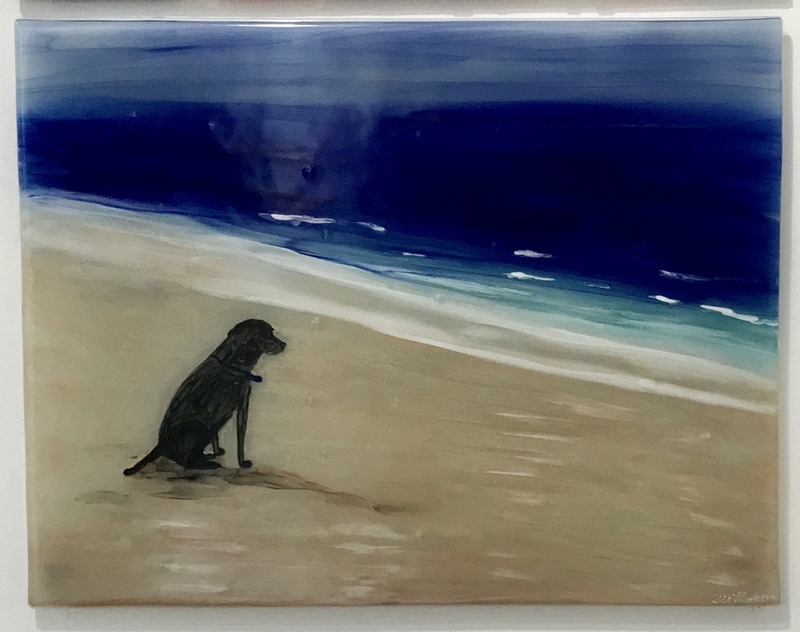 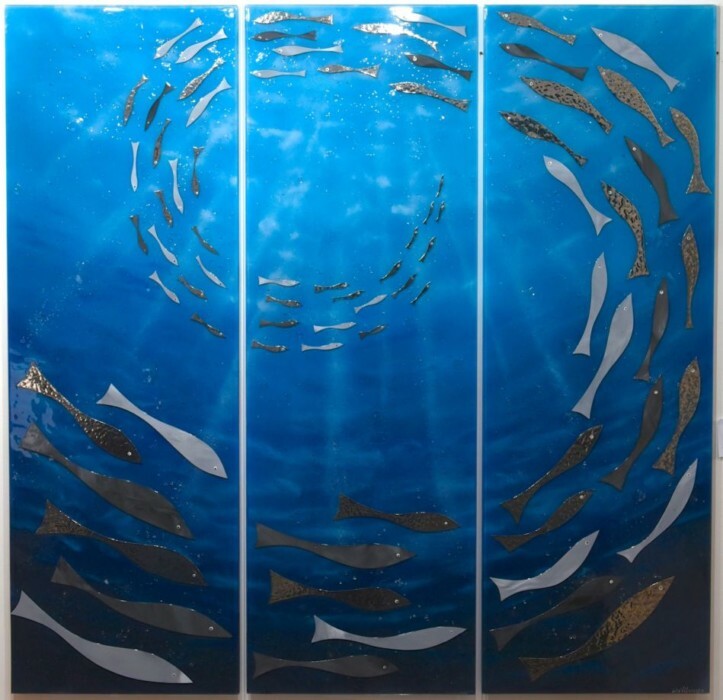 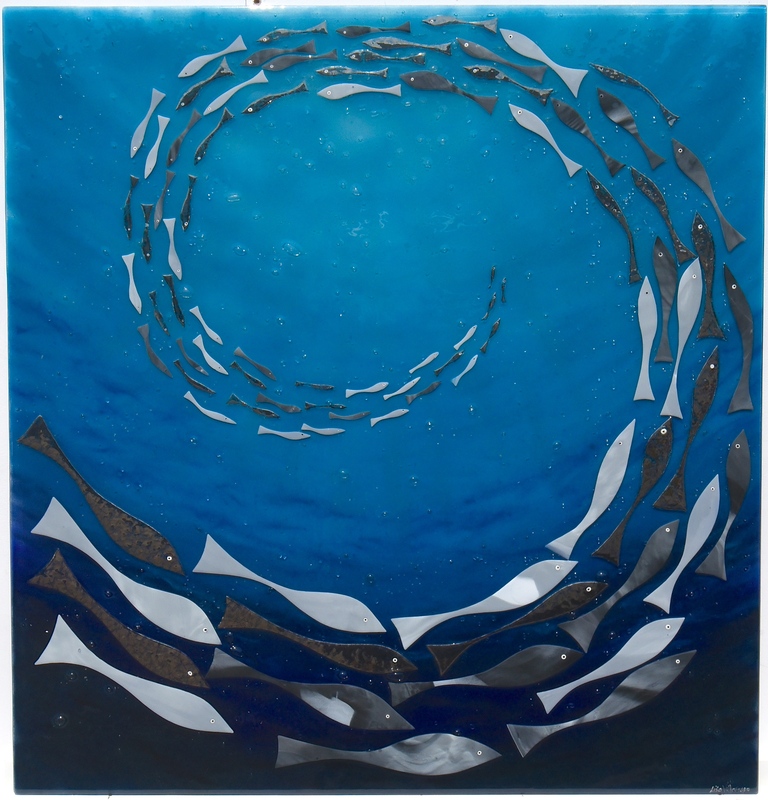 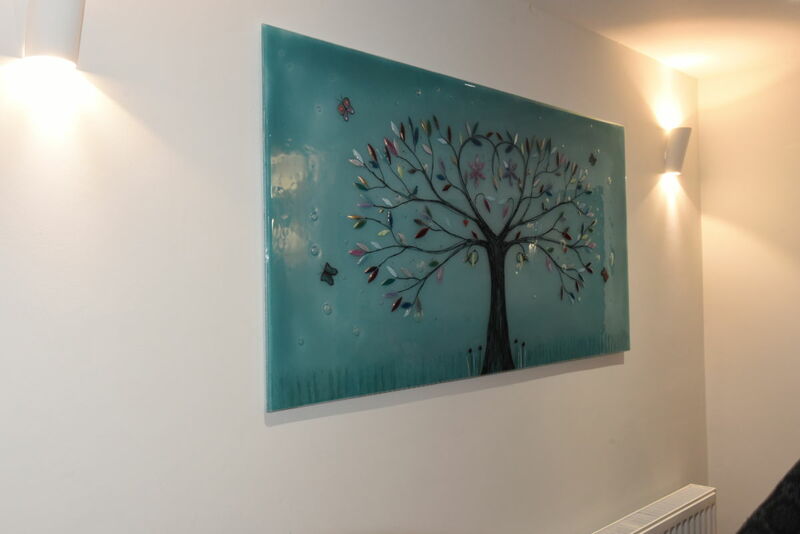 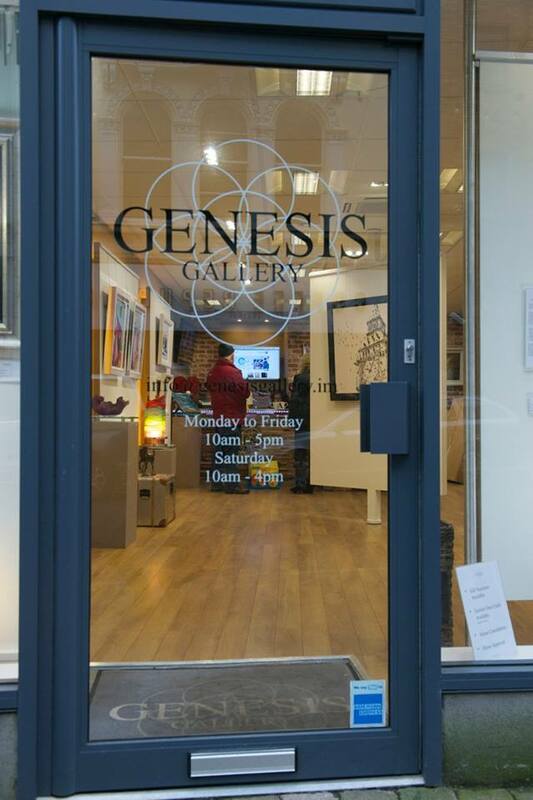 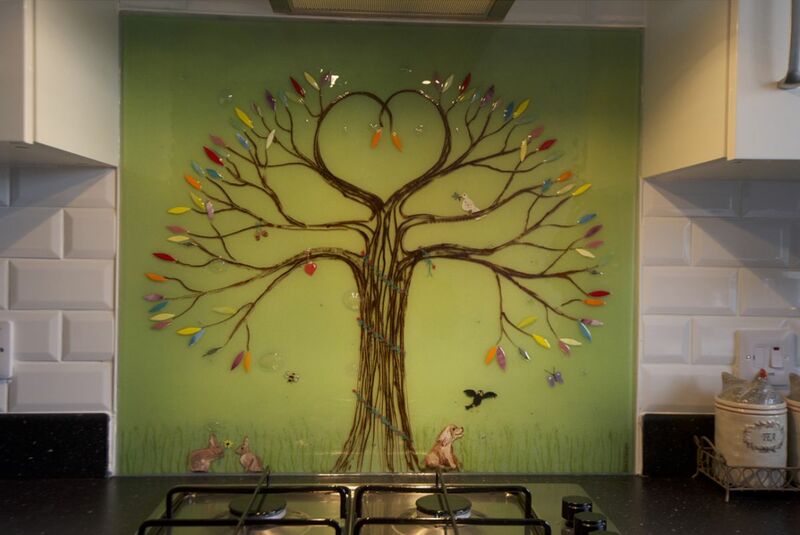 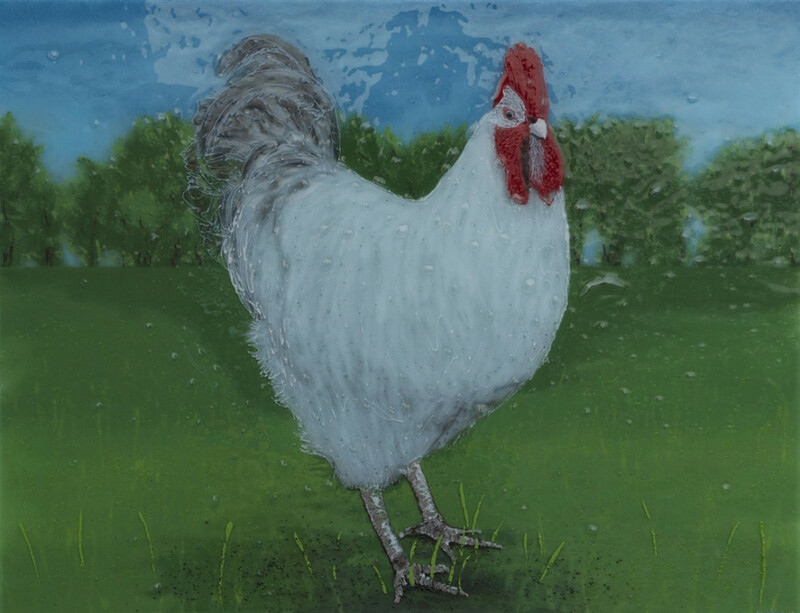 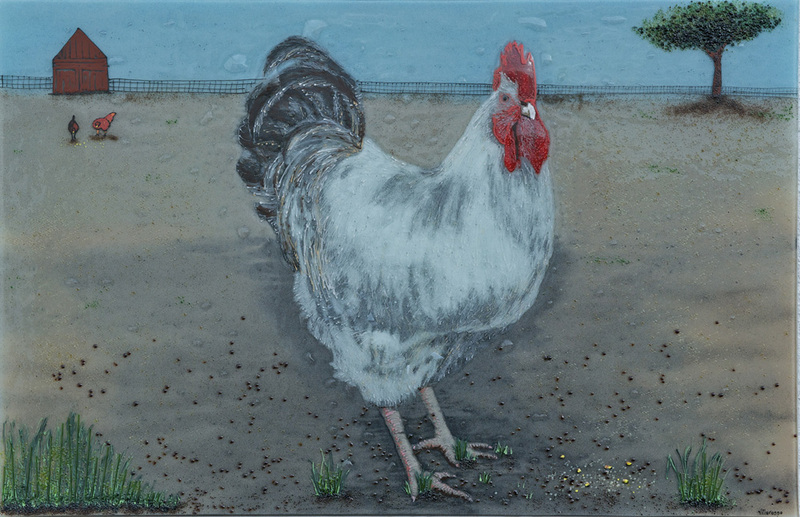 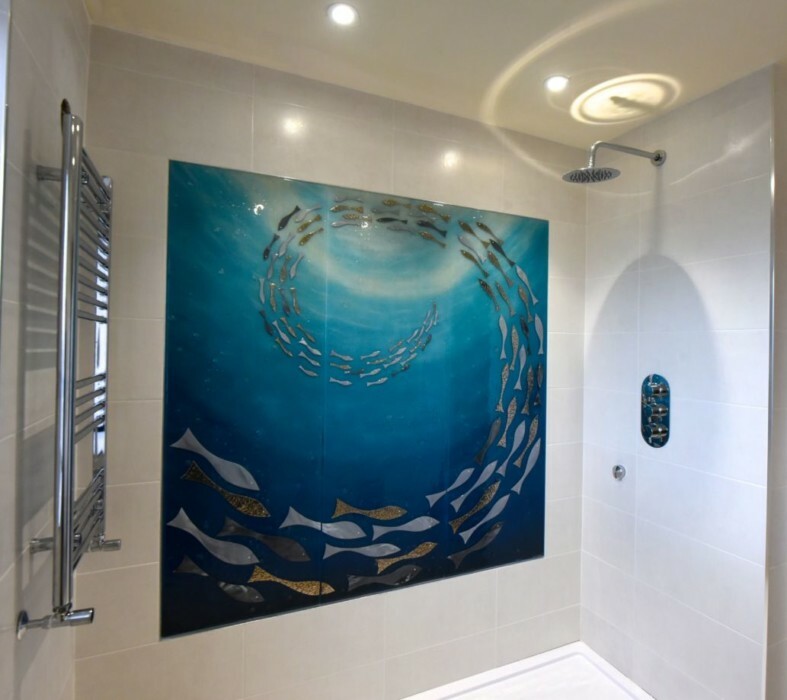 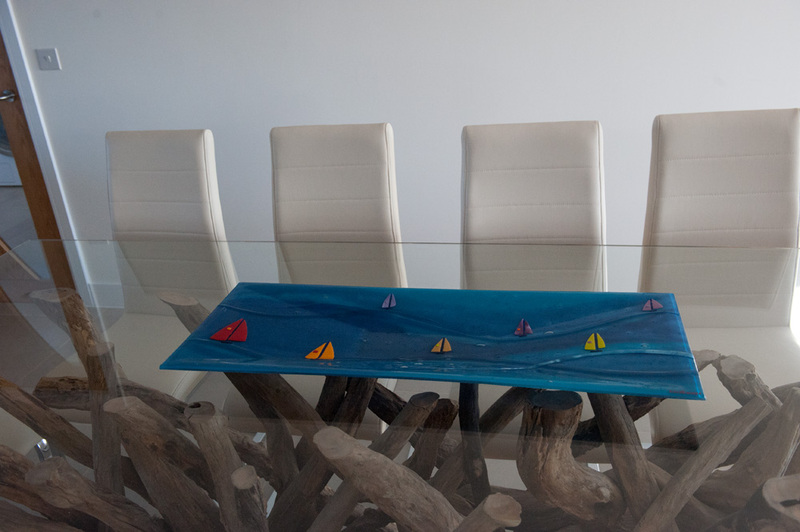 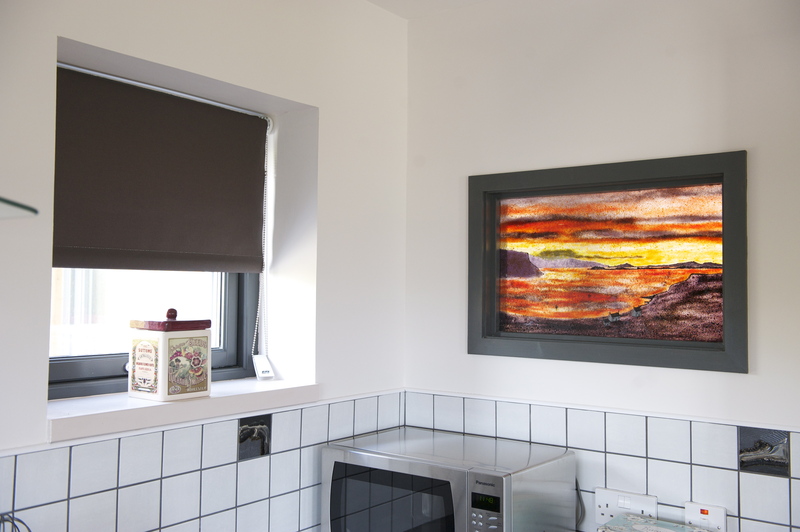 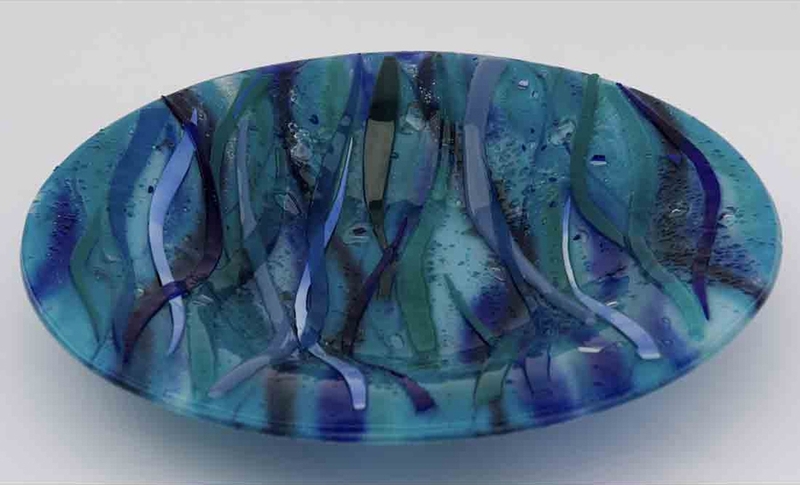 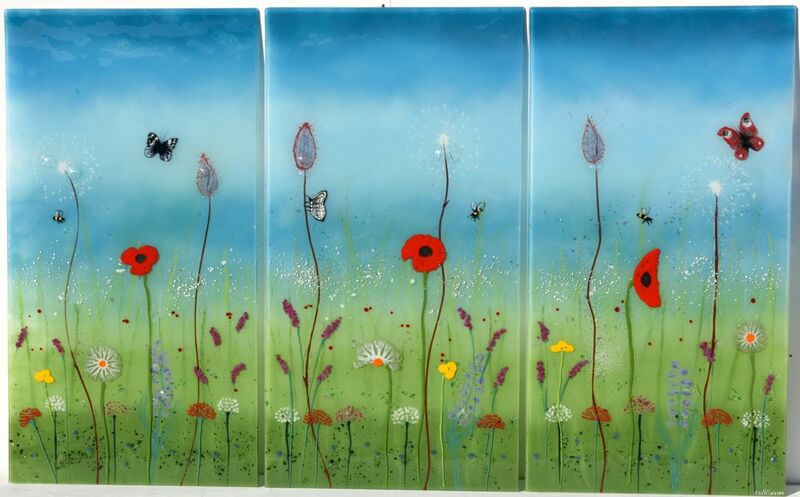 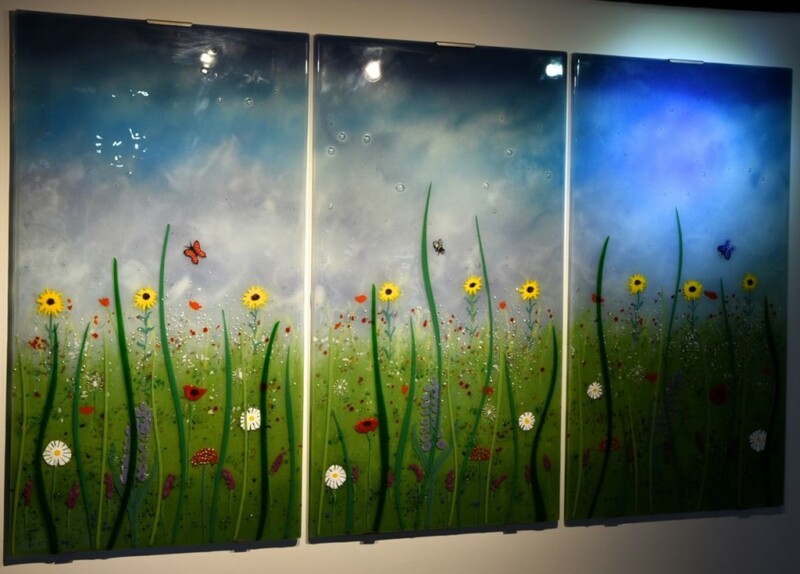 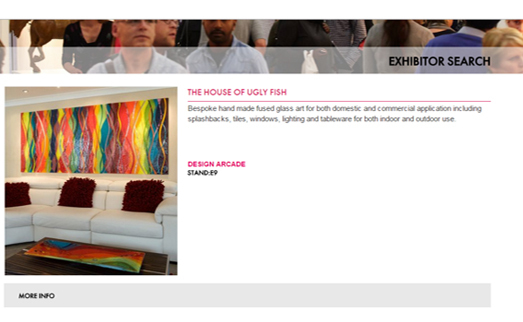 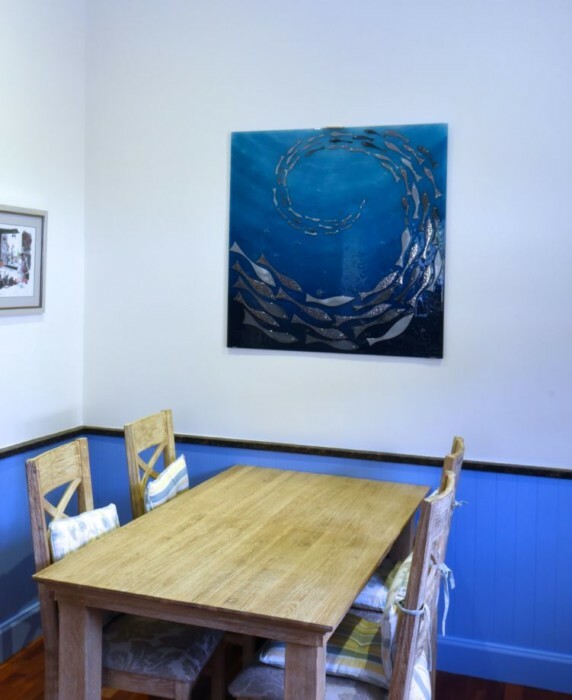 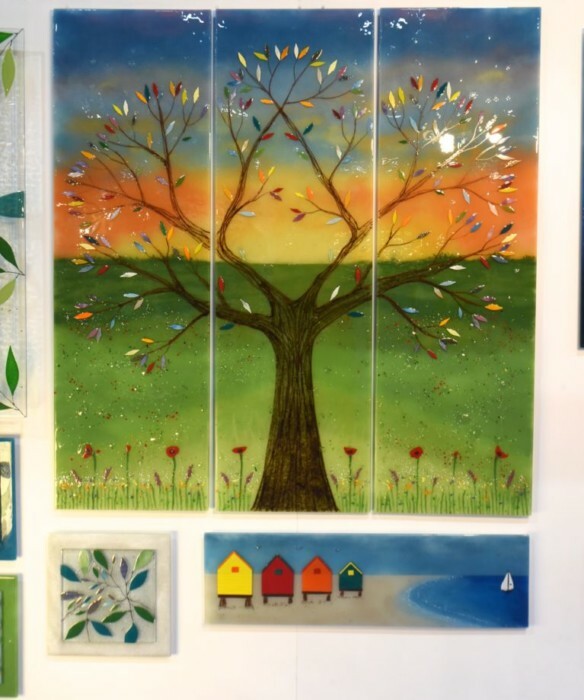 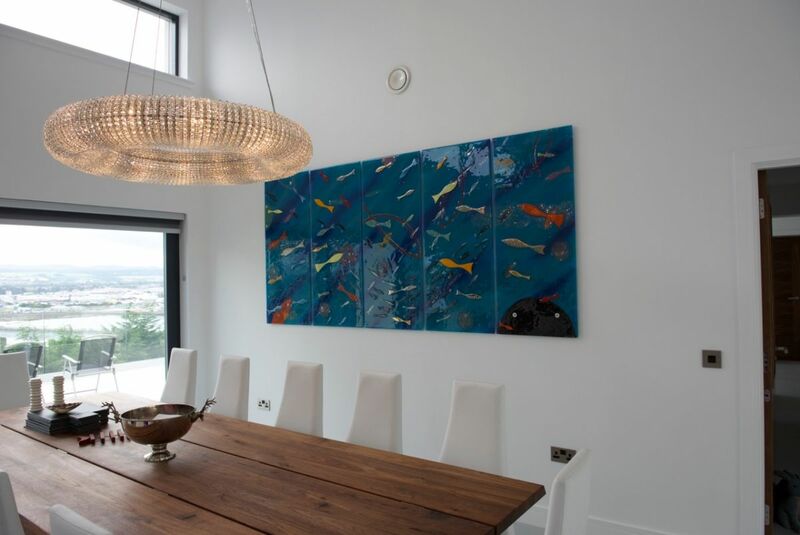 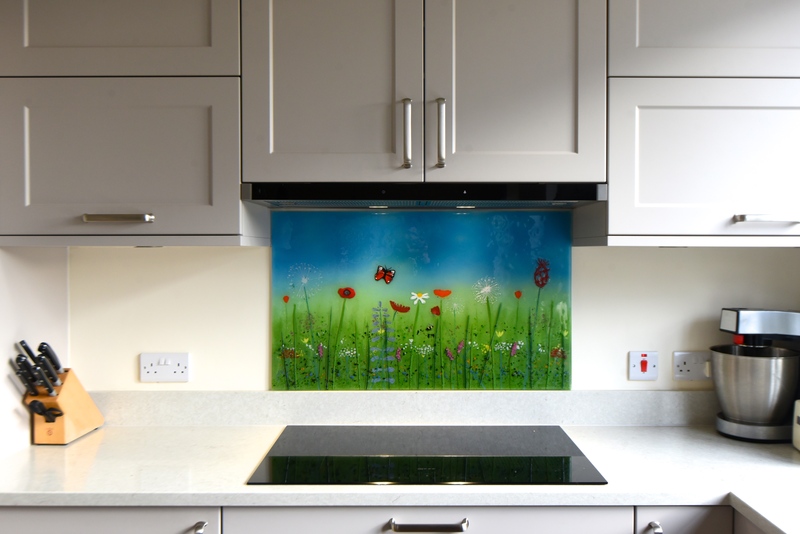 If you’re looking to get your hands on some seriously stunning fused glass art, then we here at The House of Ugly Fish would love to hear from you as soon as possible! 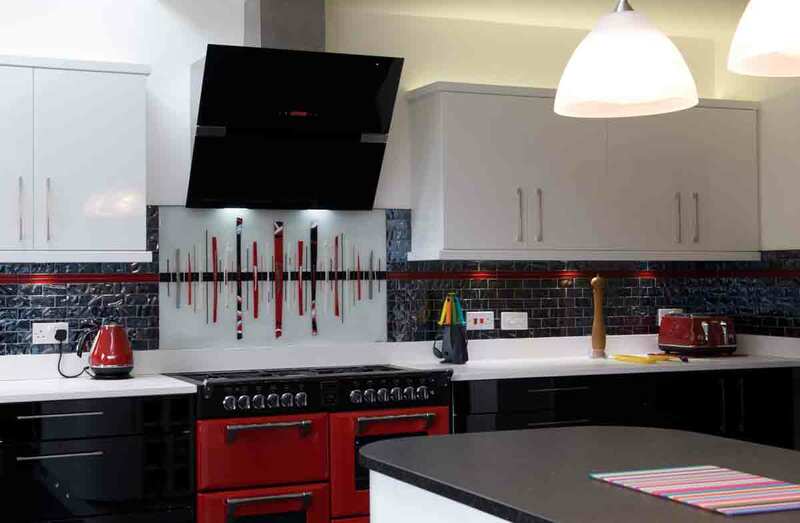 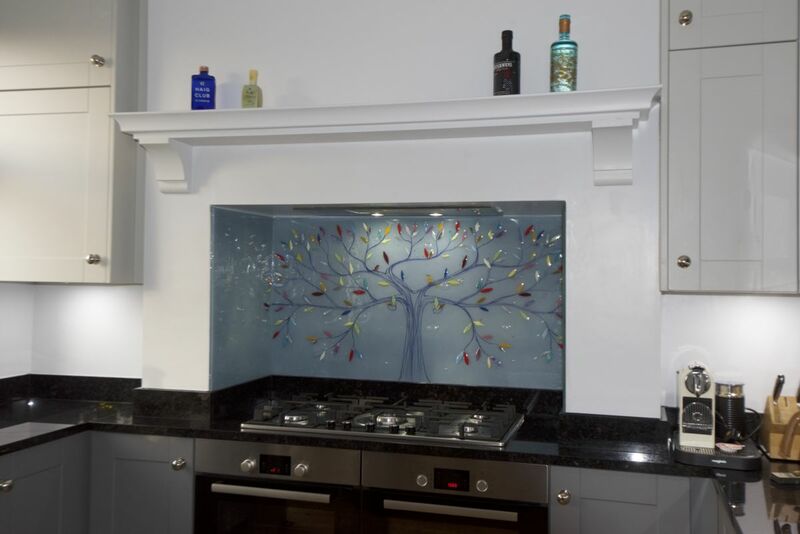 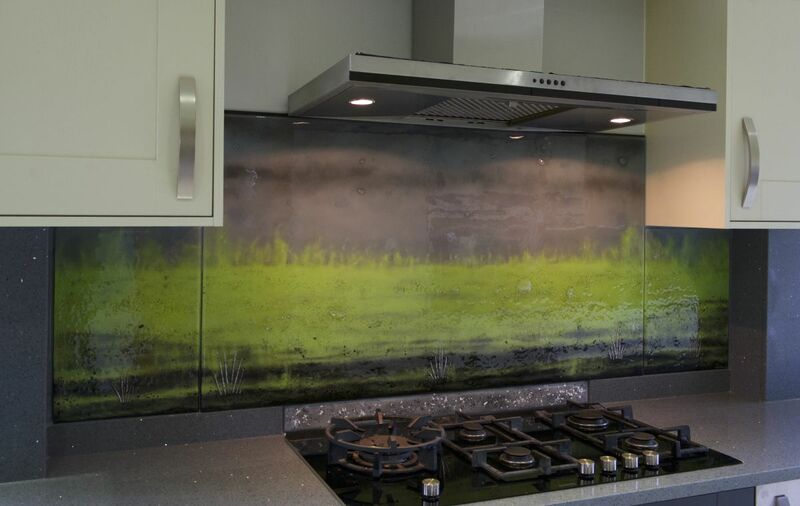 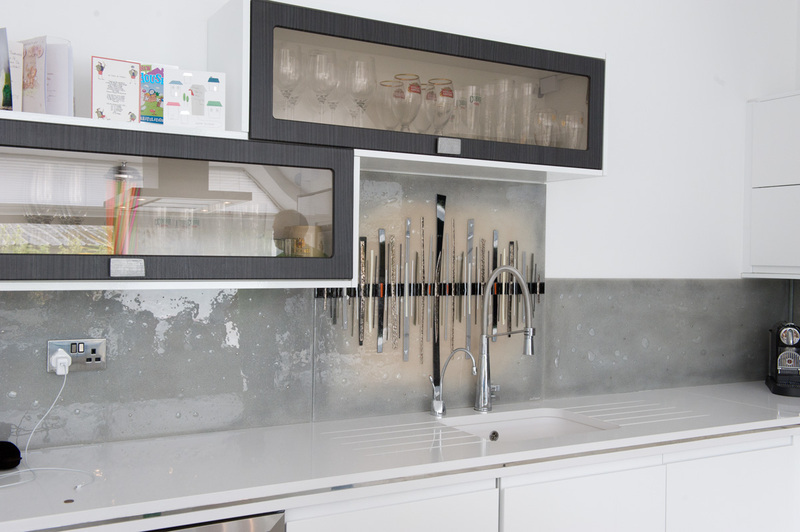 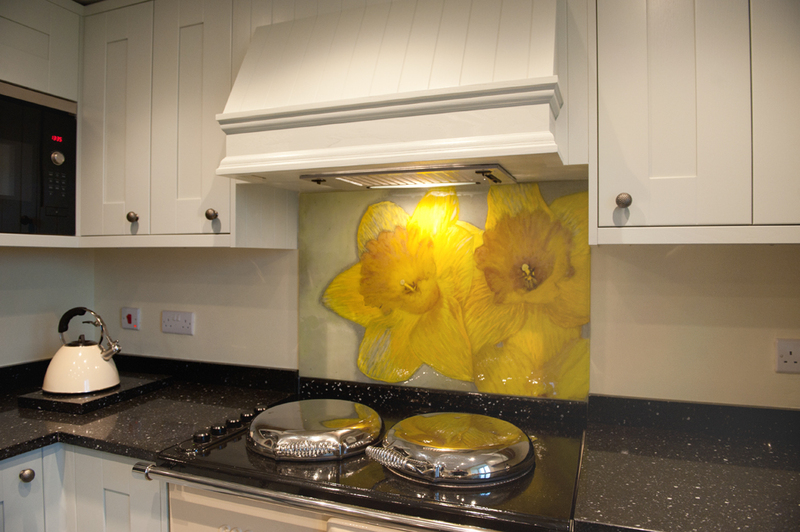 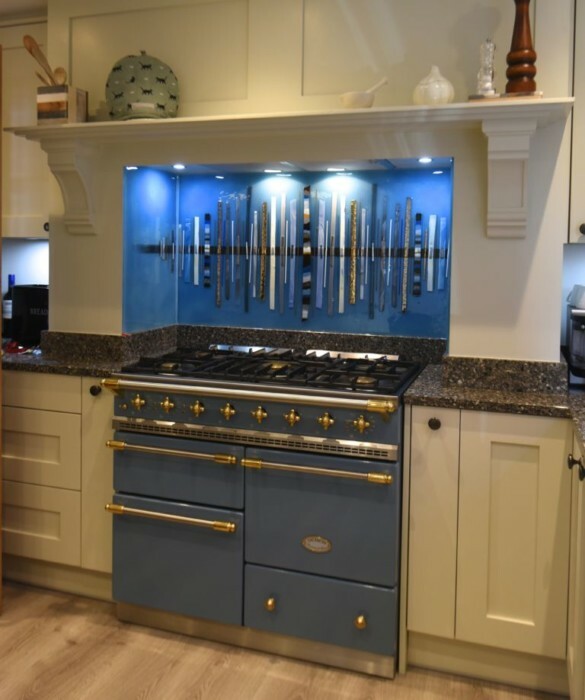 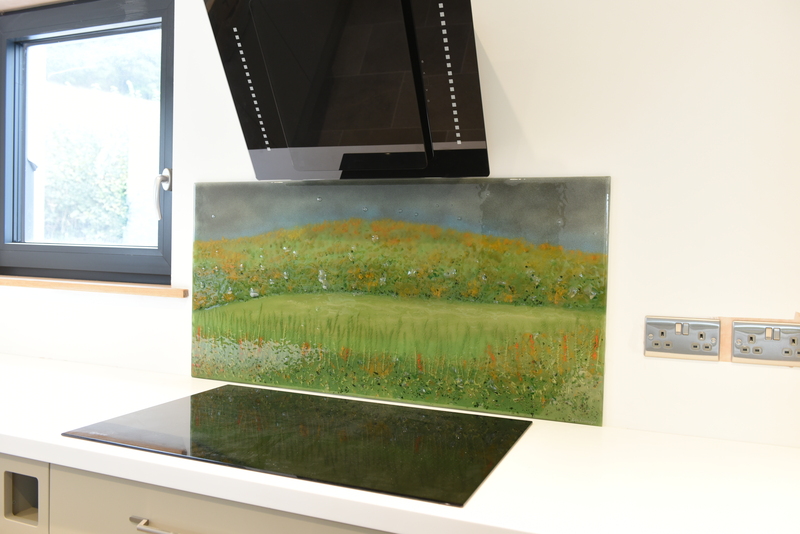 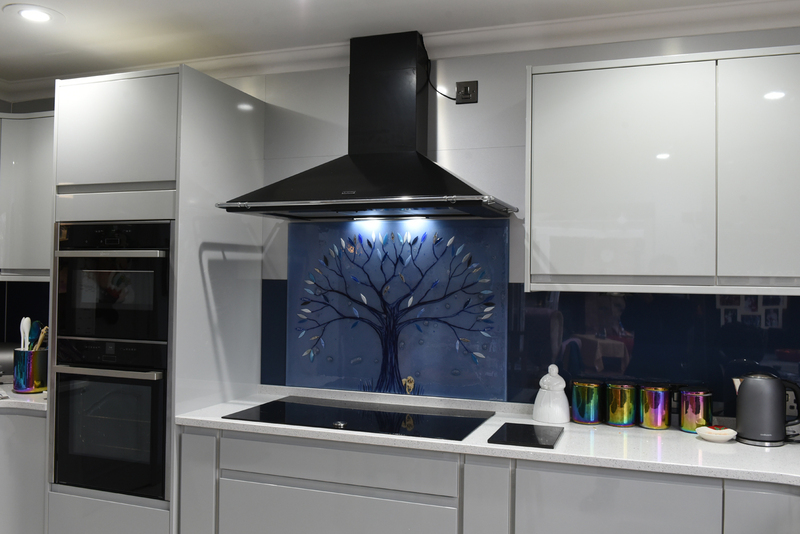 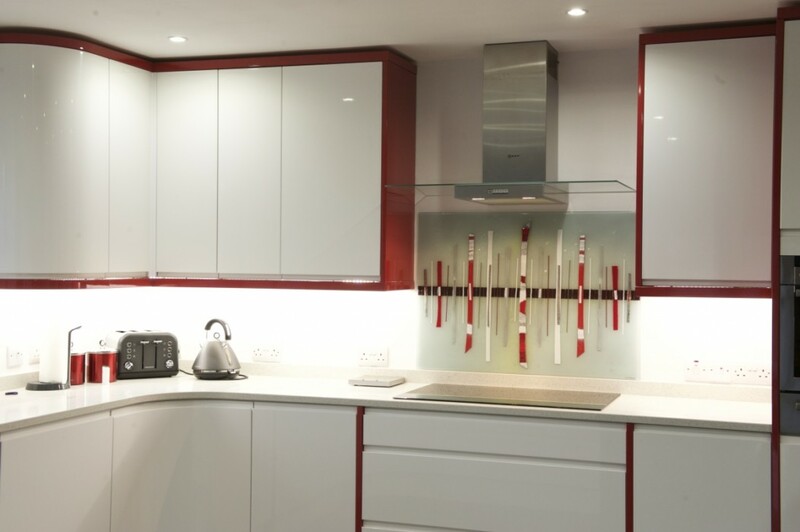 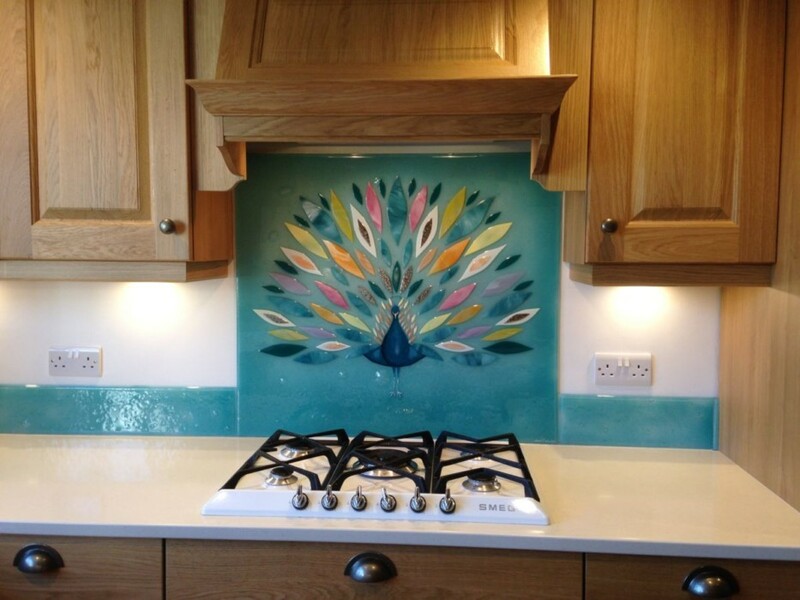 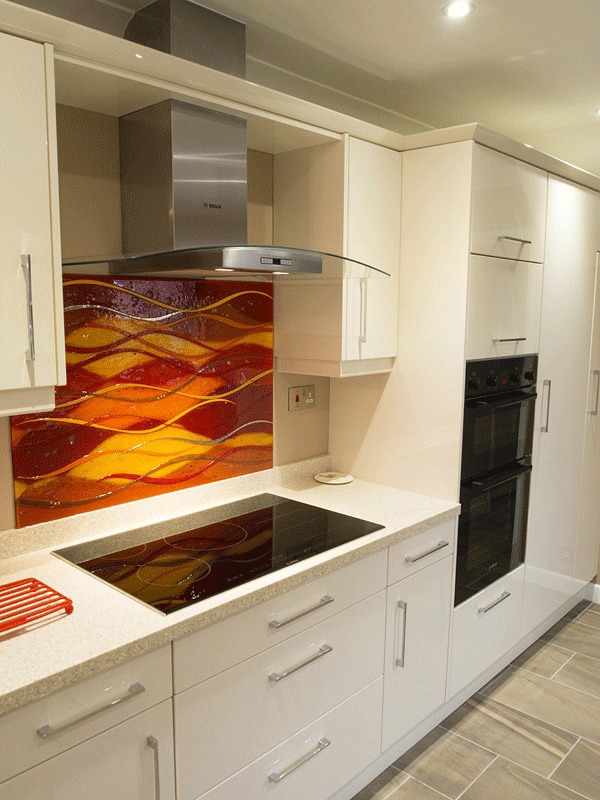 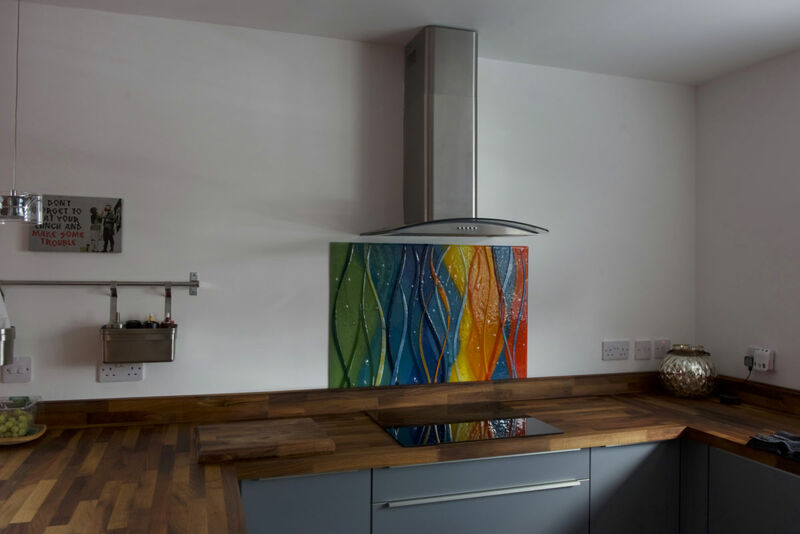 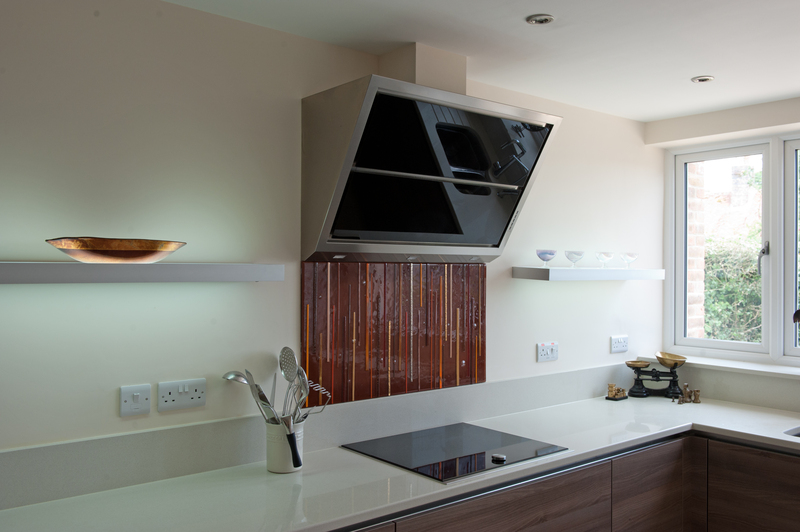 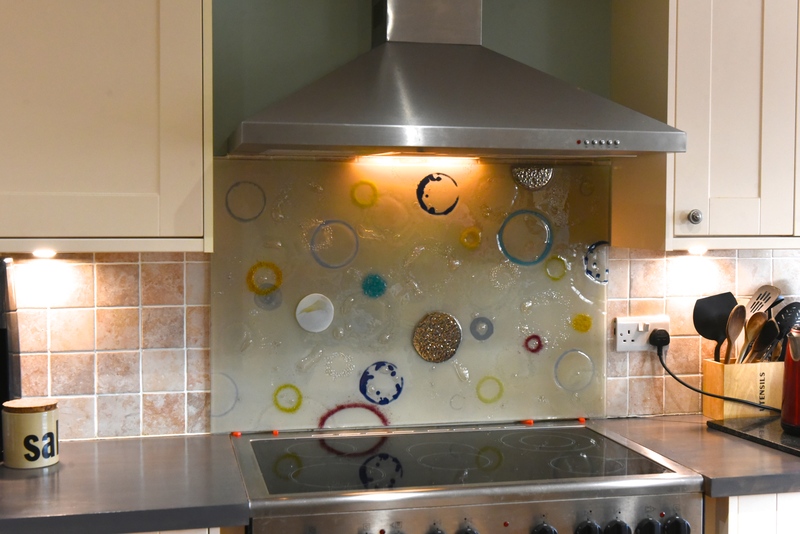 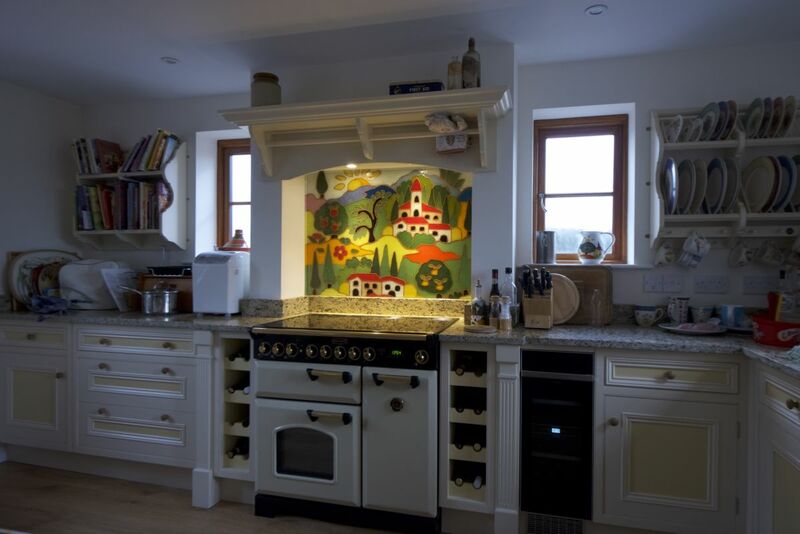 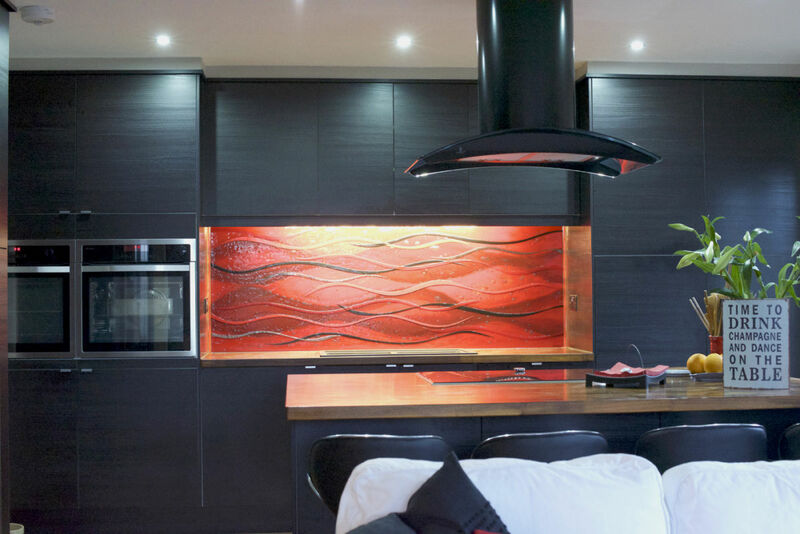 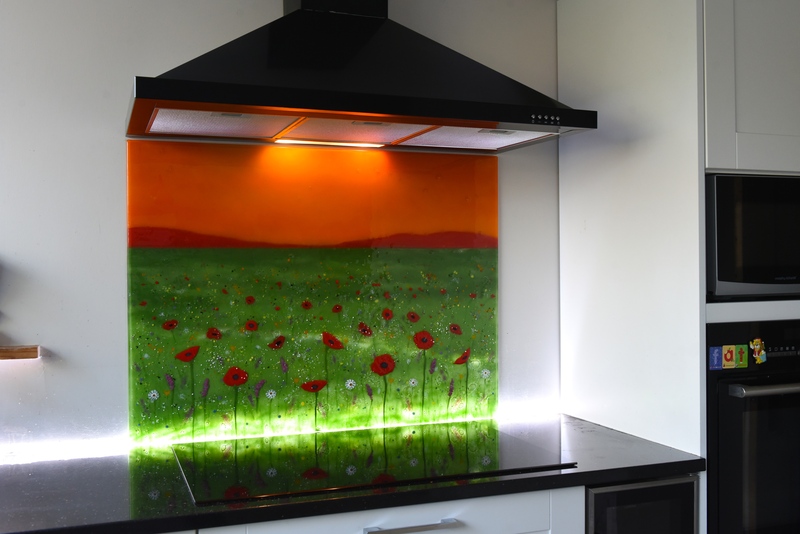 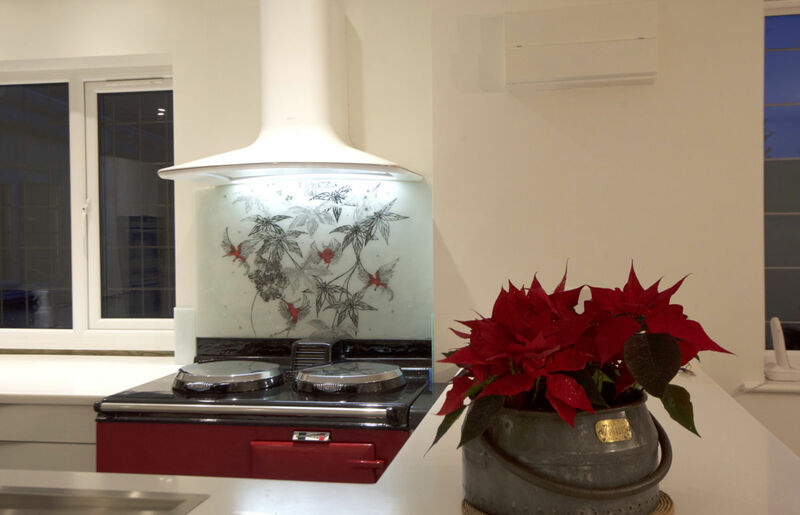 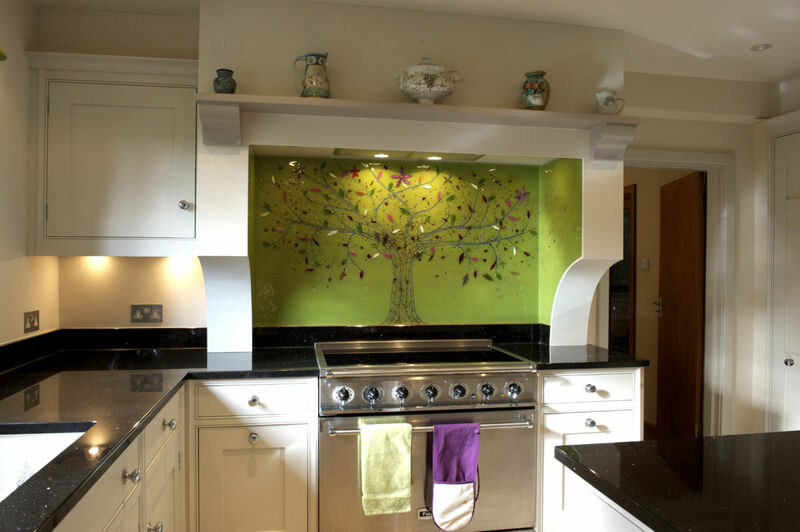 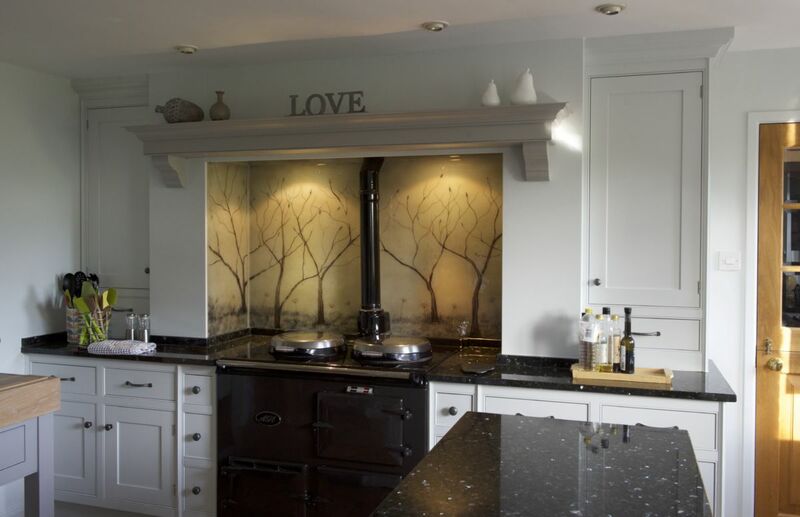 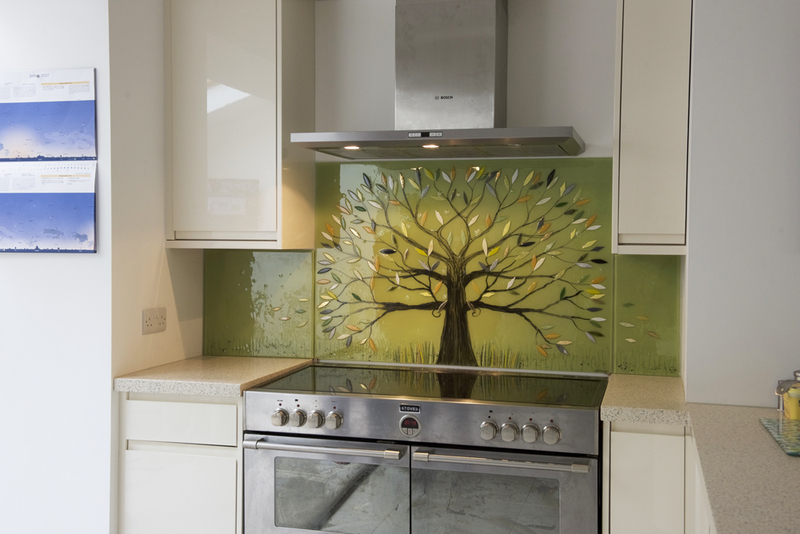 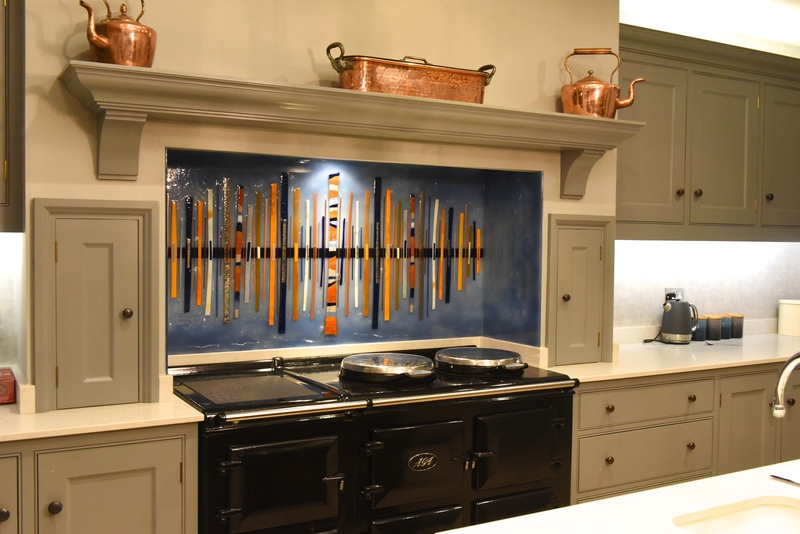 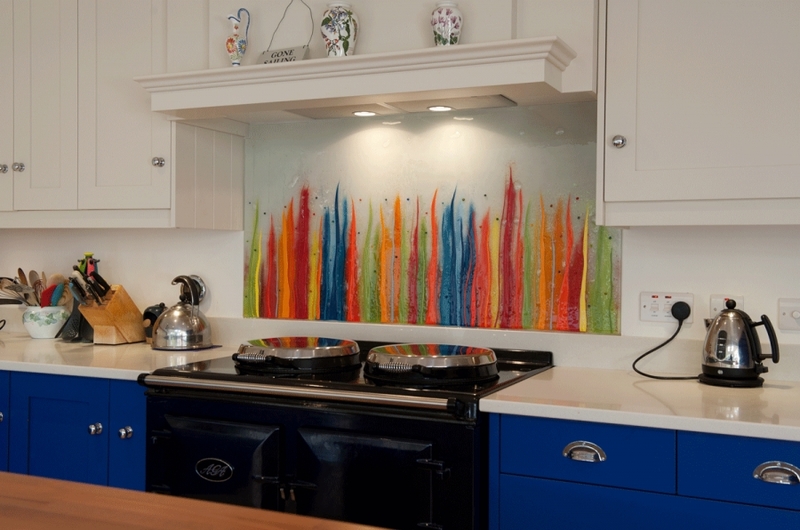 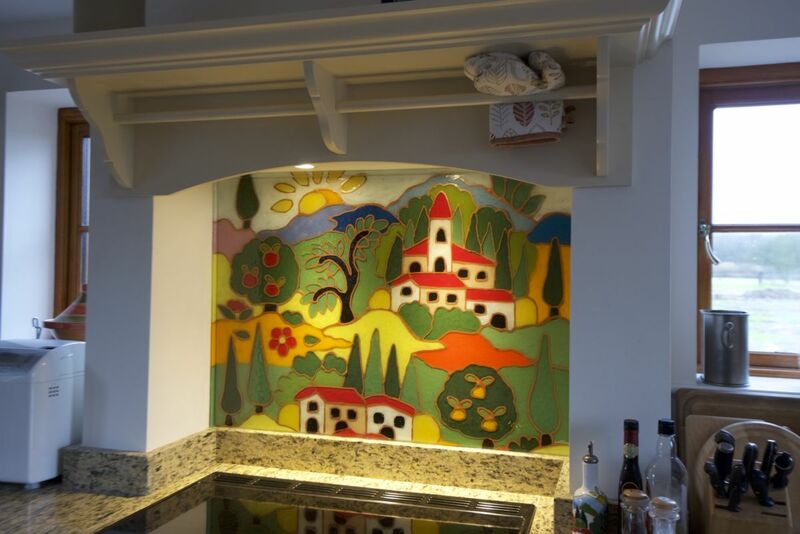 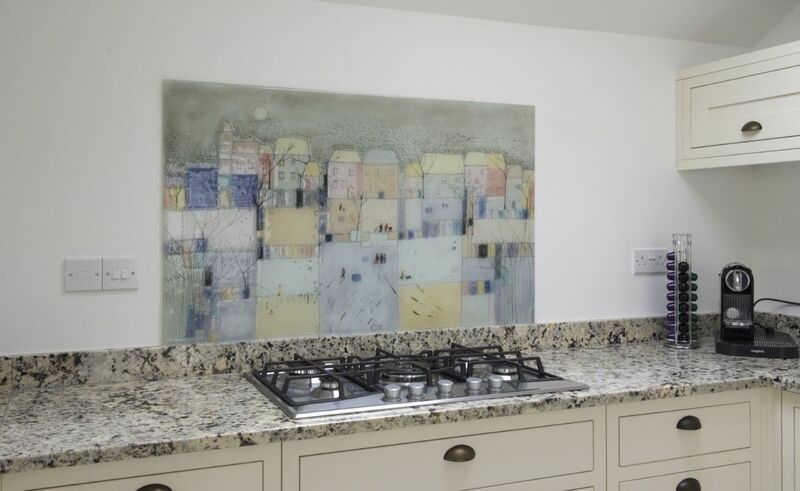 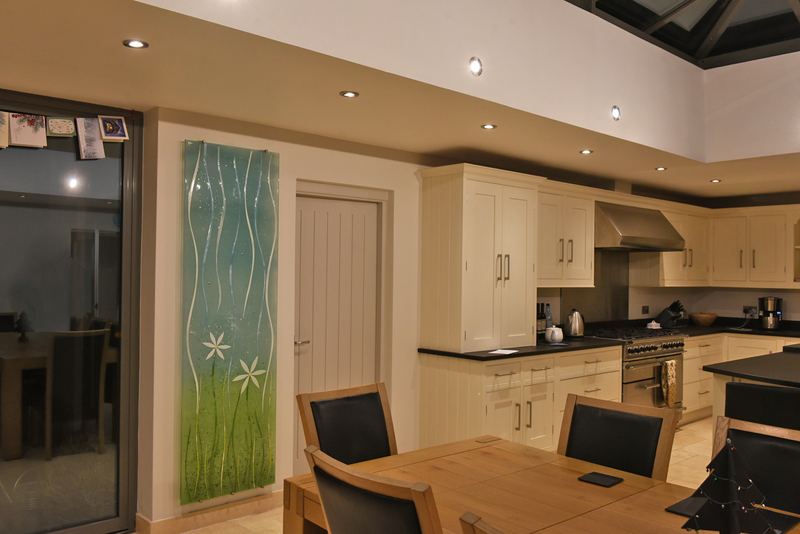 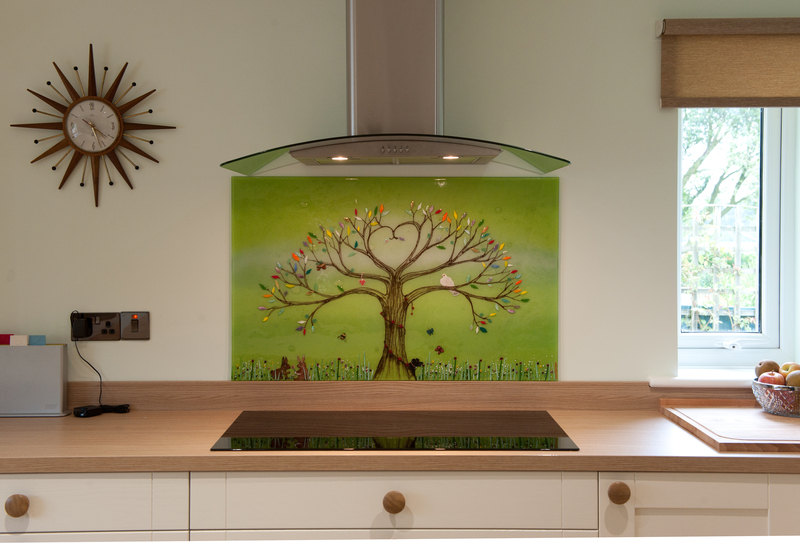 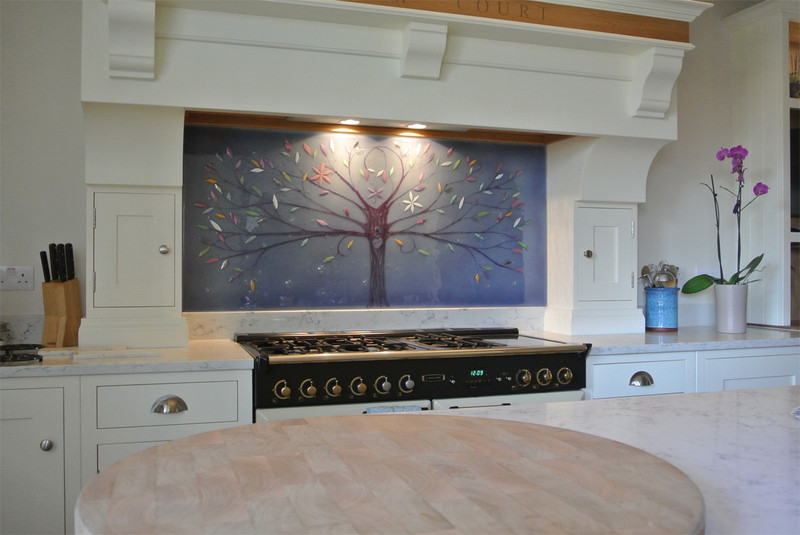 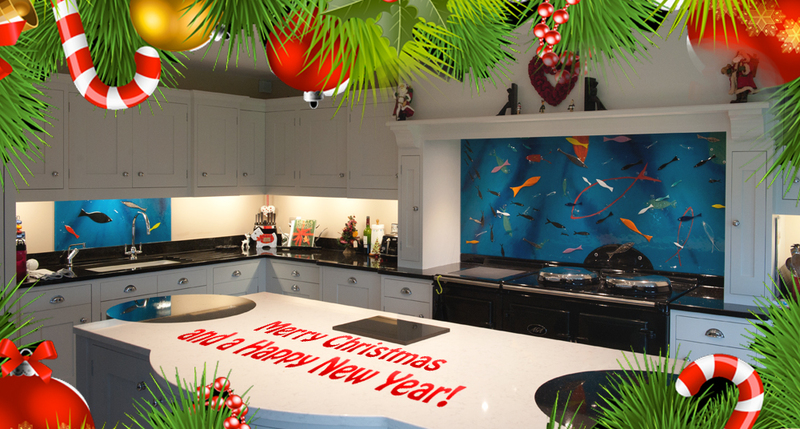 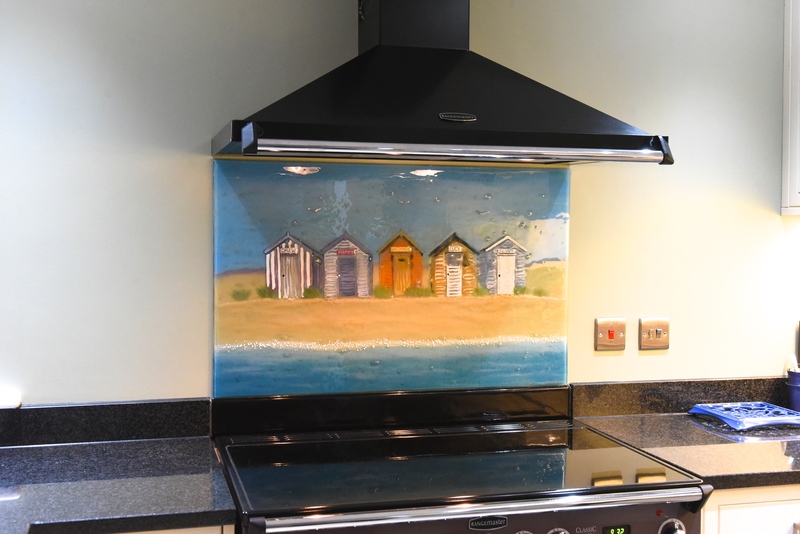 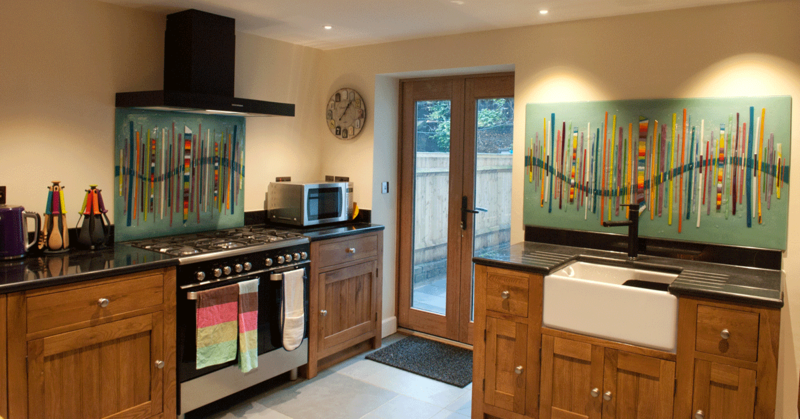 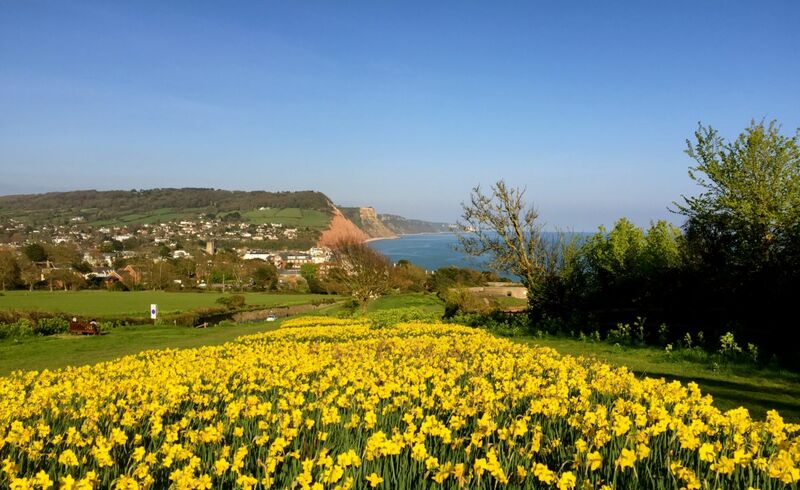 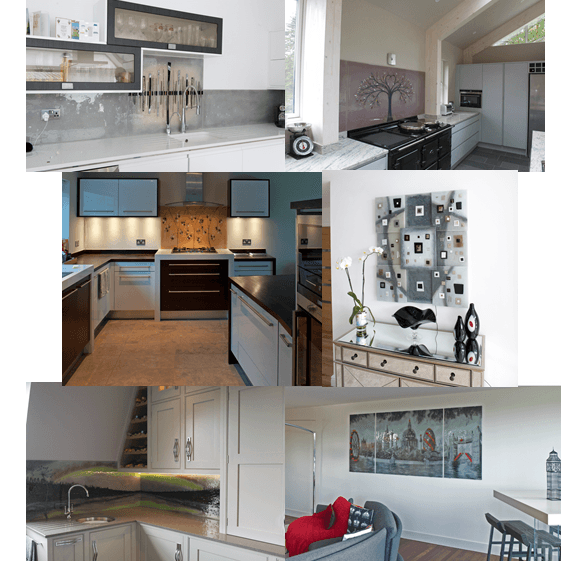 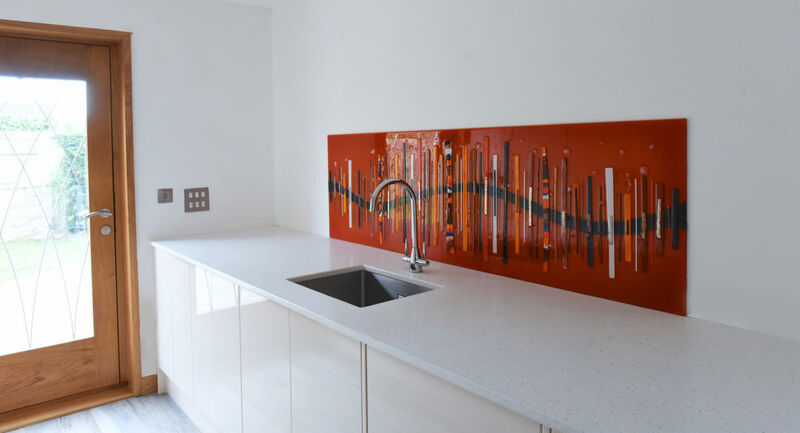 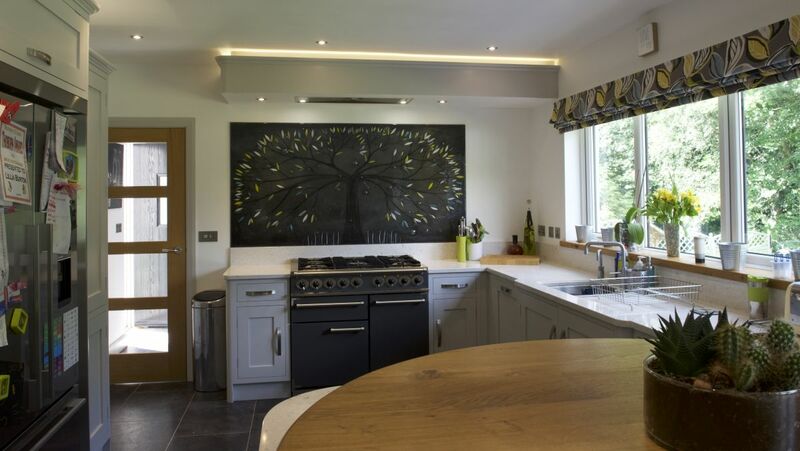 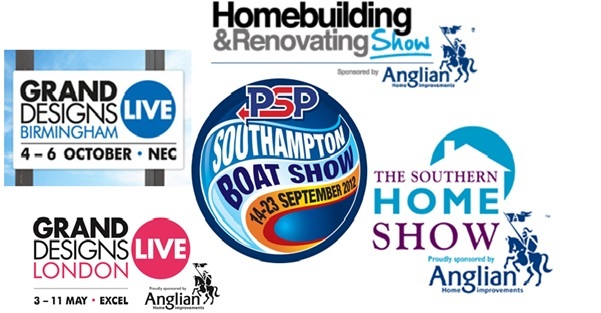 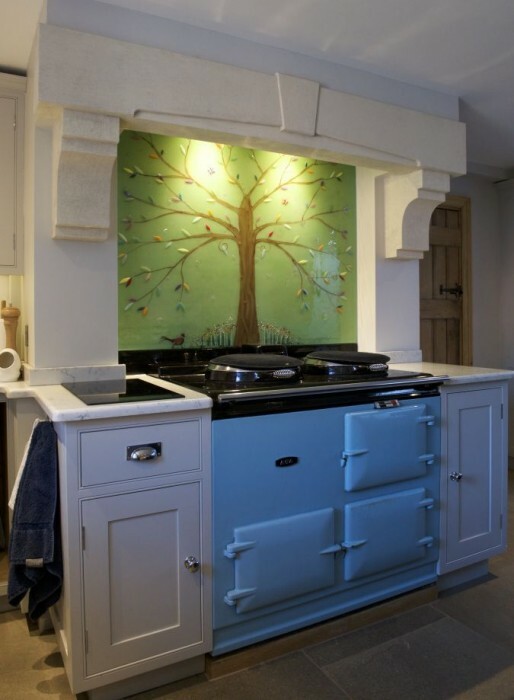 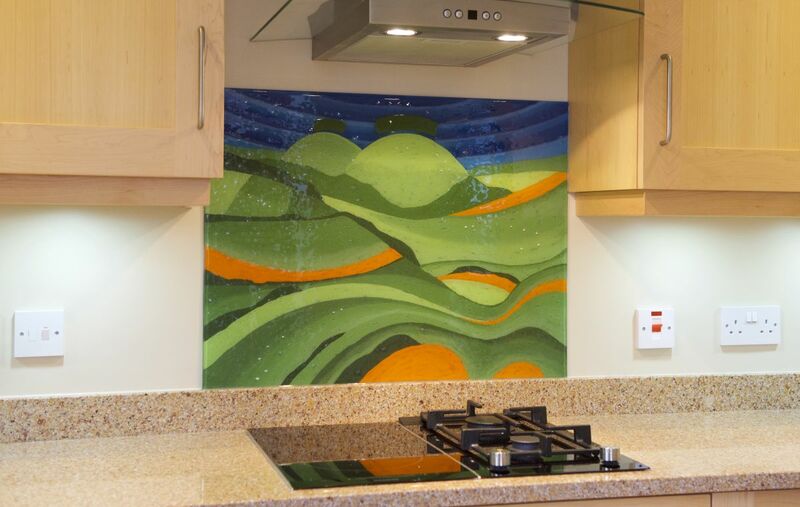 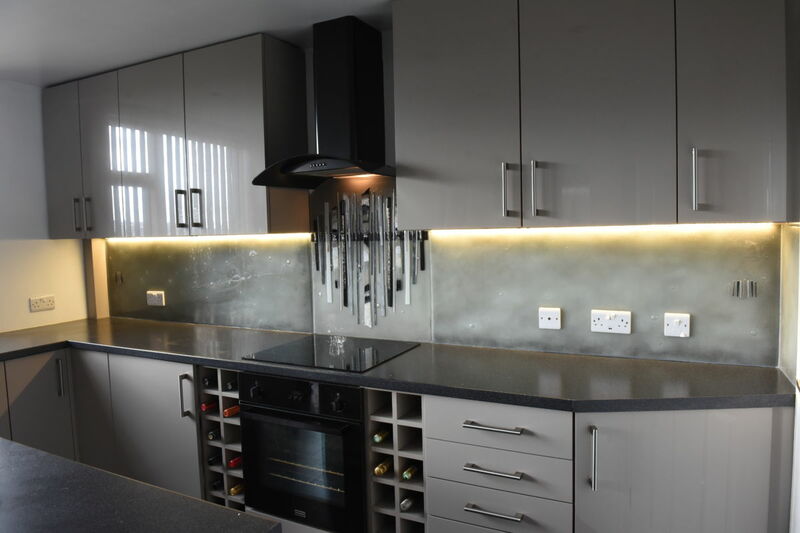 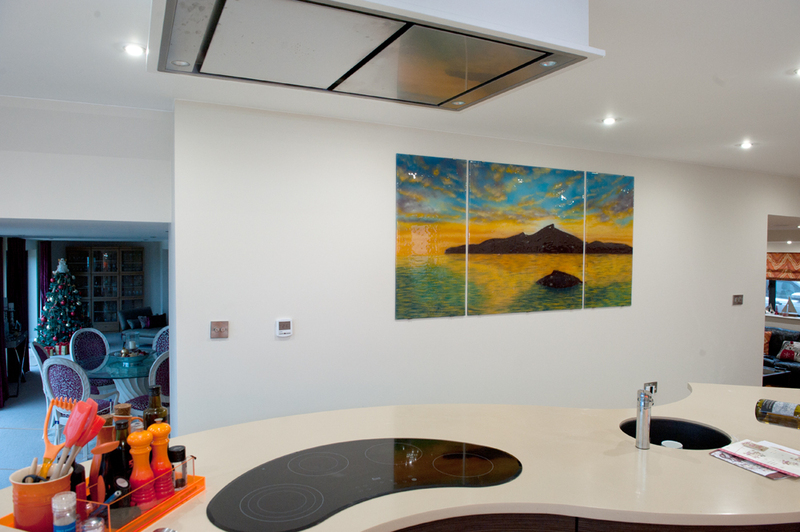 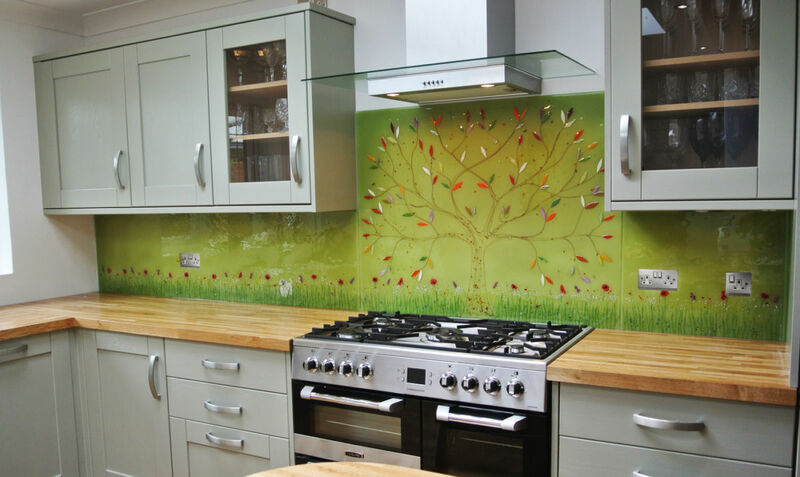 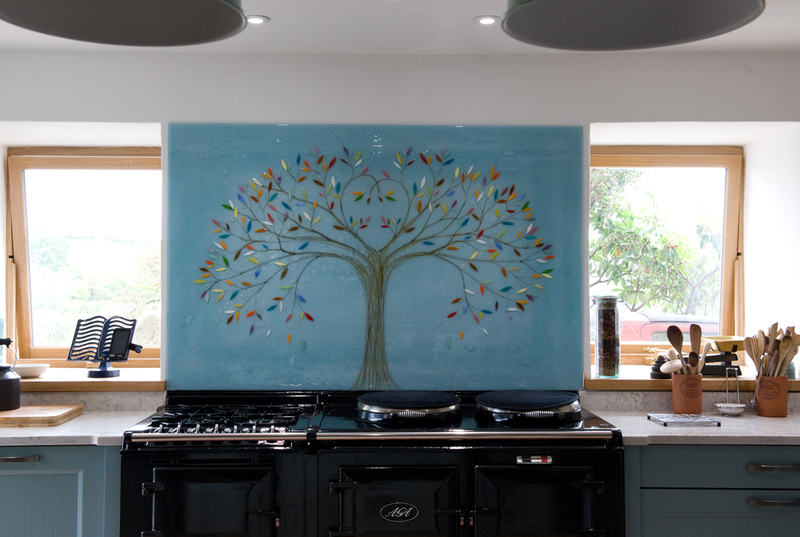 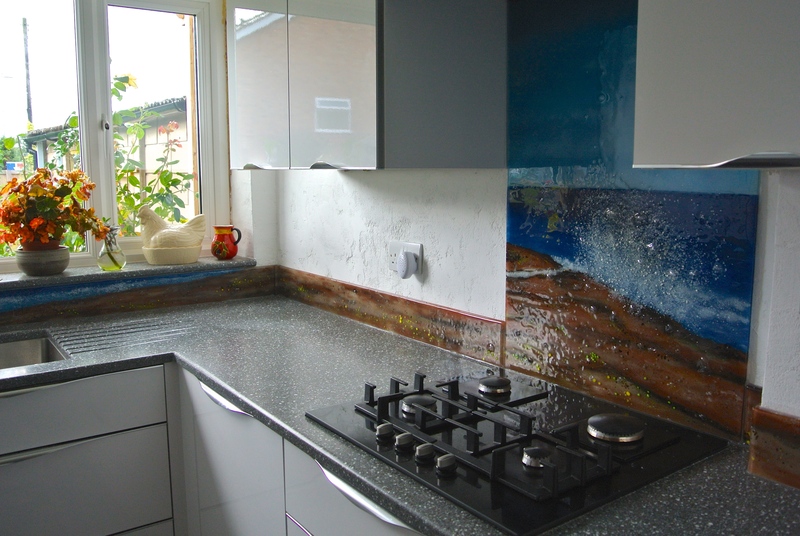 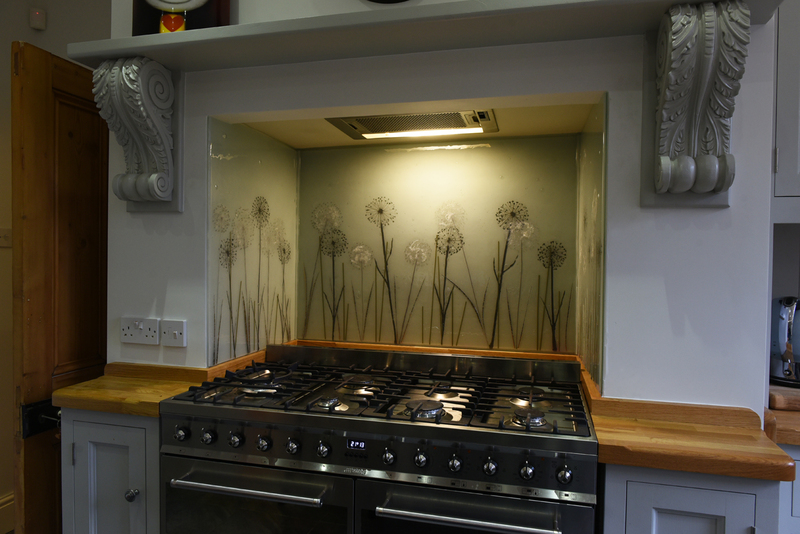 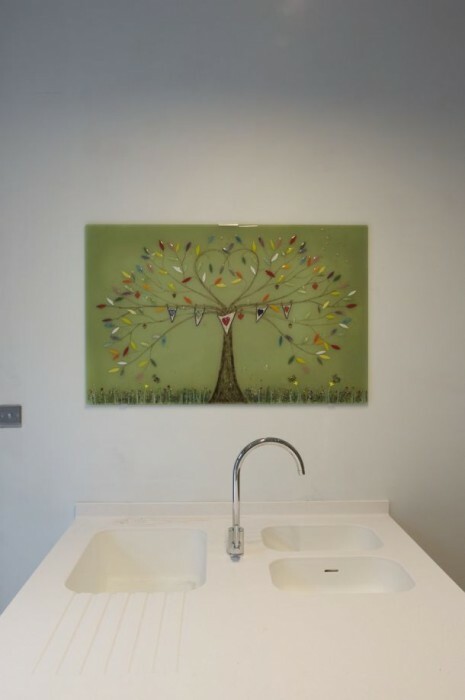 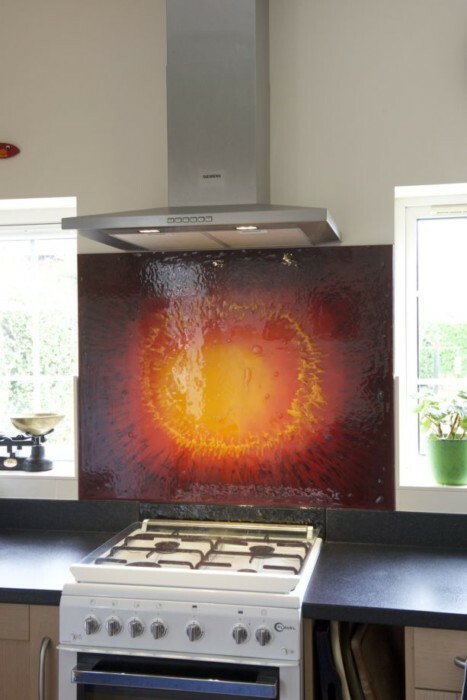 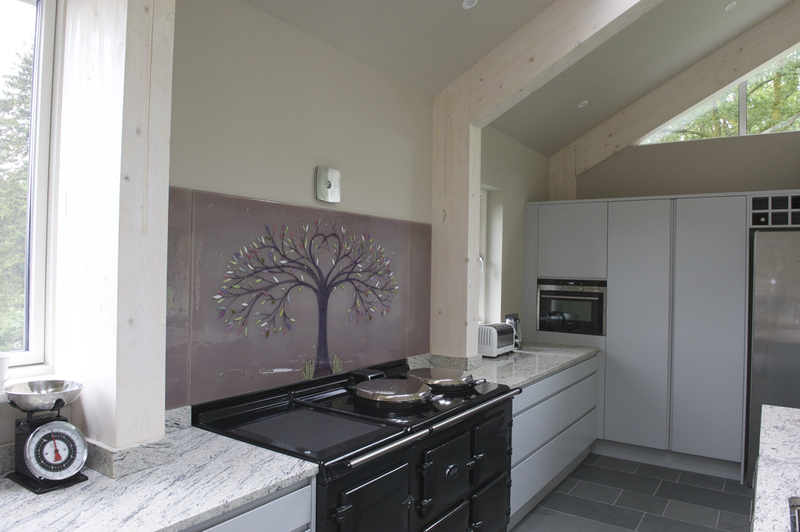 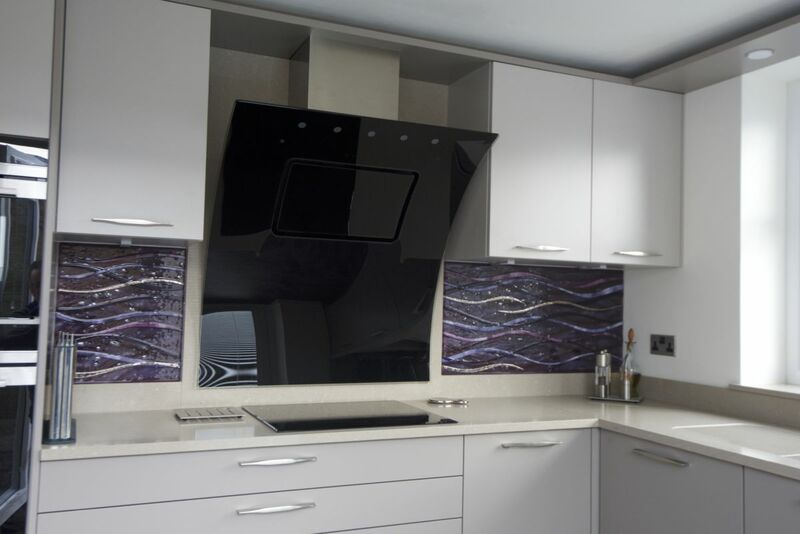 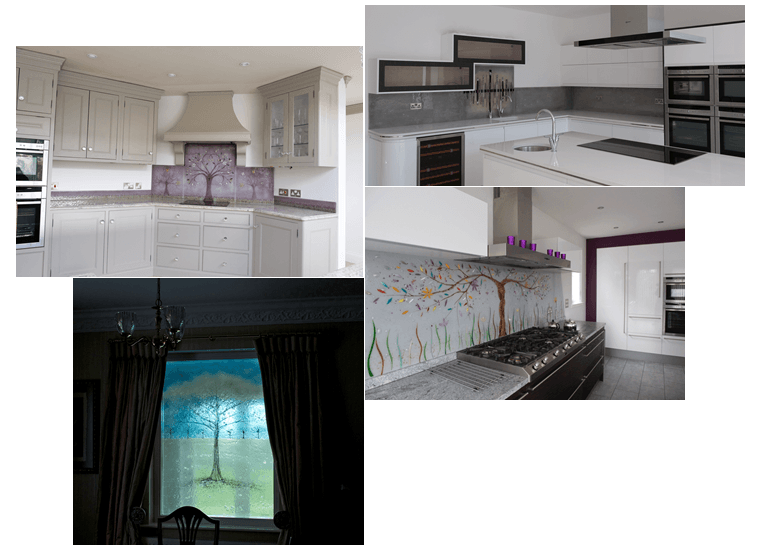 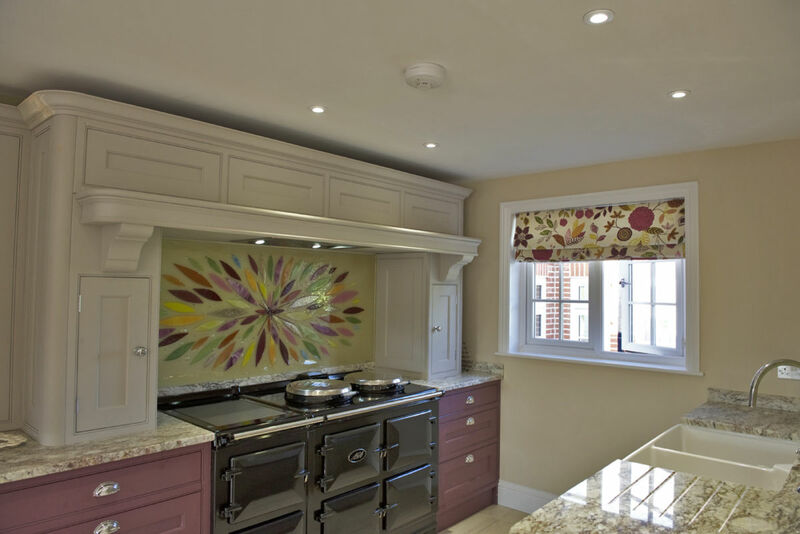 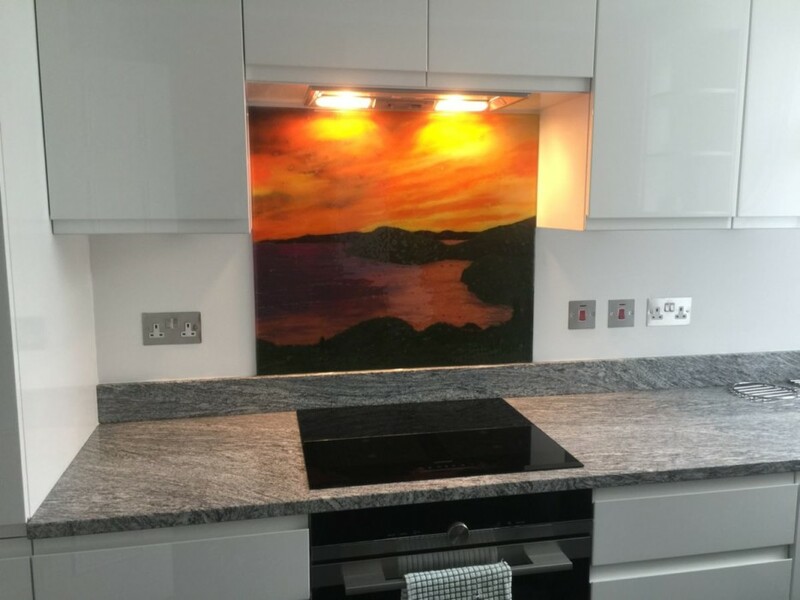 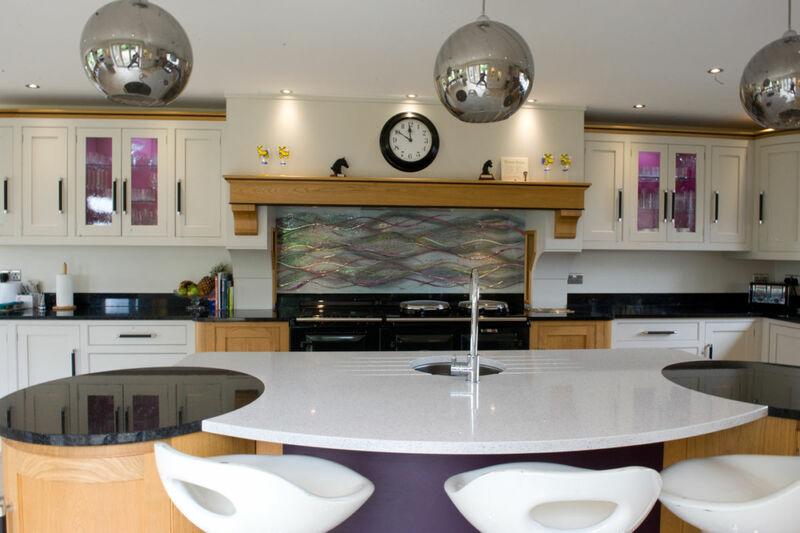 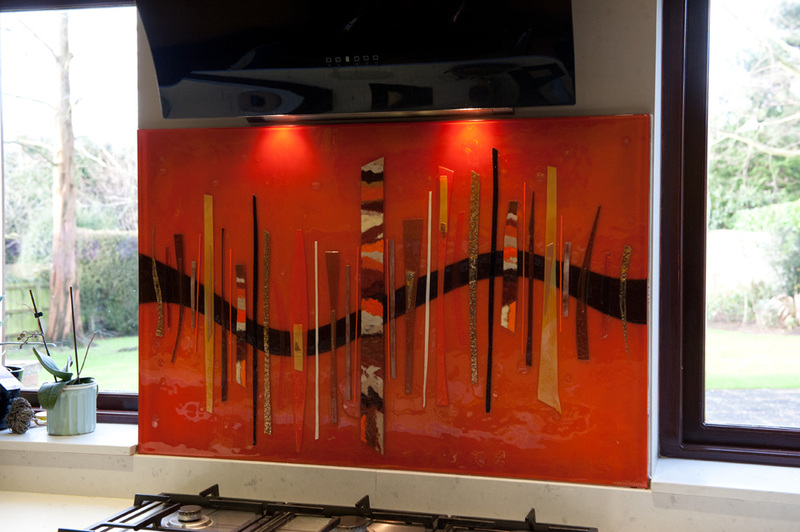 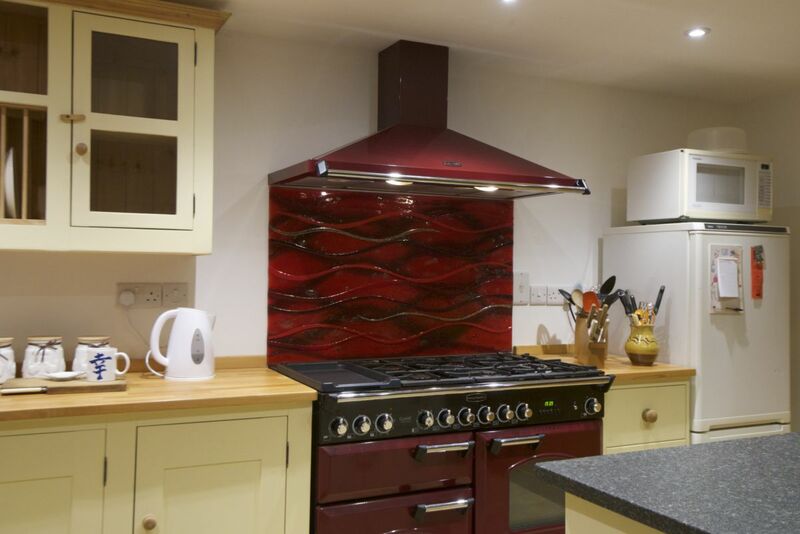 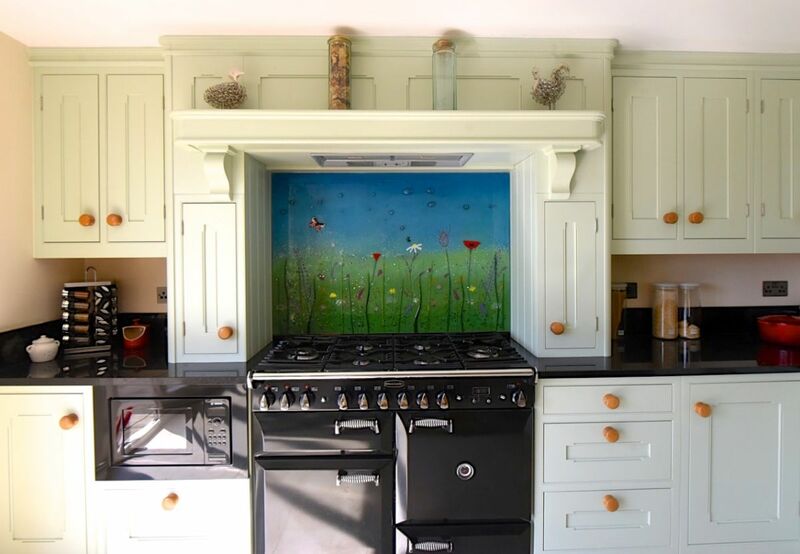 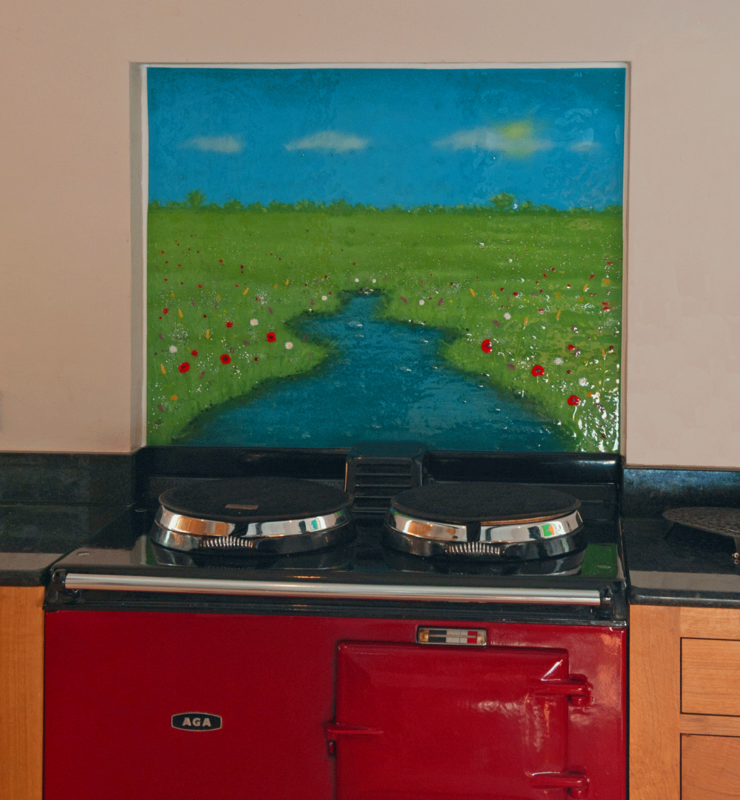 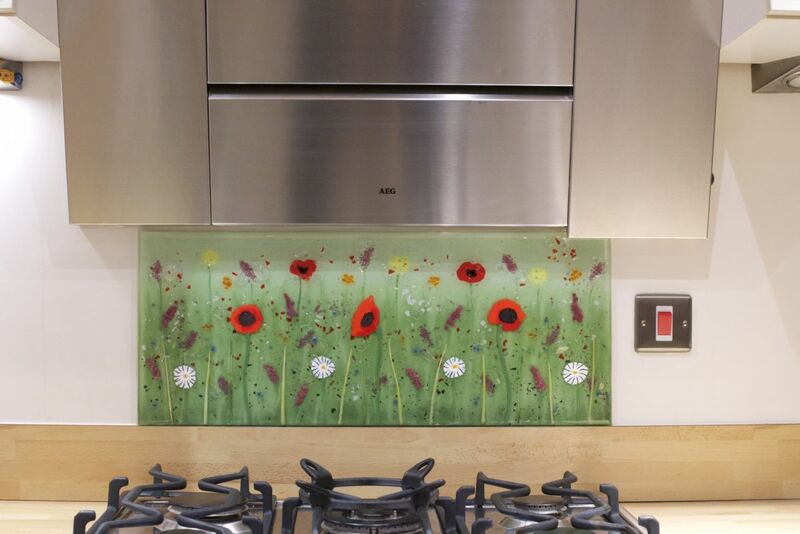 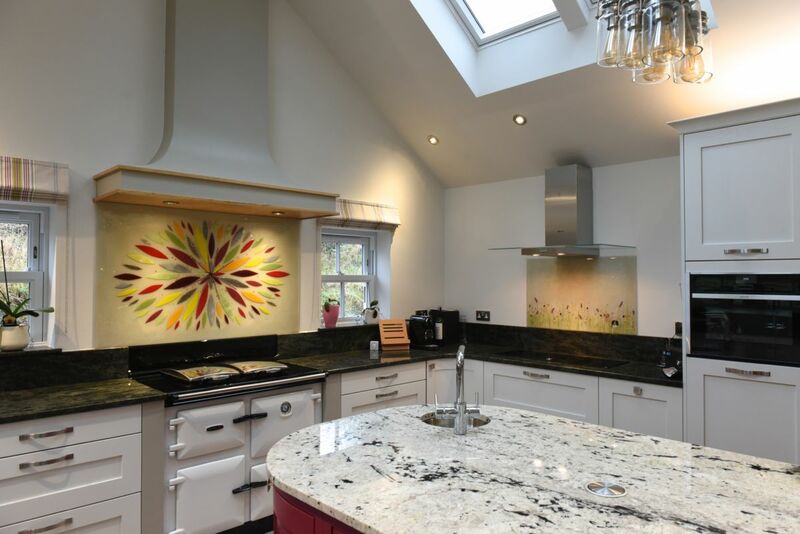 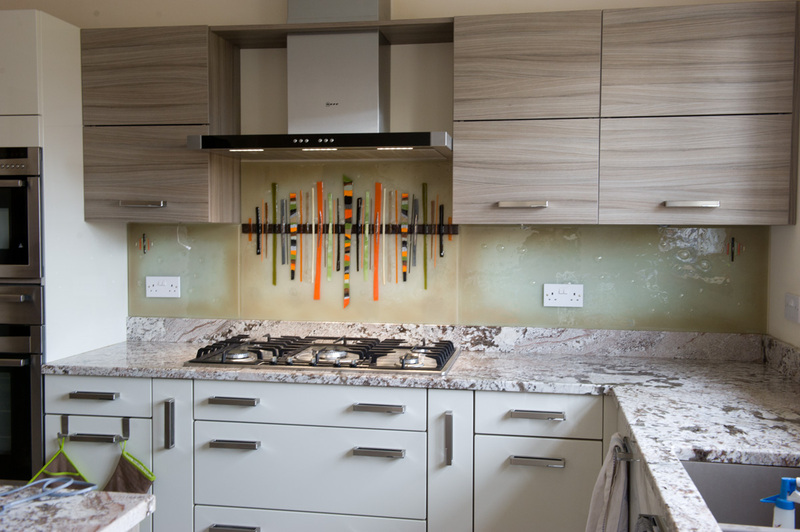 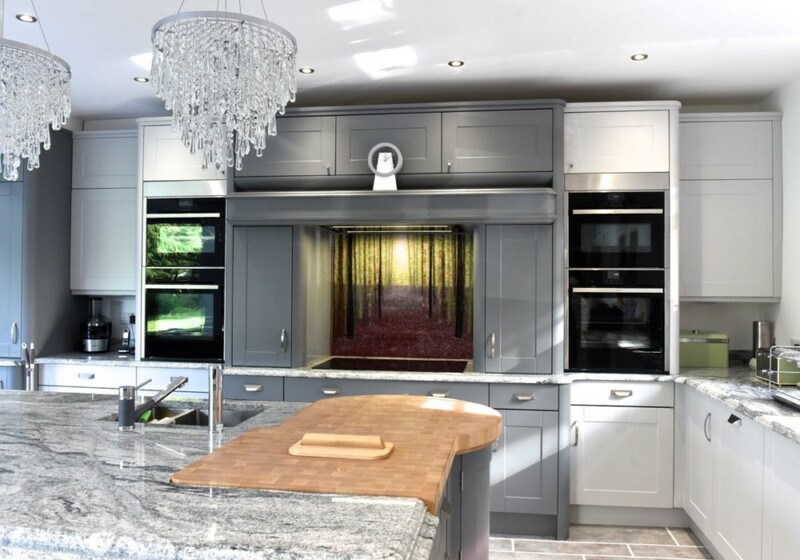 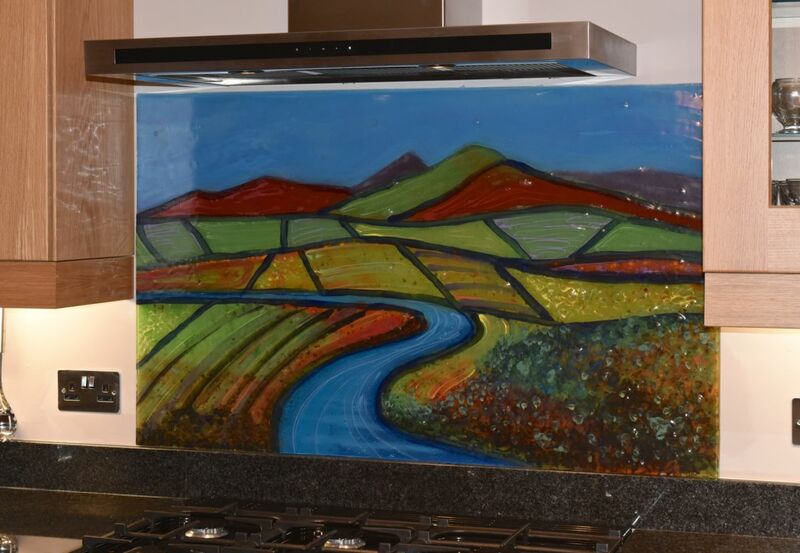 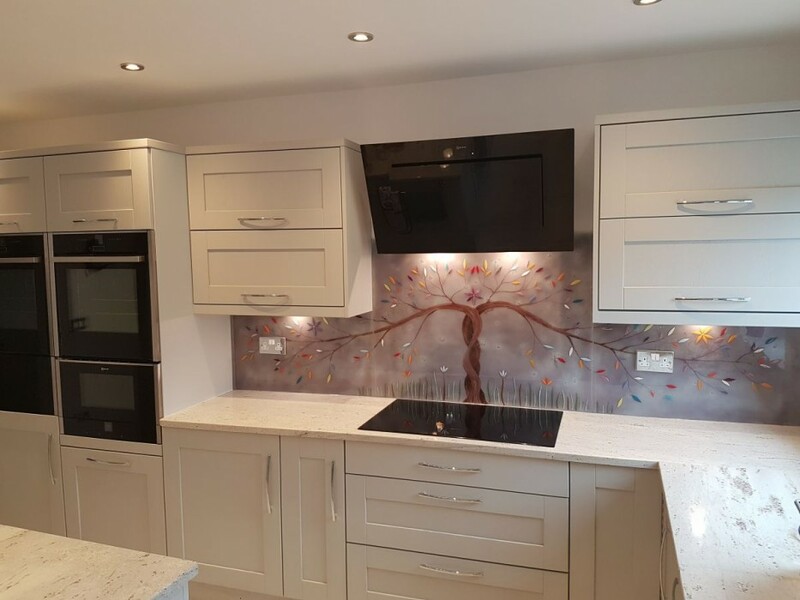 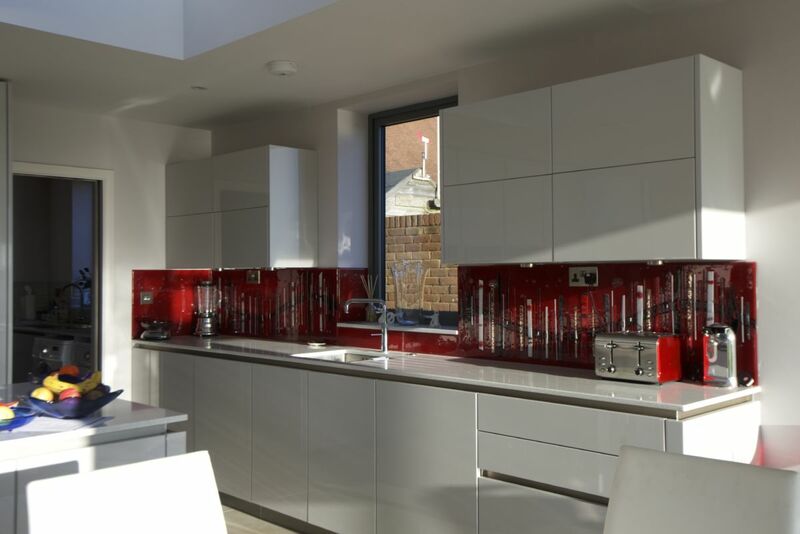 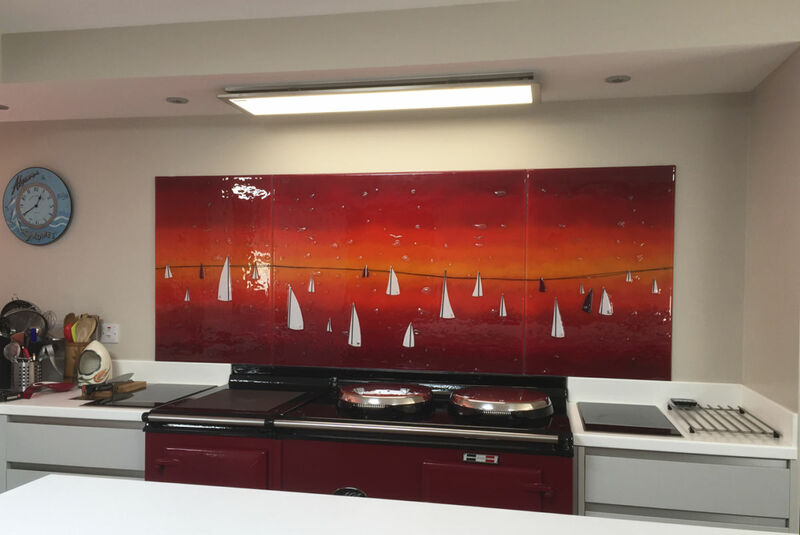 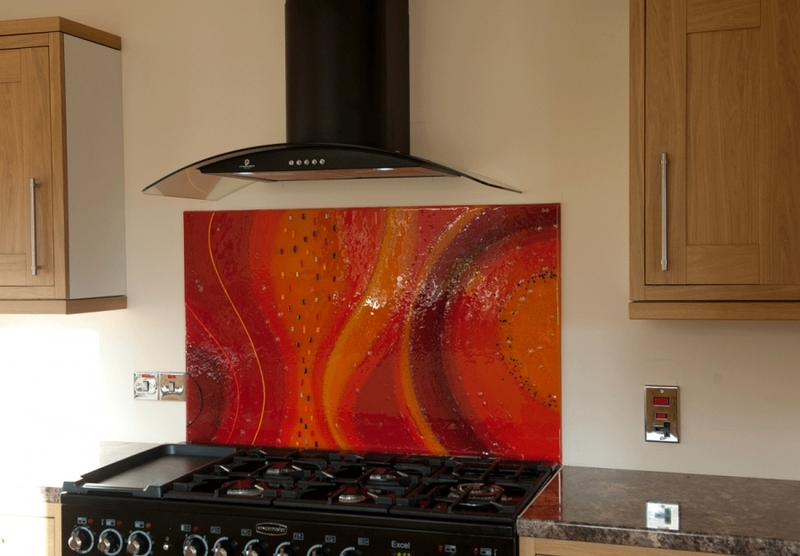 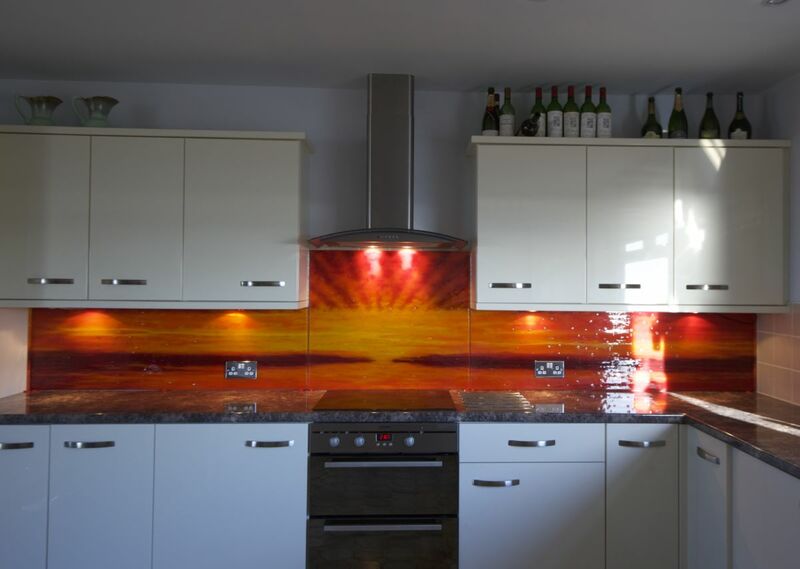 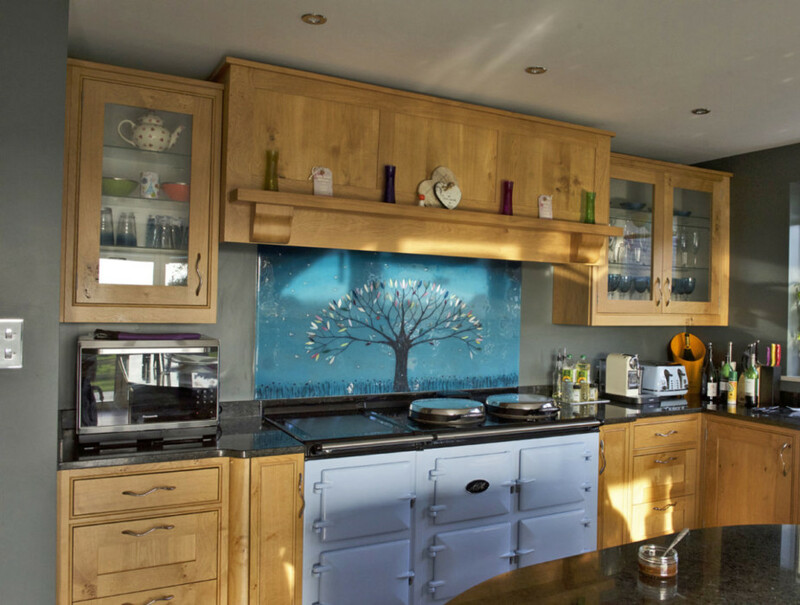 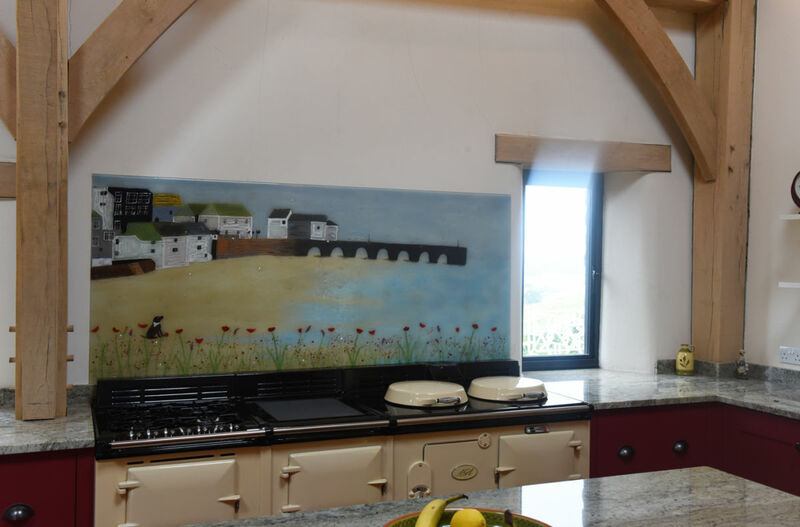 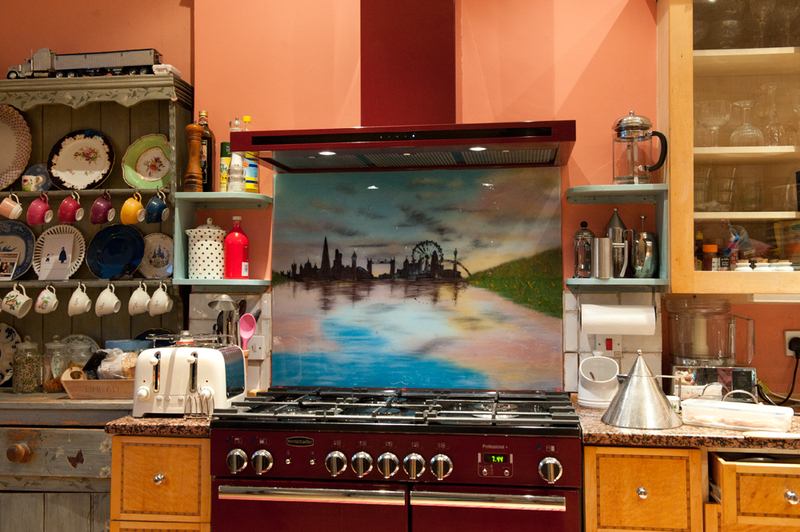 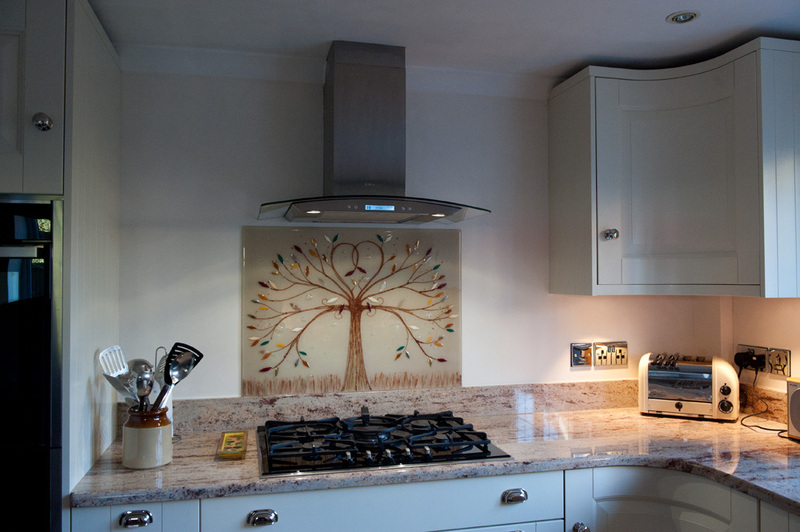 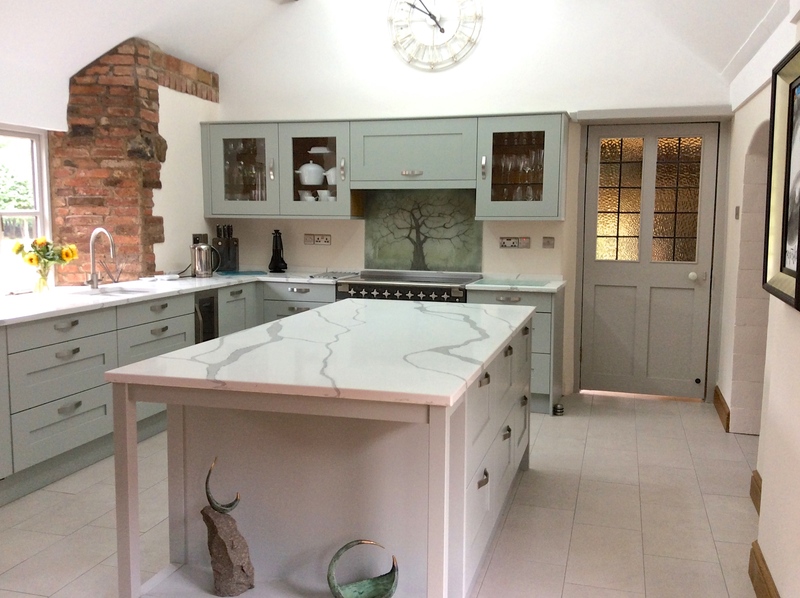 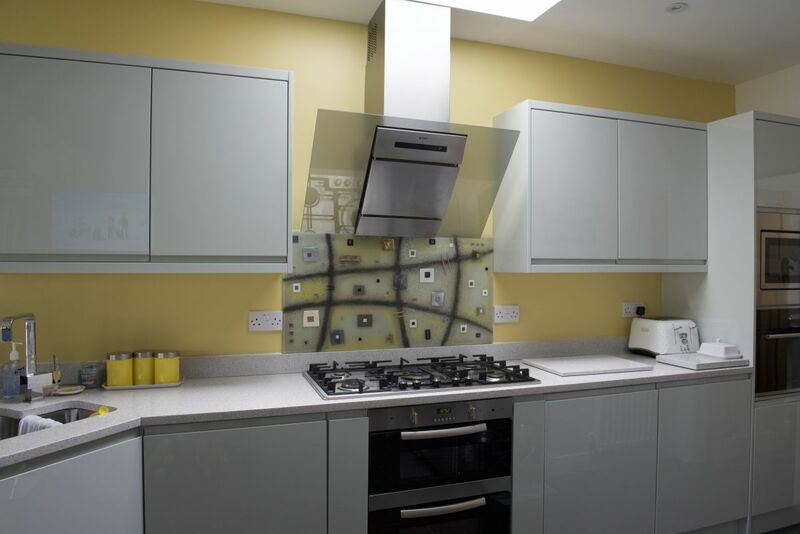 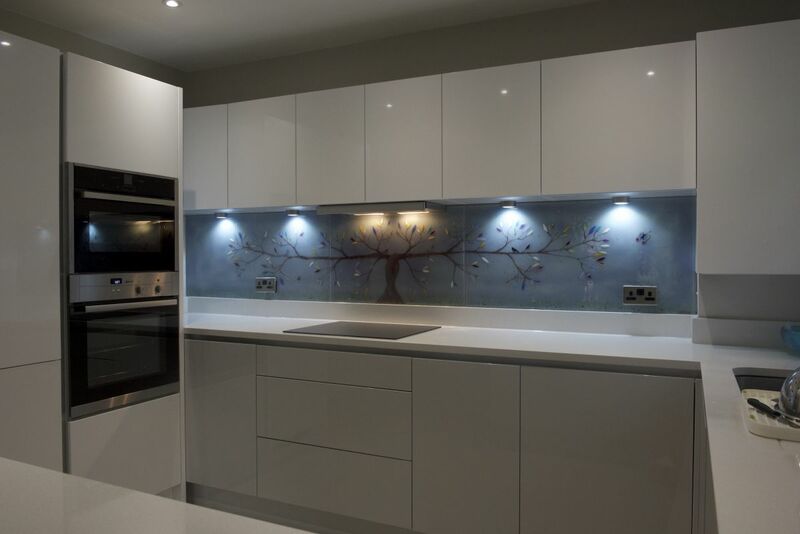 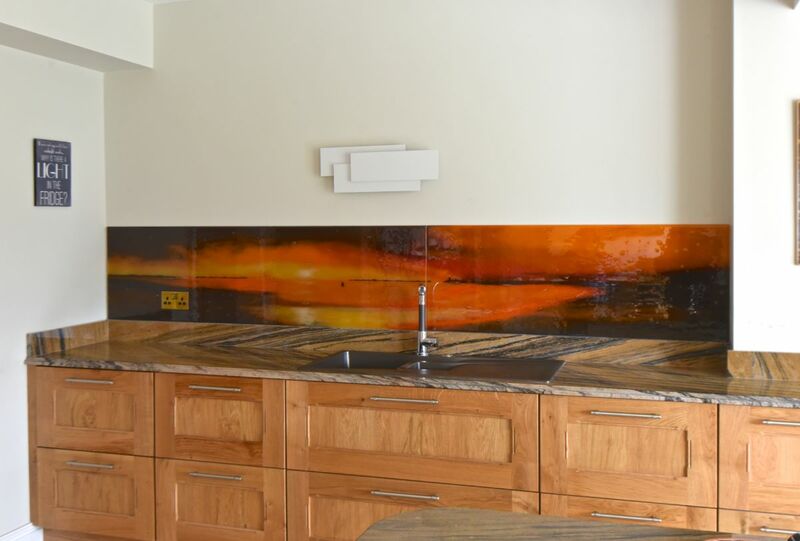 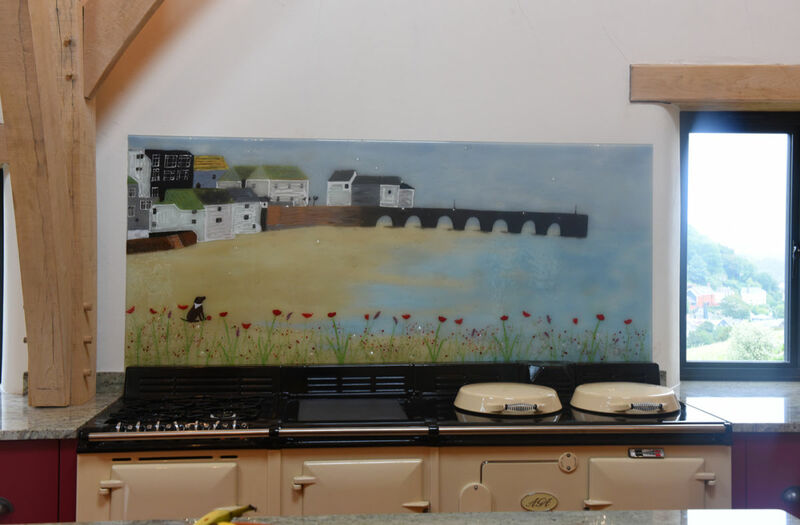 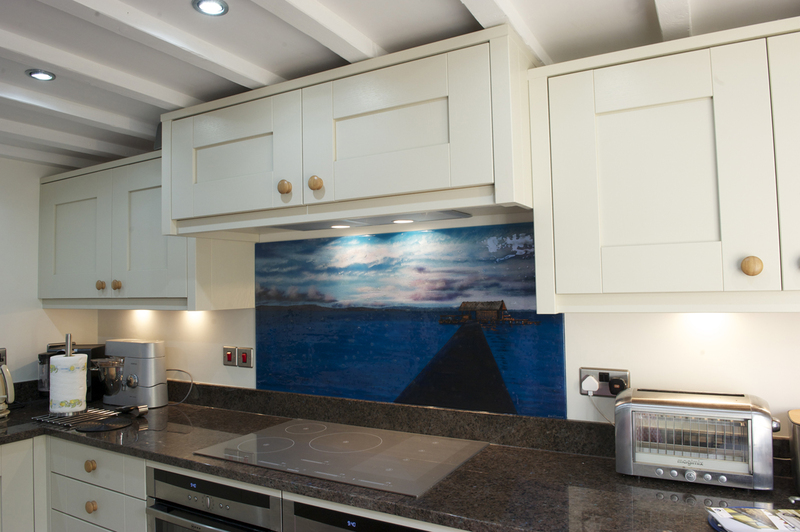 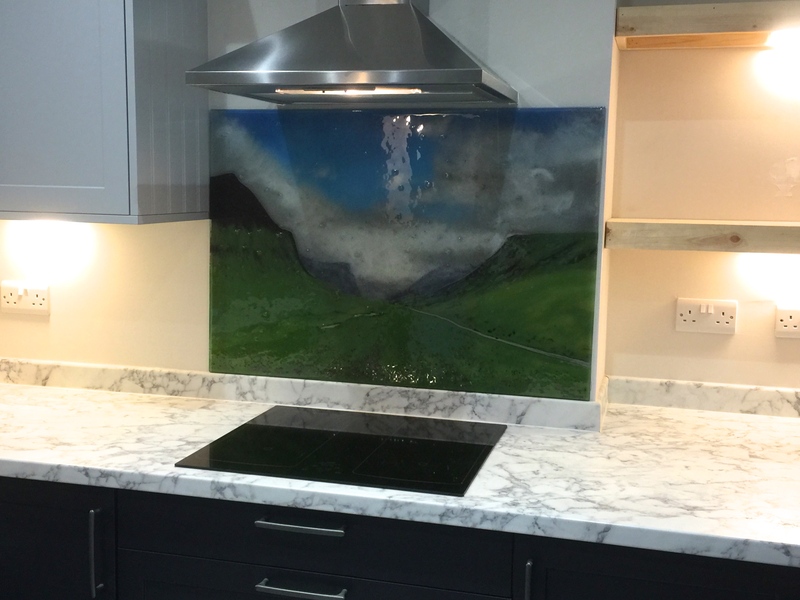 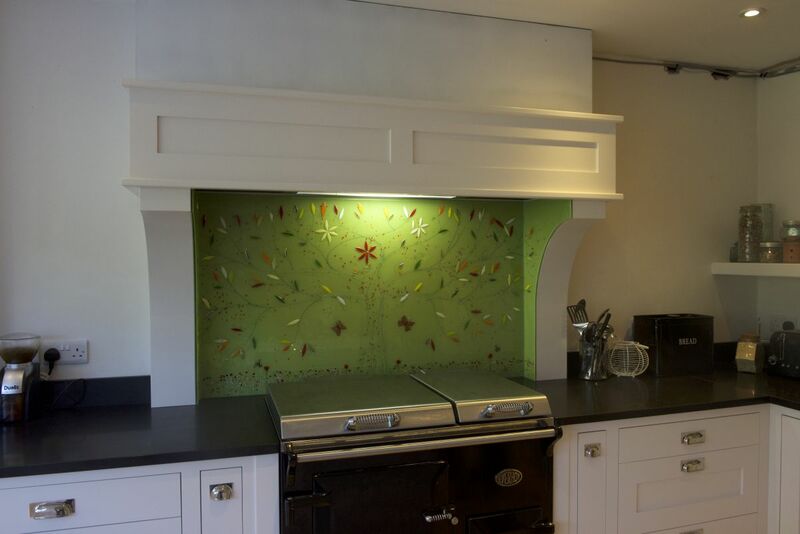 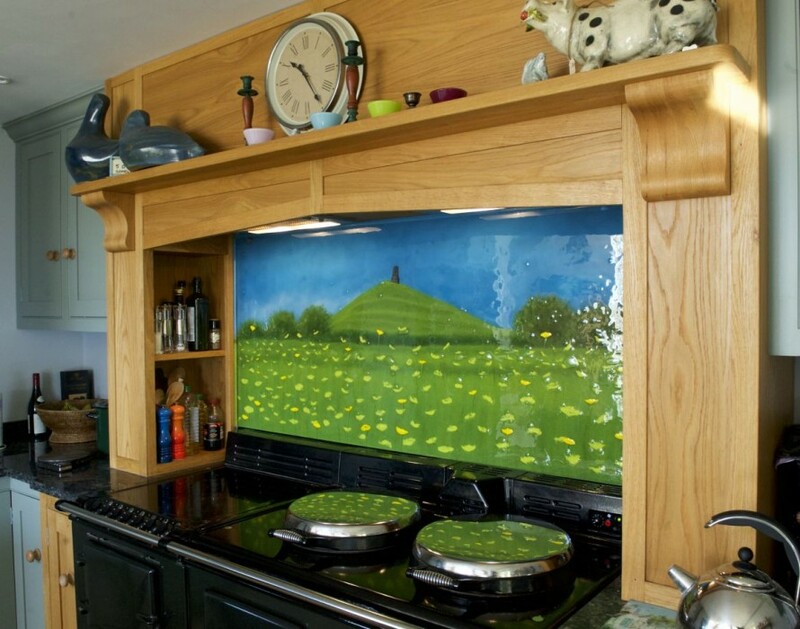 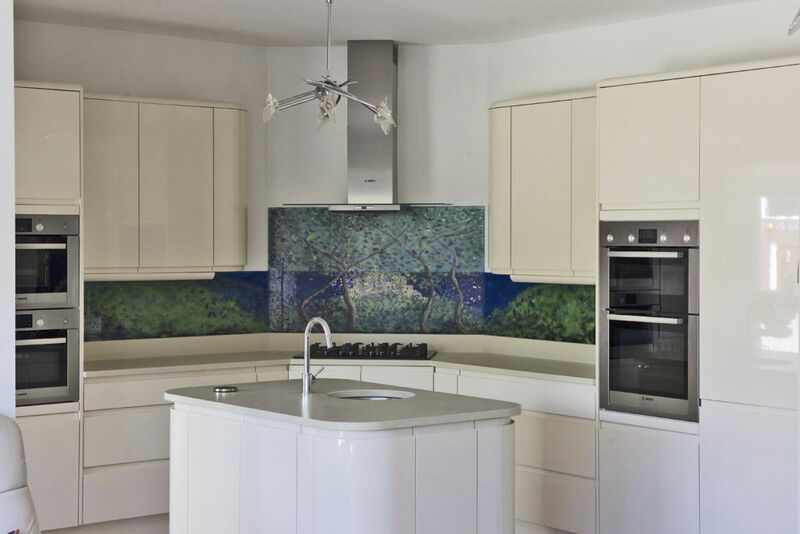 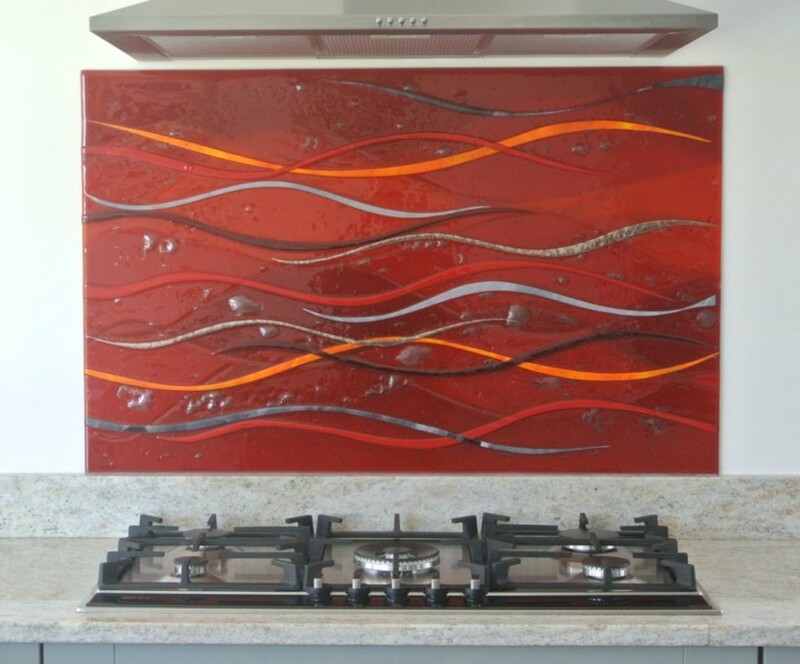 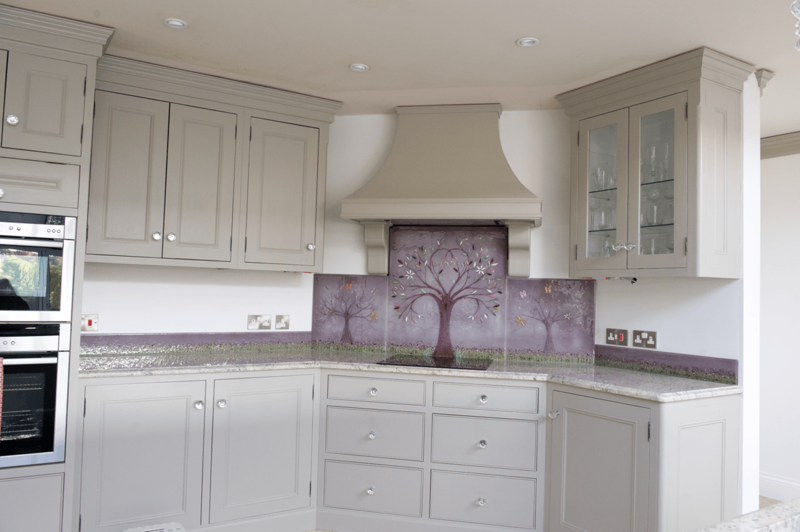 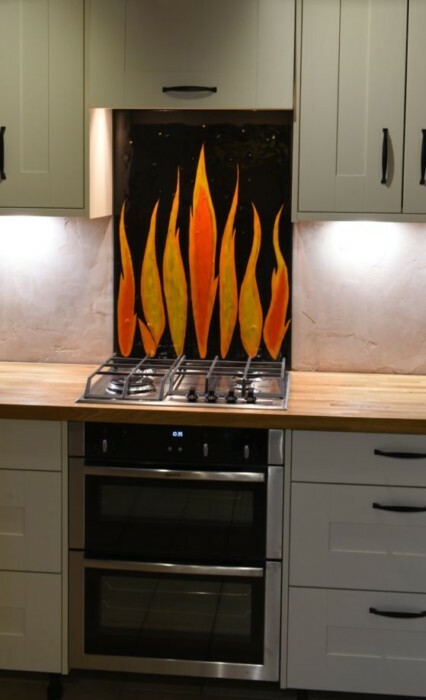 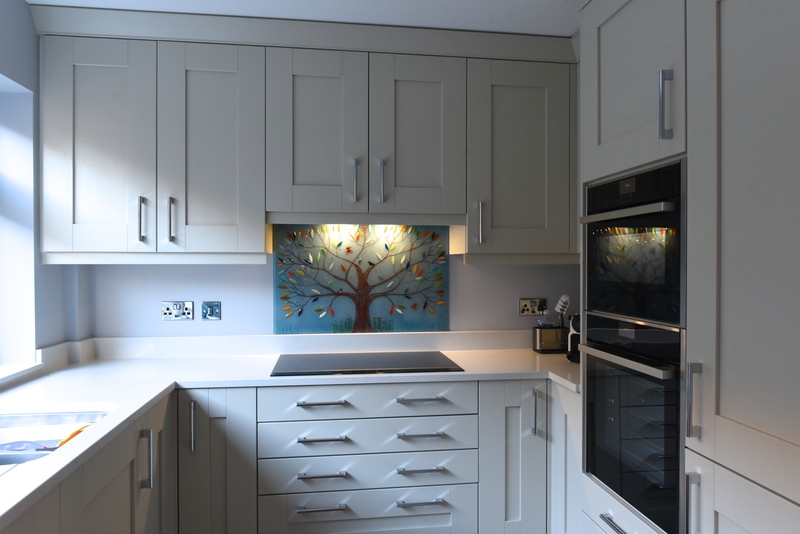 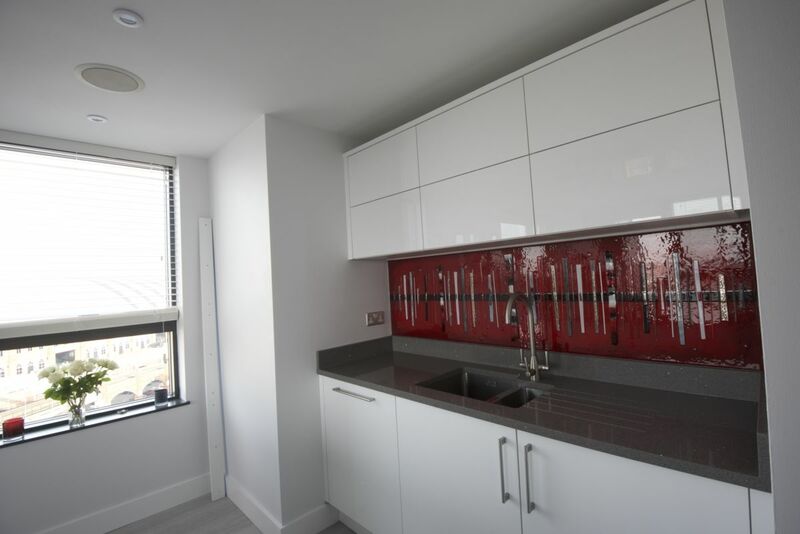 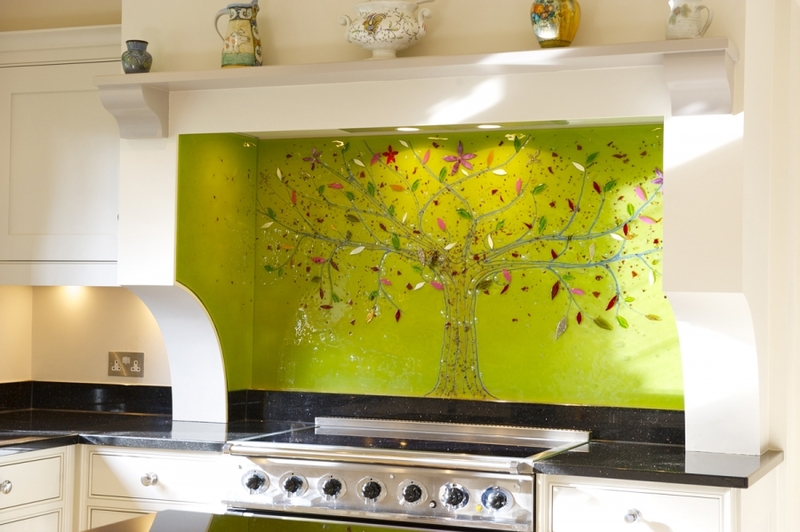 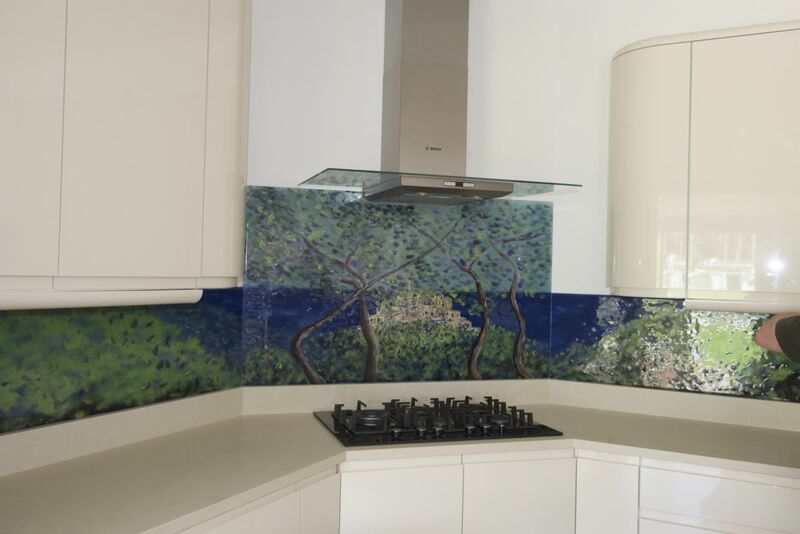 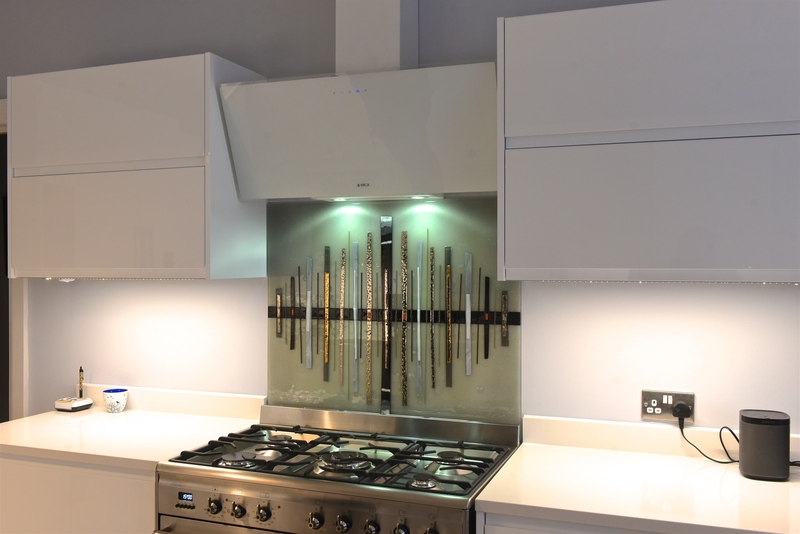 Whether you’d love a fiery kitchen splashback like the piece in today’s blog or something else entirely, you can get in touch by just picking up the phone or by dropping us an email online – either is fine! 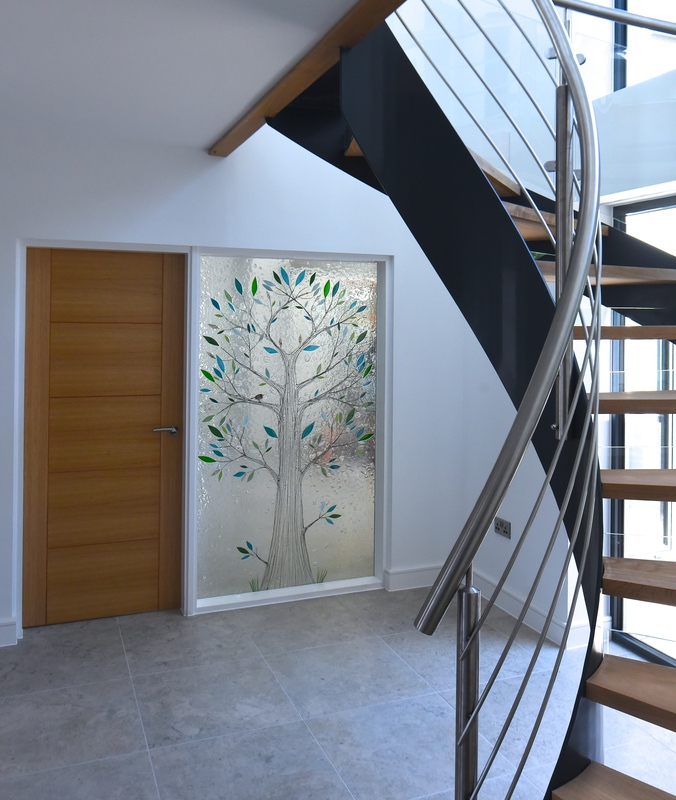 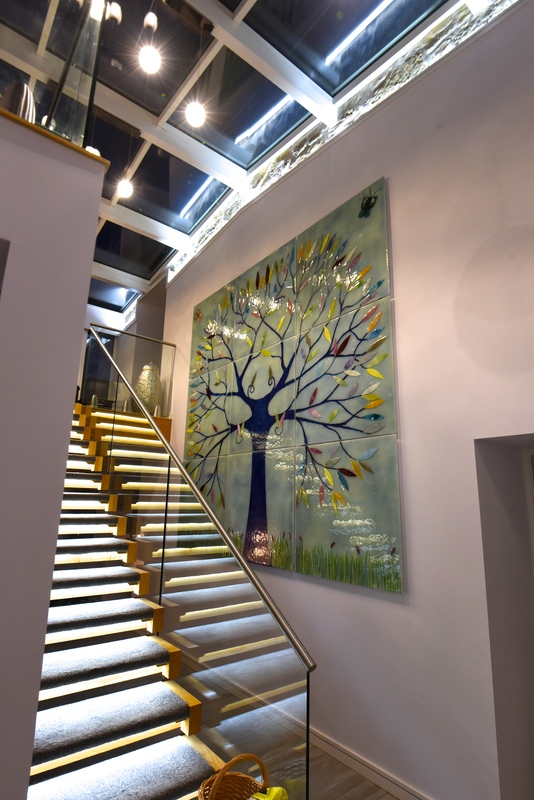 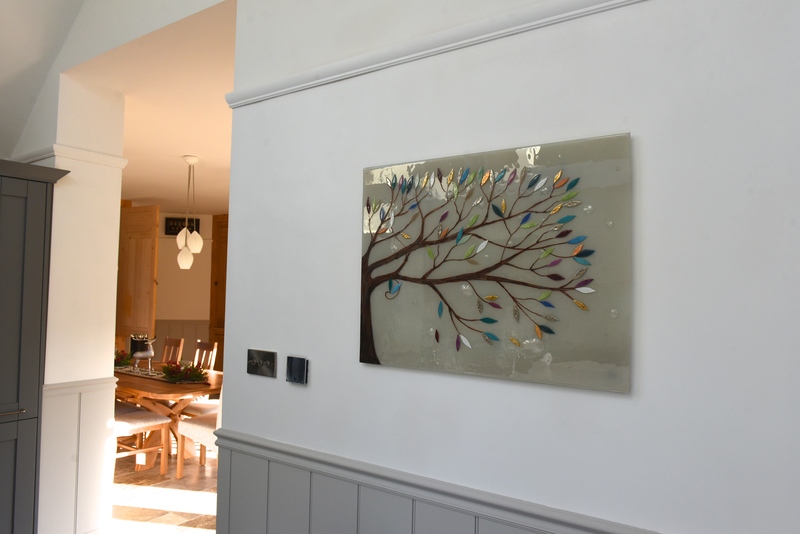 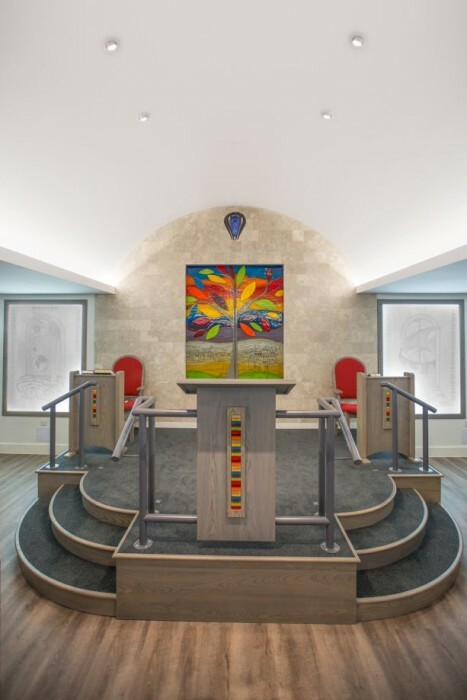 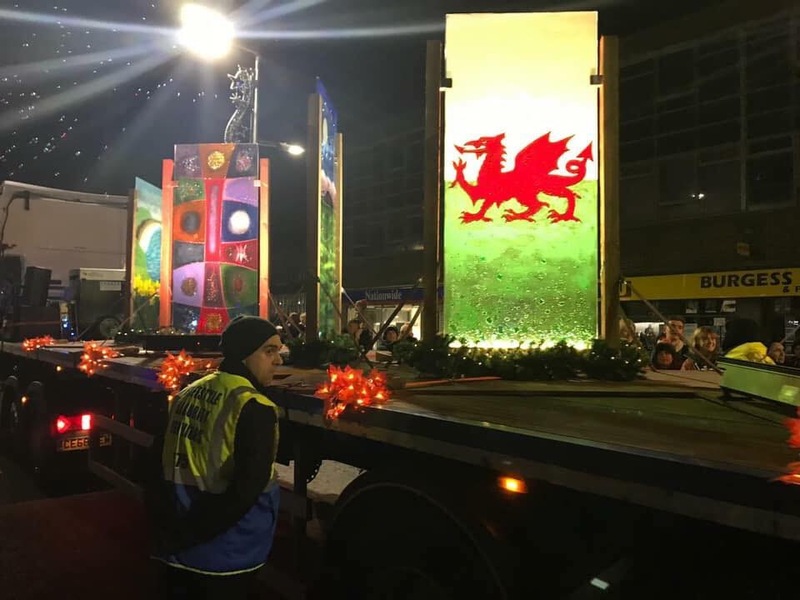 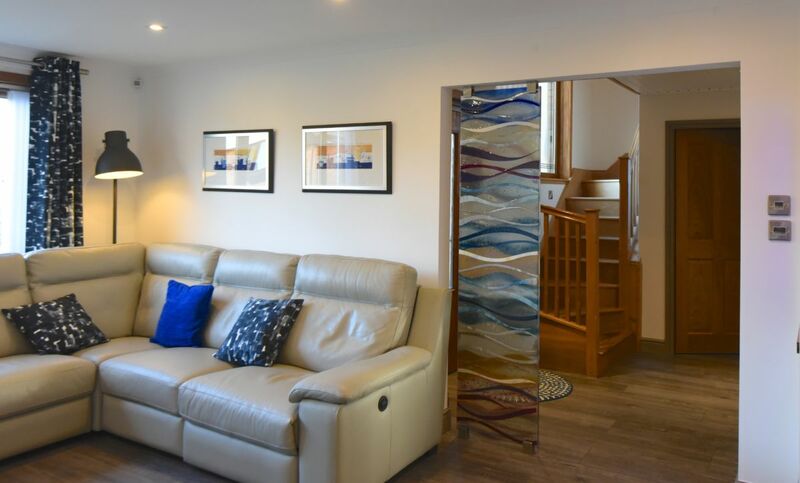 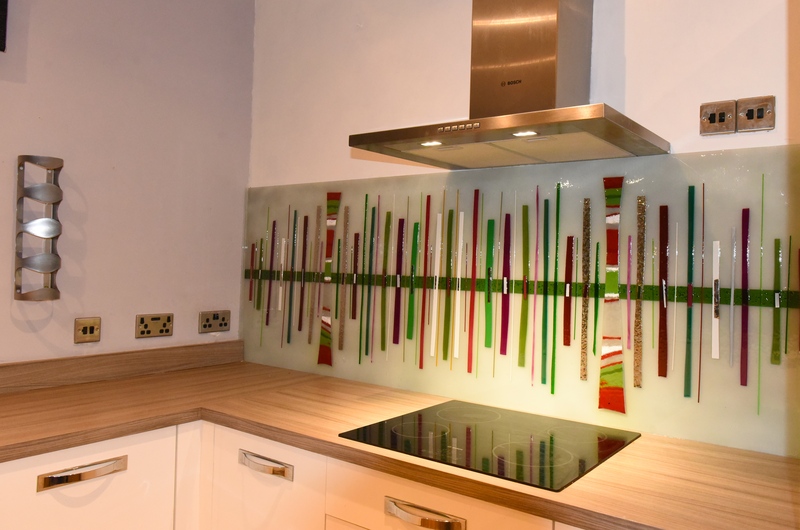 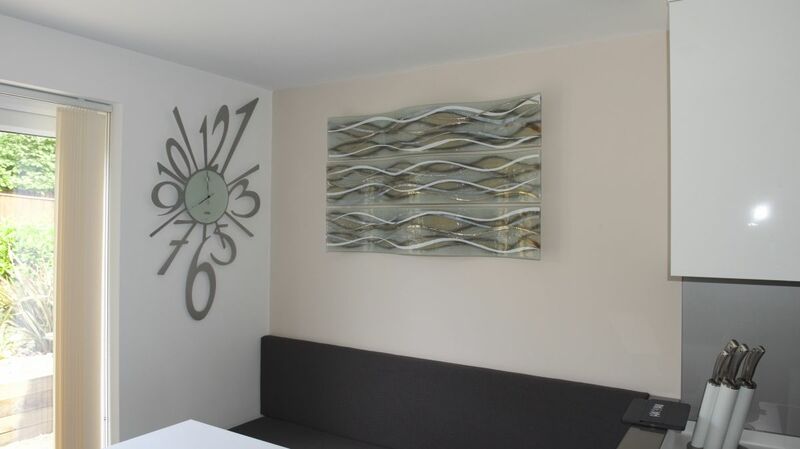 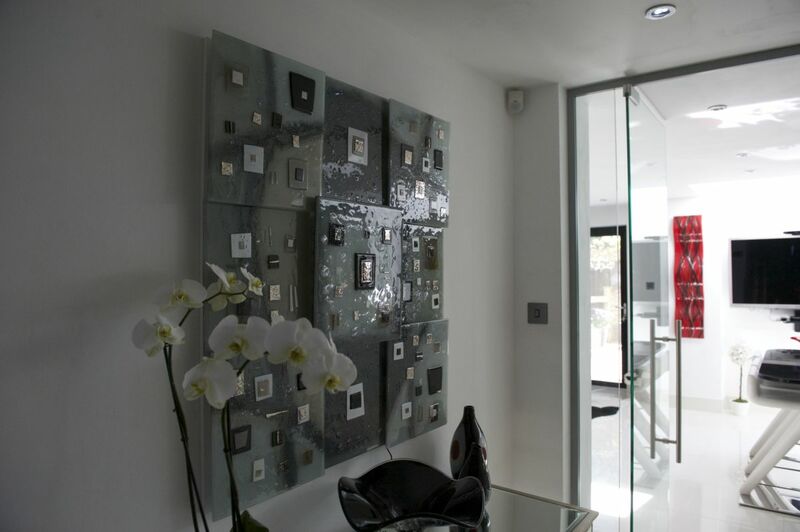 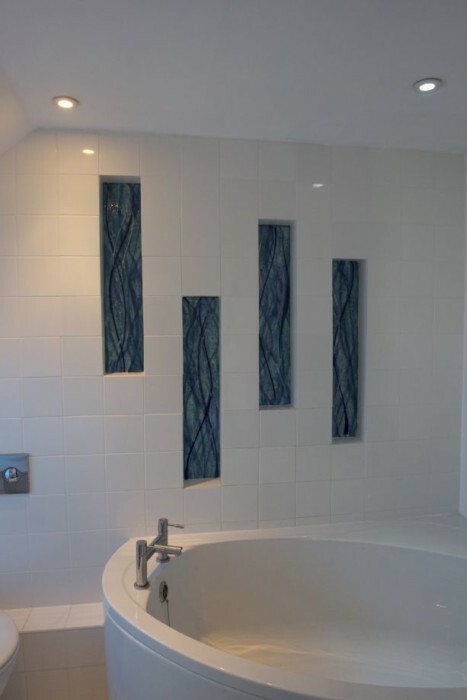 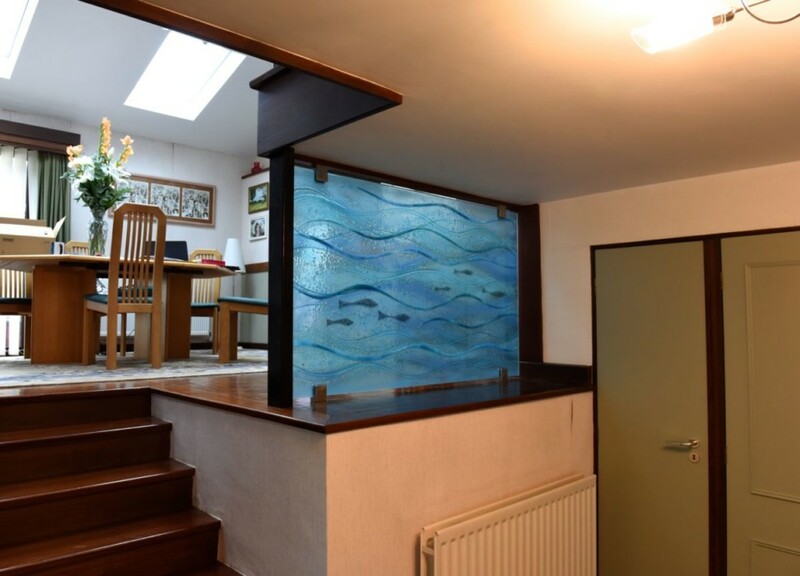 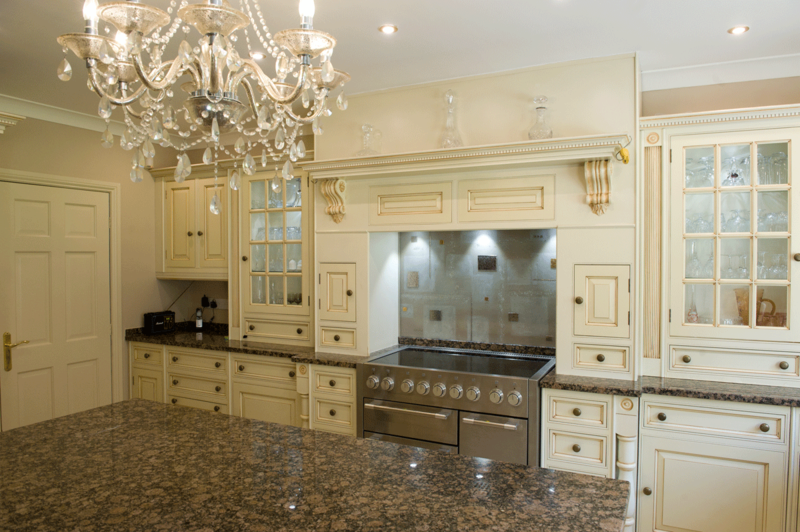 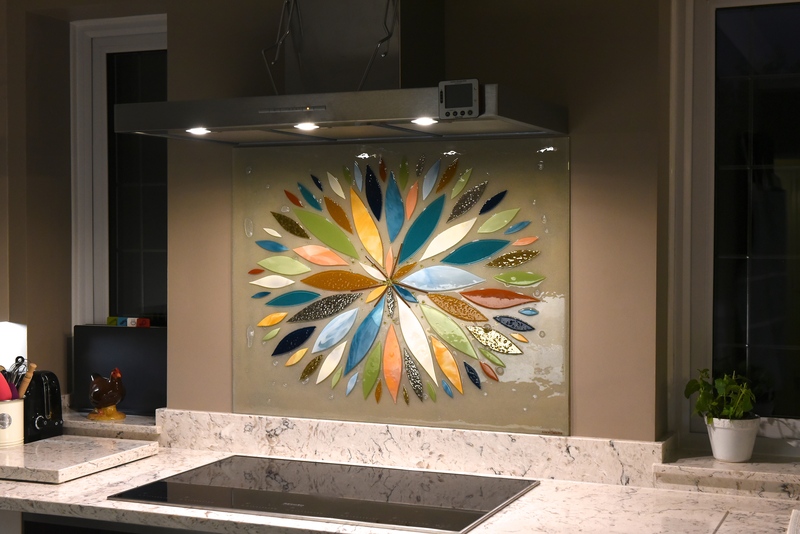 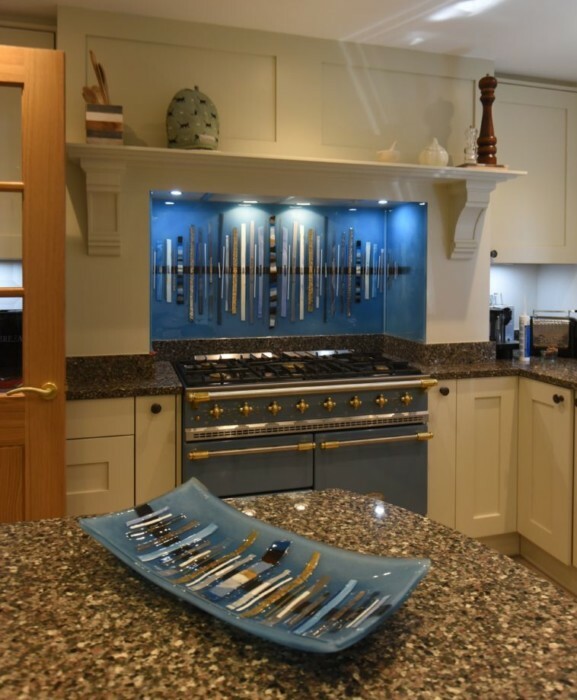 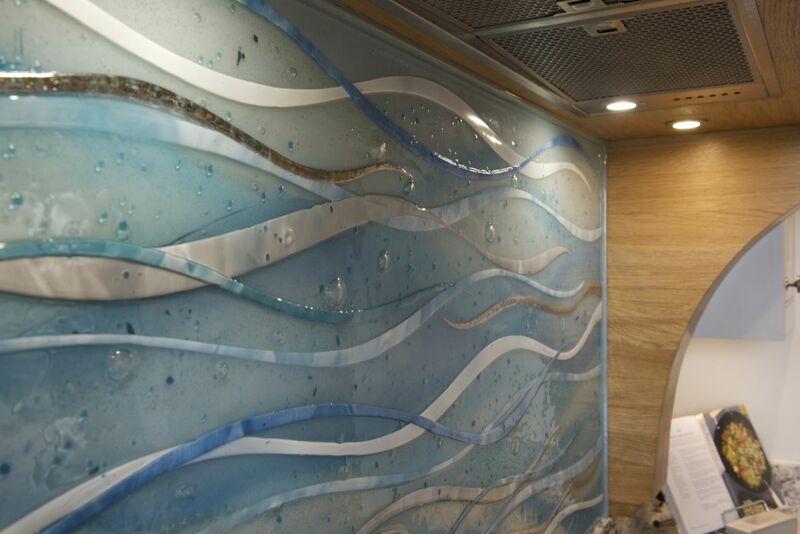 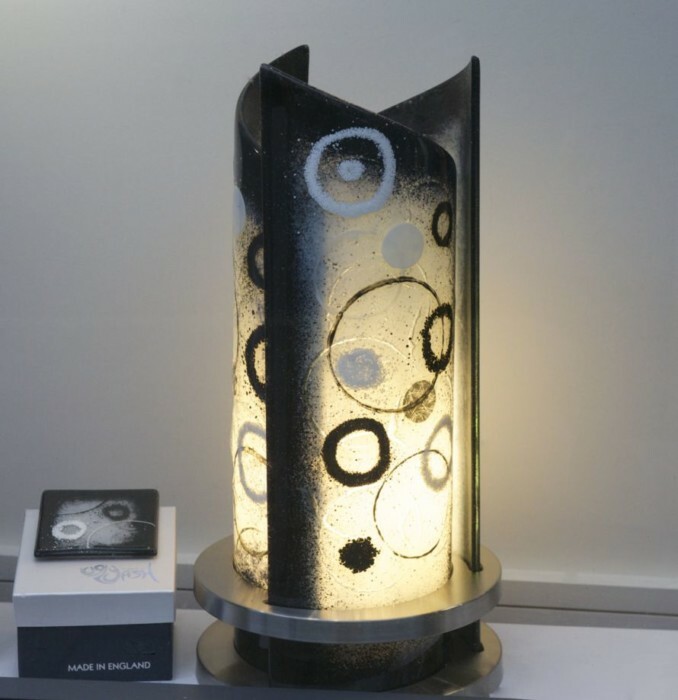 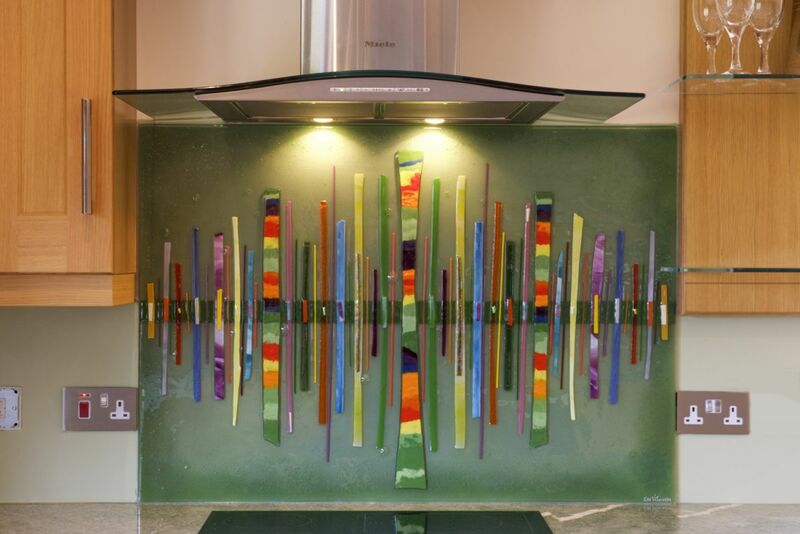 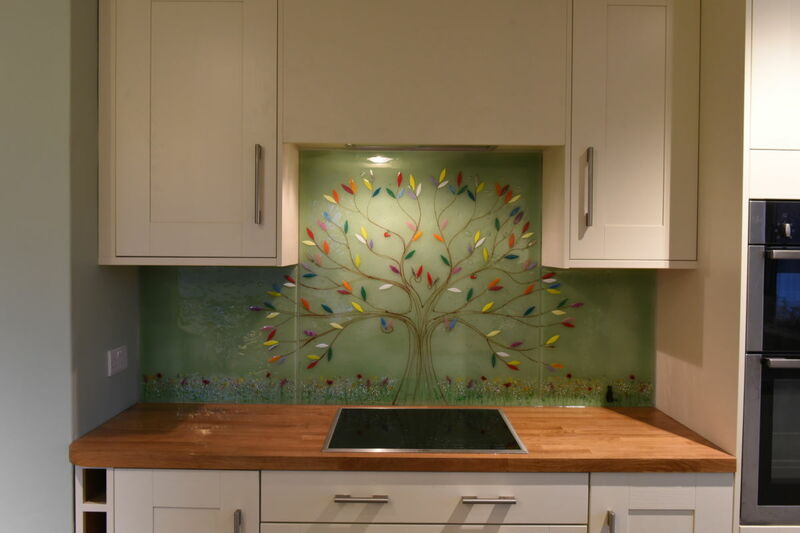 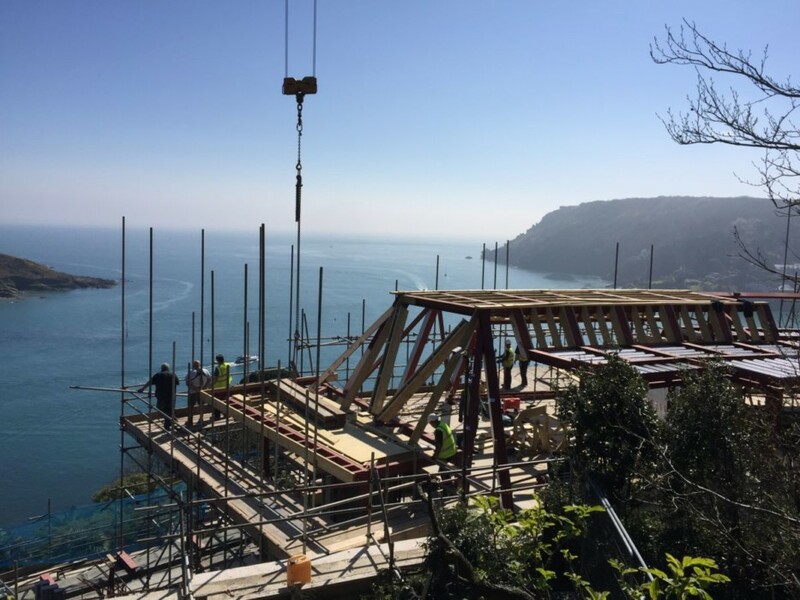 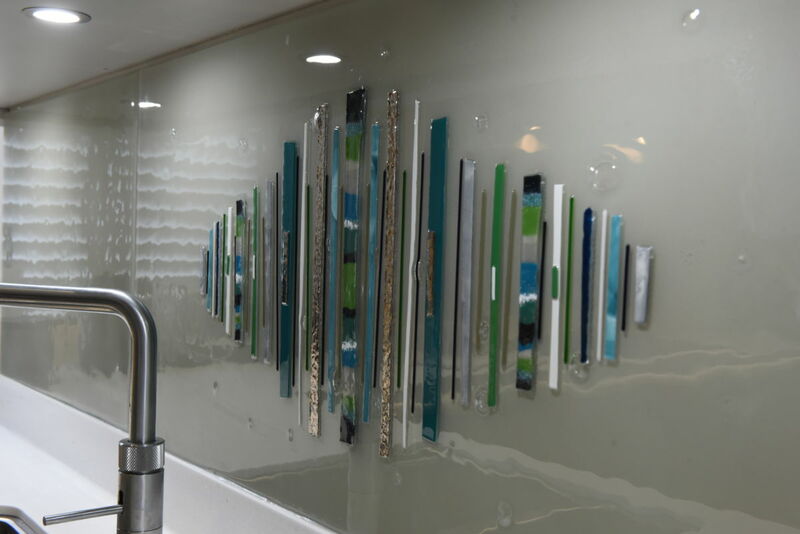 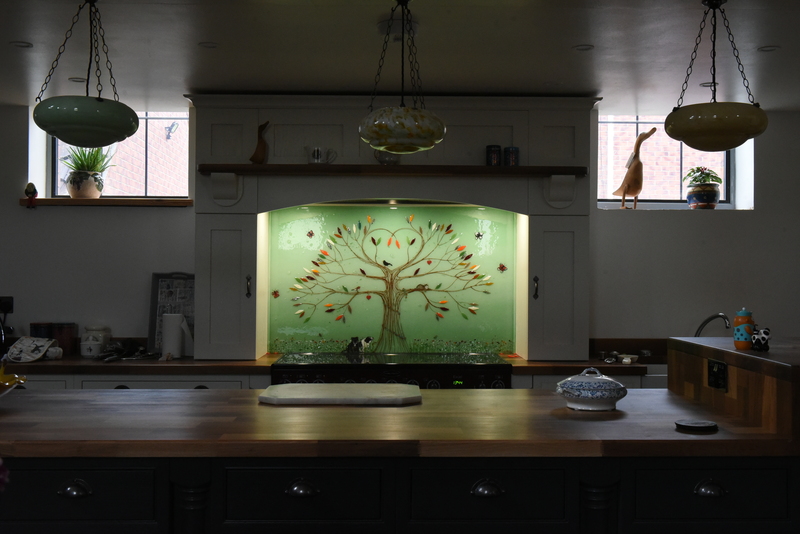 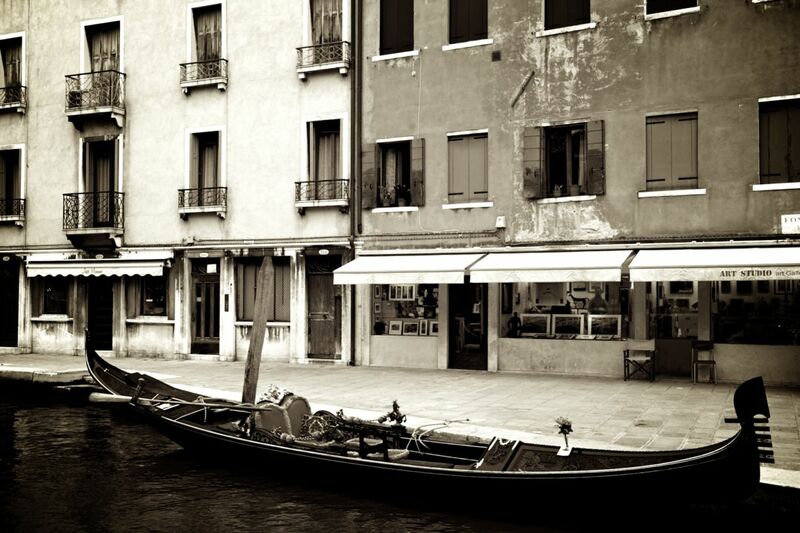 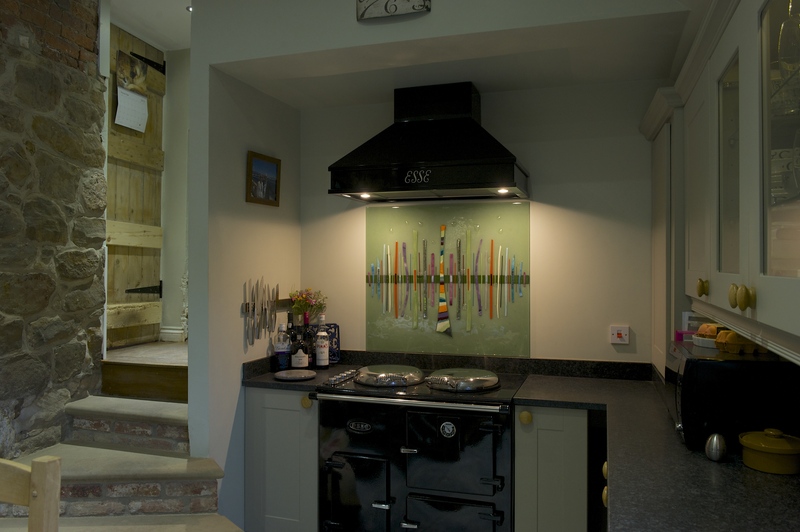 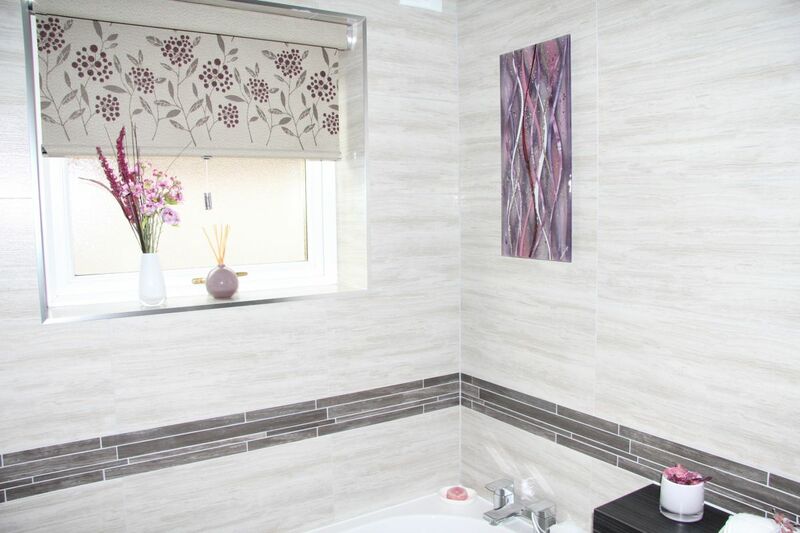 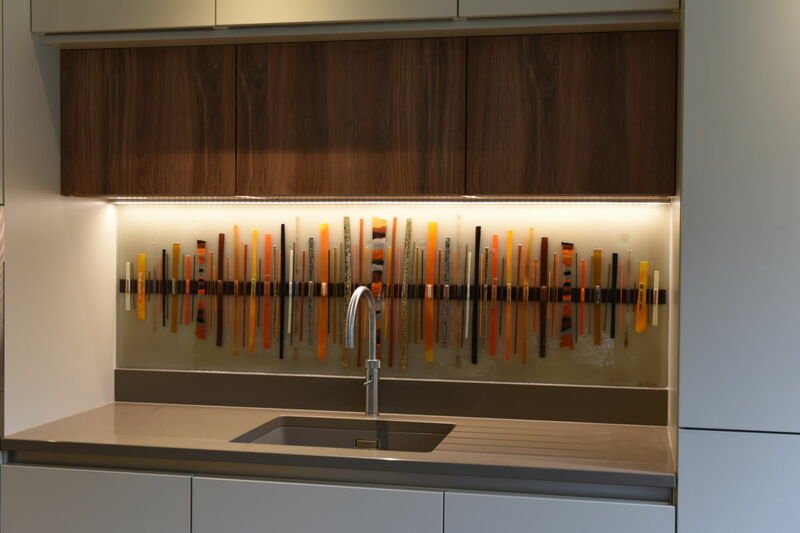 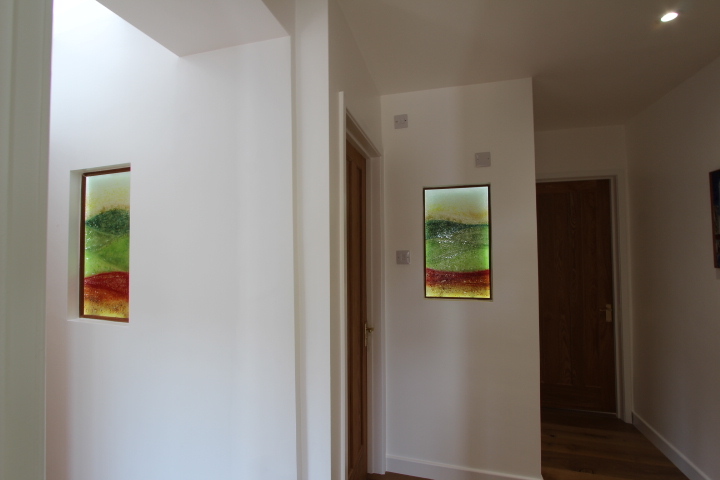 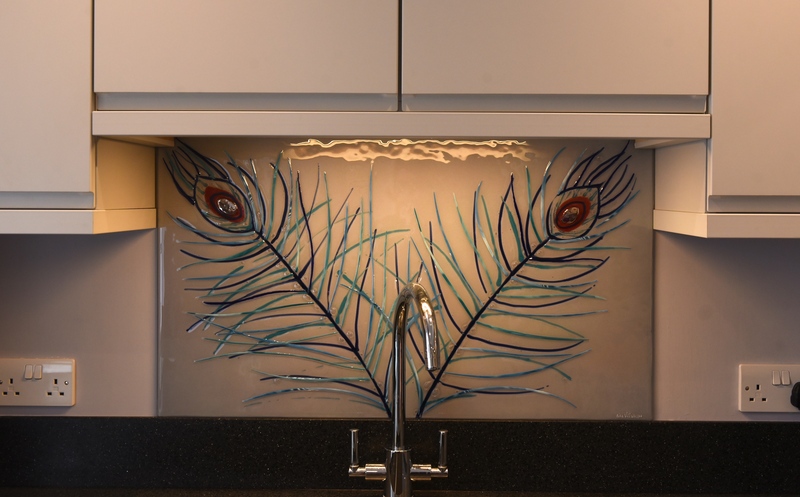 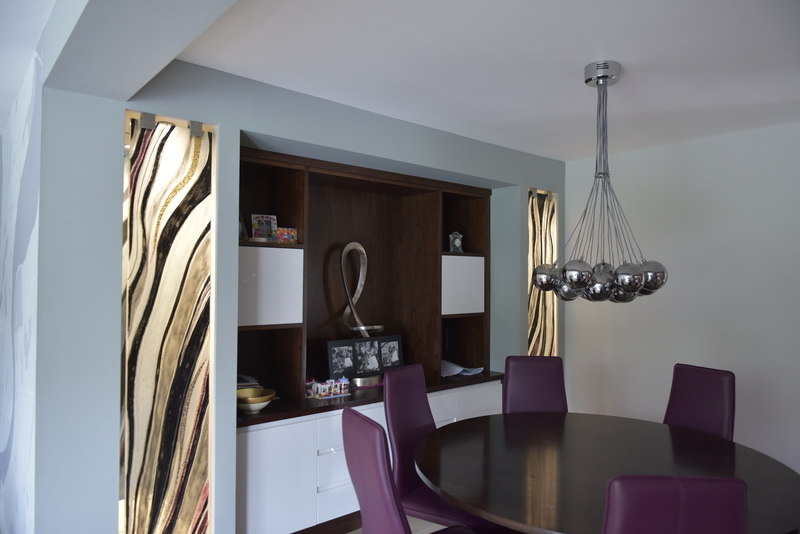 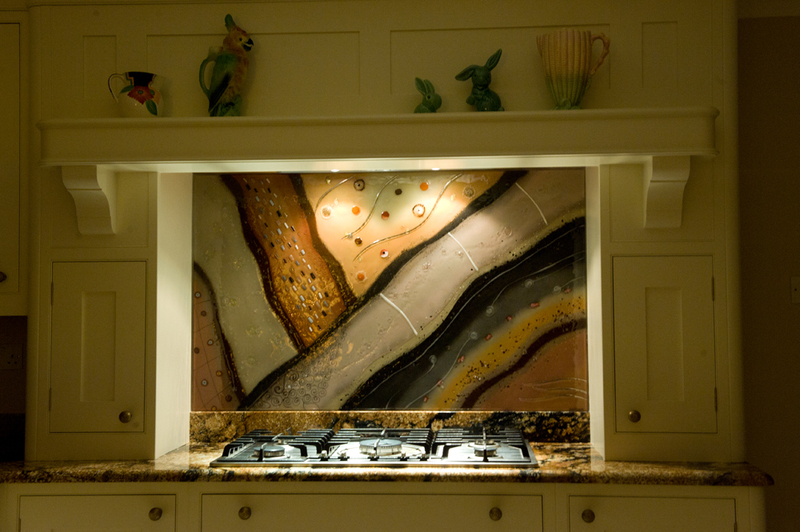 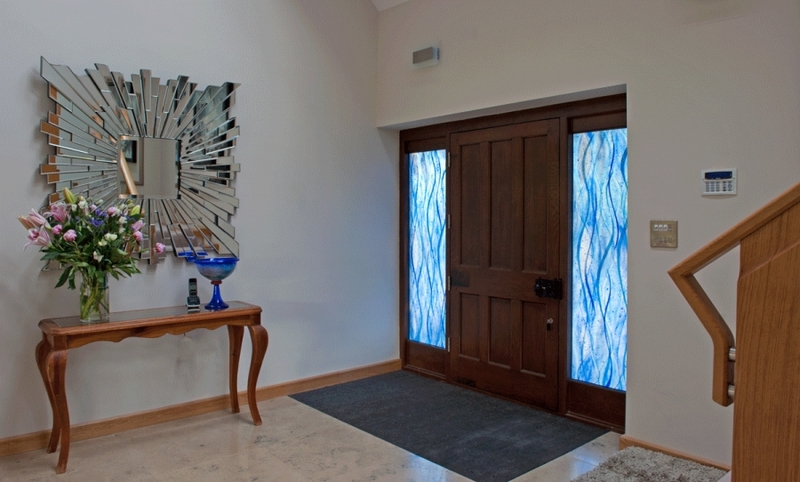 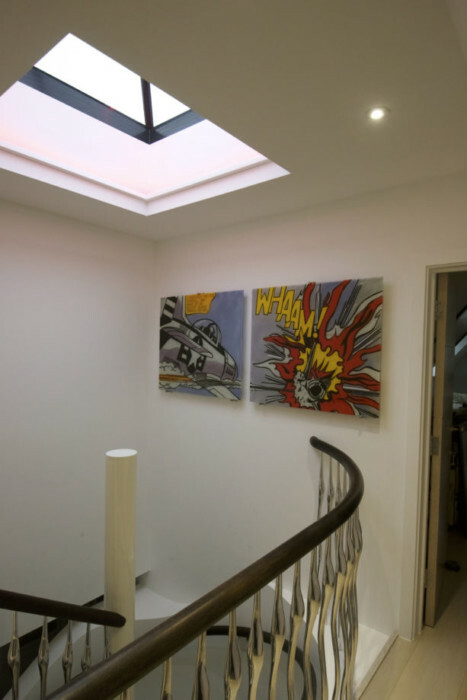 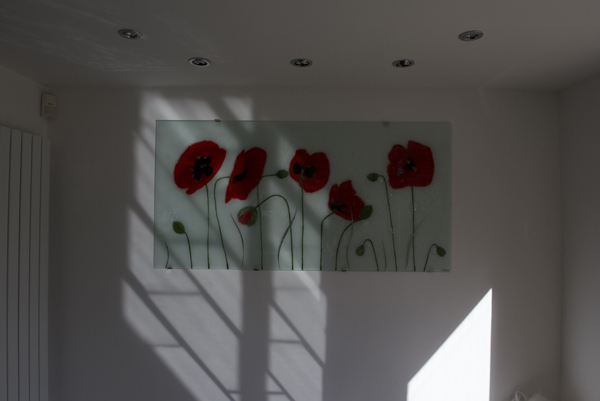 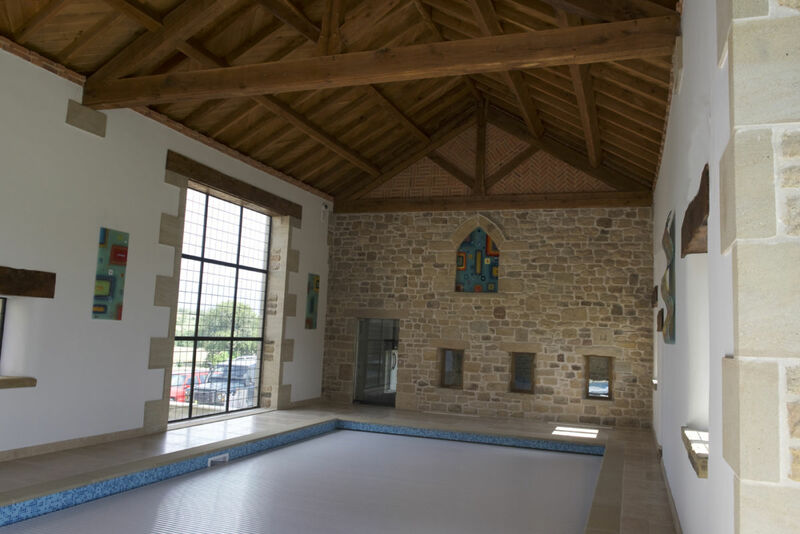 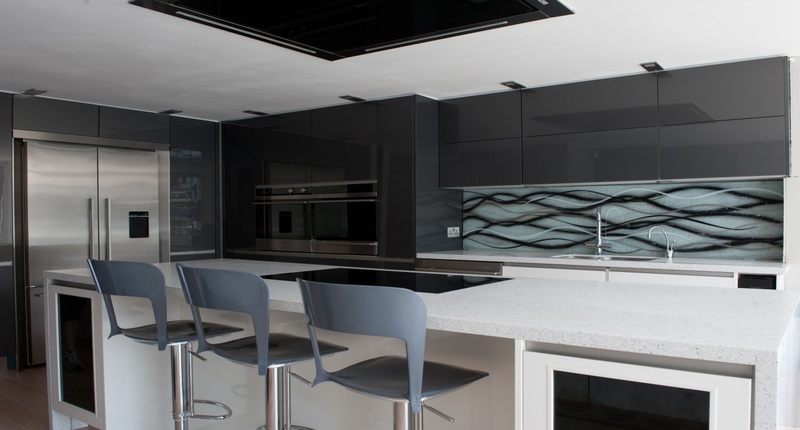 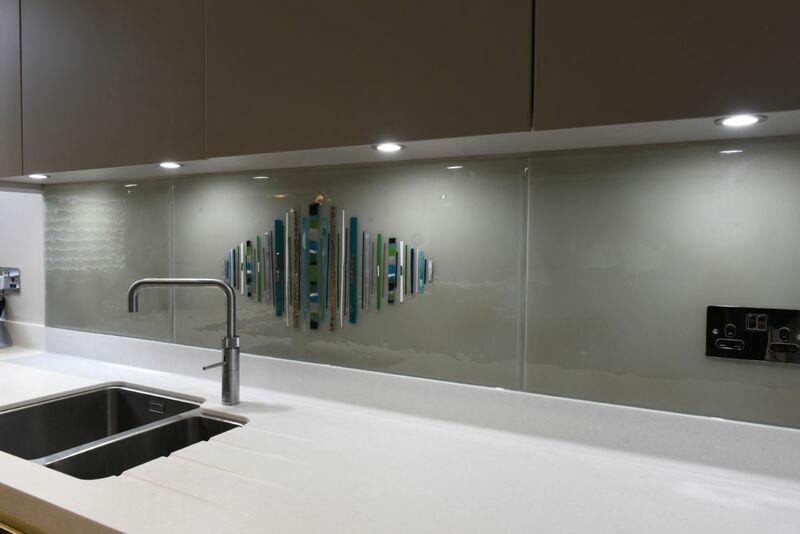 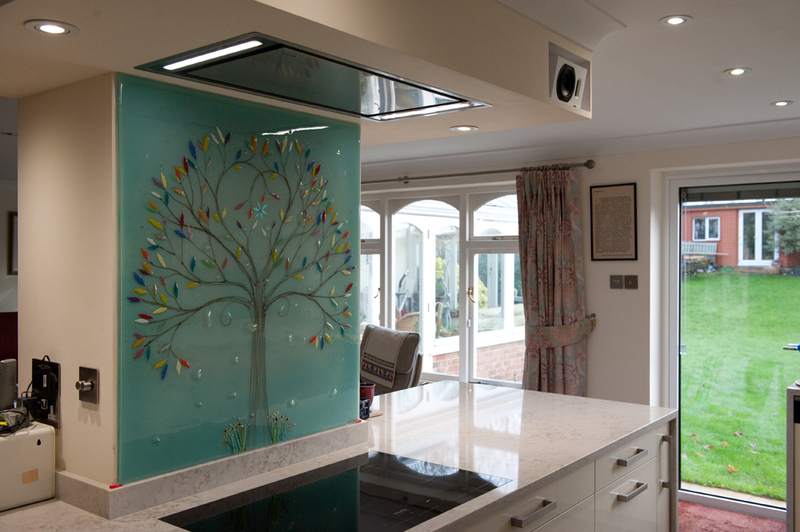 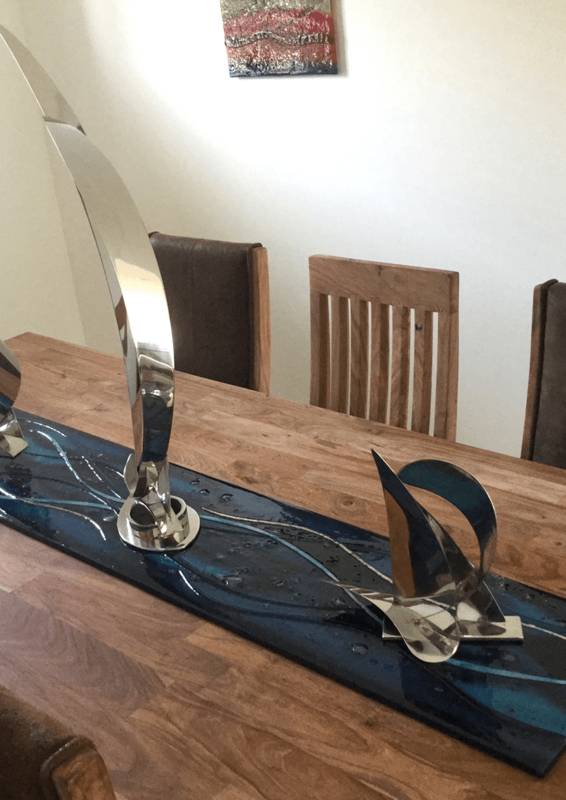 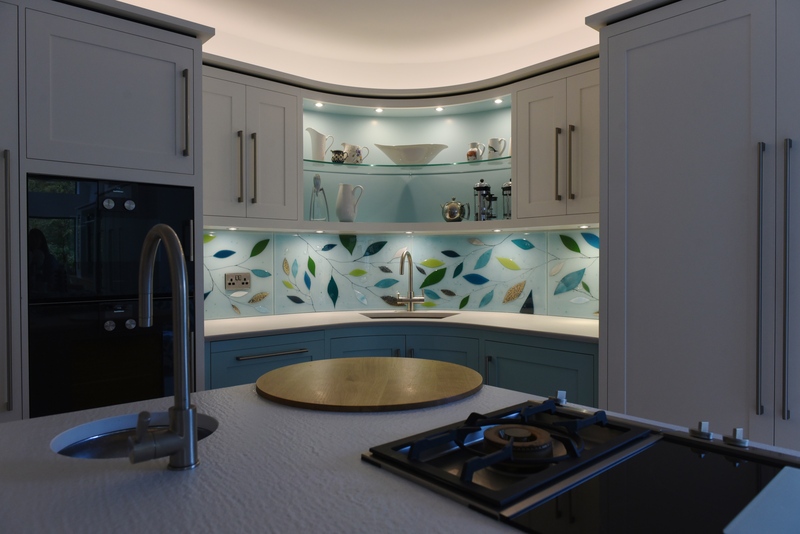 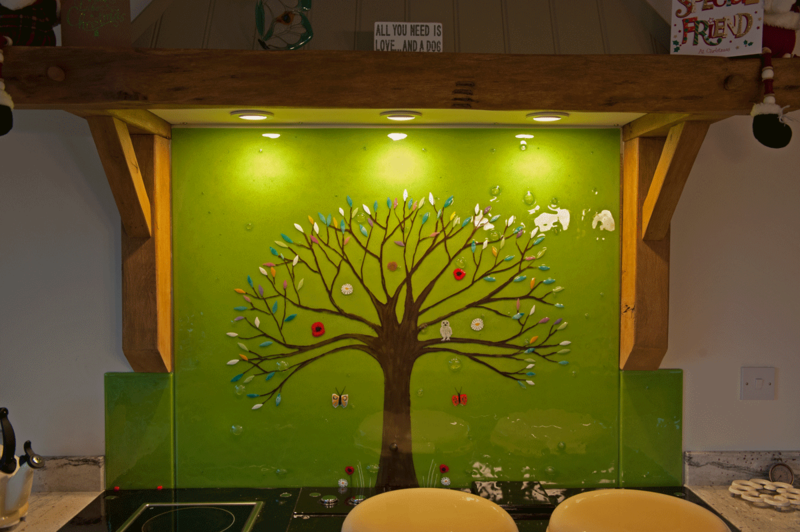 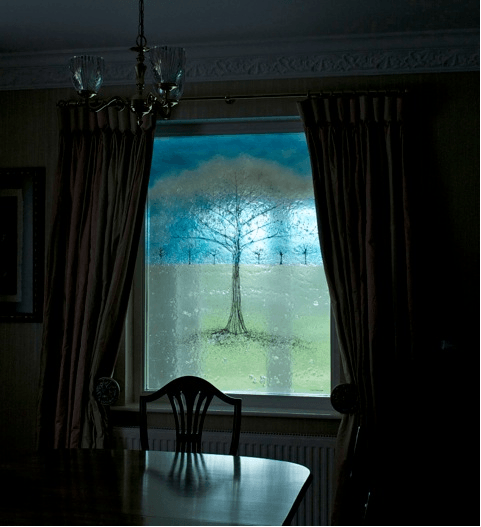 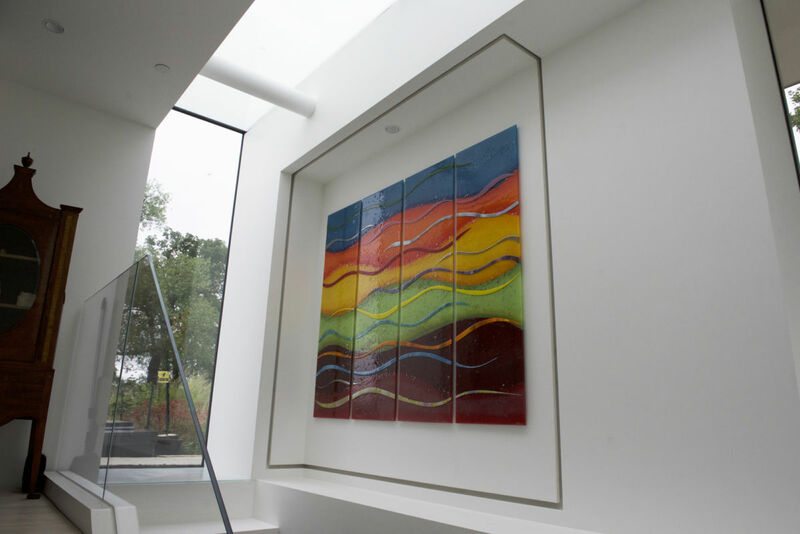 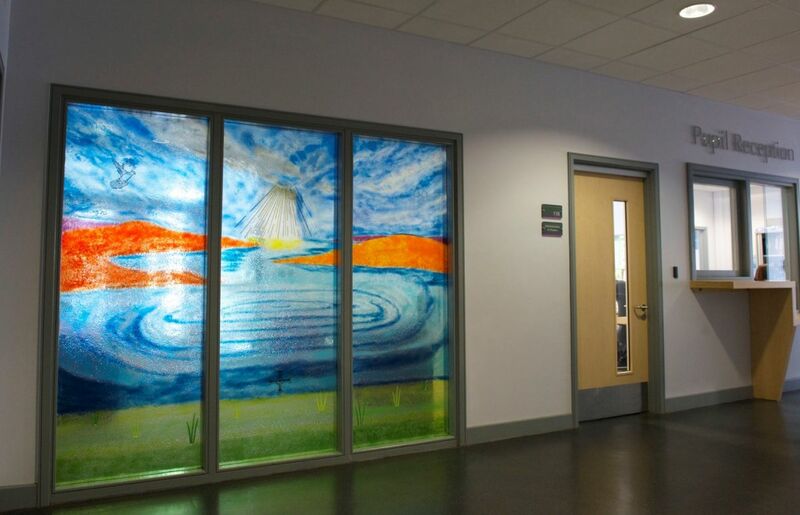 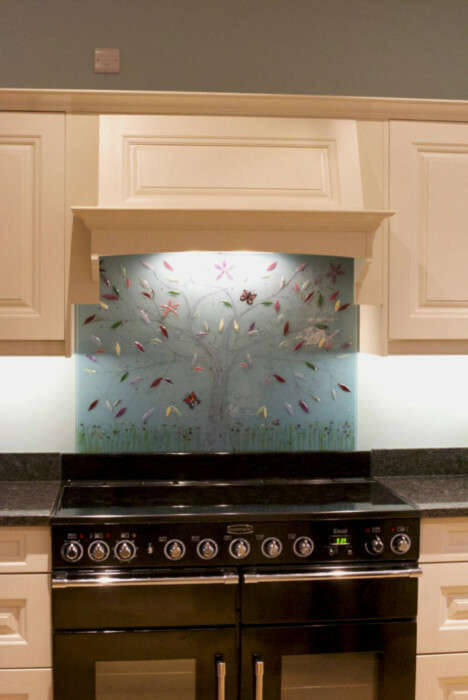 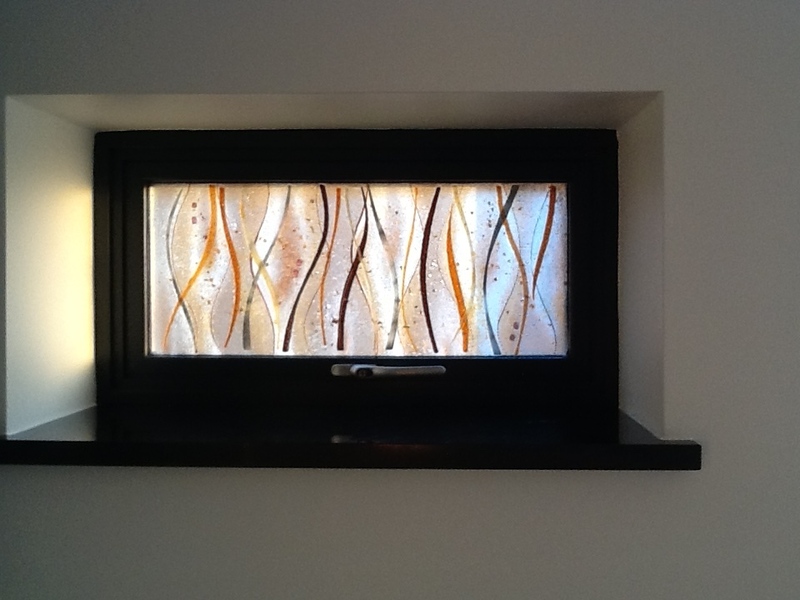 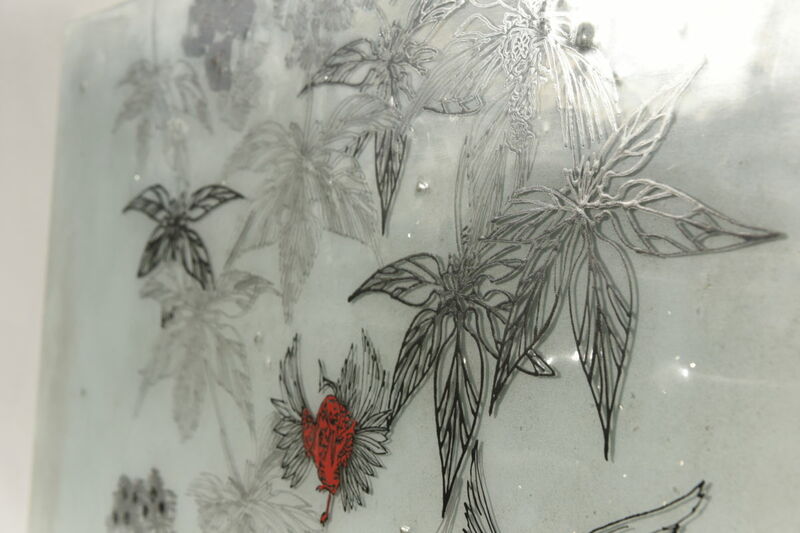 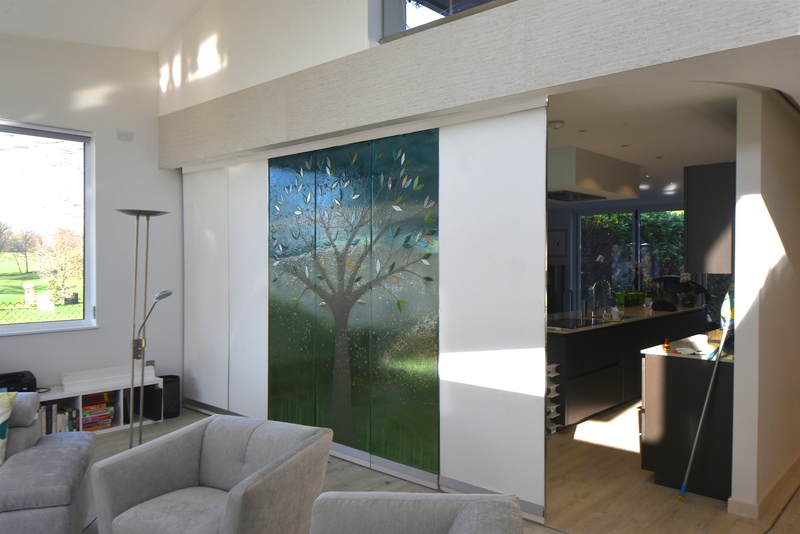 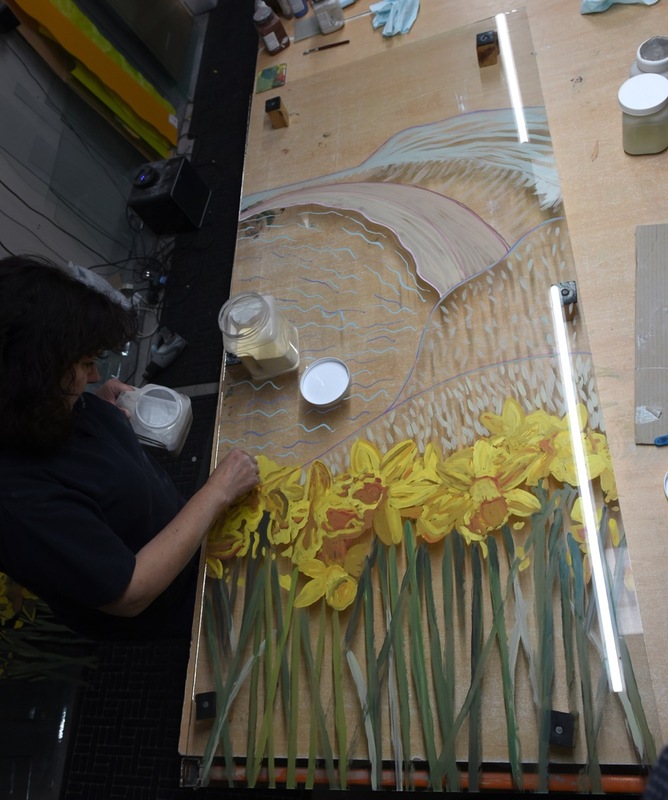 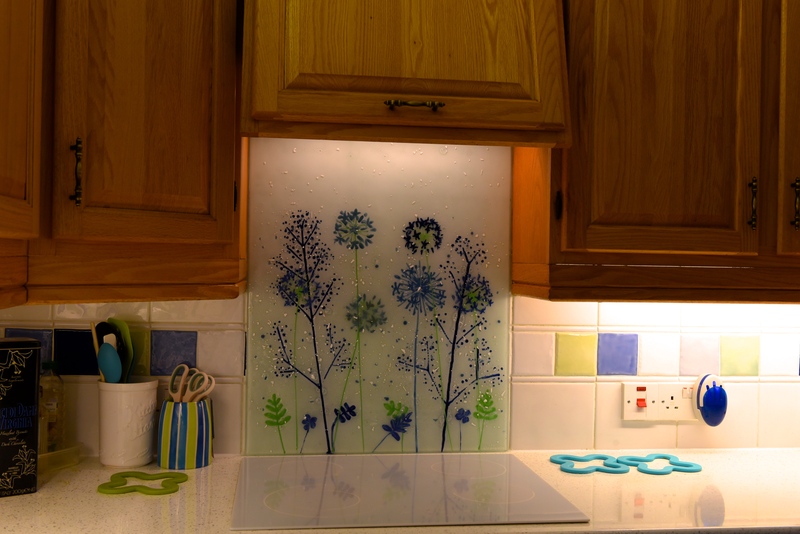 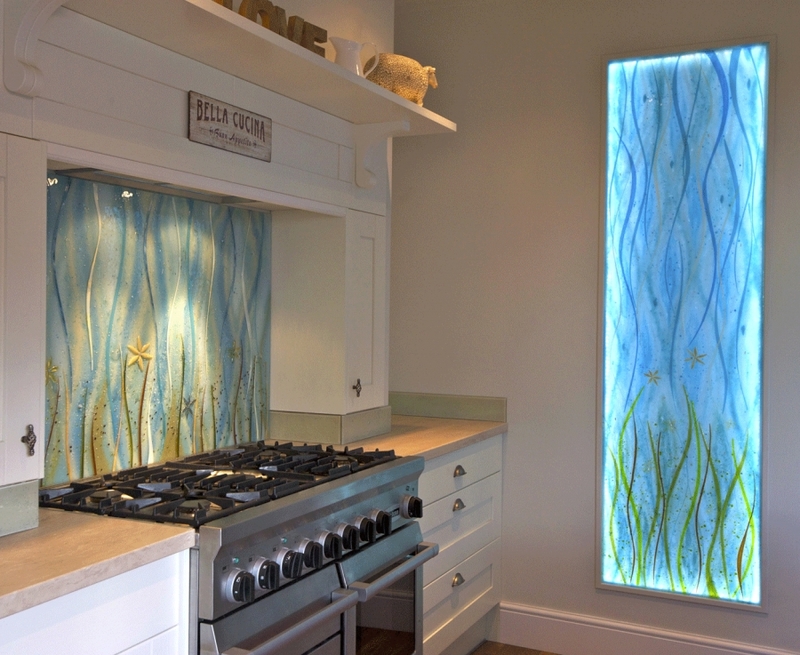 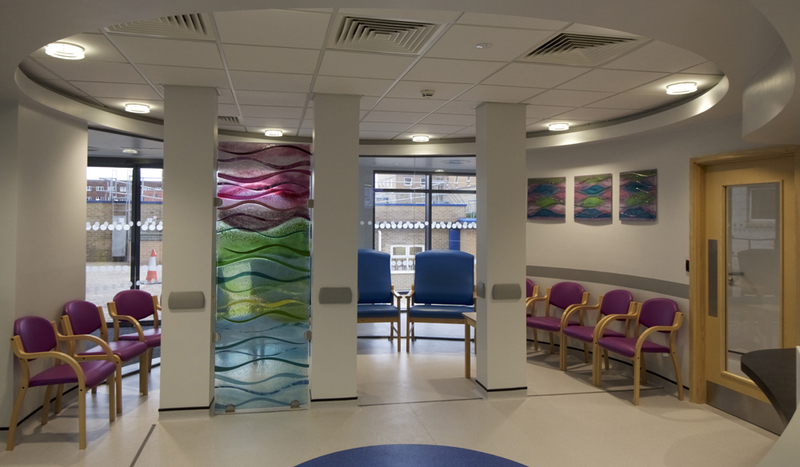 We’ll then be able to discuss your ideas for the ideal piece of glass, and we’ll answer any questions you might have about how our beautifully bespoke design process could work for you. 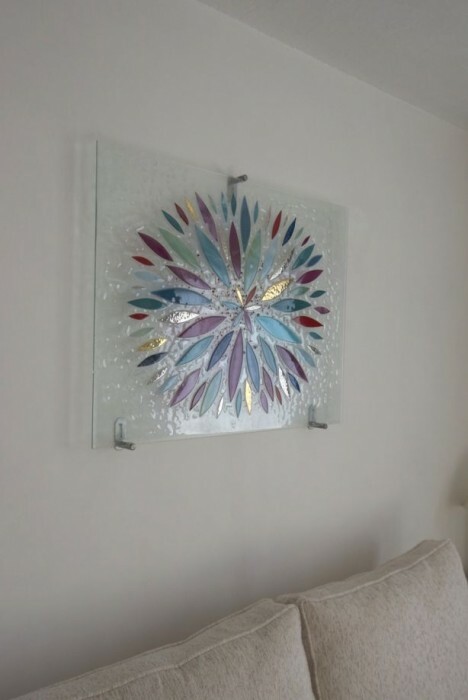 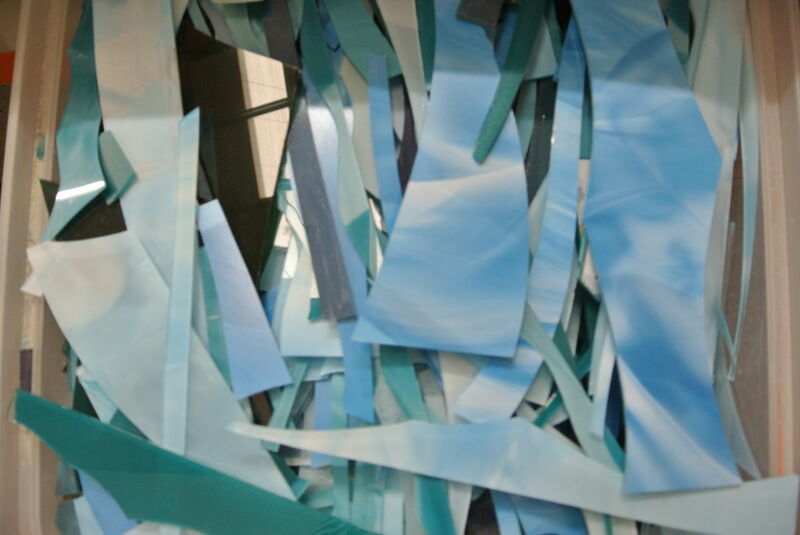 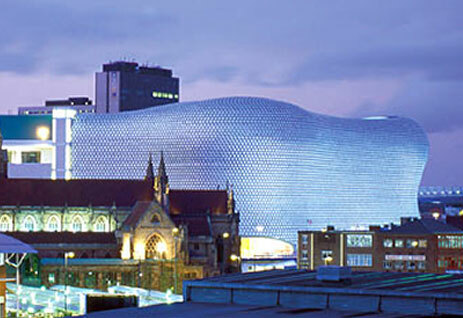 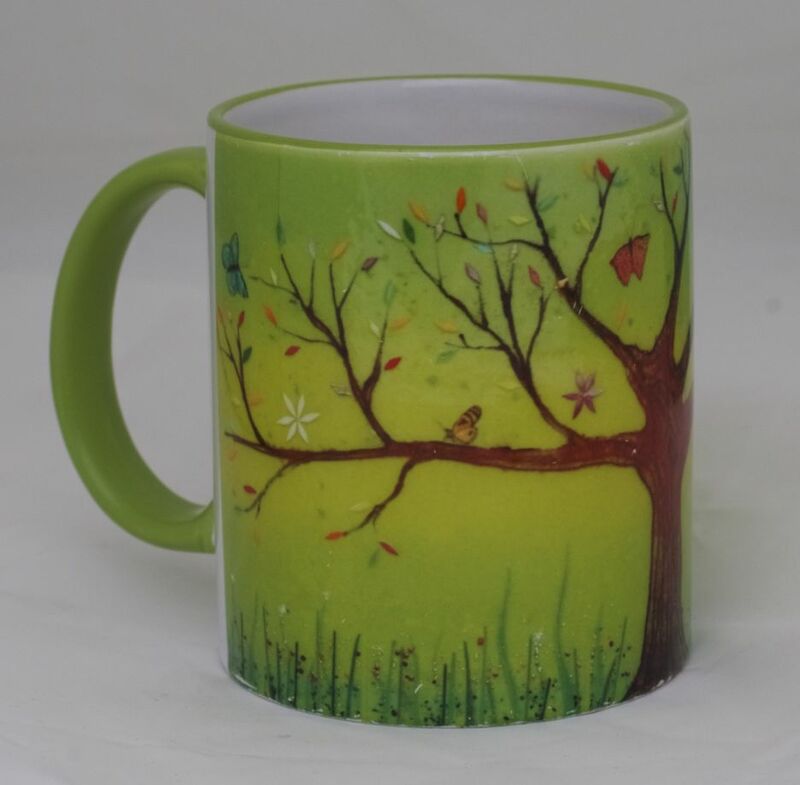 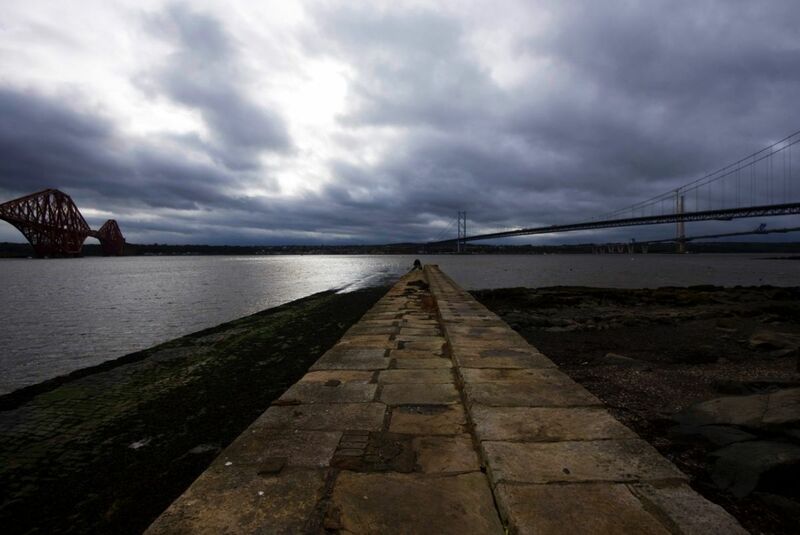 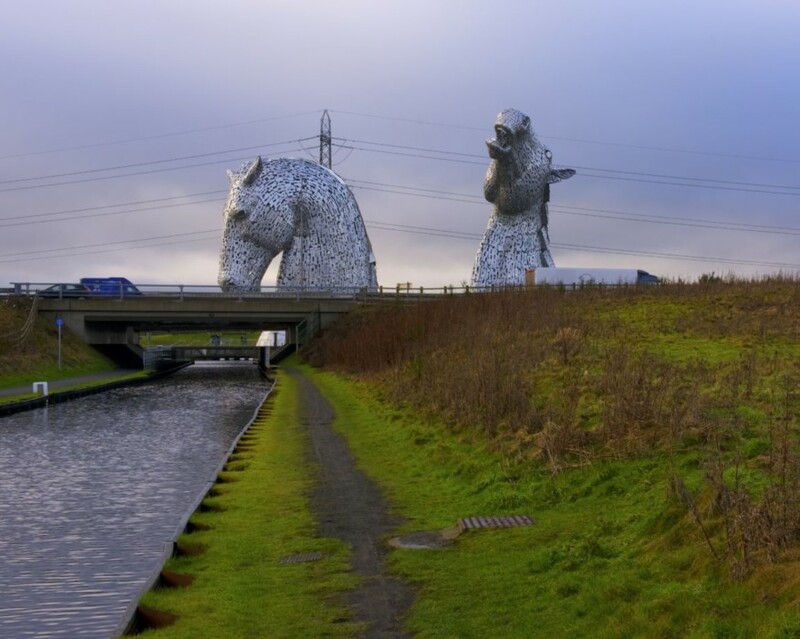 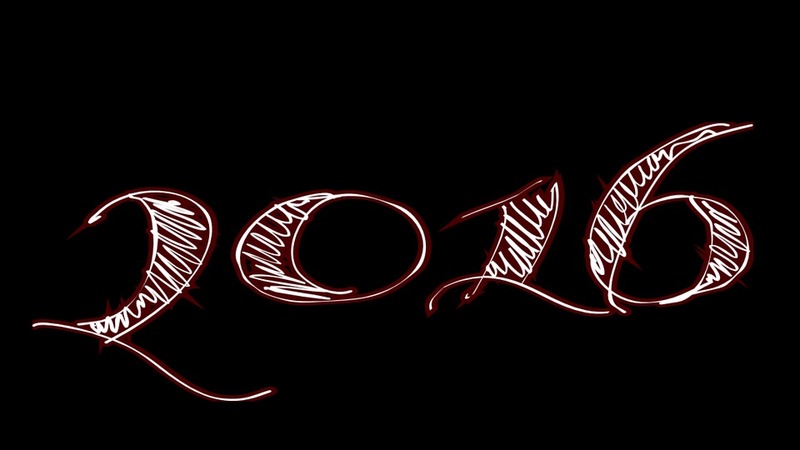 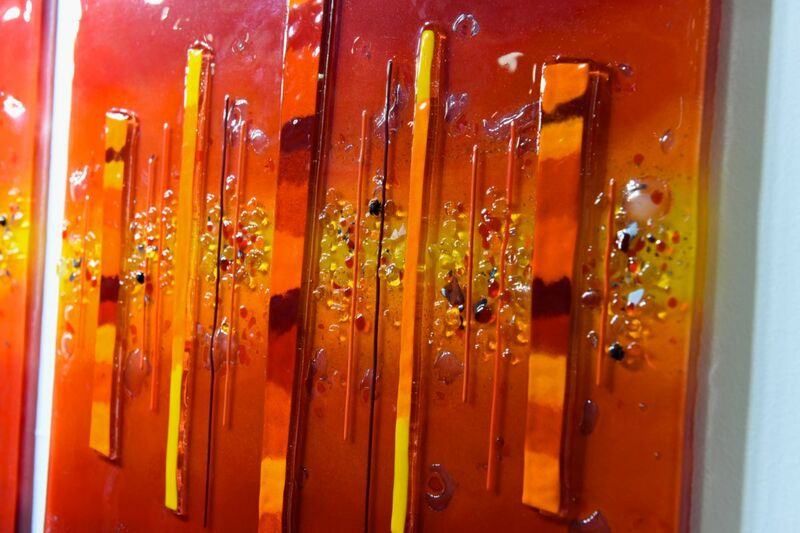 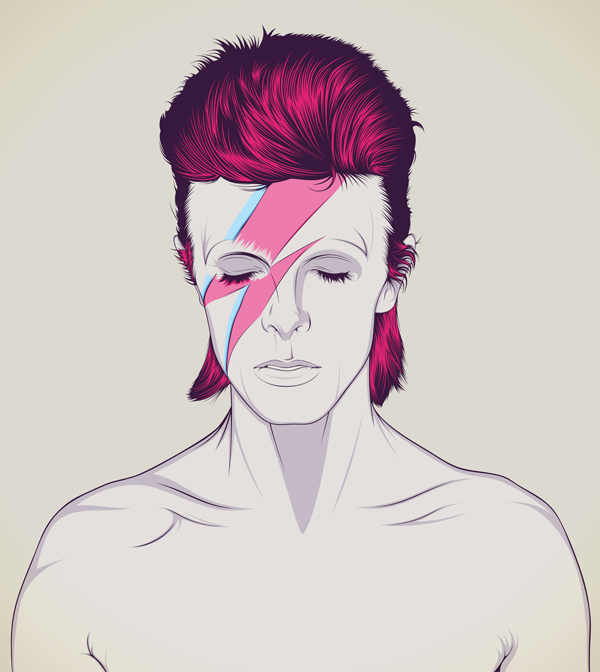 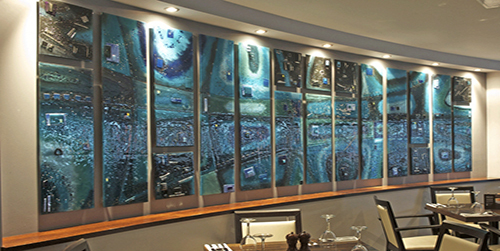 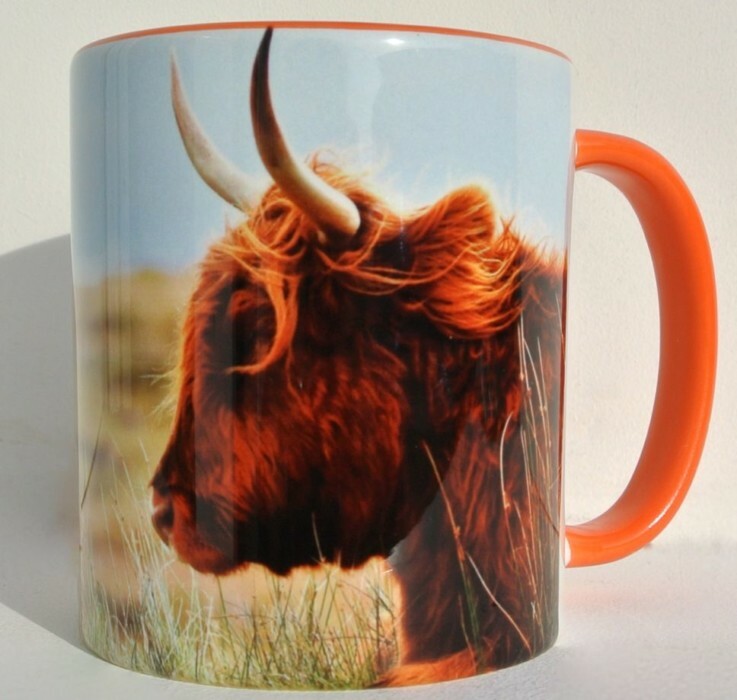 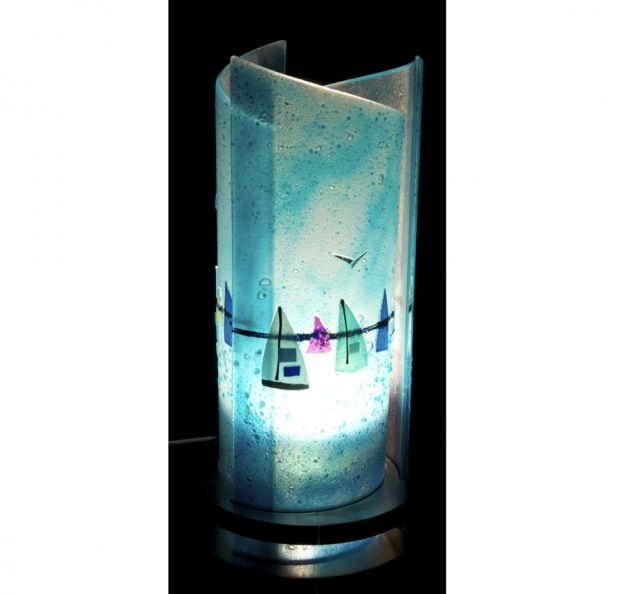 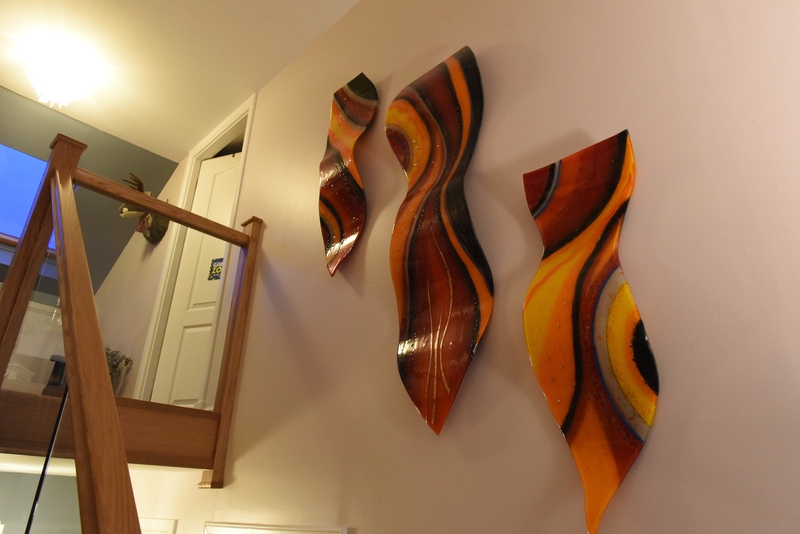 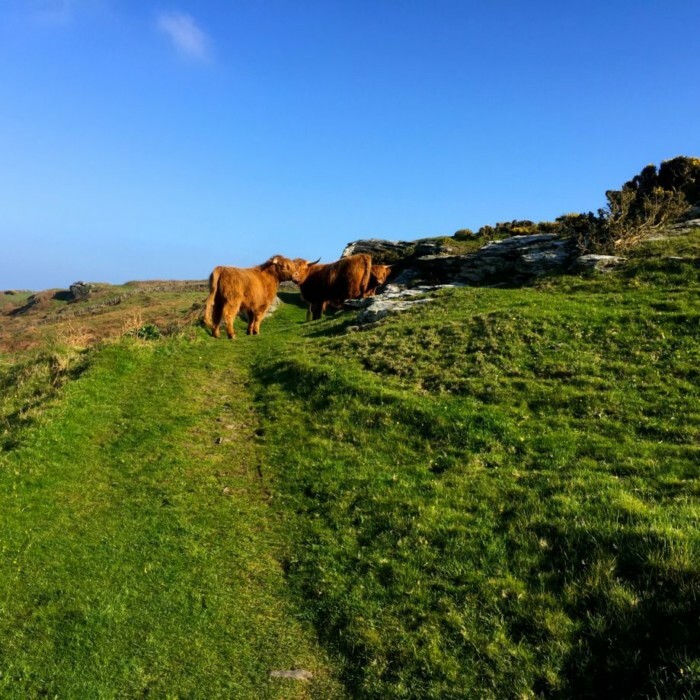 Hopefully the next piece we create is one destined for your own home!